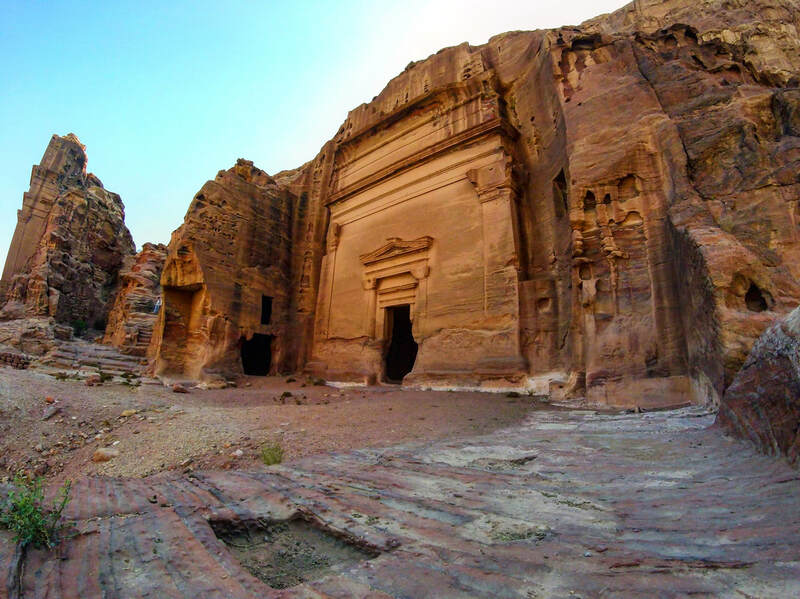 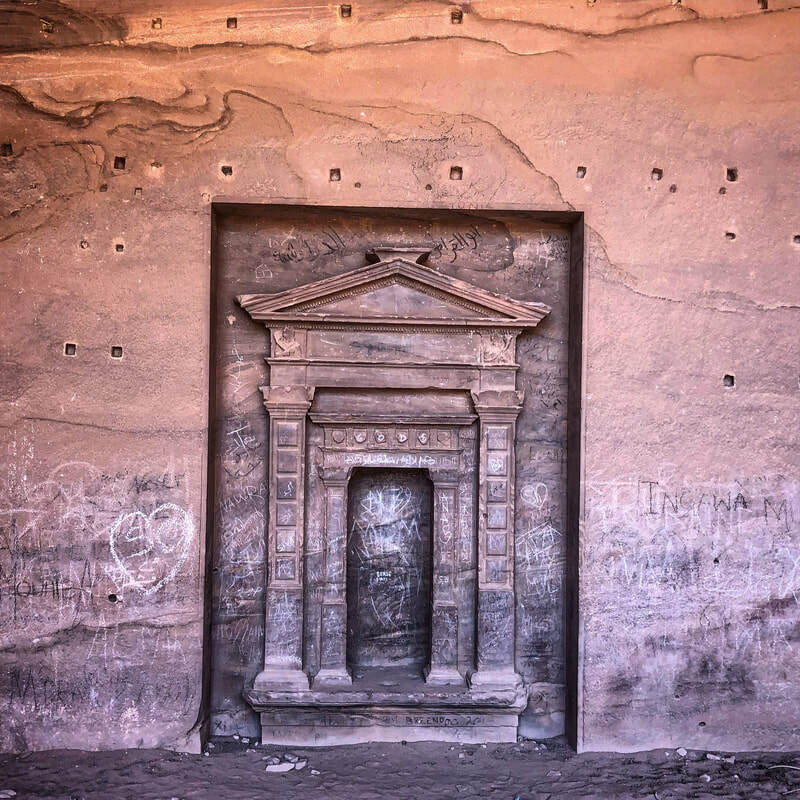 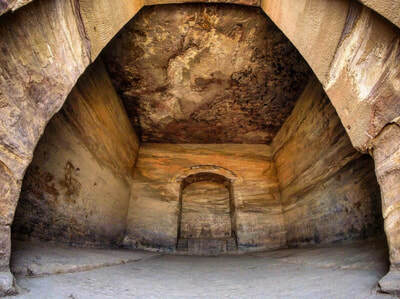 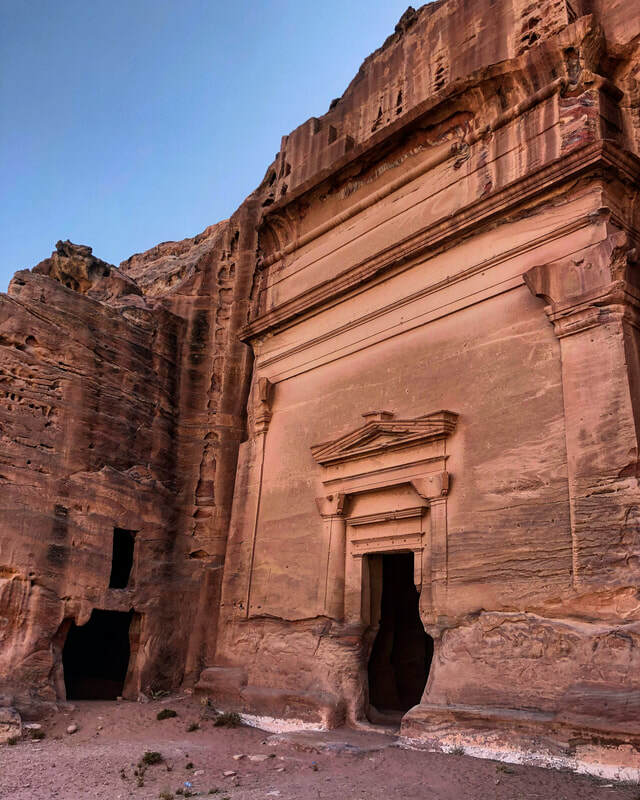 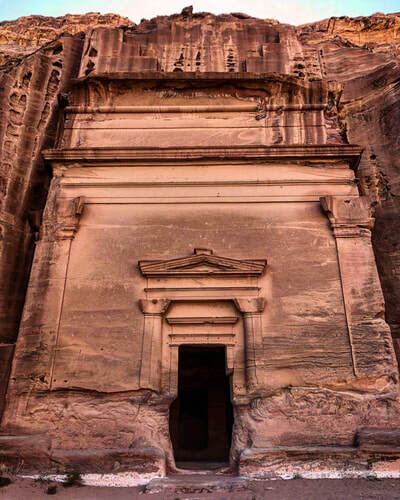 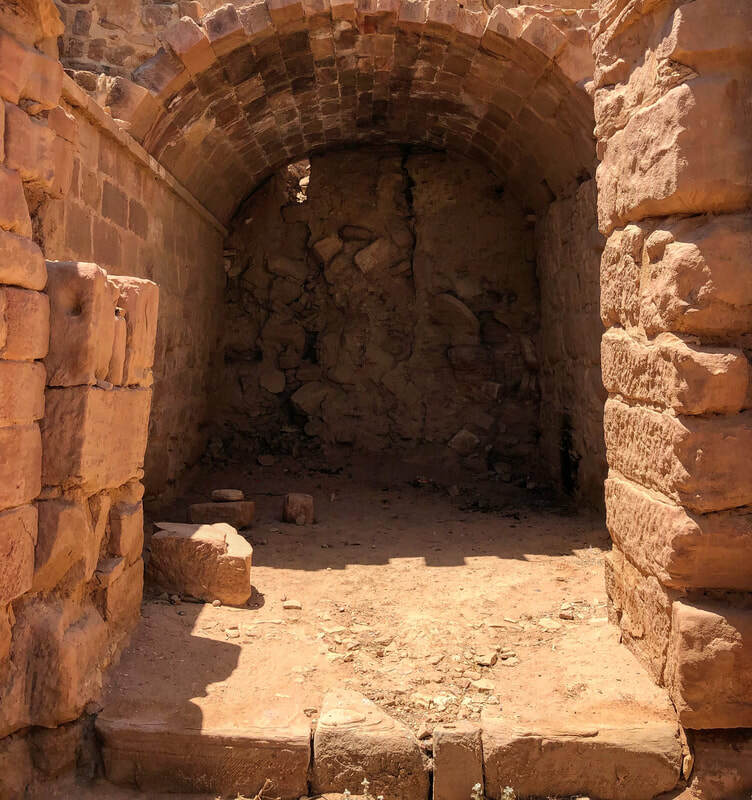 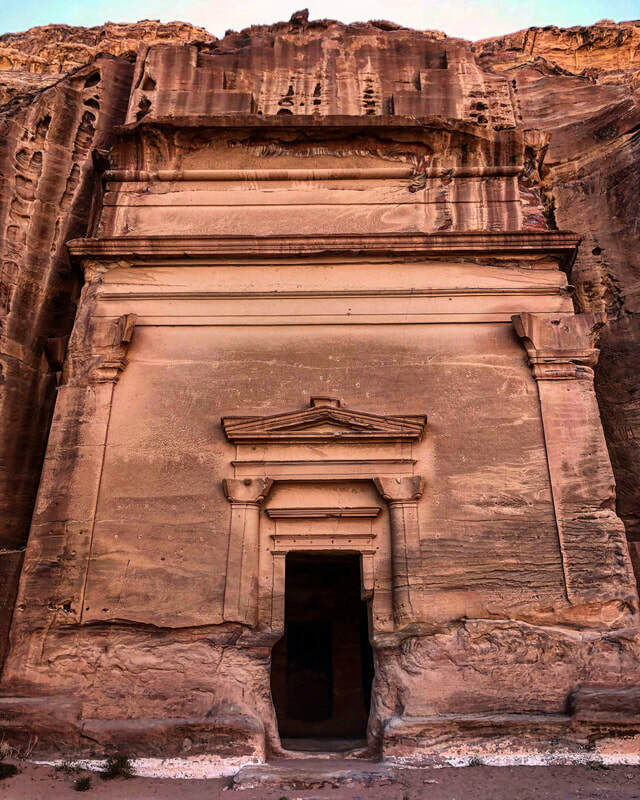 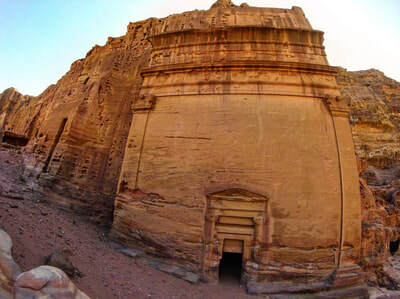 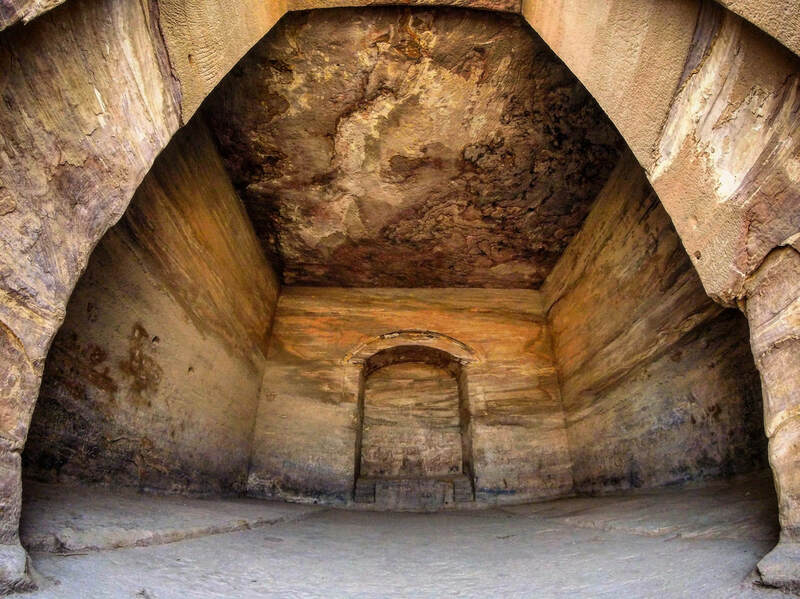 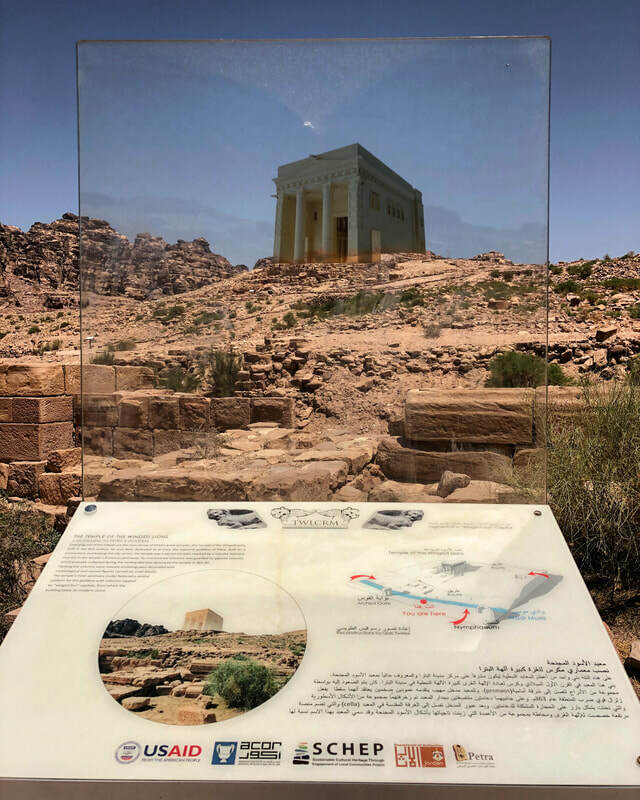 Most of us have seen pictures of what is commonly referred to as, "The Treasury" (Al-Khazneh) or have seen it in movies, such as Indiana Jones and the Last Crusade or Transformers. 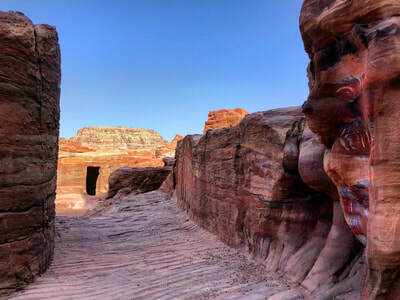 Few people, myself included, knew where this was located or even if it was real. 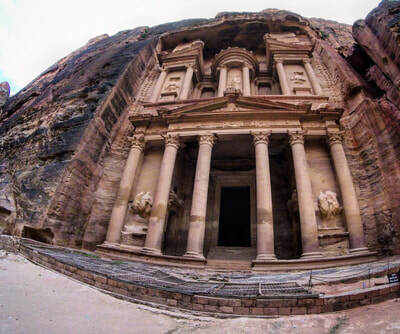 The Treasury is located in the city of Petra (meaning "stone/rock" in Greek) and probably its most well-known destination, but not the only thing to see there. 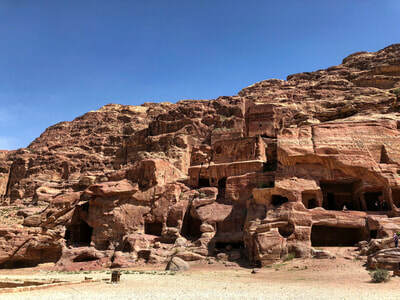 In fact, it is just a small portion of the city. 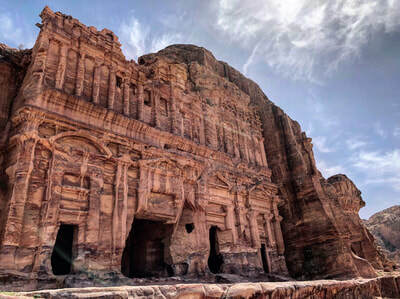 Petra itself covers approximately 23 square miles (60 square kilometers) with hundreds of carved buildings just as impressive, if not more impressive, than The Treasury. 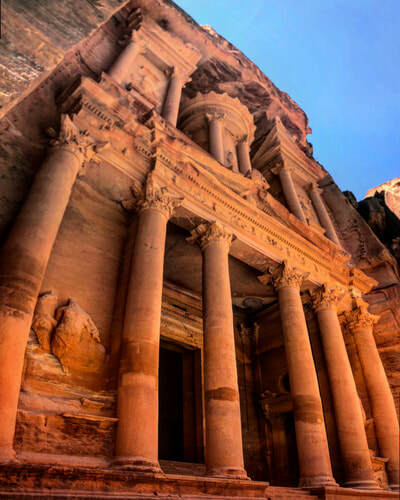 There is some debate as to who built Petra and how long ago it was established. 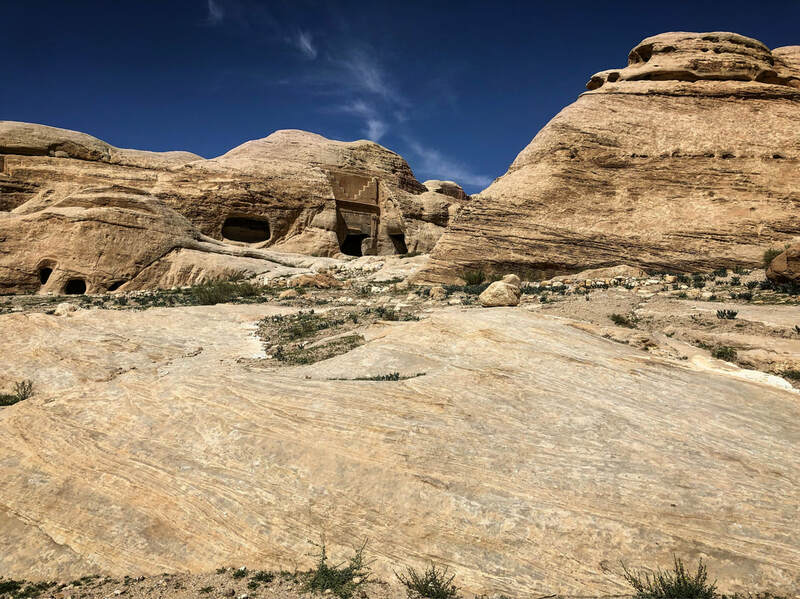 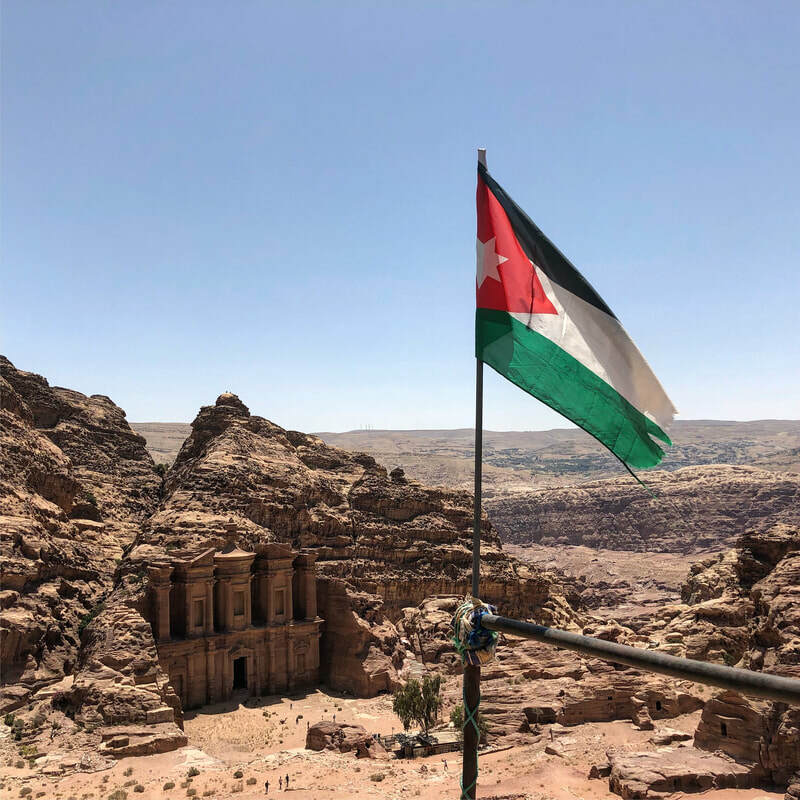 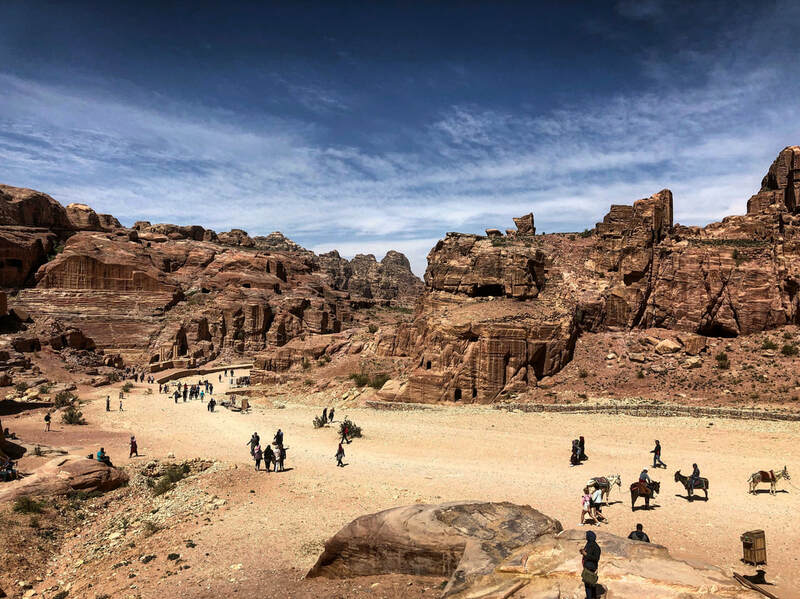 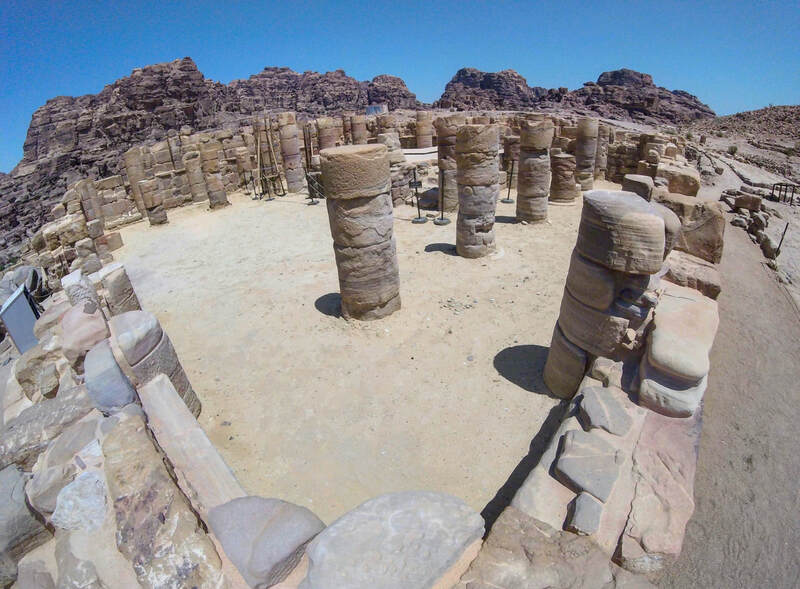 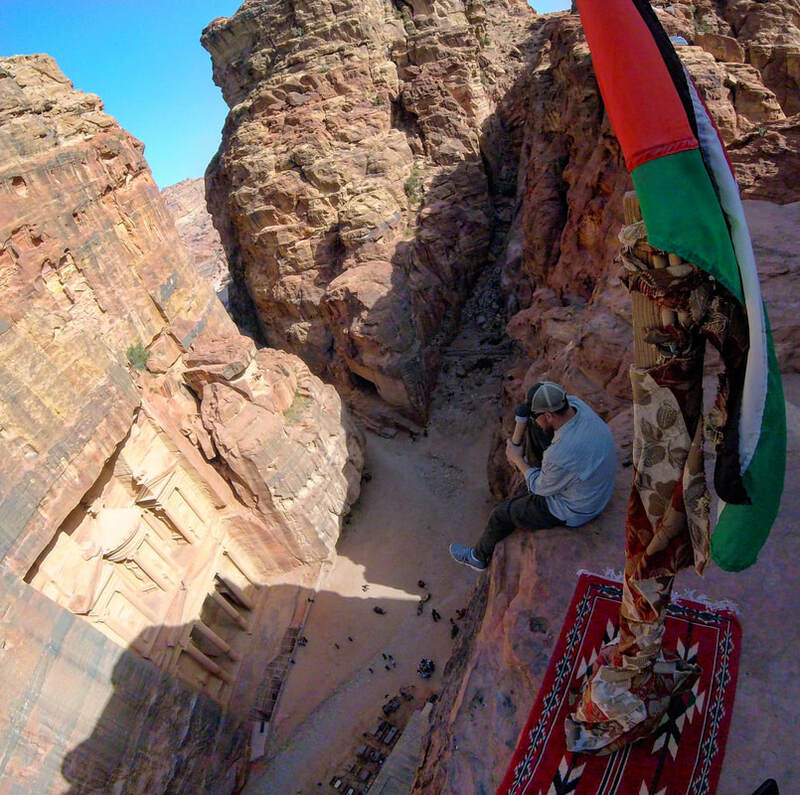 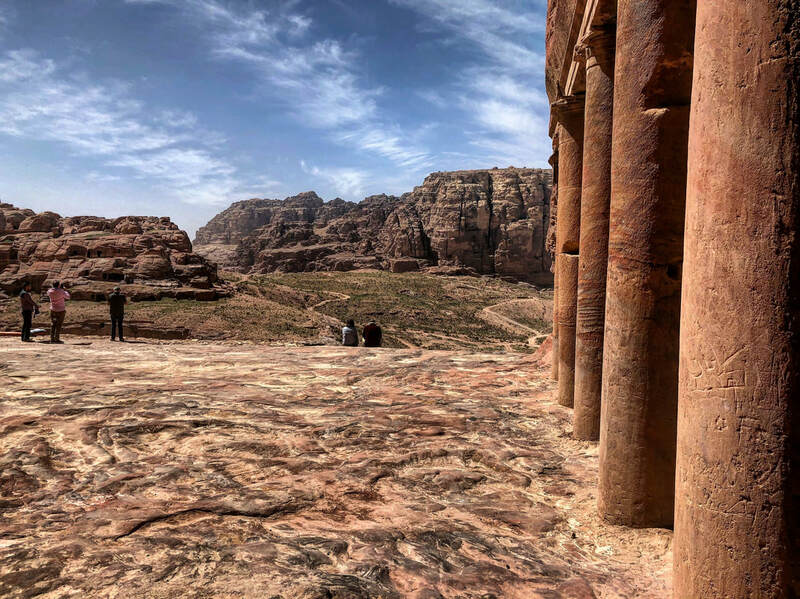 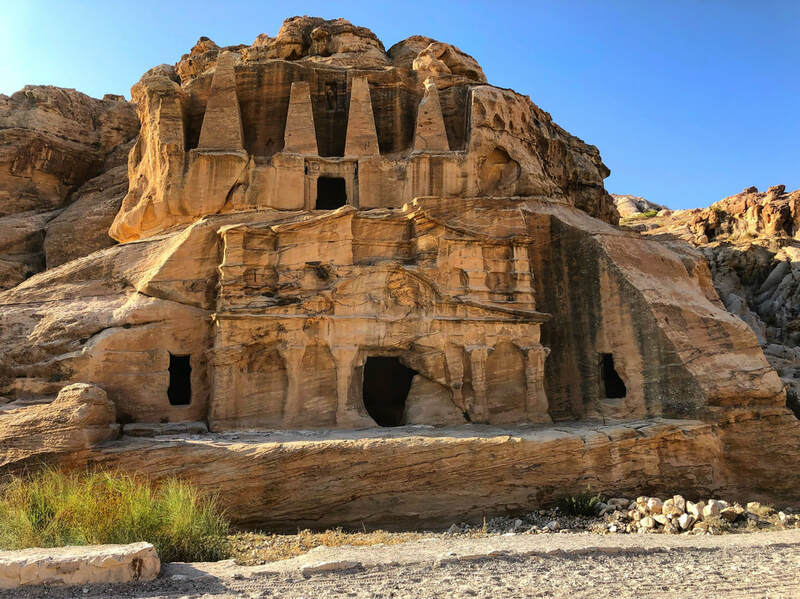 Depending on the sources, some suggest the Nabataeans (nomadic tent dwellers) constructed this magnificent city a little over 2,200 years ago and some say it is much older and the original builders are not known. 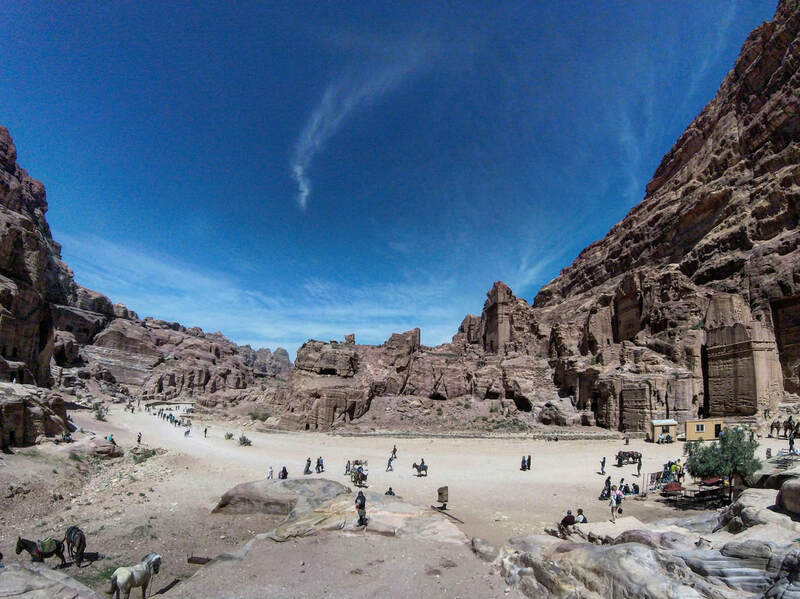 Whatever the truth, one thing is for sure; Petra is breathtaking! 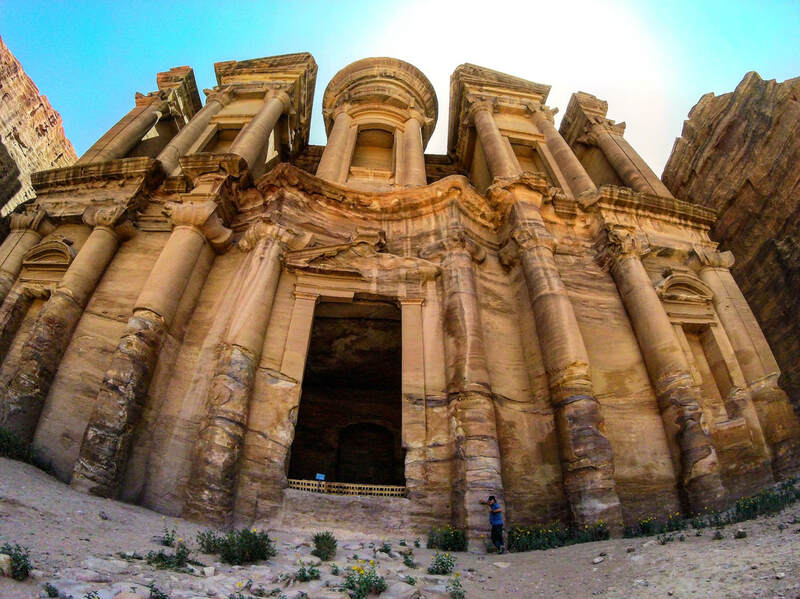 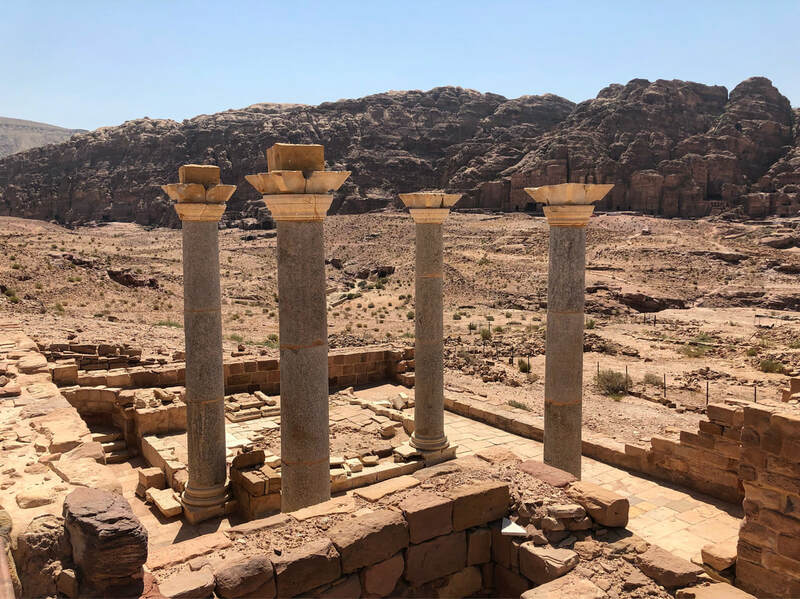 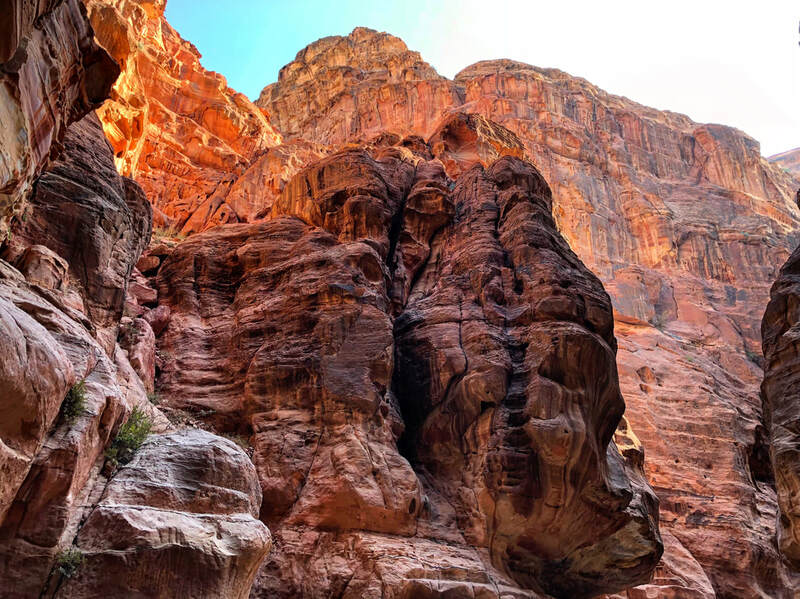 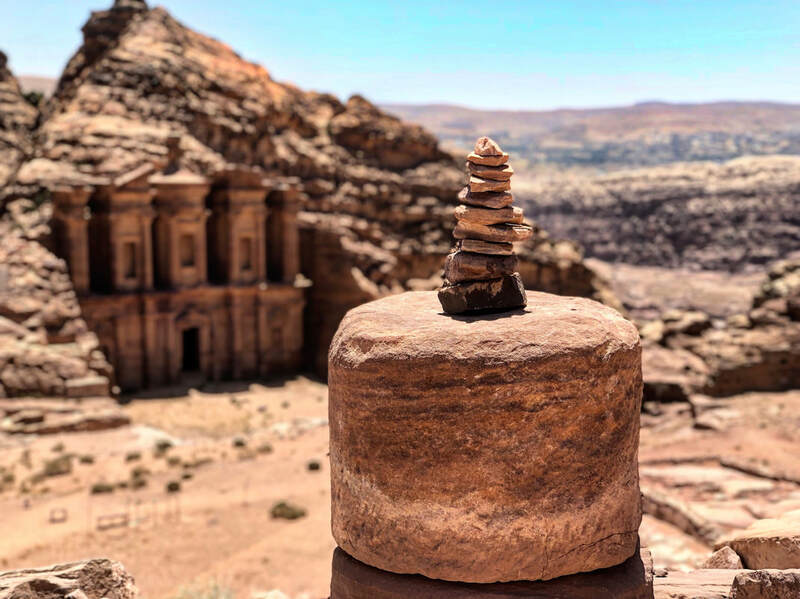 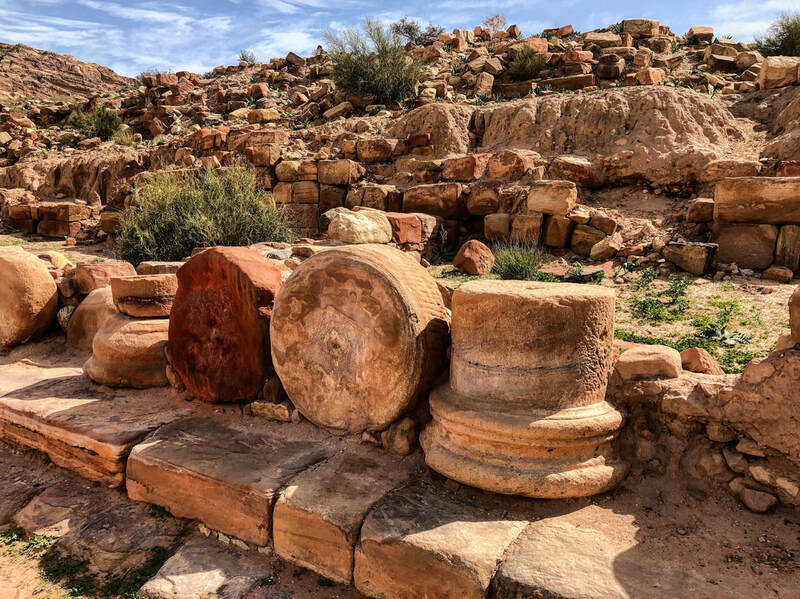 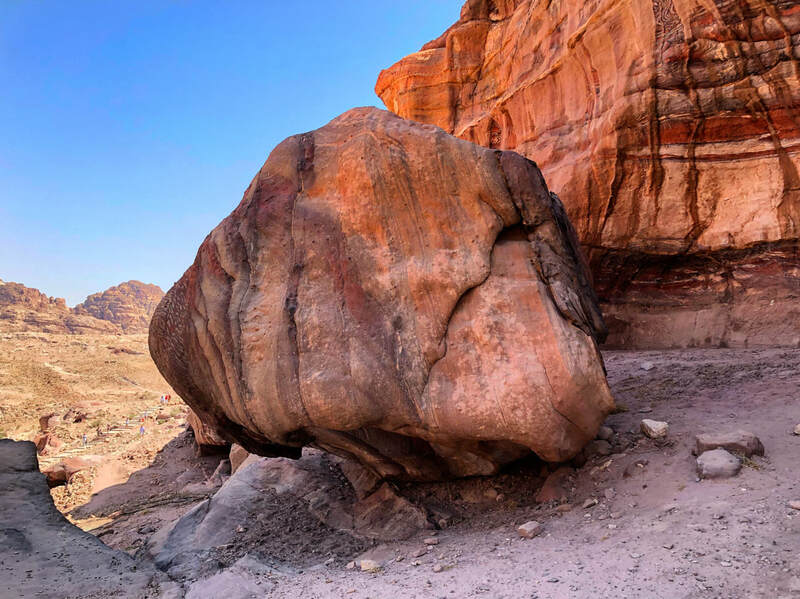 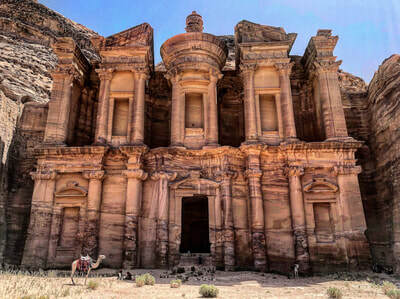 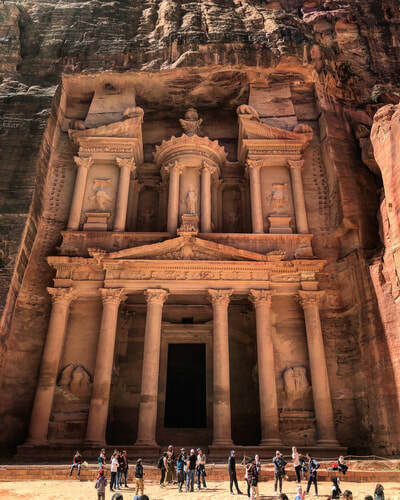 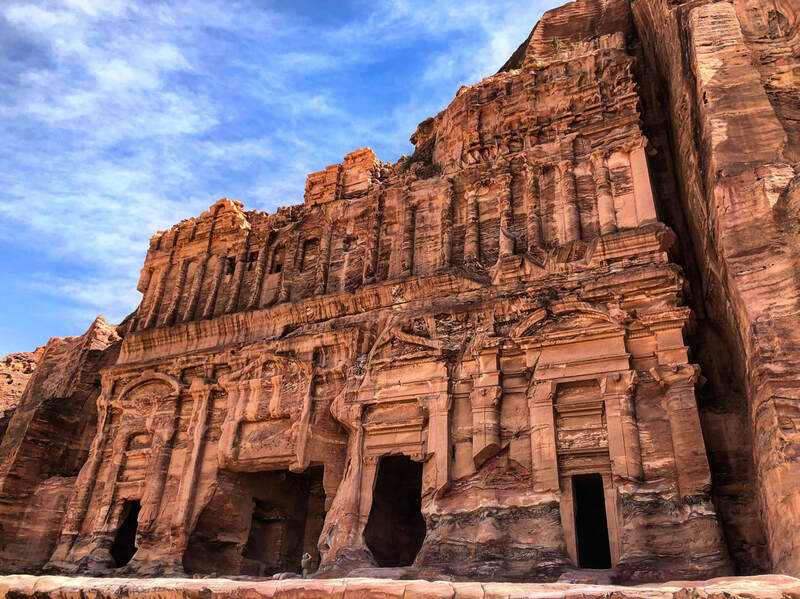 At one point, the city of Petra was lost or forgotten about to most of the outside world until it was rediscovered in 1812 by John Lewis Burckhardt. 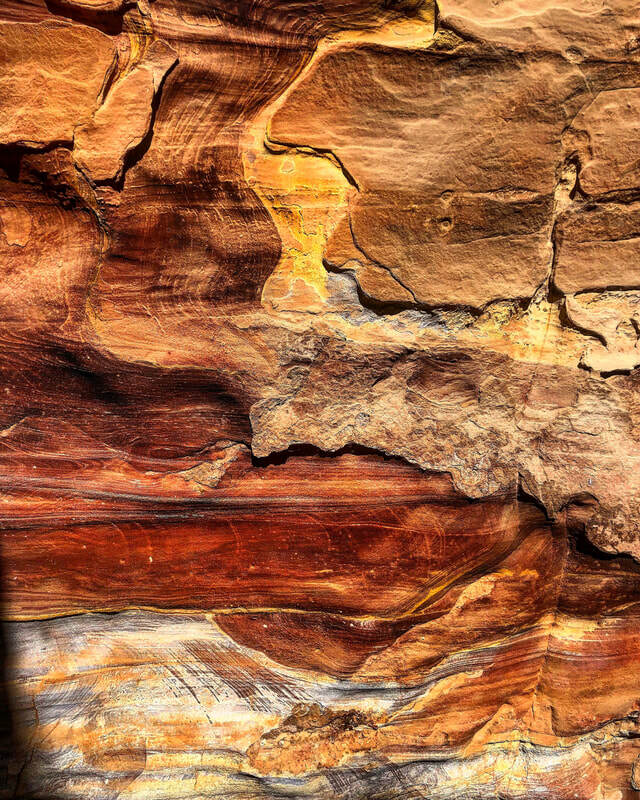 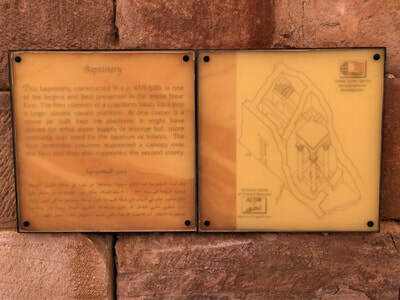 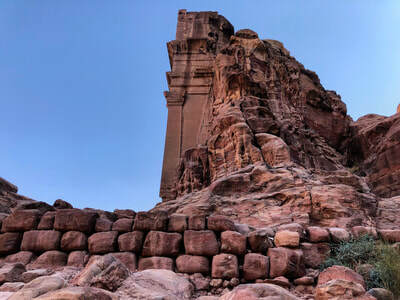 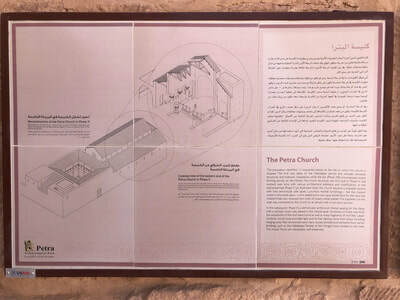 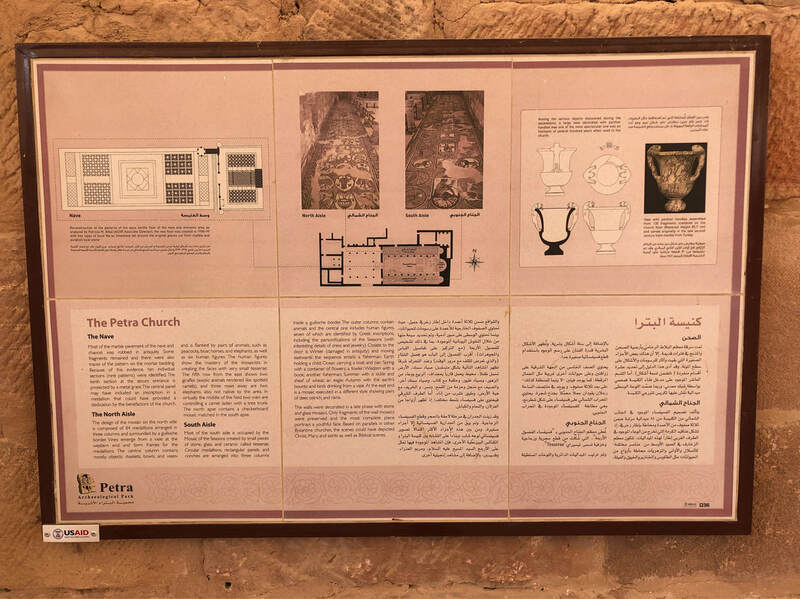 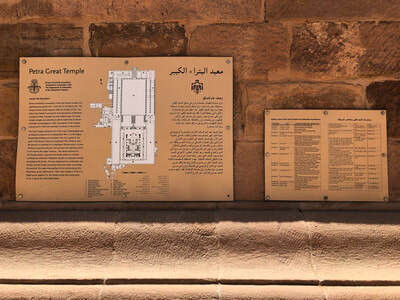 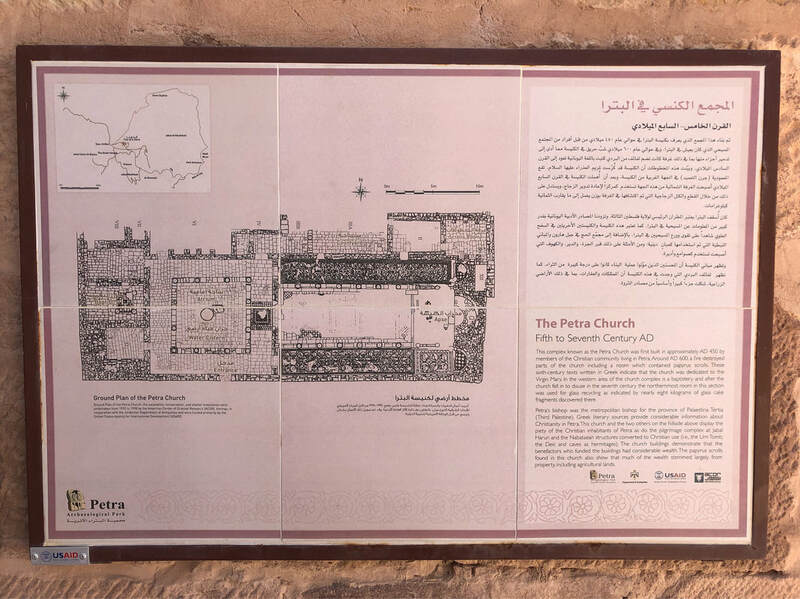 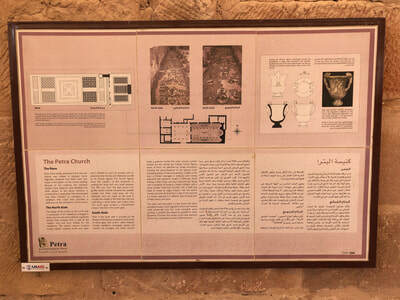 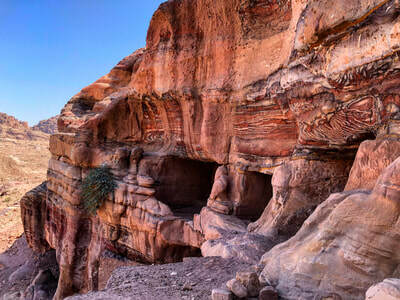 Evidence suggests that Petra has been inhabited and built upon by many different civilizations throughout its existence. 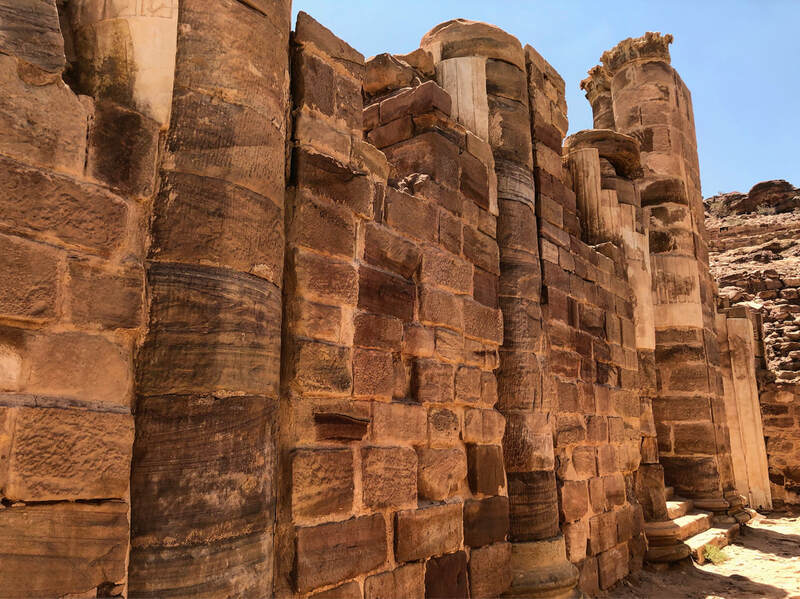 While walking through the area, you can see different types of construction and ruins that are similar to others found across the world. 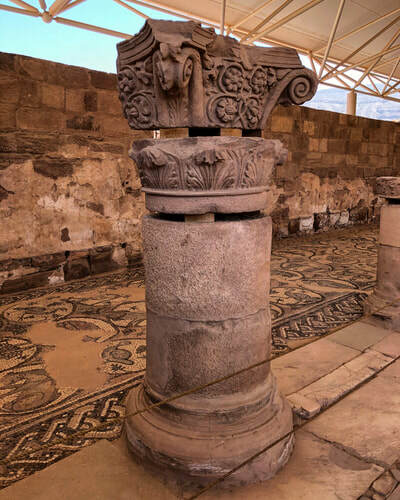 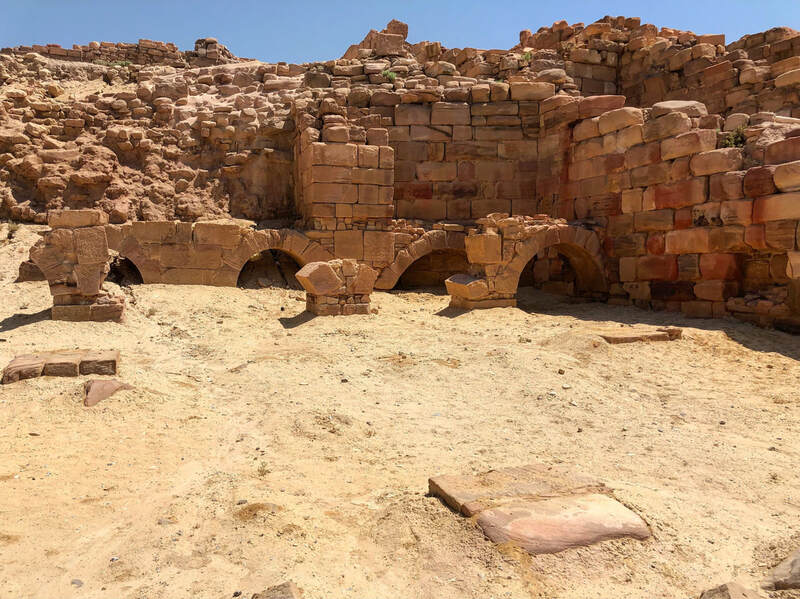 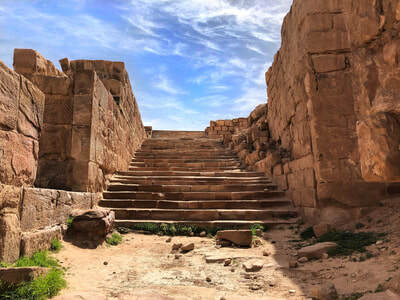 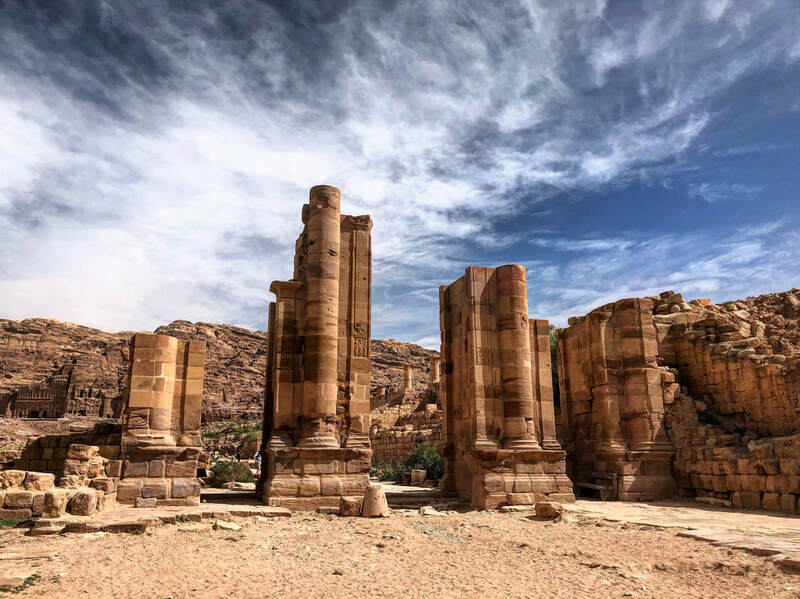 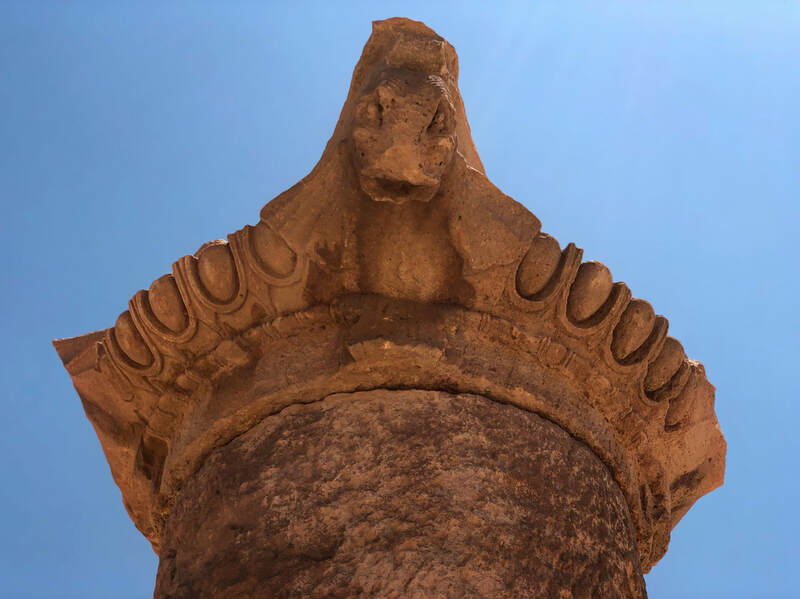 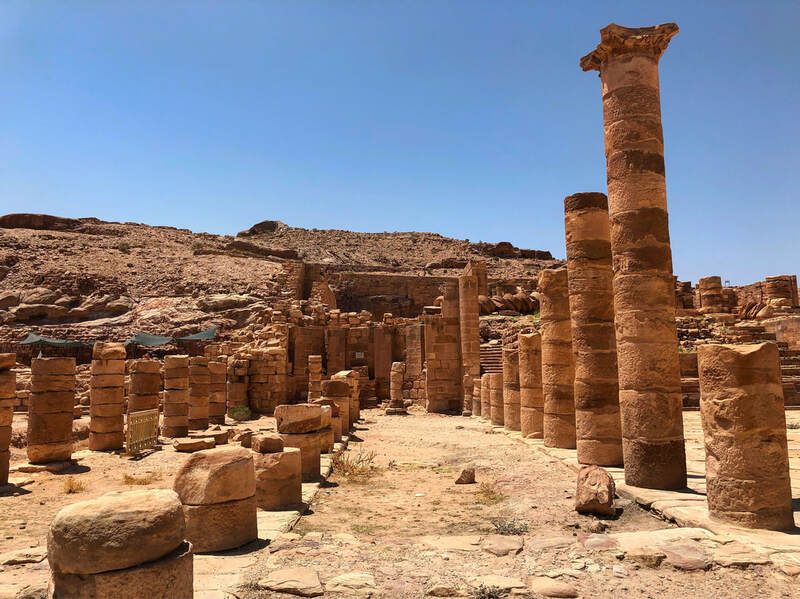 Remnants of roads and towering buildings, believed to be temples, are consistent with ruins found in Rome, the city of Jerash, and the amphitheater in Amman. 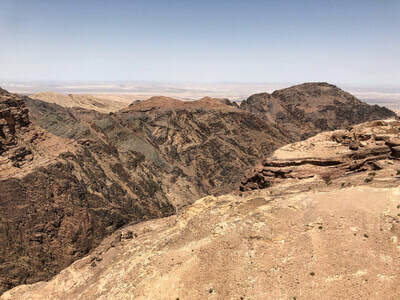 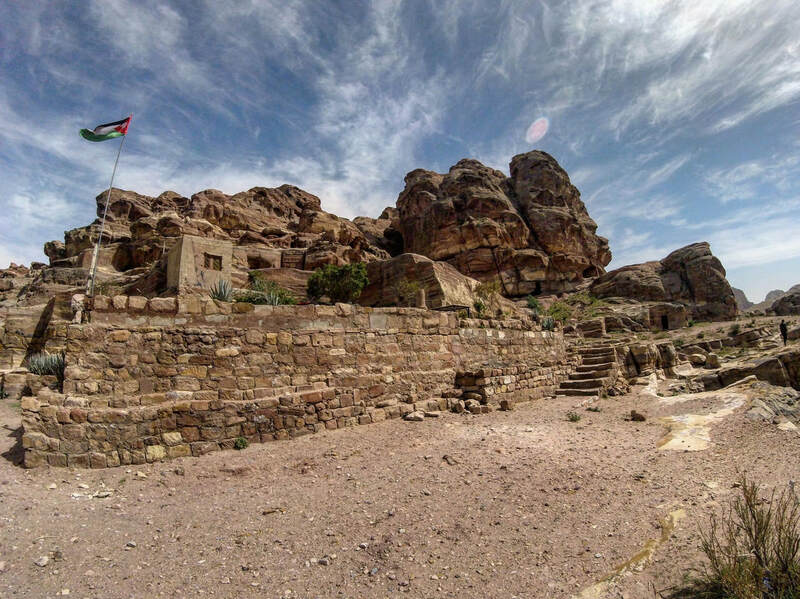 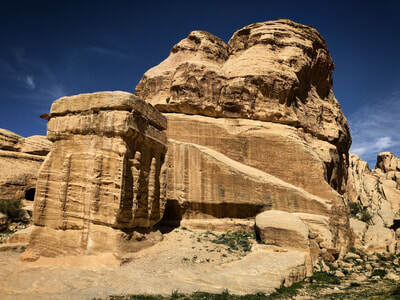 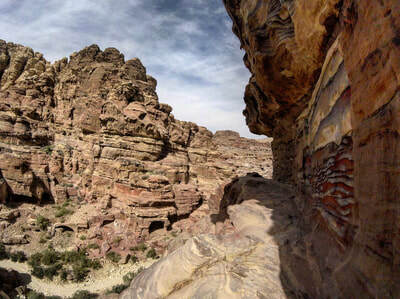 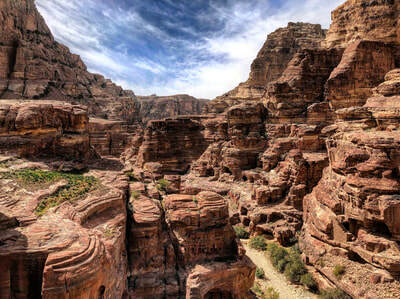 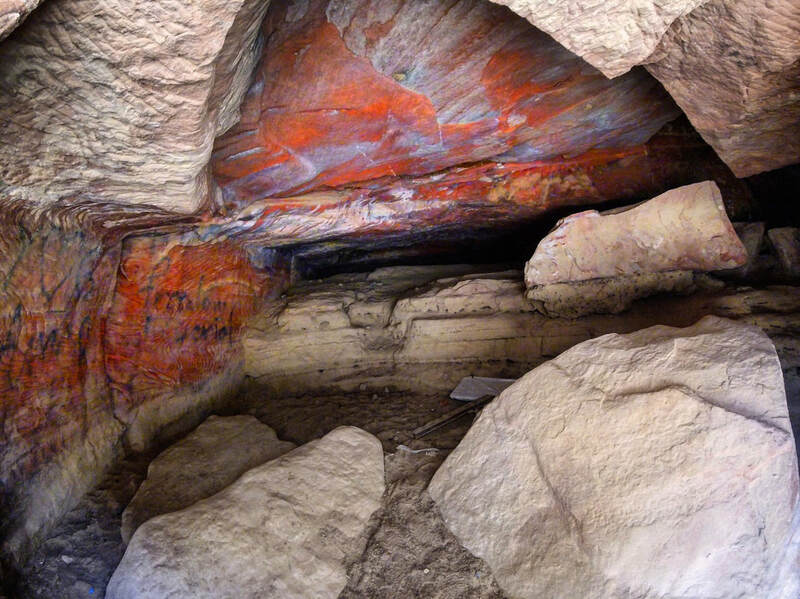 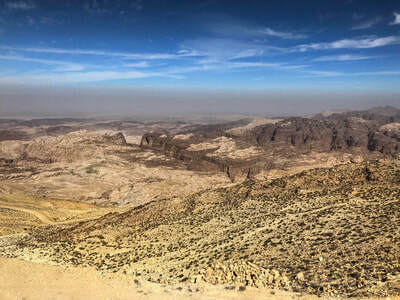 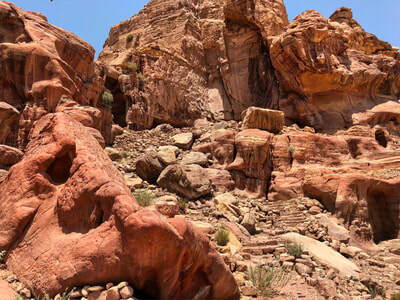 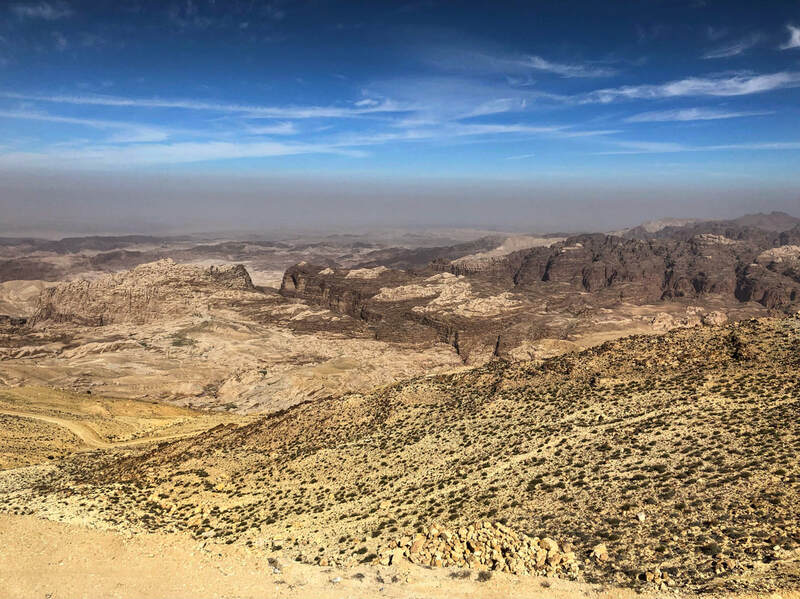 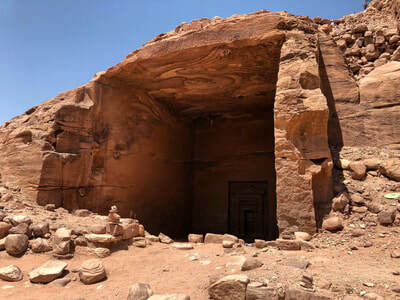 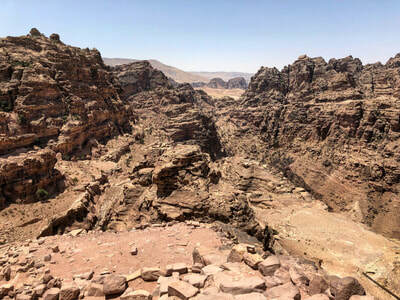 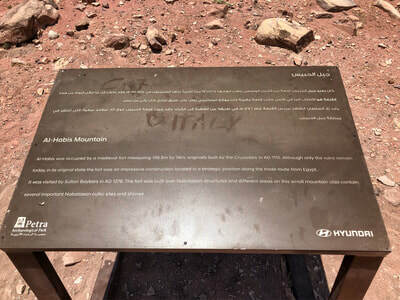 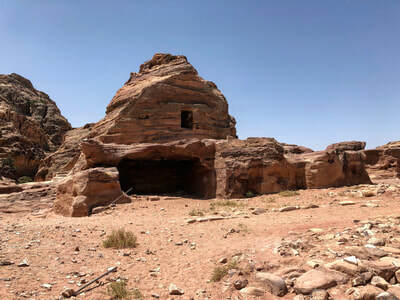 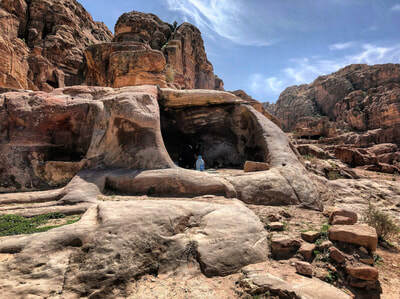 The latter two are found in Jordan and located north of Petra. 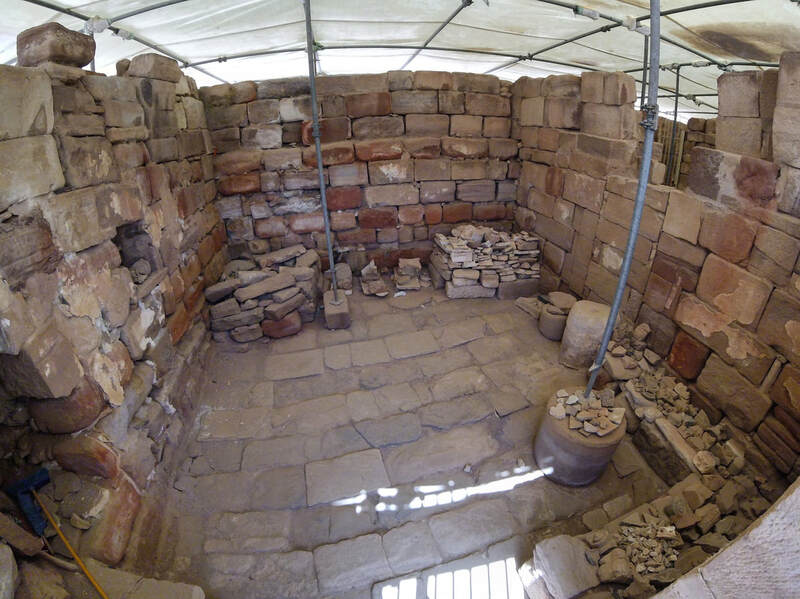 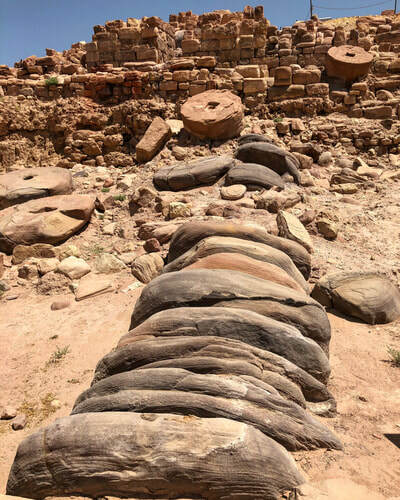 One of the most common questions asked by tourists is, "how does an ancient civilization with simple tools carve complex structures into the stone walls?" Unfortunately, the exact building techniques and tools used are not known and only speculative answers are given, but one theory suggests a "carve down" (starting from the top and working down) style was used. 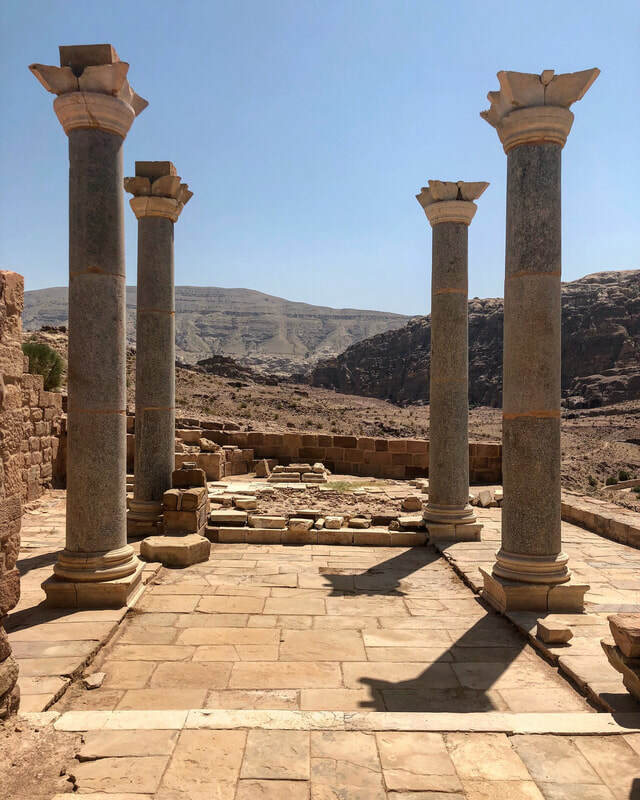 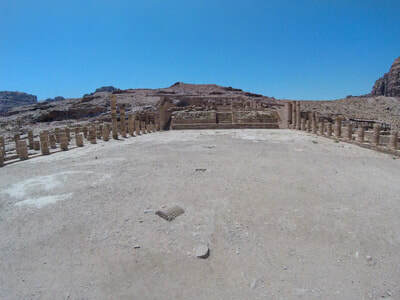 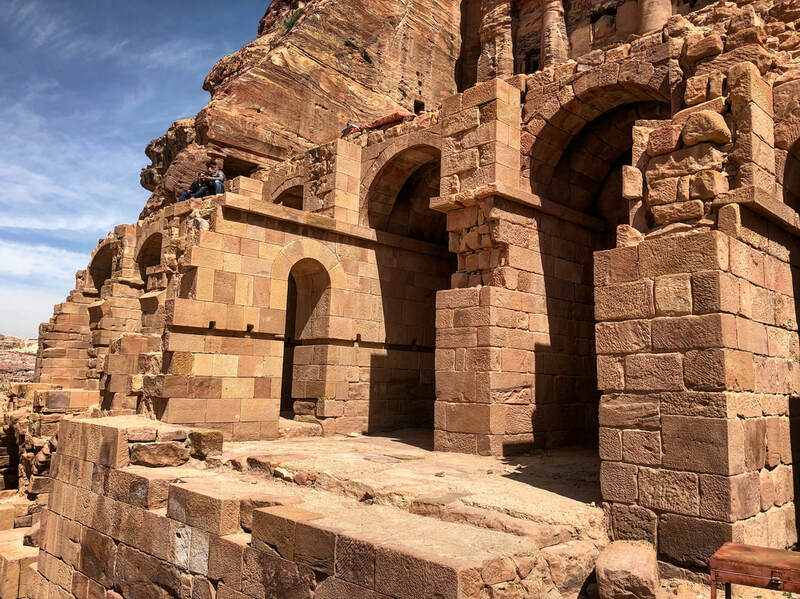 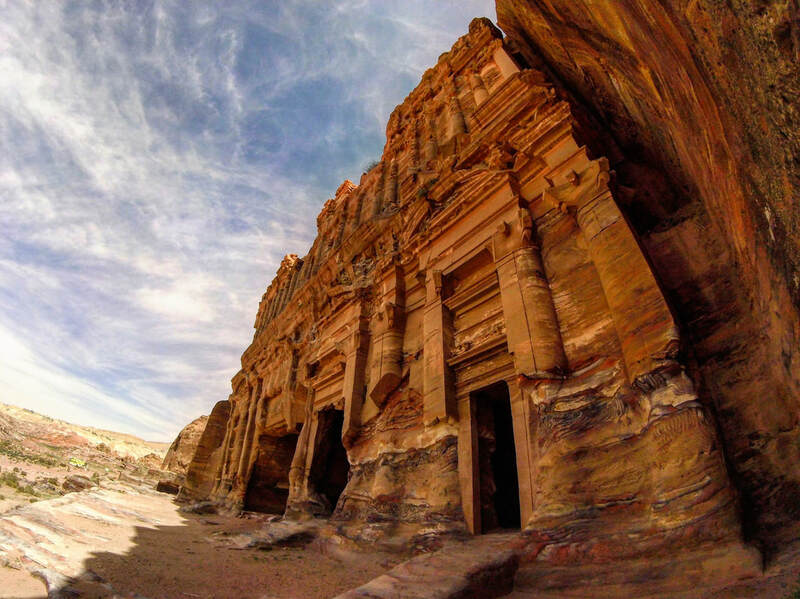 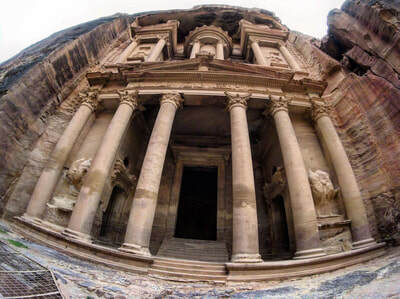 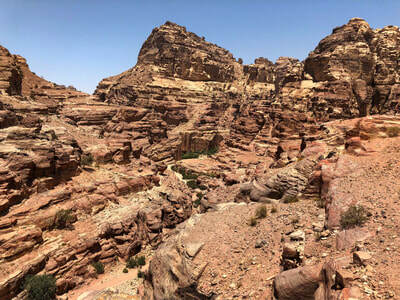 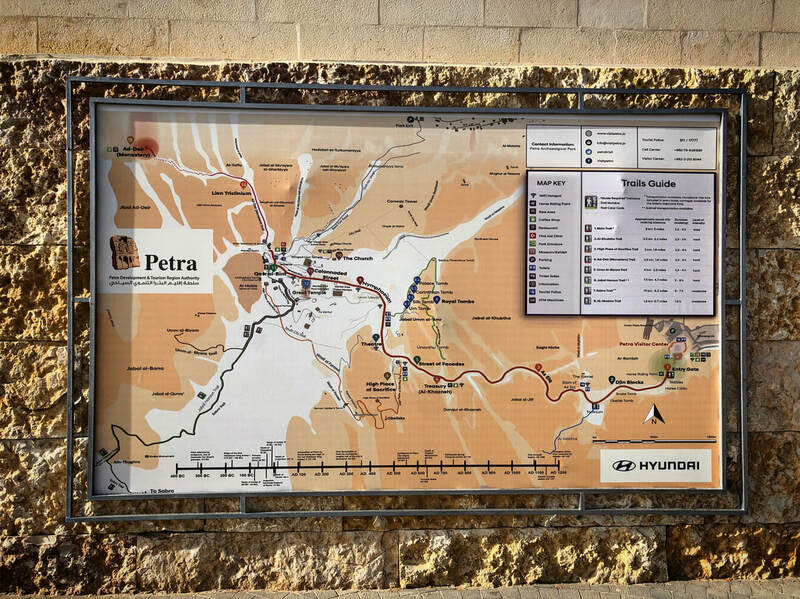 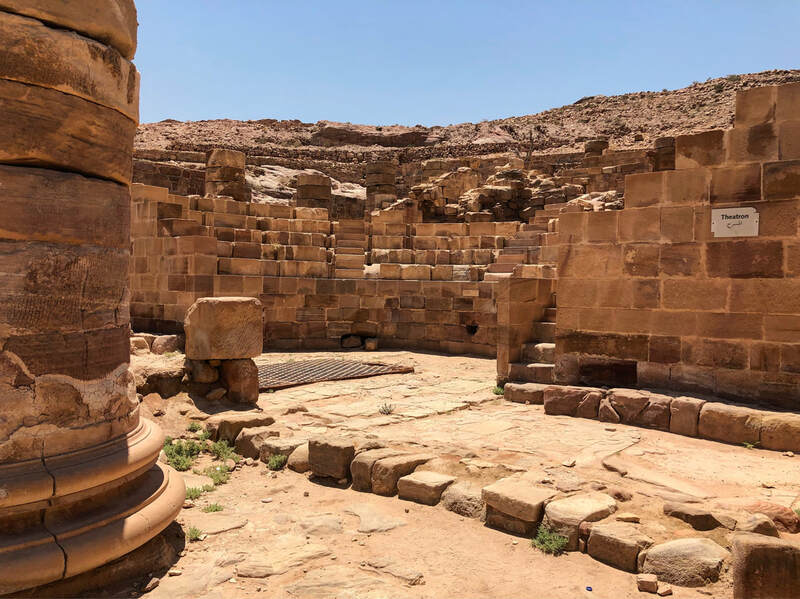 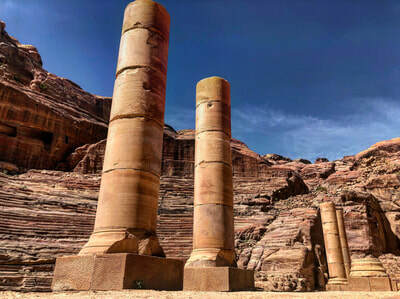 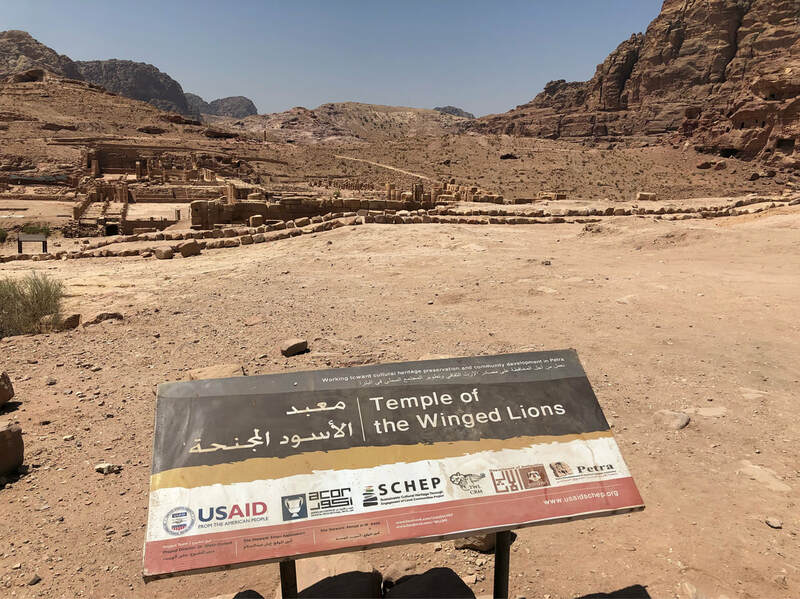 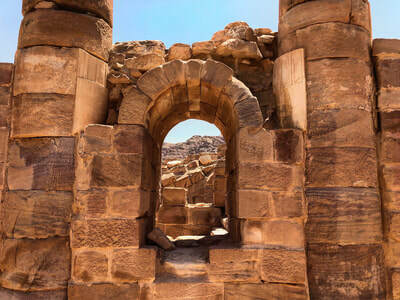 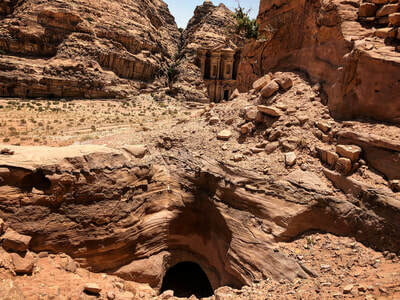 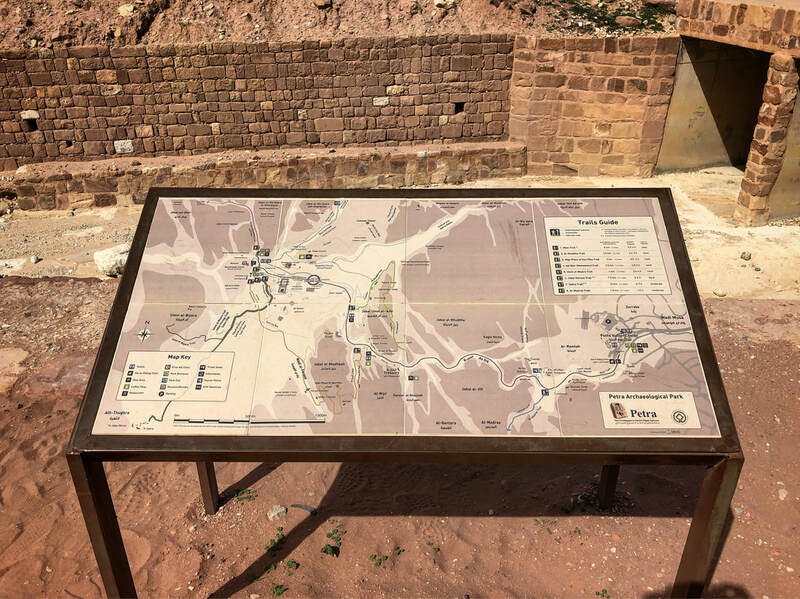 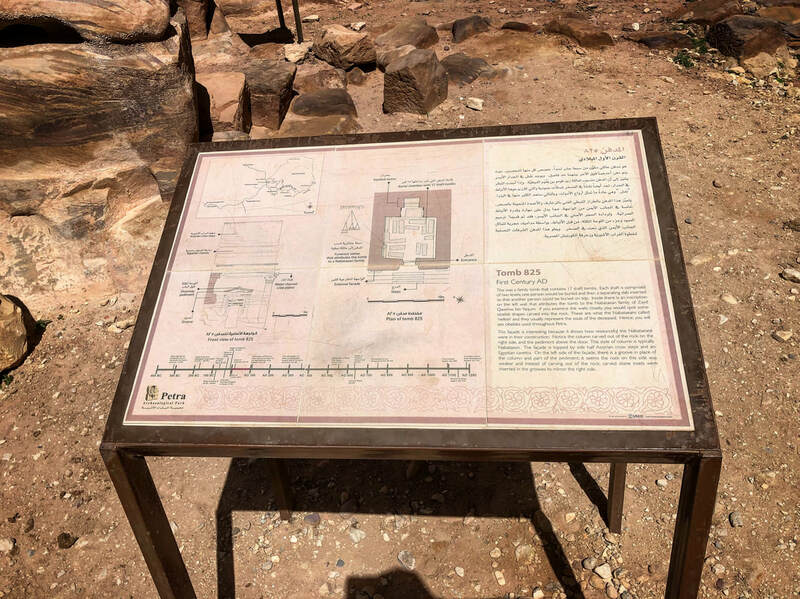 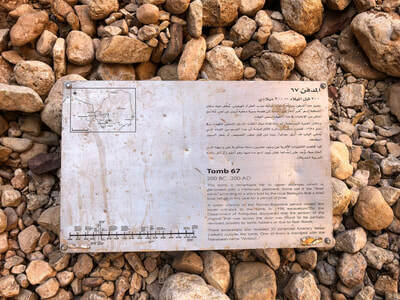 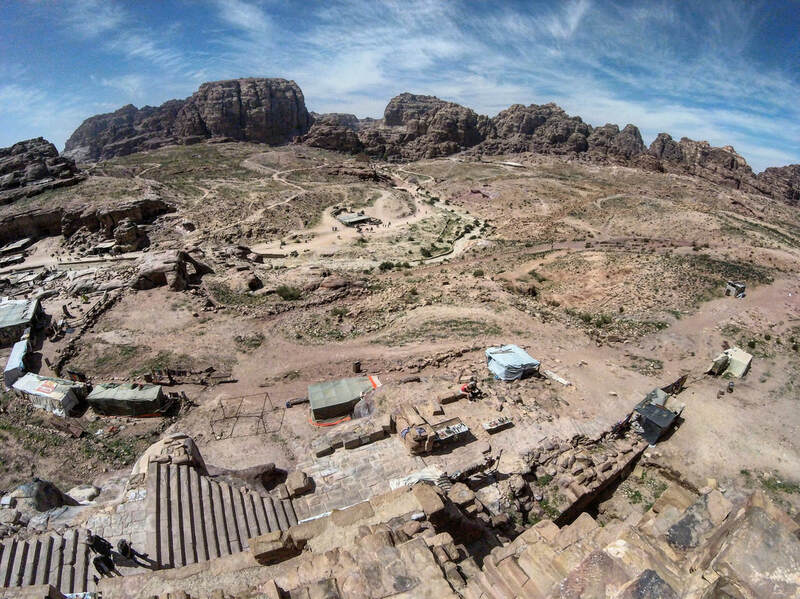 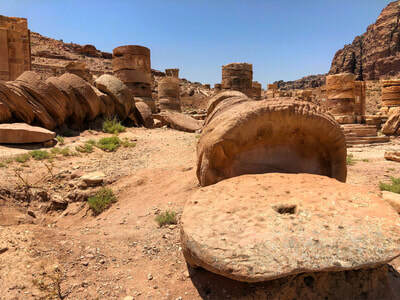 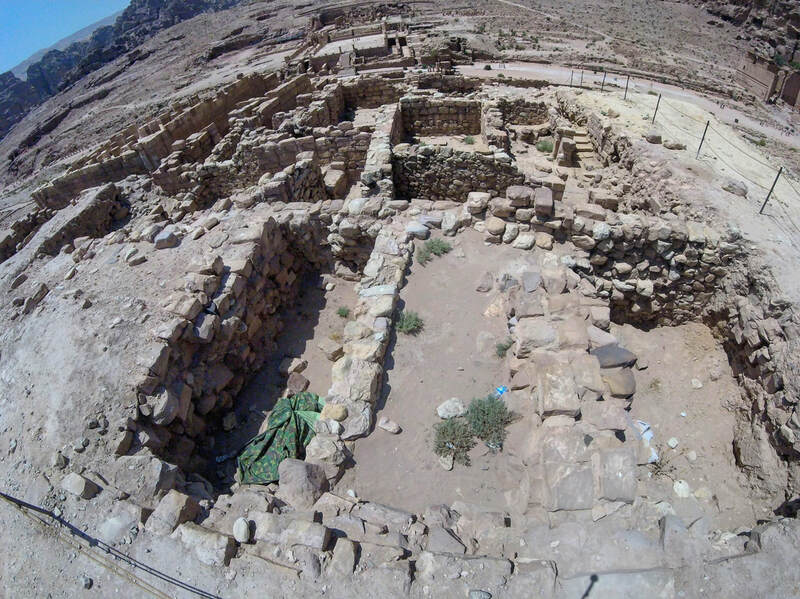 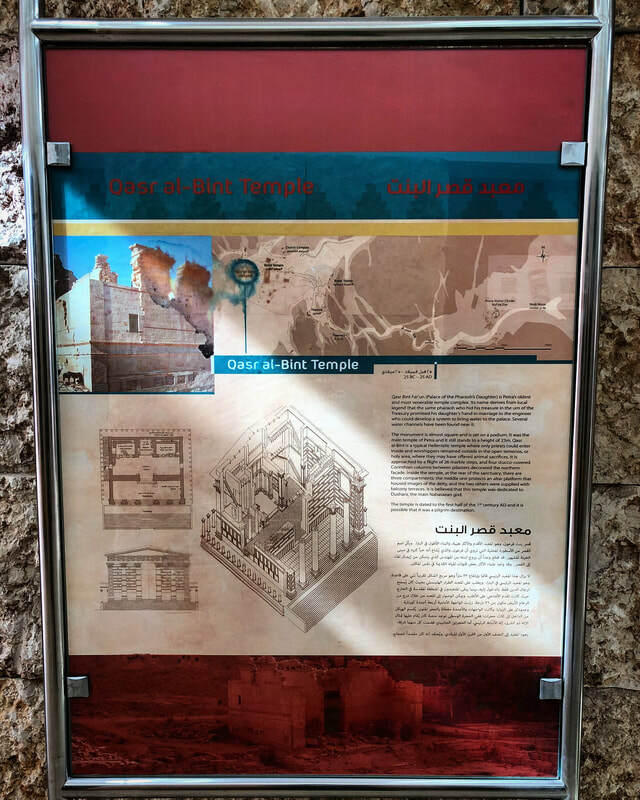 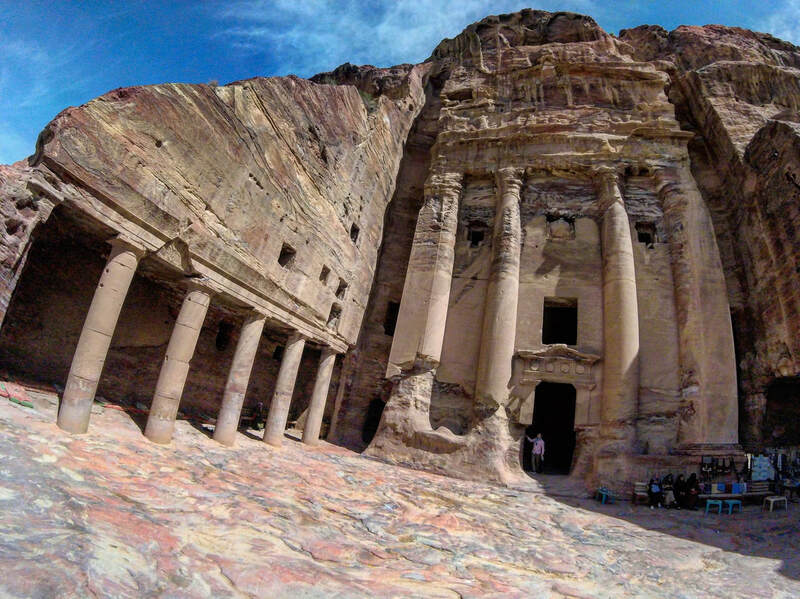 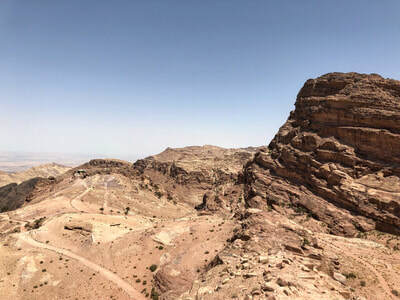 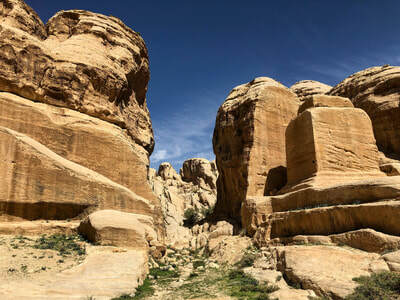 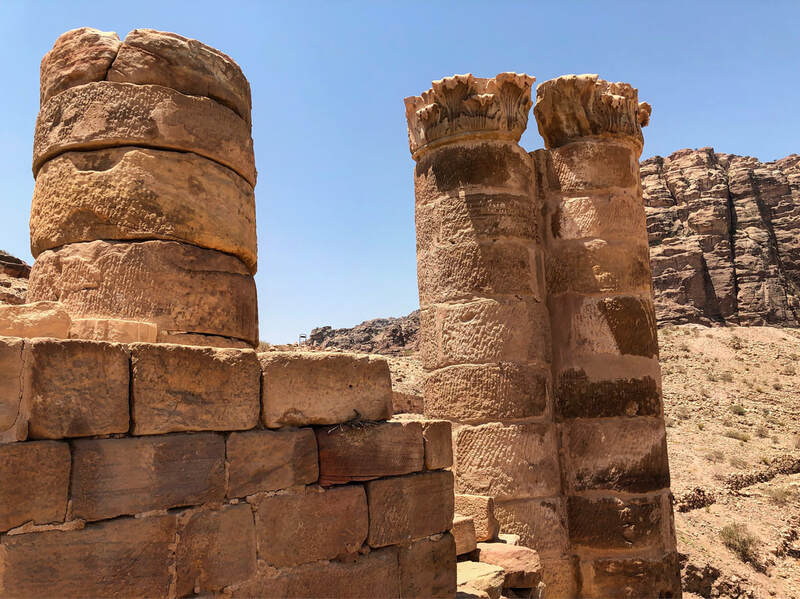 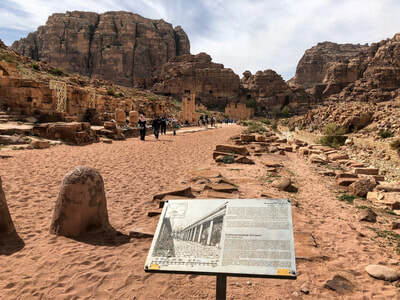 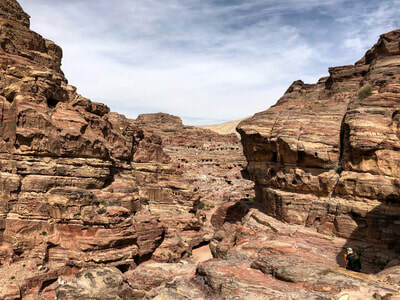 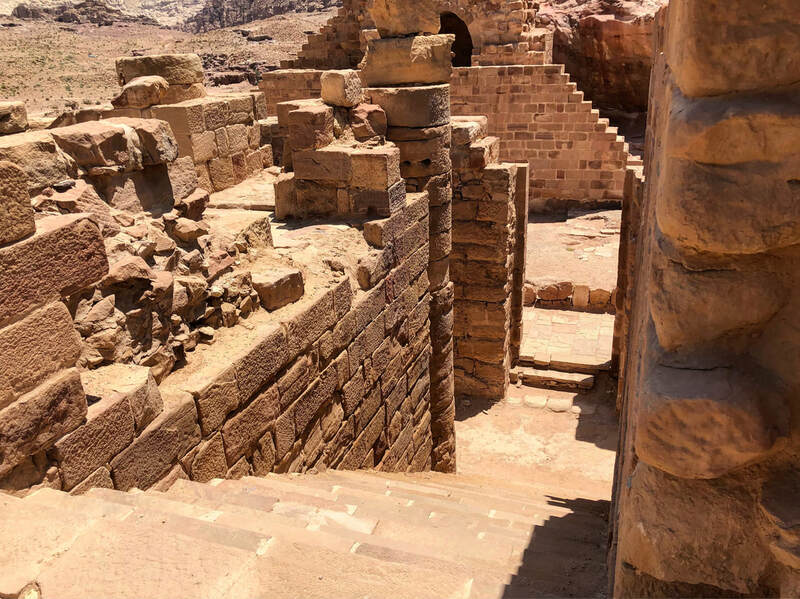 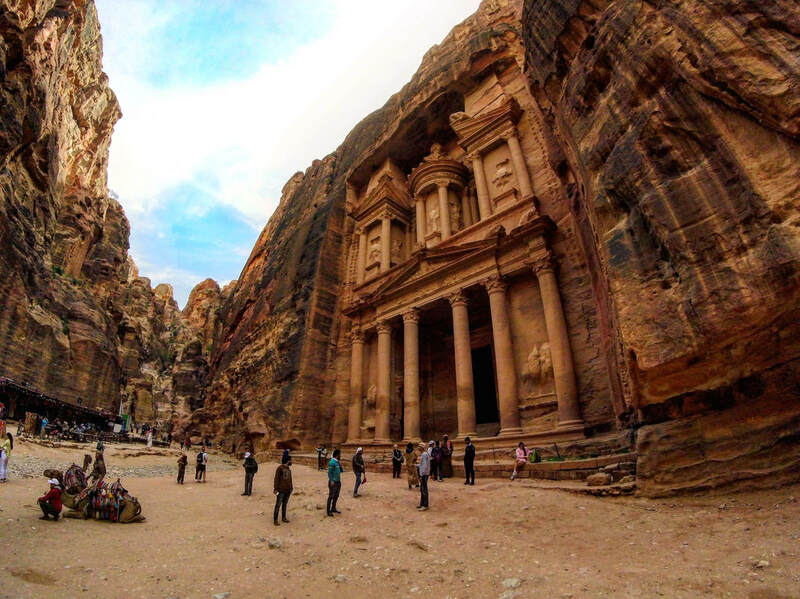 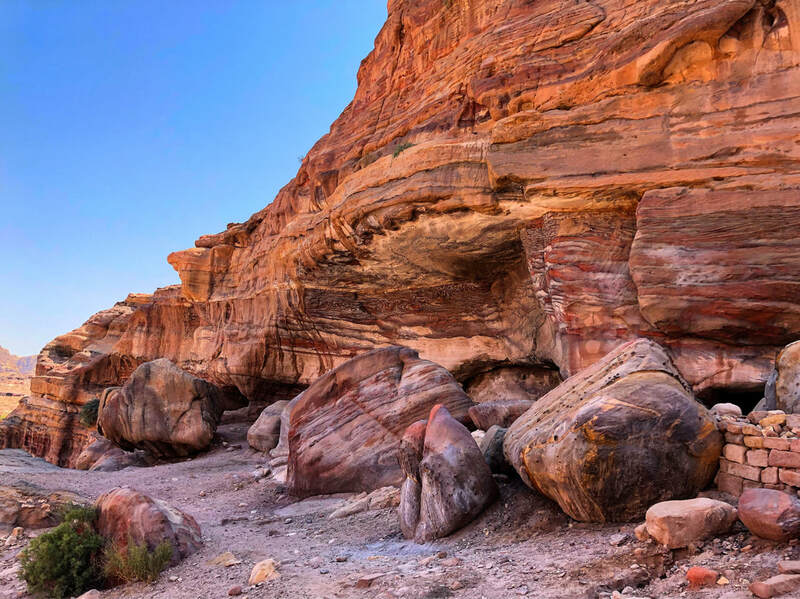 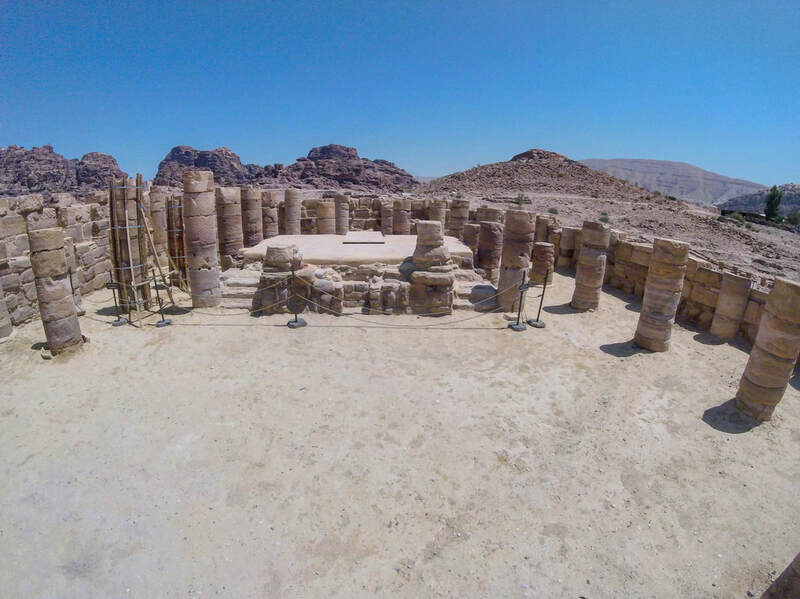 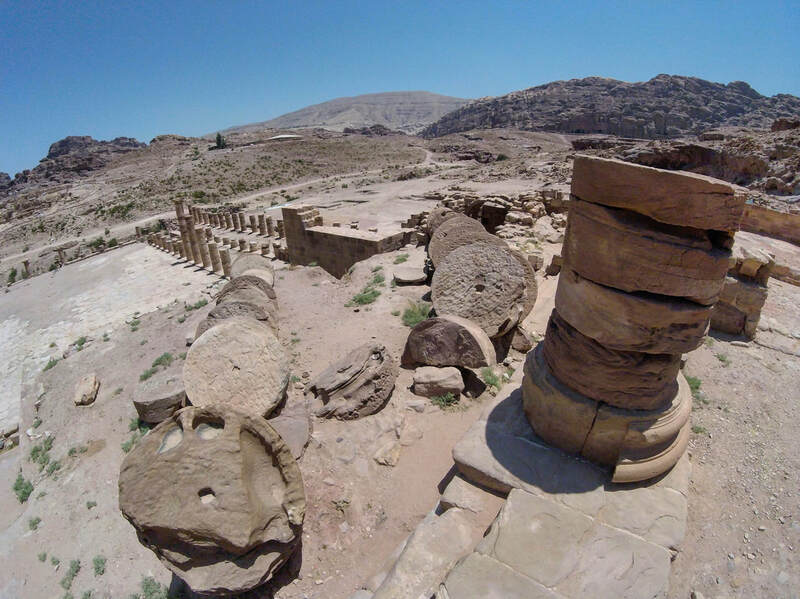 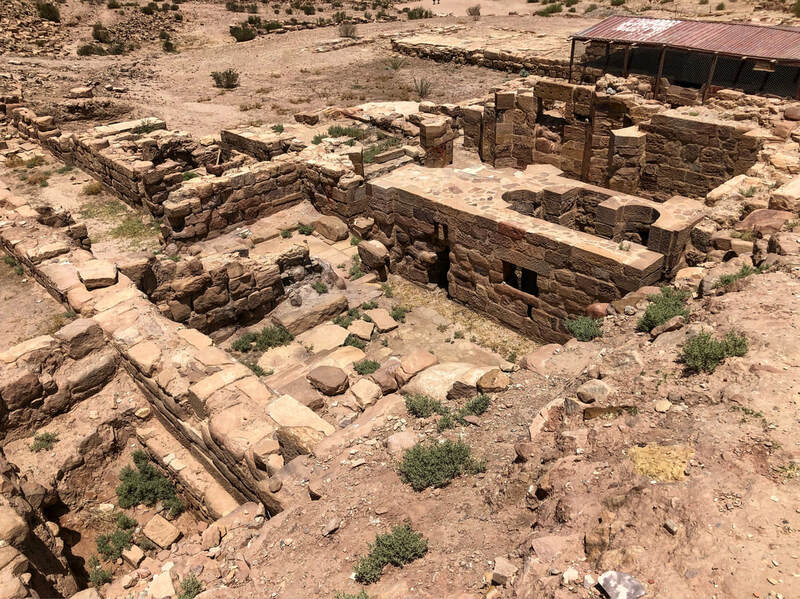 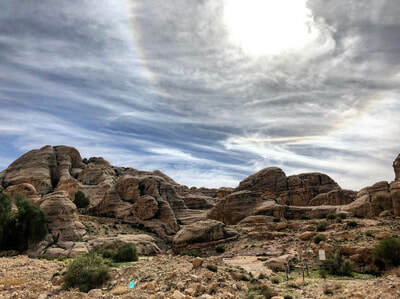 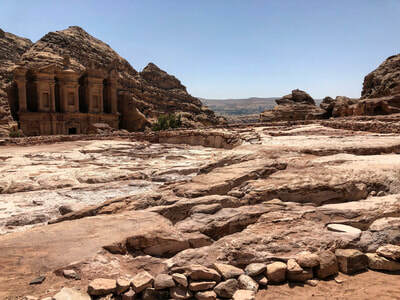 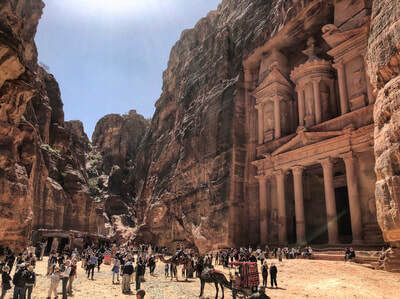 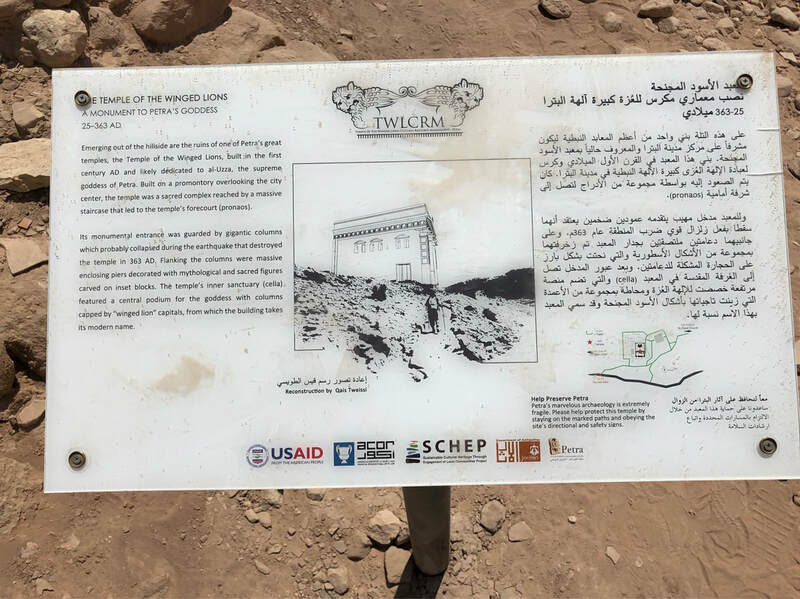 Just like other sites dating back to this time period or older, Petra is surrounded in mystery and a lot of information has been lost due to time, looters, and natural disasters. There are so many reasons to be dazzled with this city, but I think one of the most impressive things and certainly a true feat of engineering is the massive size of some of these structures, both height, and width. This grandeur style of construction continues throughout the area. To visualize this better, there are two pictures below. 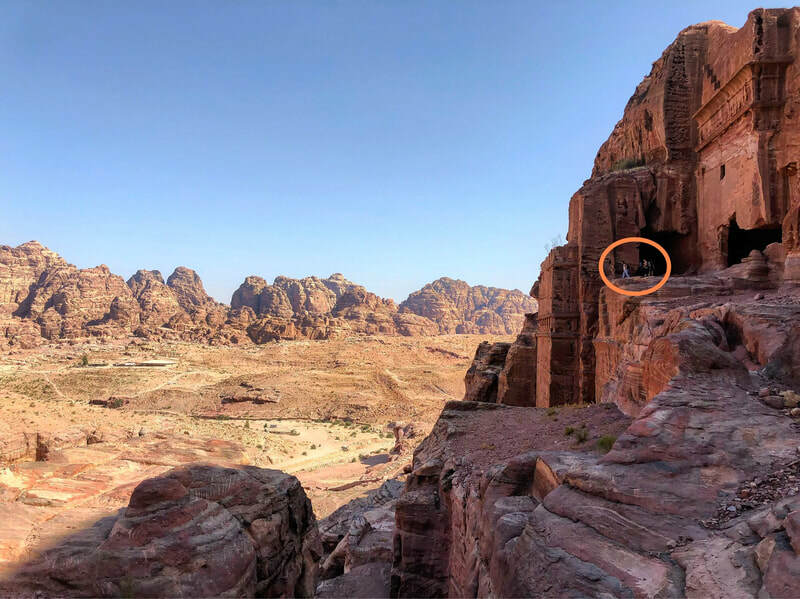 One of them contains people for scale and the other is a zoomed out view of the same building complex. 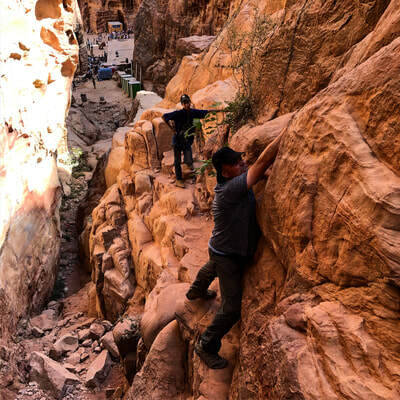 *three adults standing near a ledge. *circled area of where they were standing in the first picture. 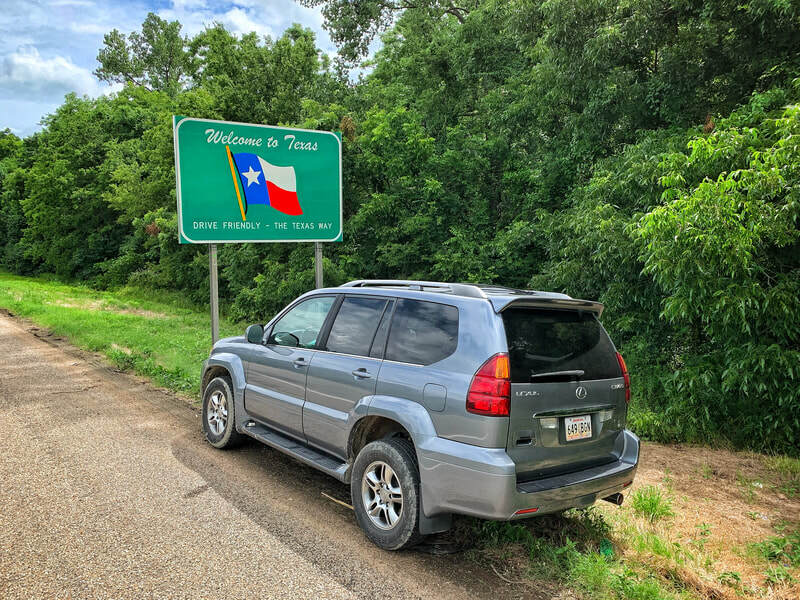 Before getting too much further, let me cover a few things. 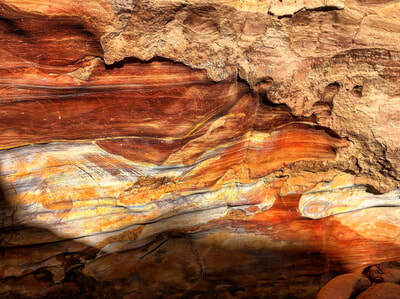 The weekend in this region of the world is Friday and Saturday, with Thursday typically being a half day for workers. 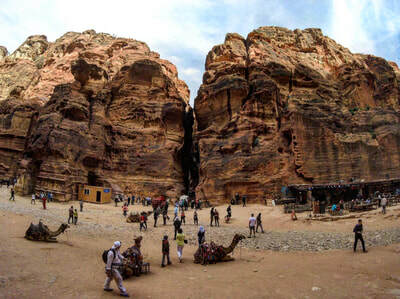 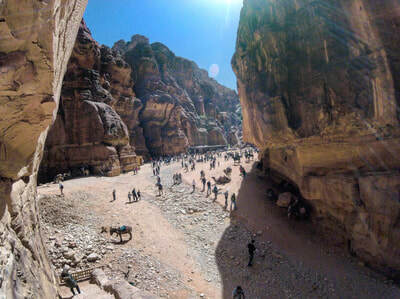 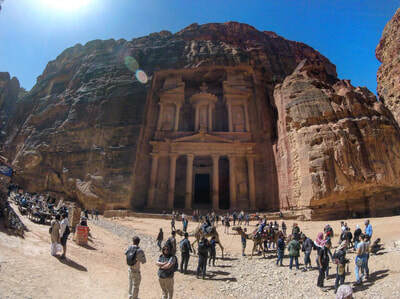 That means, Petra and other tourist sites can be extremely busy on those days. If possible, try and visit Sunday through Thursday. 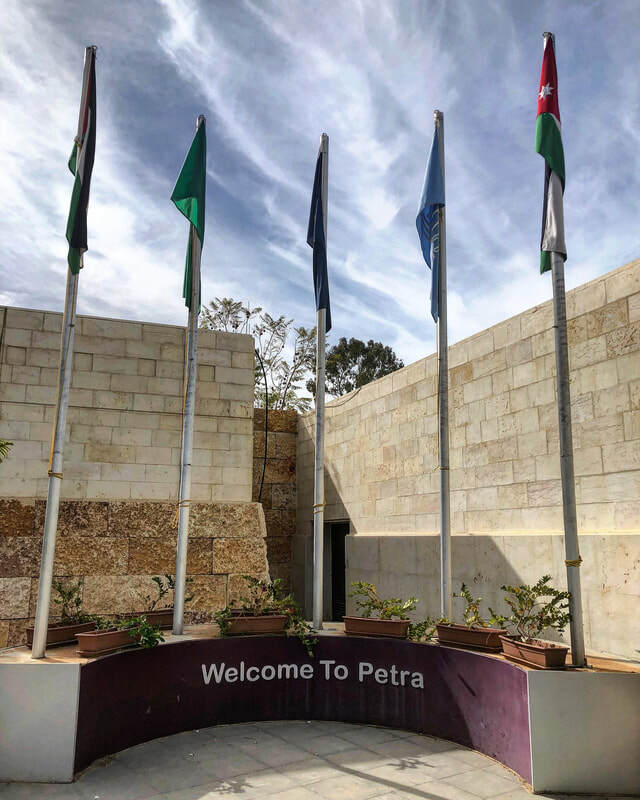 Whether you visit on the weekend or not, it is recommended you start earlier in the day before large tourist groups start arriving by the busload. 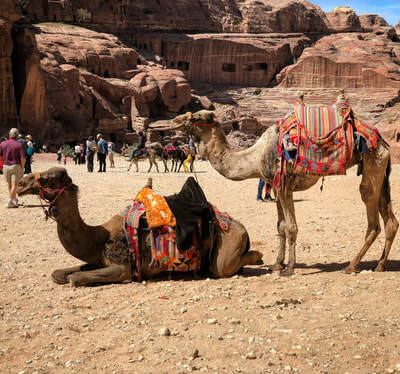 Depending on the time of year, starting early is also a good idea to beat the heat. Remember how your parents told you they had to walk to school uphill both ways? 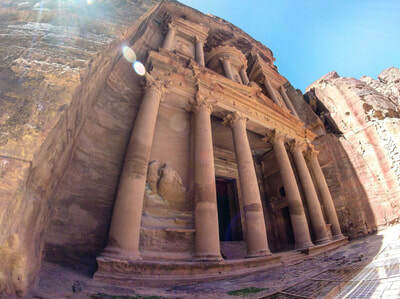 Well, apparently they went to school in Petra. Expect to do a lot of walking and depending on where you go (Monastery), you will walk uphill both ways. 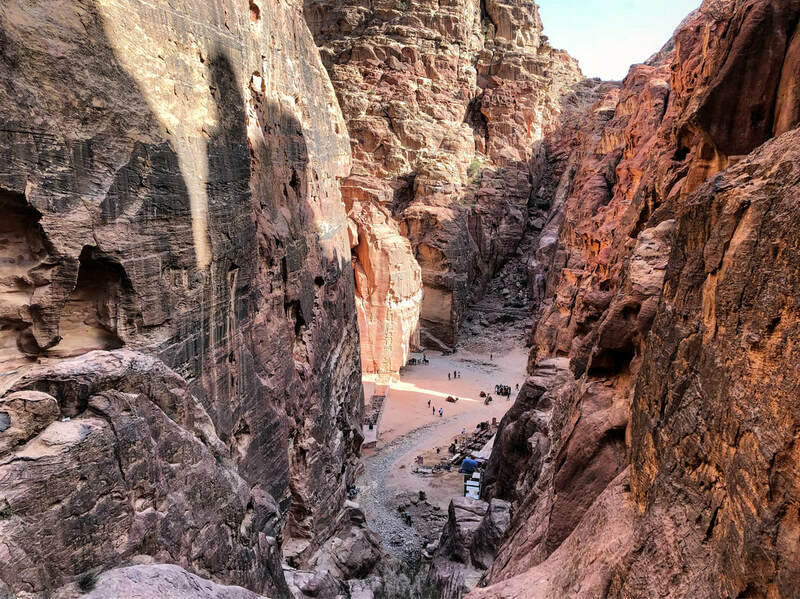 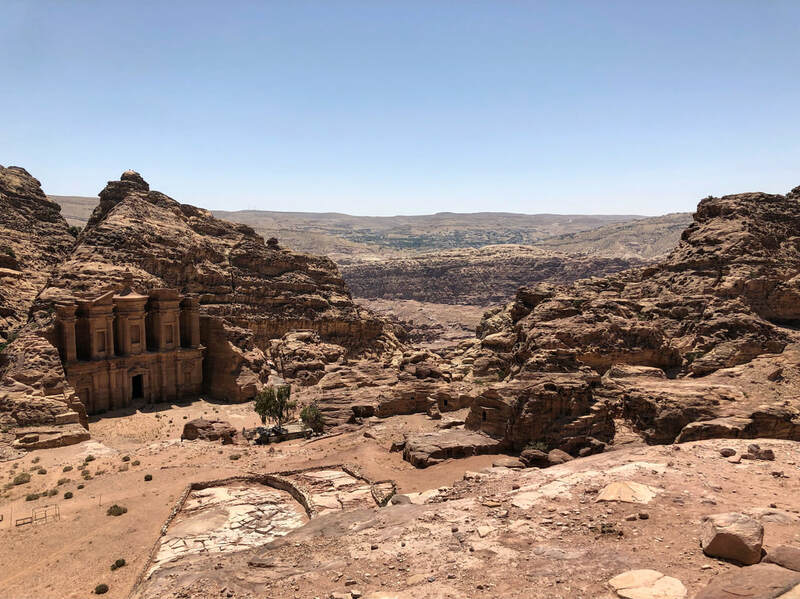 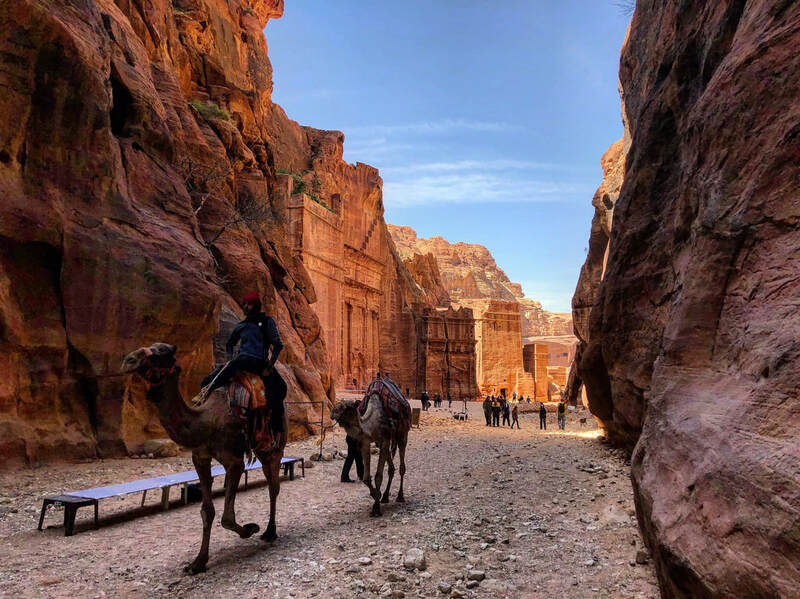 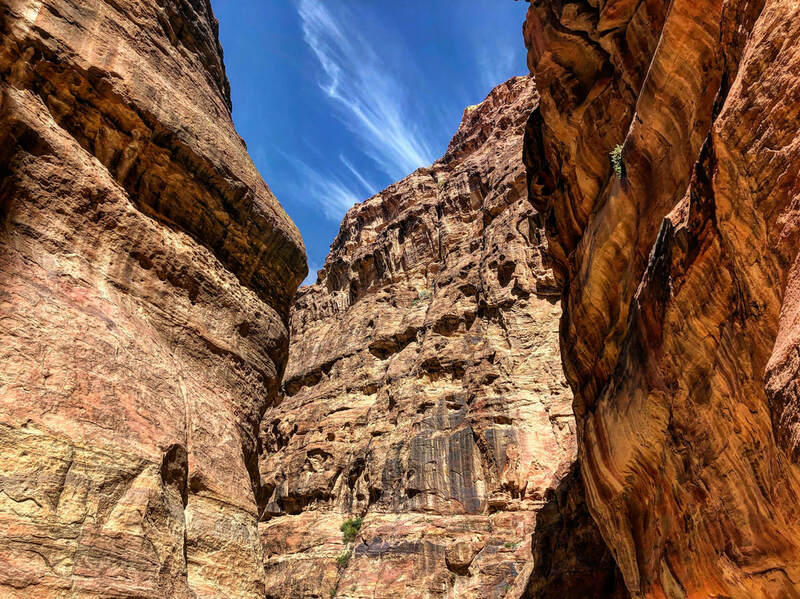 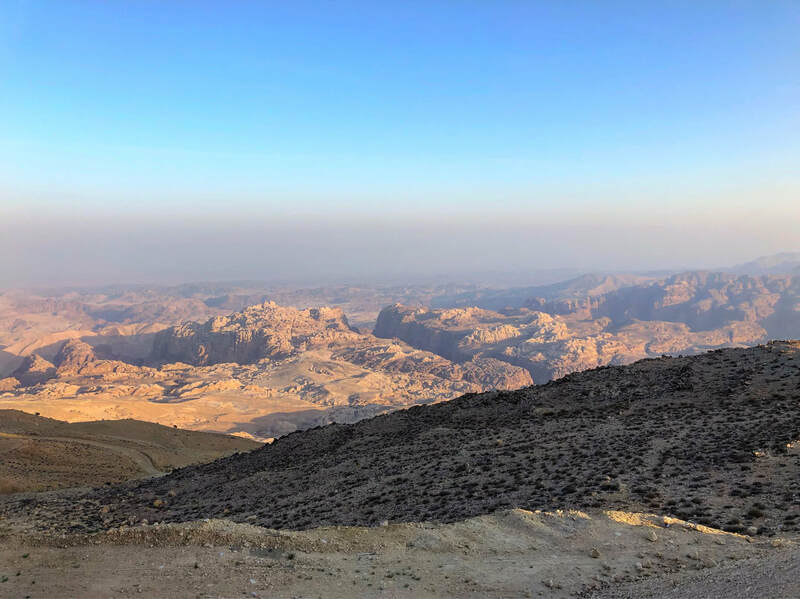 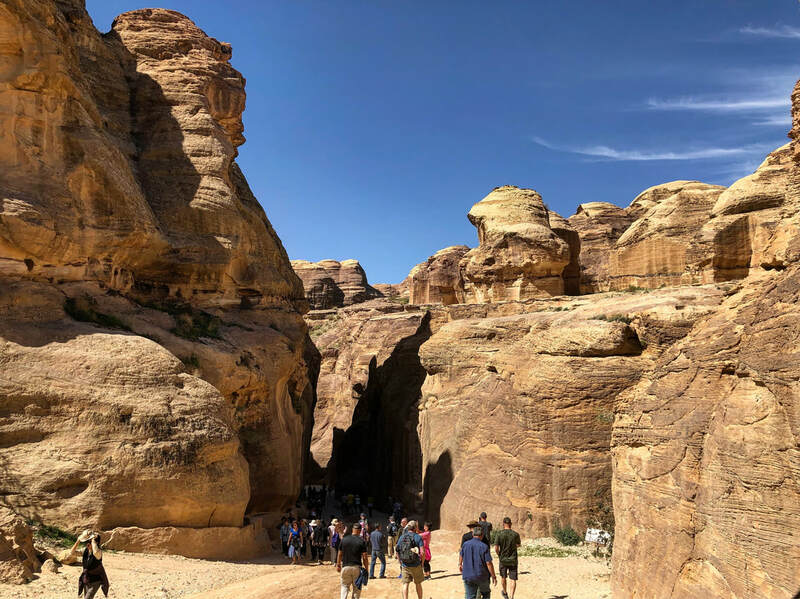 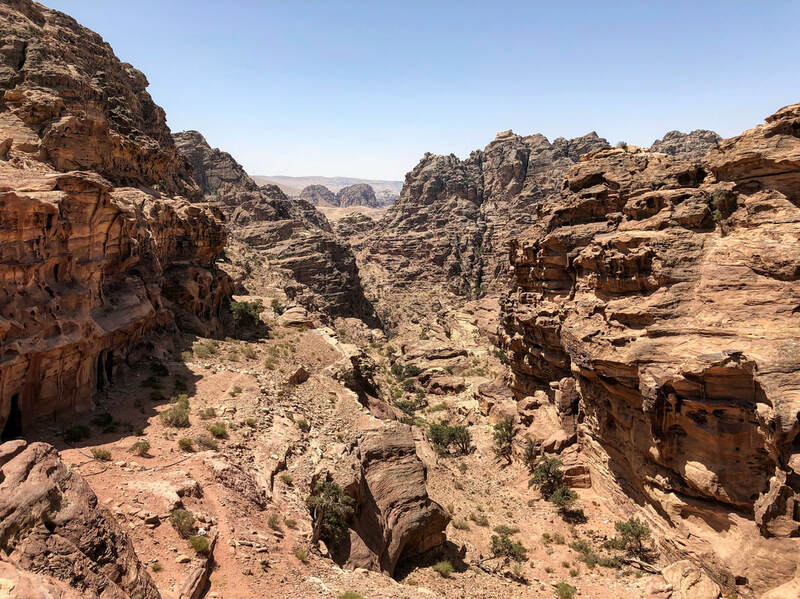 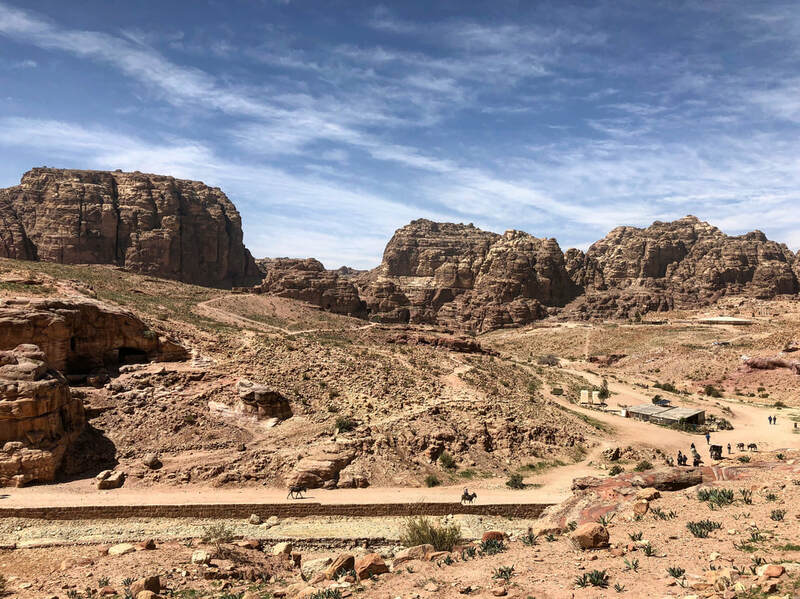 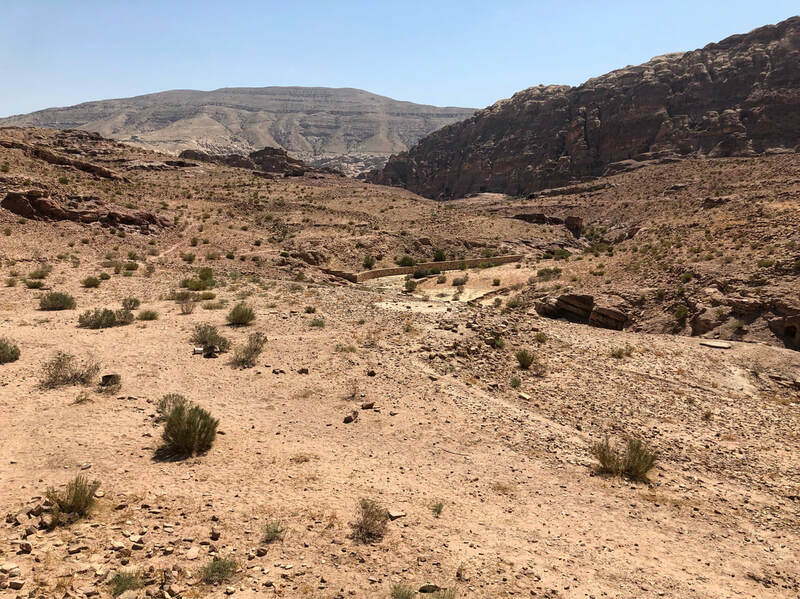 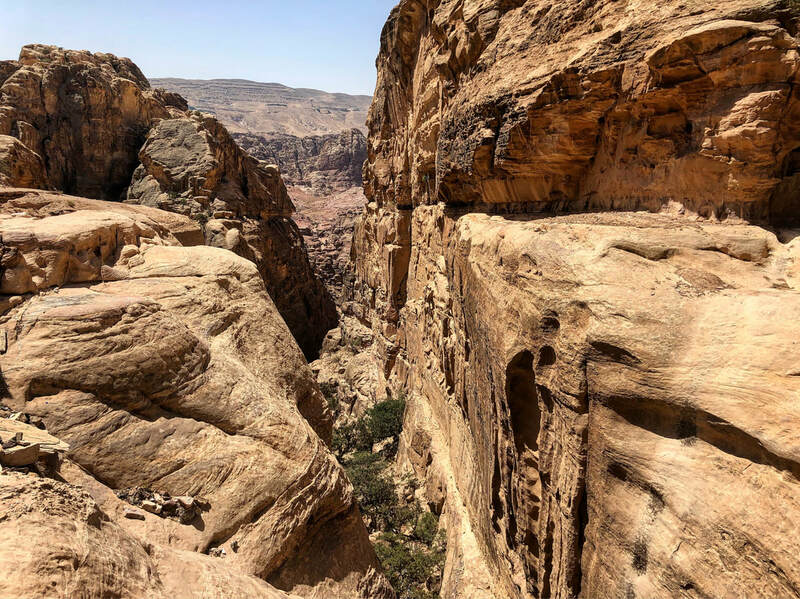 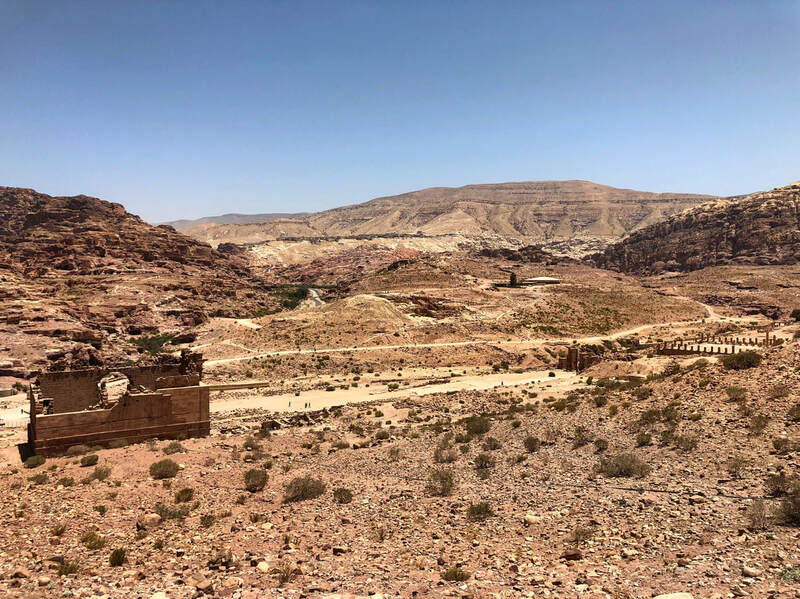 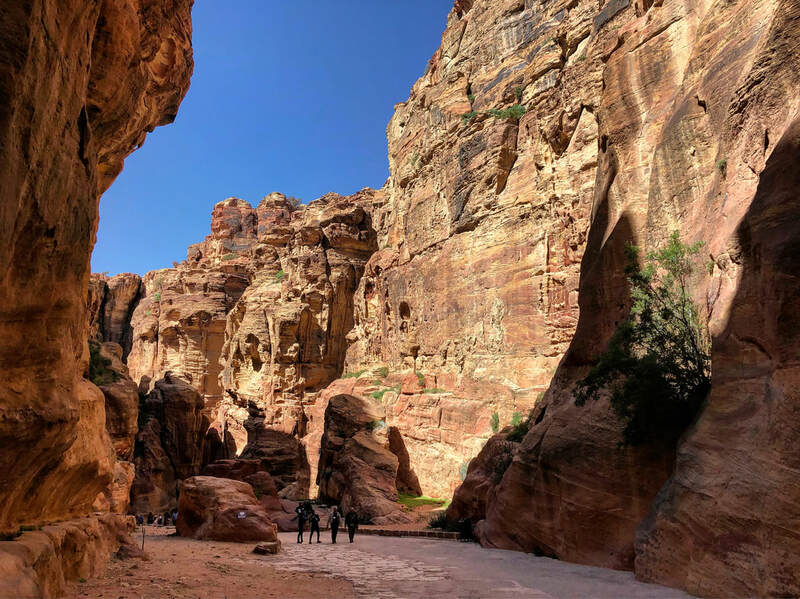 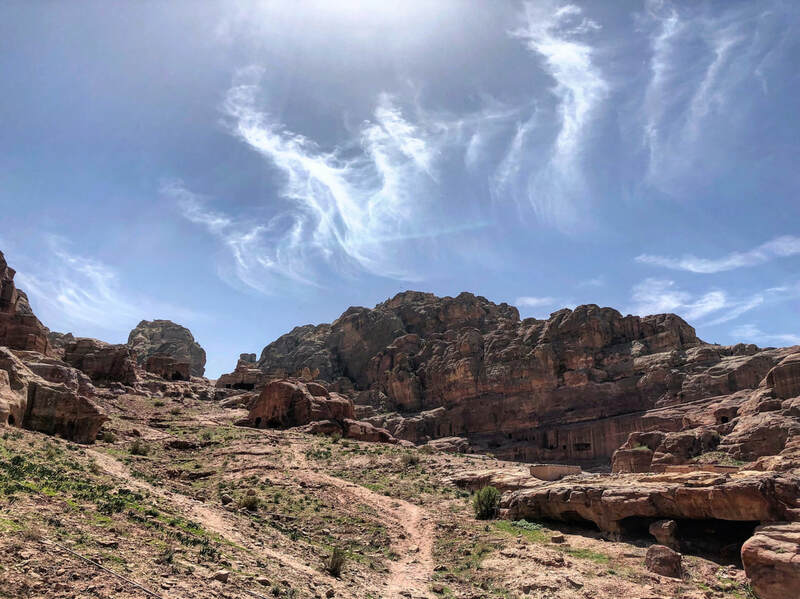 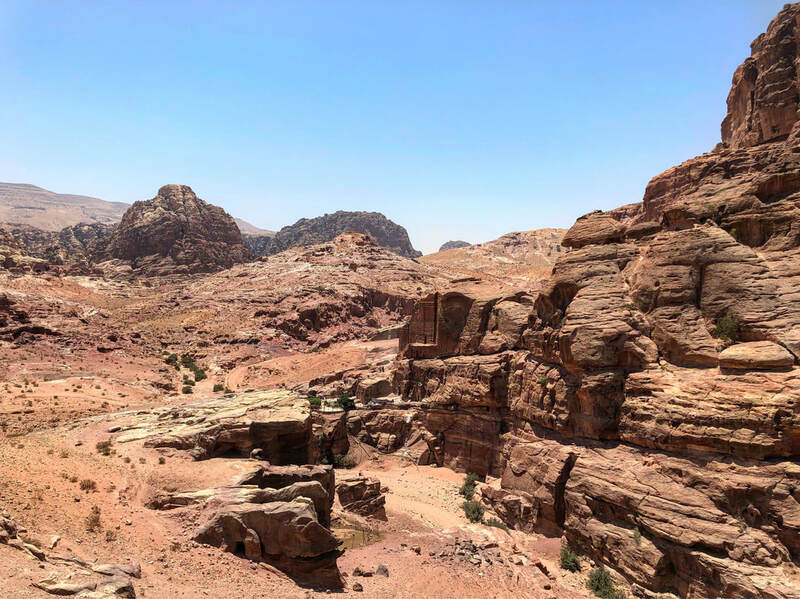 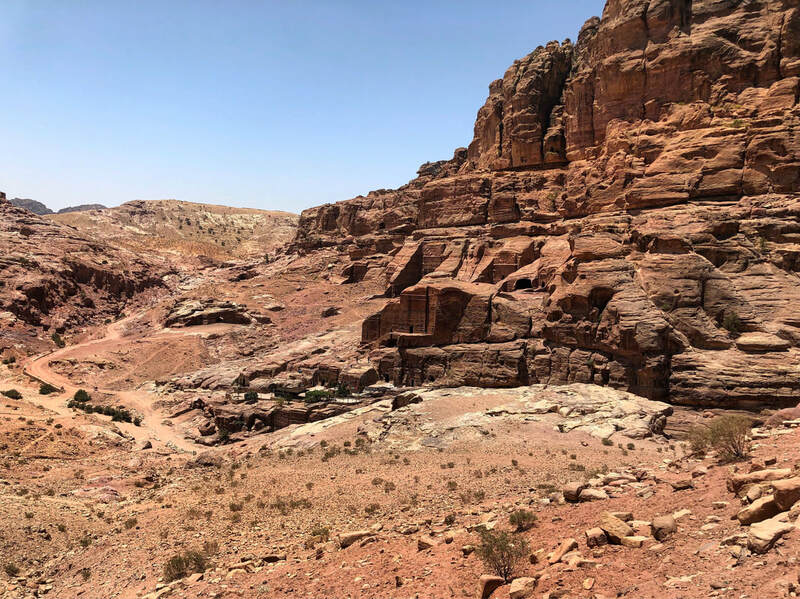 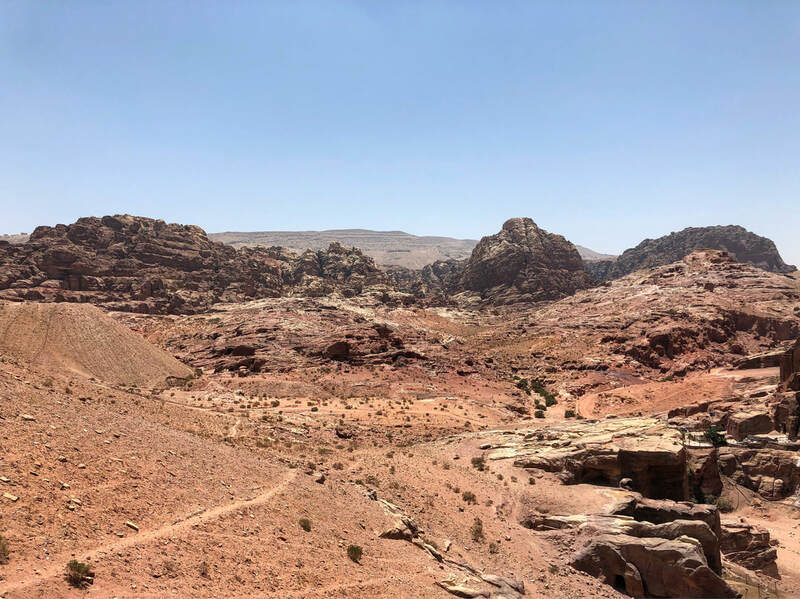 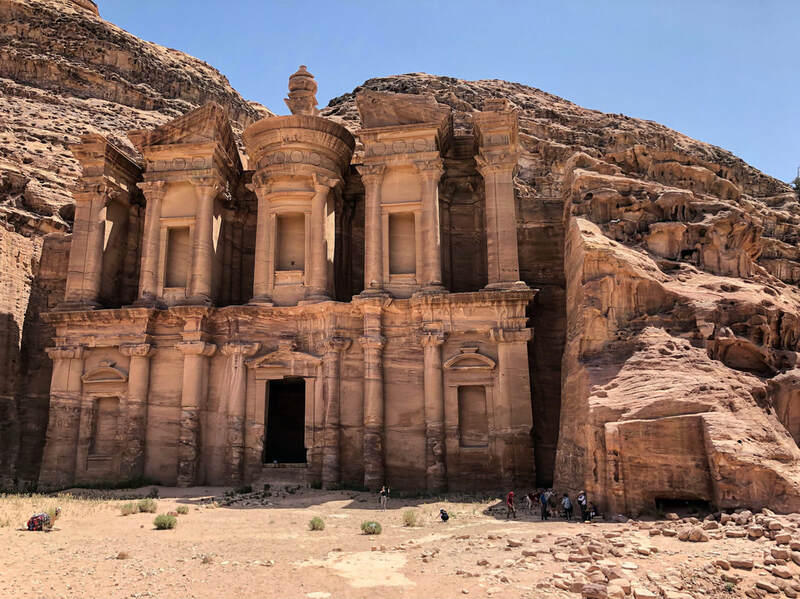 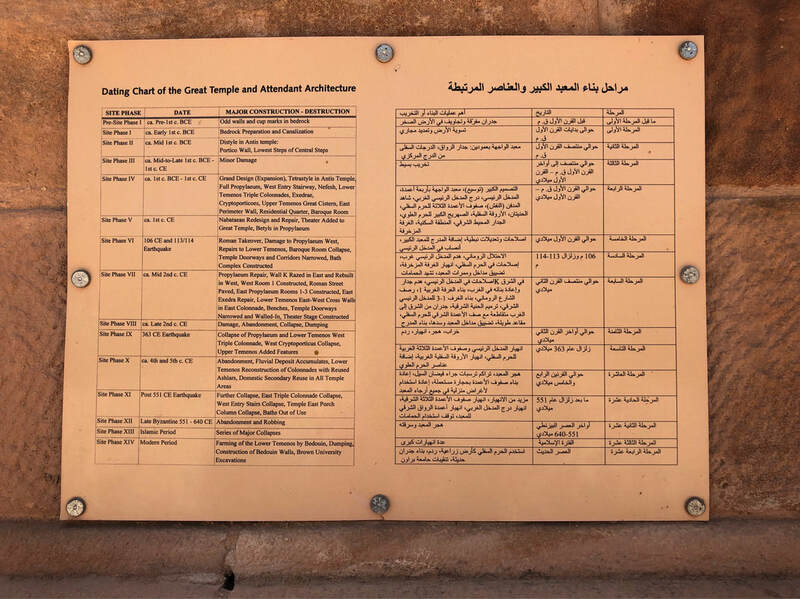 To give you an idea, at the time of writing this article, I have visited Petra on three separate occasions, one of which I walked approximately 14 miles (front gate to Monastery and back, with other routes in between) in about 6 hours. Having said that, if you do not feel like walking that much or due to age/health issues simply can not walk that much, there are options. 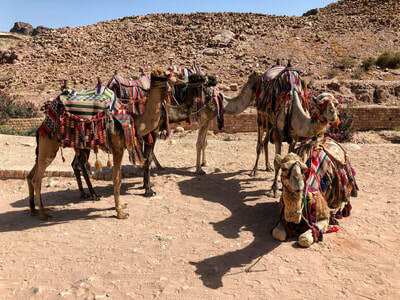 Throughout the area, you will see horse and carts, donkeys, and camels available to shuttle people around. Whether you walk, ride, or do a combination of both, I recommend wearing comfortable clothing, to include hats or other garments to block the sun, proper shoes, and maybe a small backpack to store items. 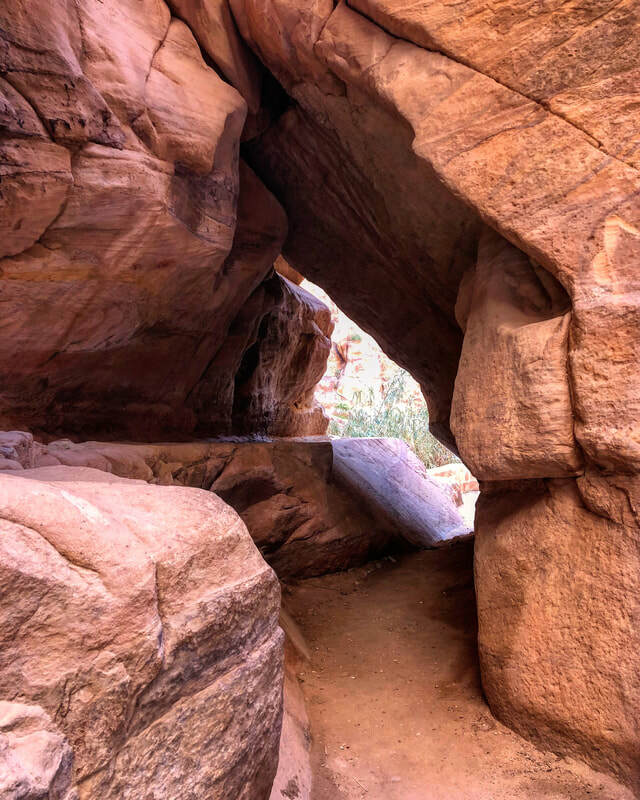 Also, if possible, bring snacks and water, but if not, no worries, there are places you can buy water and food along the way. 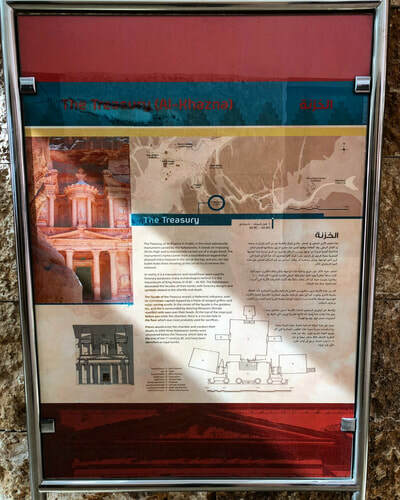 If you are like me, you enjoy picking up or buying souvenirs. 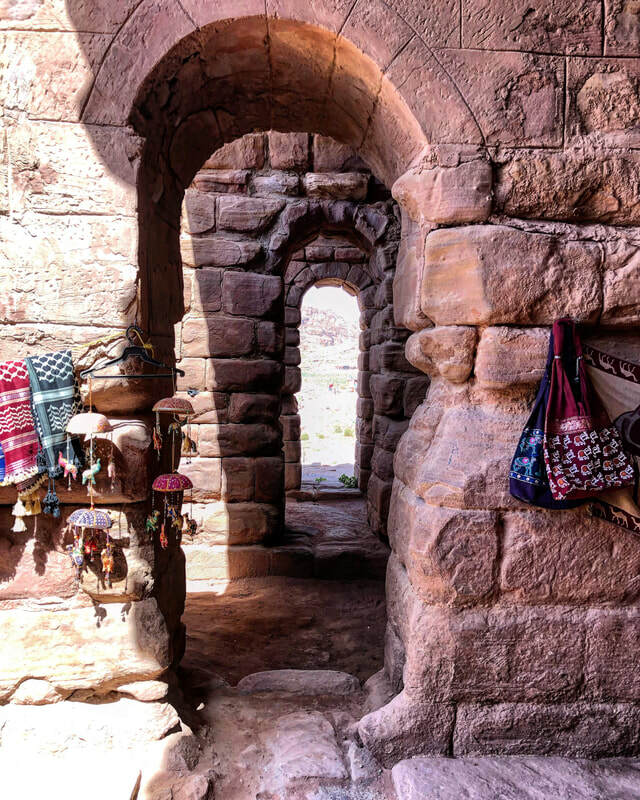 Although there are shops located near the gate which have an abundant selection of trinkets, you will come across many more. 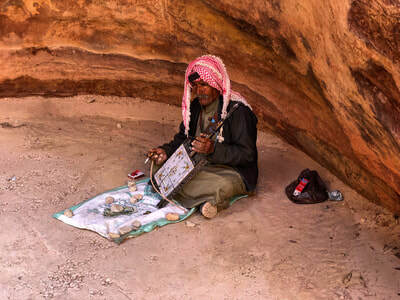 Bedouin style shops are very common throughout the city of Petra and the vendors are very competitive with each other, meaning, everything is negotiable and cash is king! Don't settle for the tourist price just because you are a tourist. 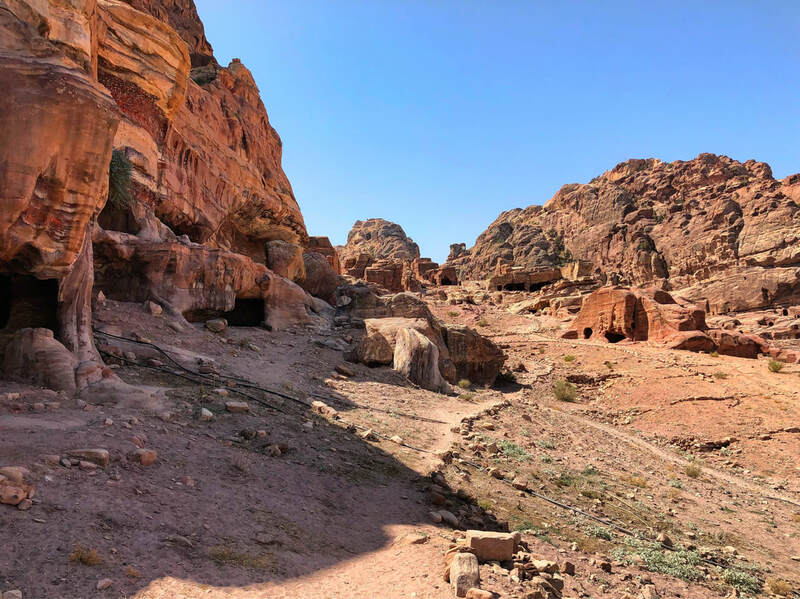 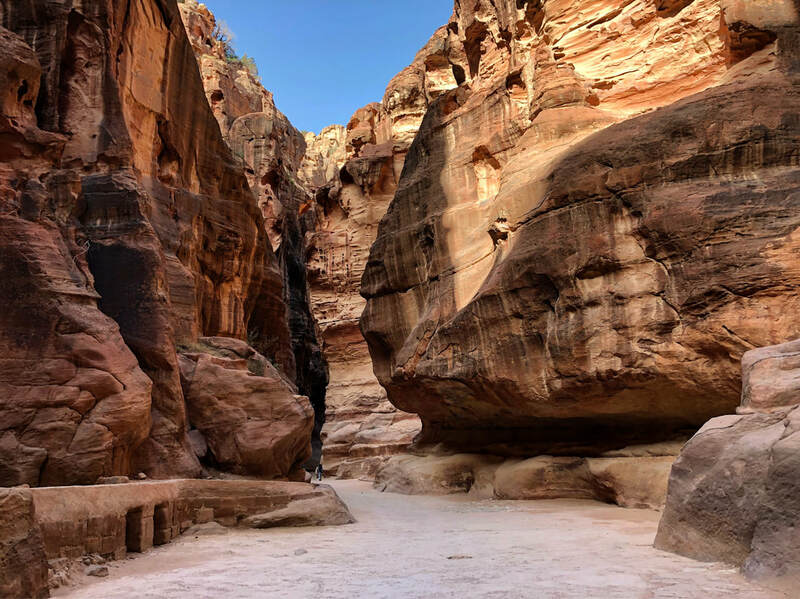 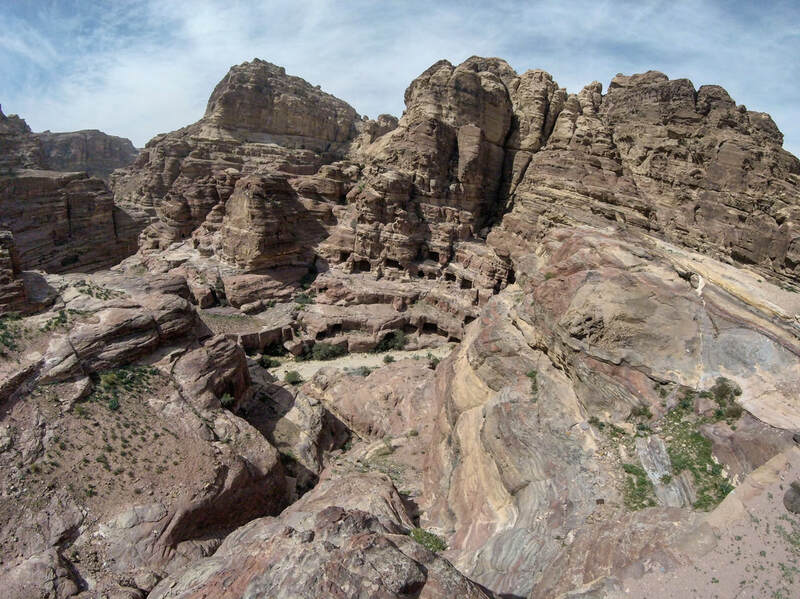 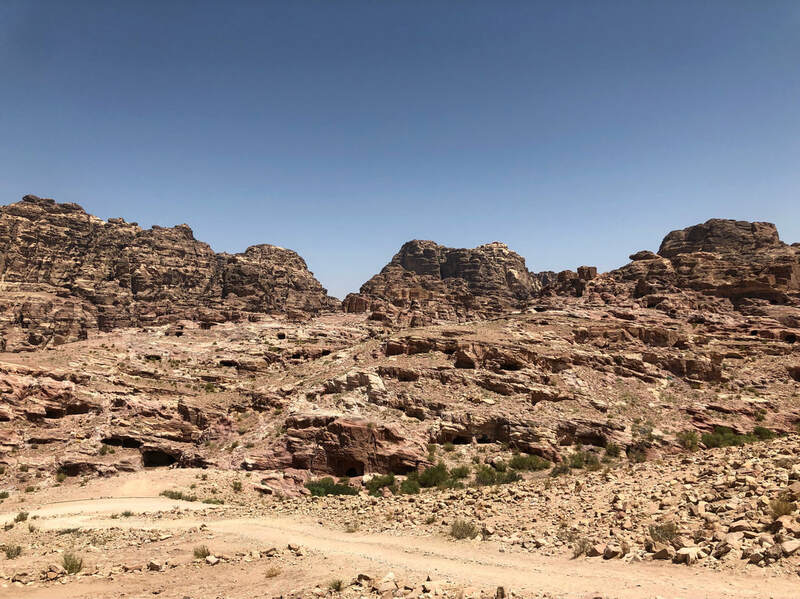 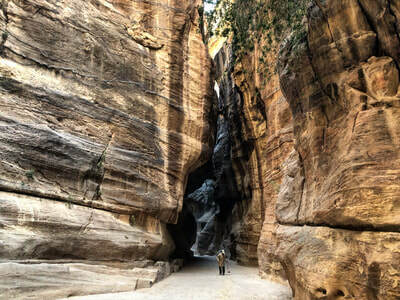 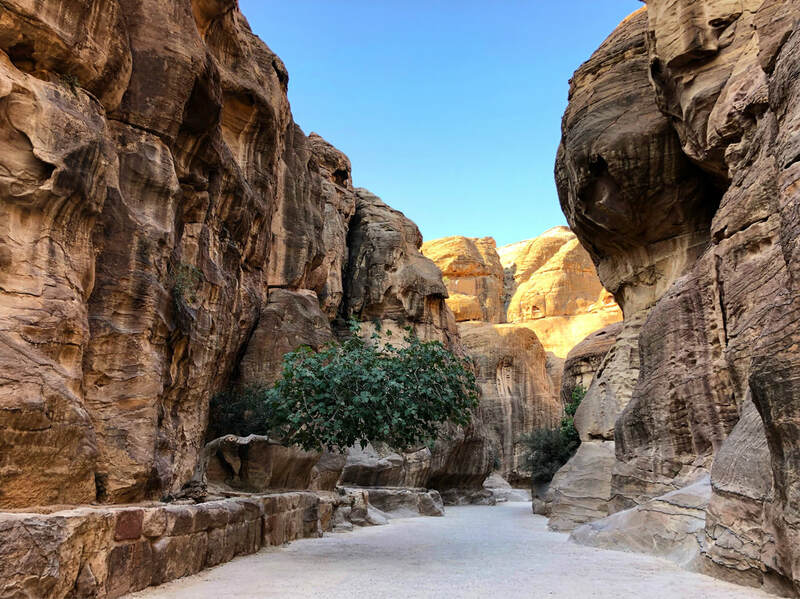 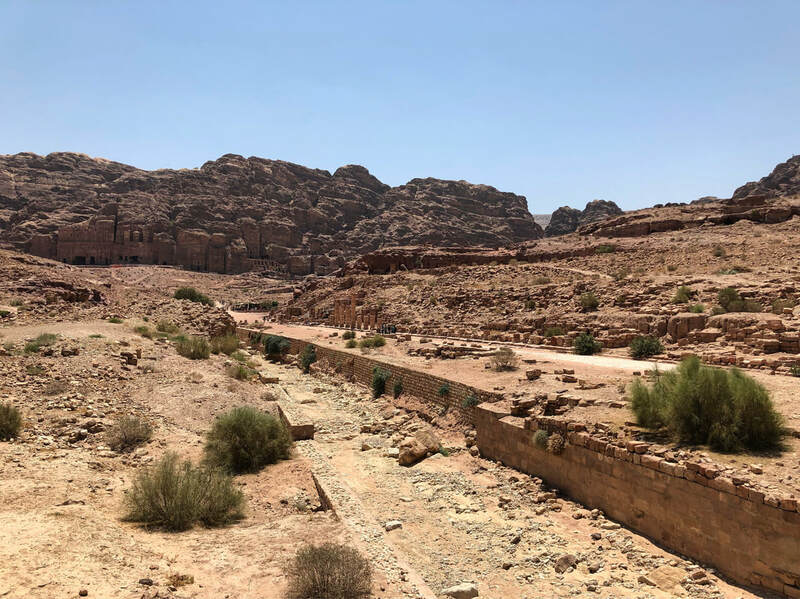 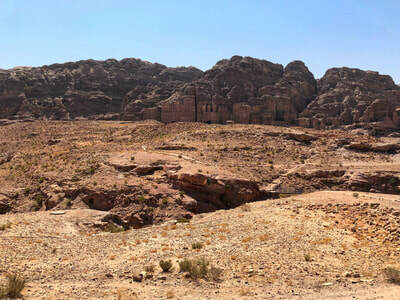 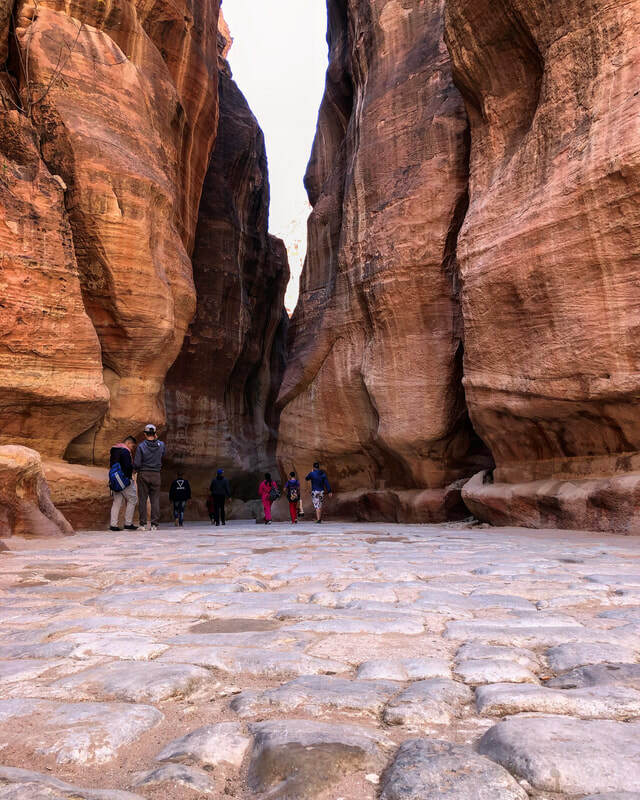 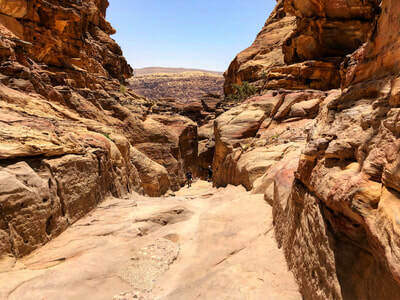 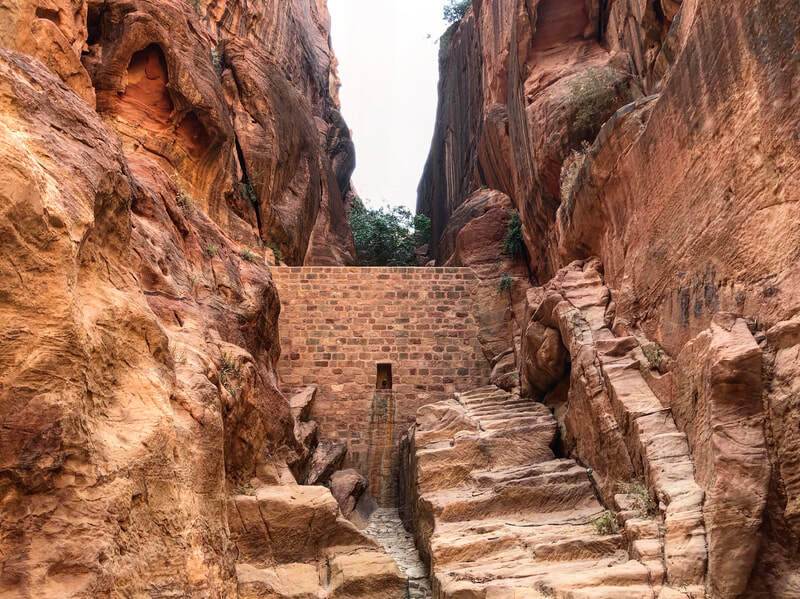 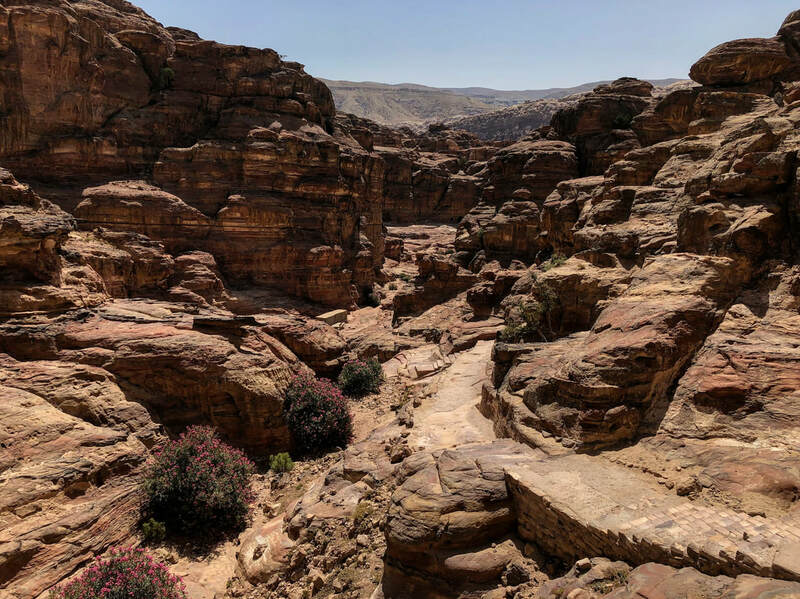 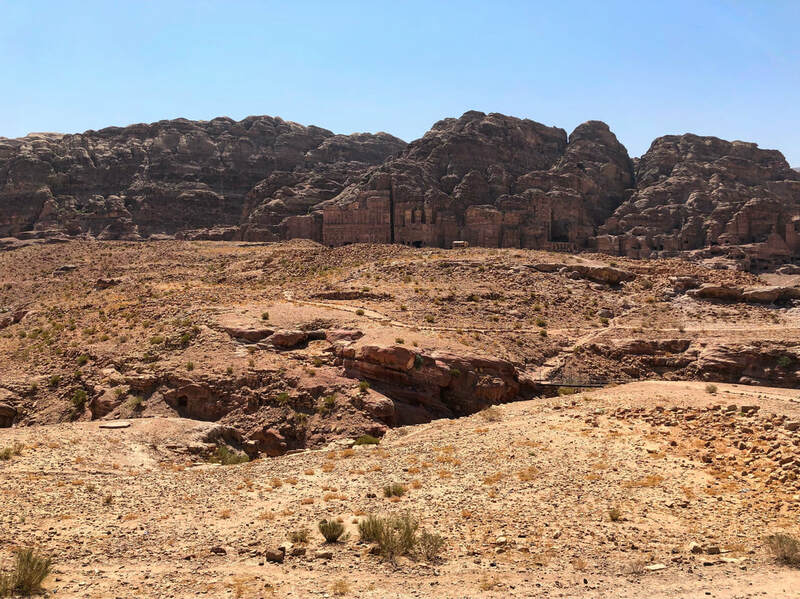 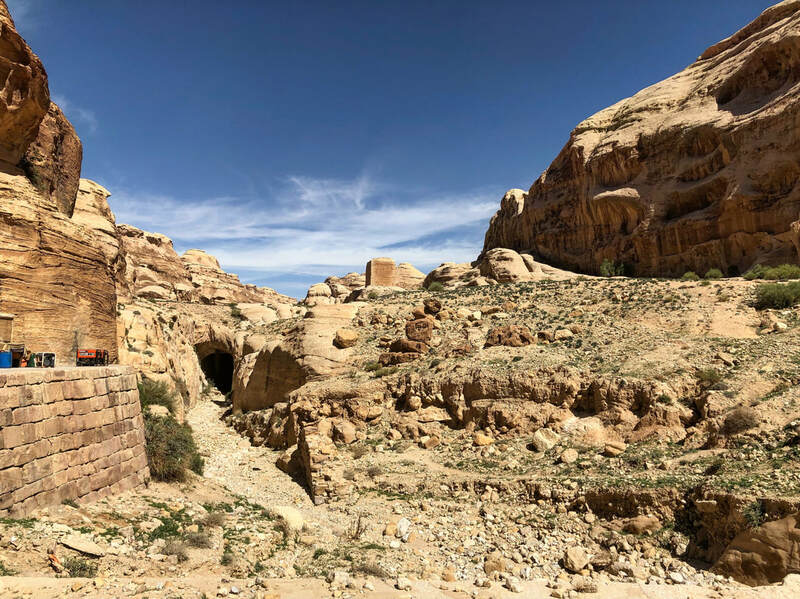 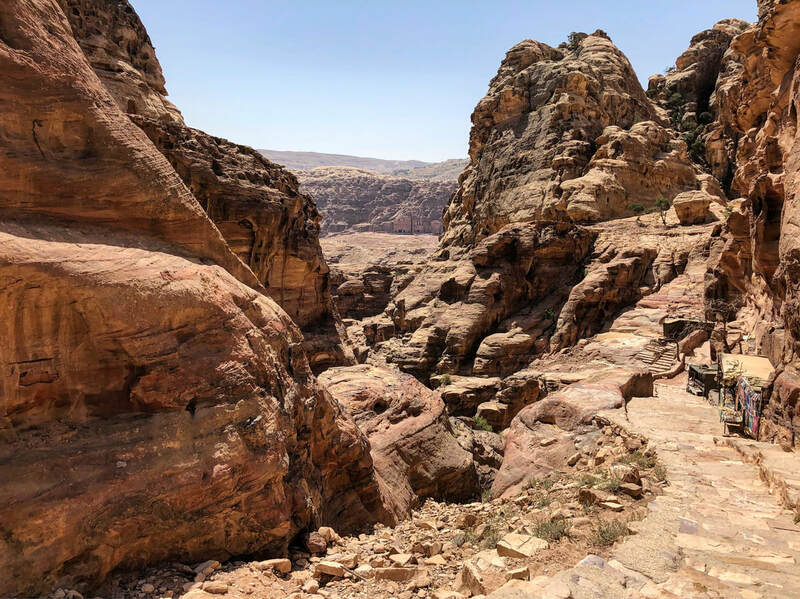 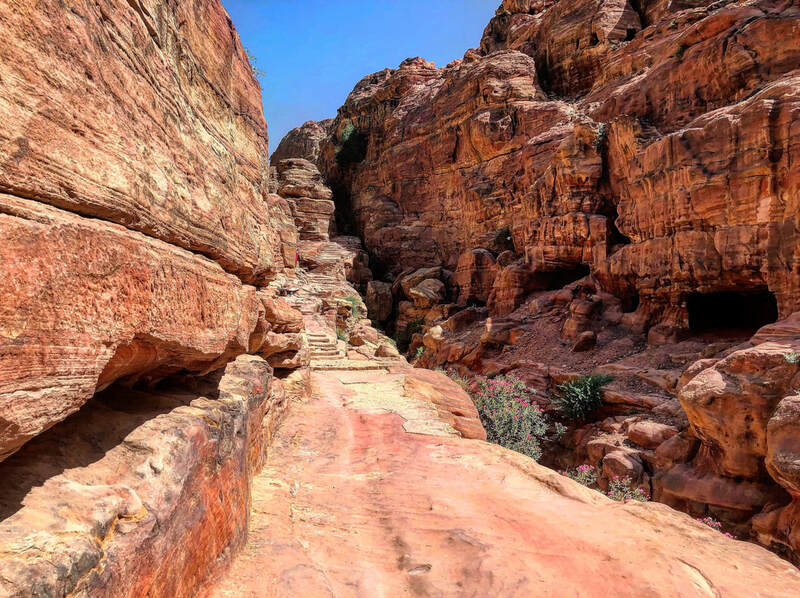 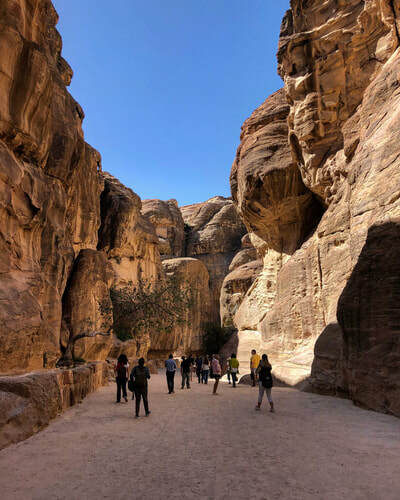 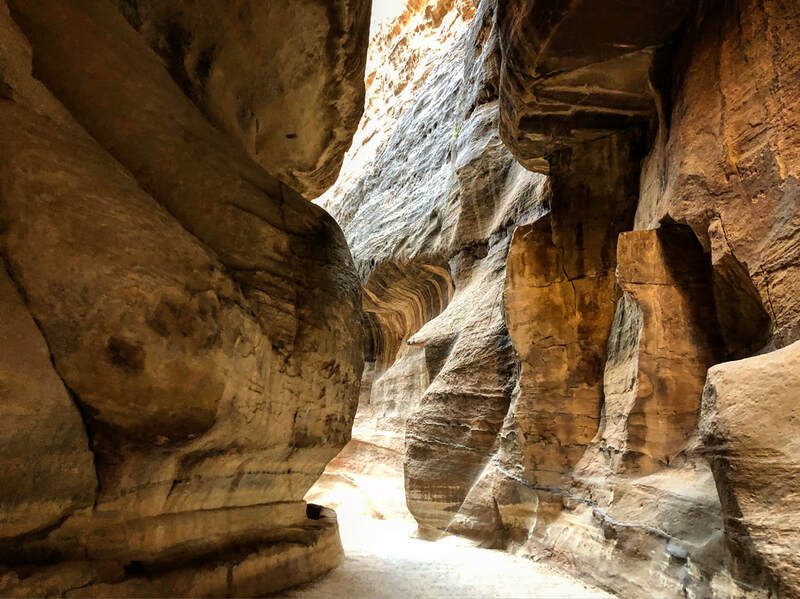 Although there are many paths, trails, and roads in the Petra area, there is one main road which starts at the Treasury and ends a little past the Monastery. 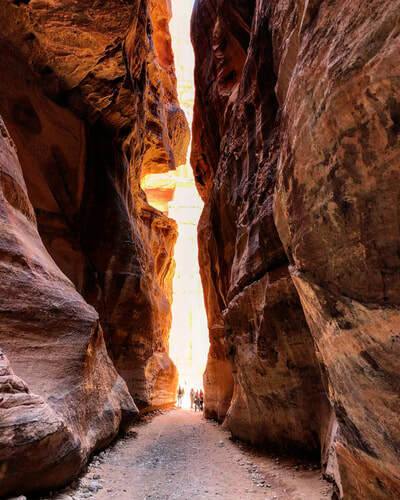 At that point, you will turn around and take the same way back. 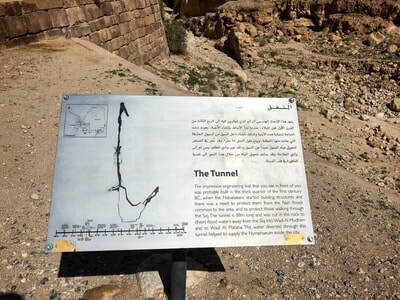 This article will cover this route (one way). Having said that, if you have the time and feel adventurous, I highly recommend wandering off into the hills. 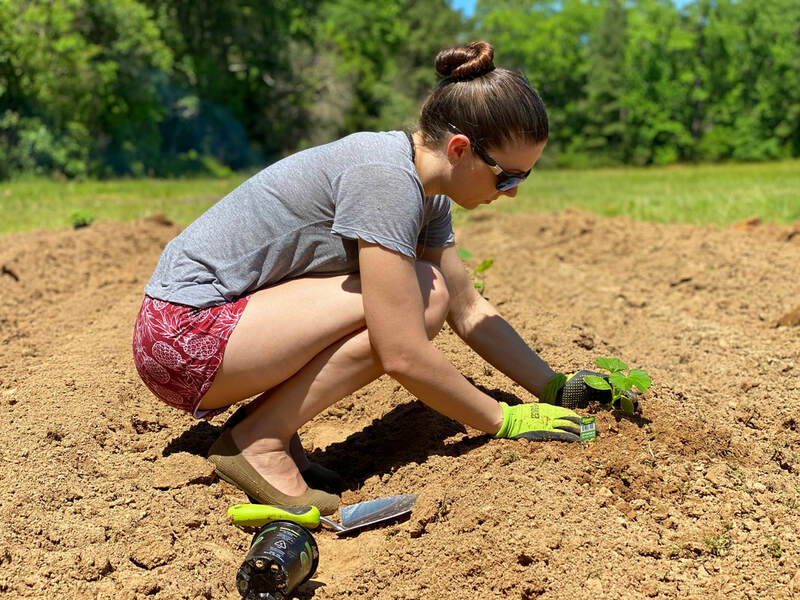 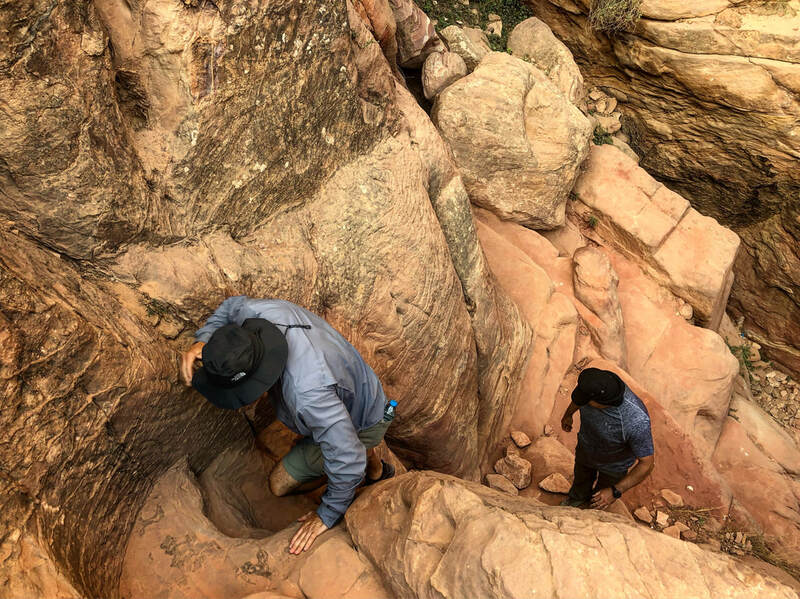 If you only have a few hours or a day, you might want to follow the herd of people down the main road and make small adjustments to some of the larger sites. 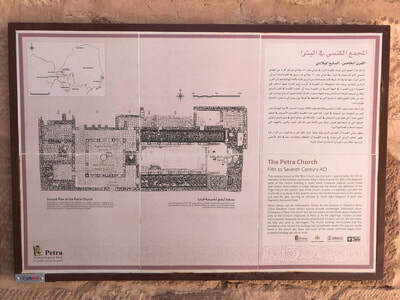 The picture gallery towards the bottom of this page flows from gates to Monastery as well, but with a few deviations not covered in the article. Back to Petra! 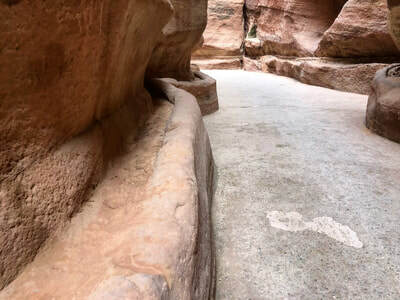 As you start your journey down the walking path, you will begin seeing carvings on the left and right, along with trails leading into the hillside. 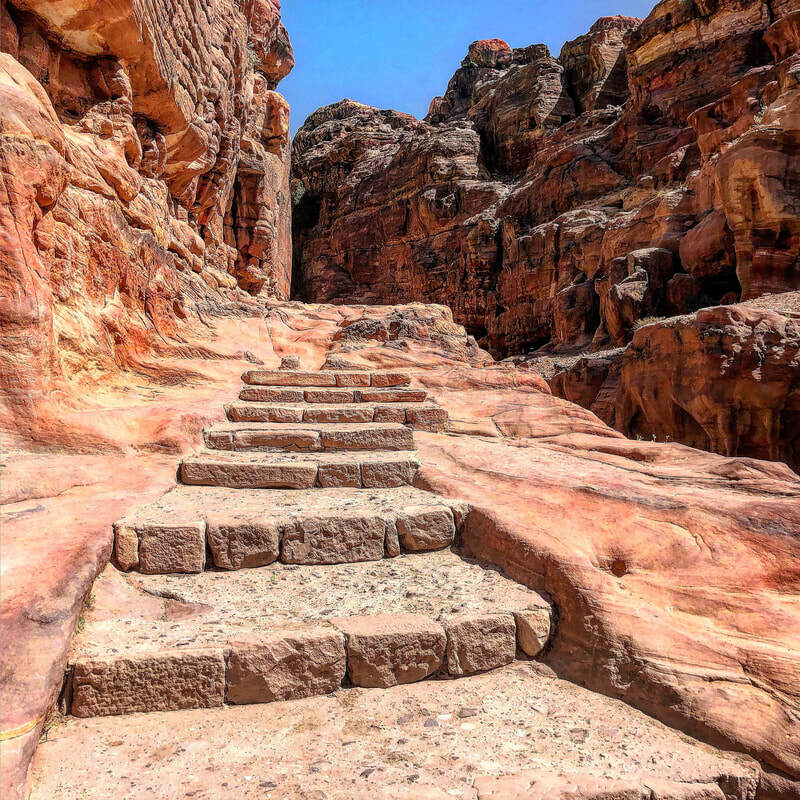 As impressive as those are, that is just the very beginning of your adventure. 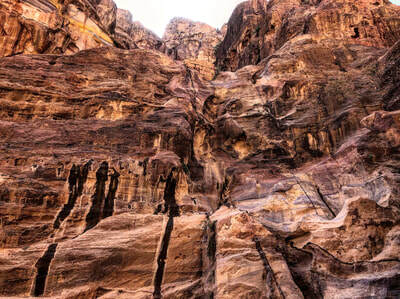 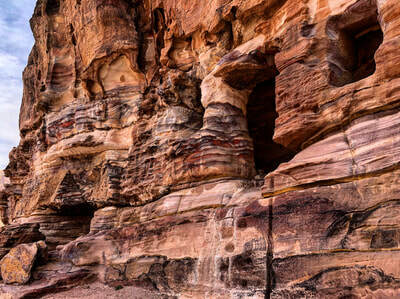 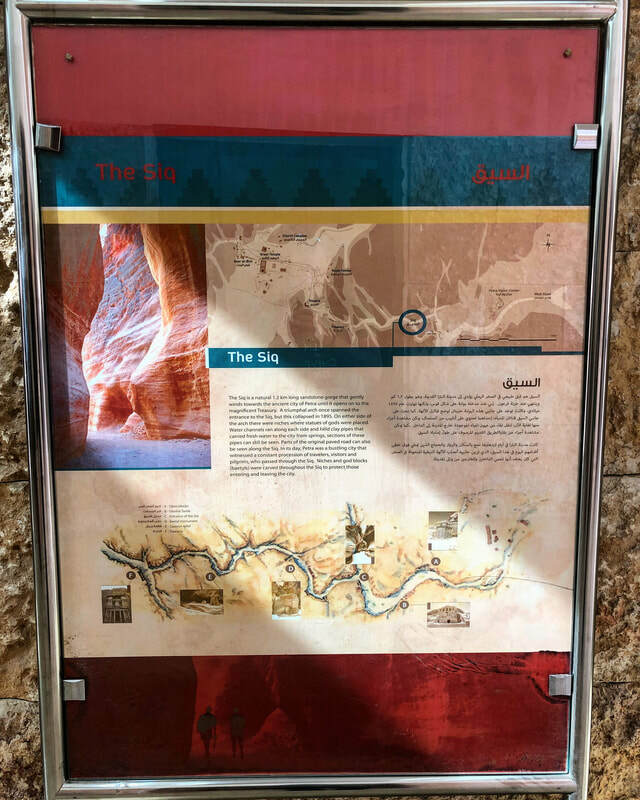 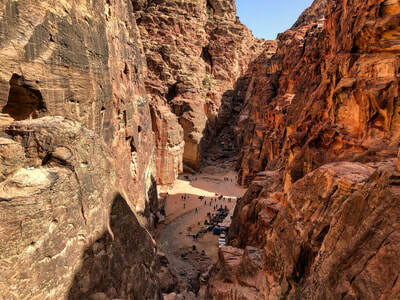 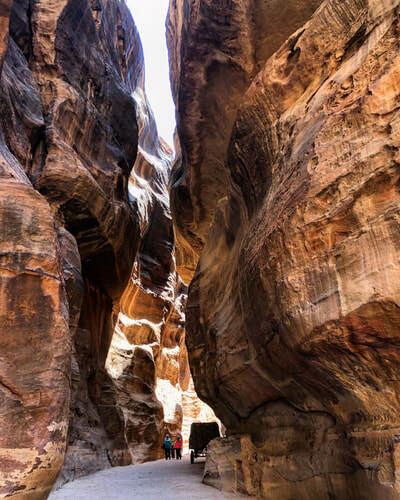 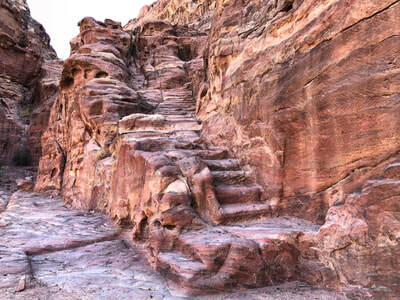 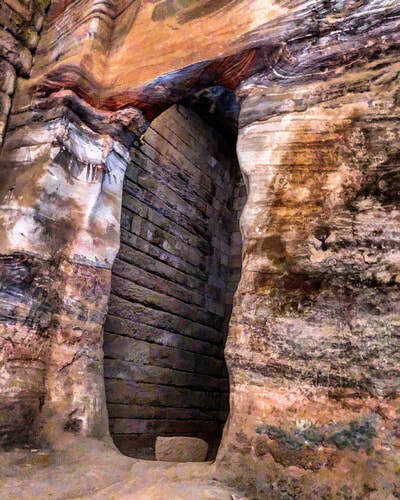 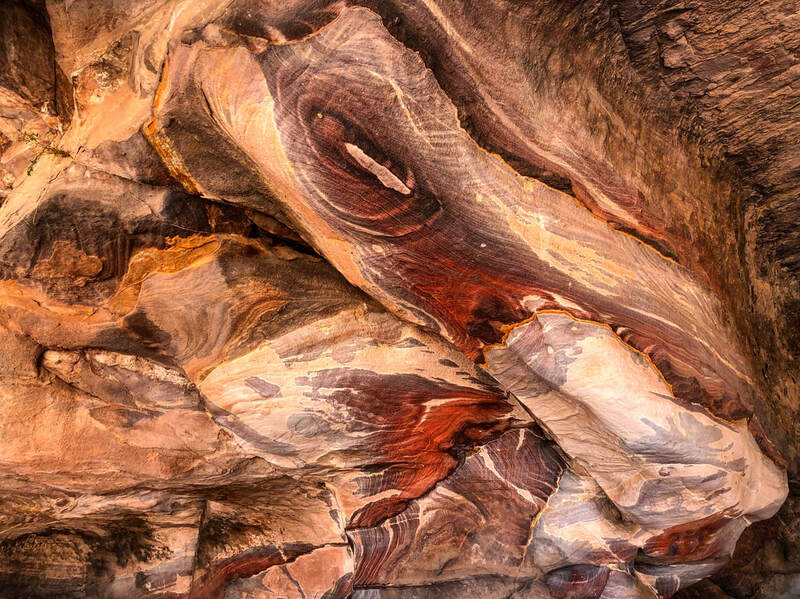 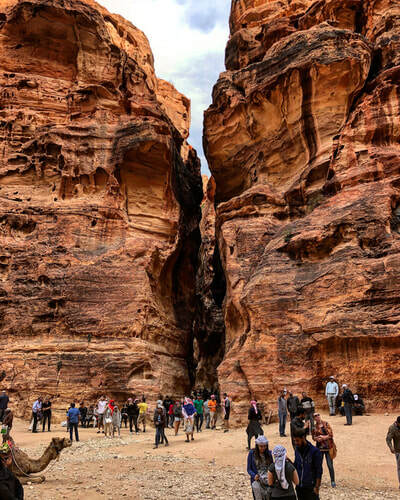 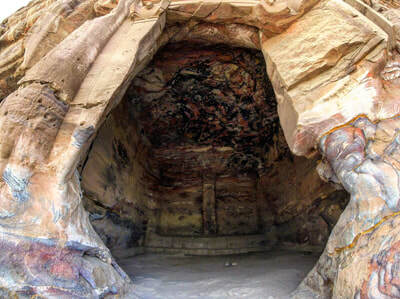 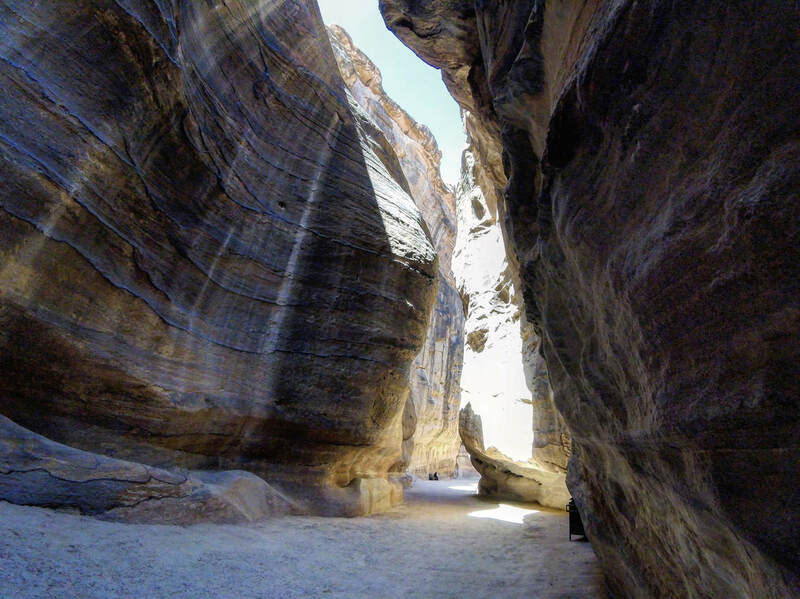 You will continue down until you reach the main entrance into the city which is known as the "Siq". 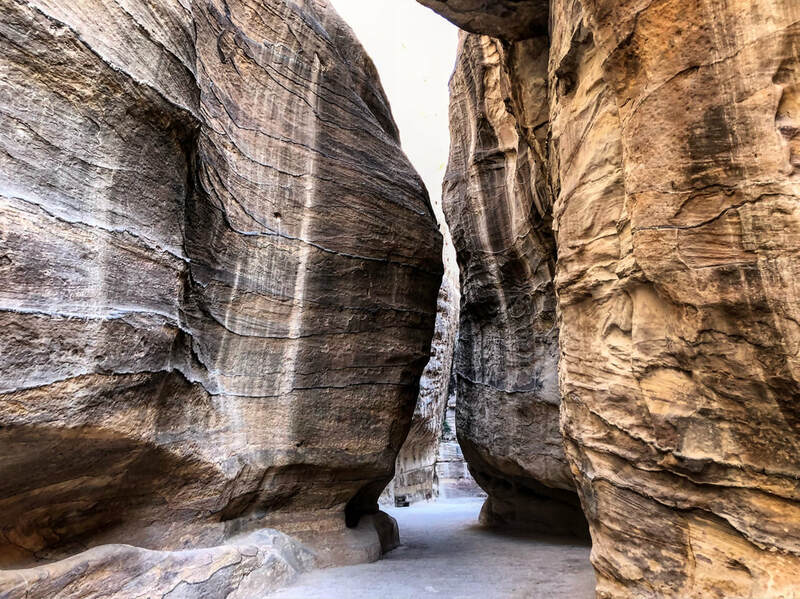 The Siq, which translates into "the shaft" is a narrow walkway/roadway through the rocks which spans approximately 3/4 of a mile. 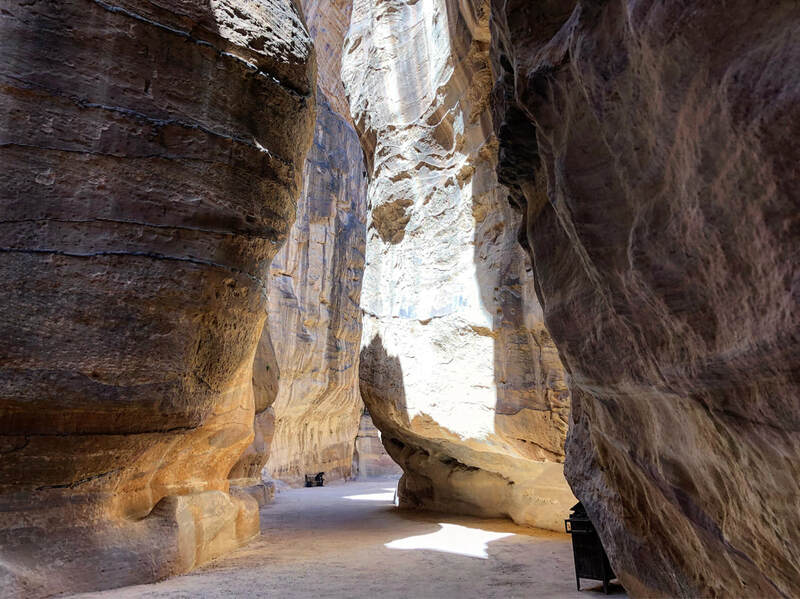 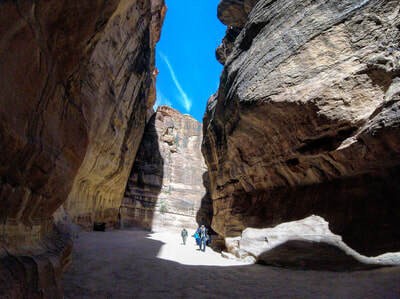 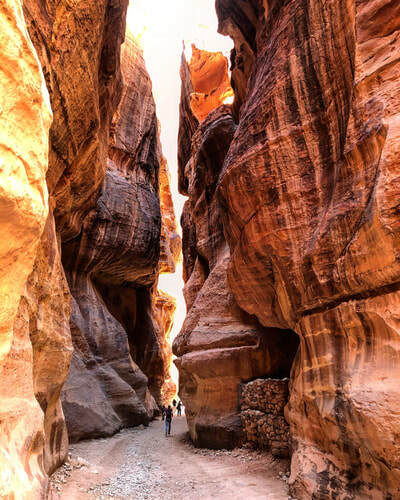 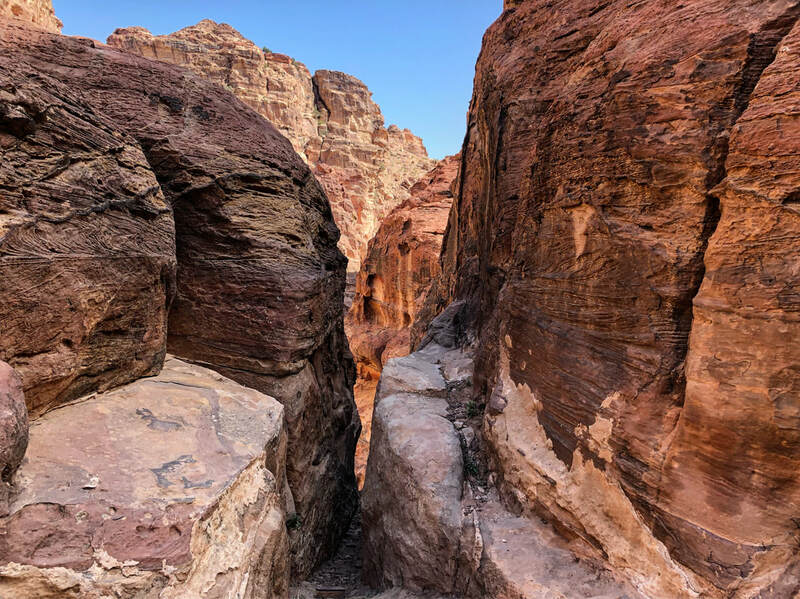 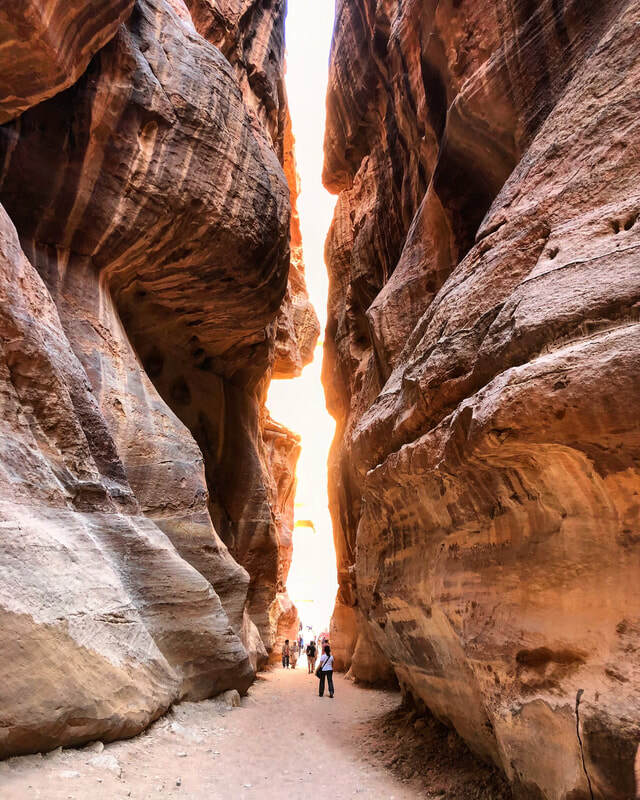 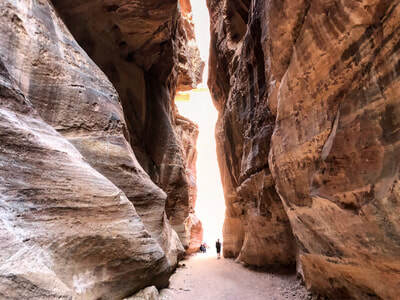 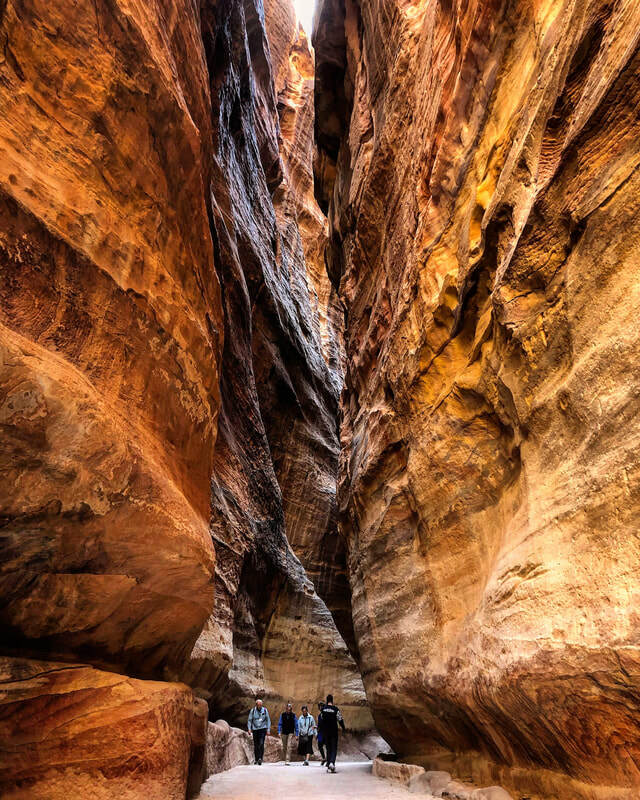 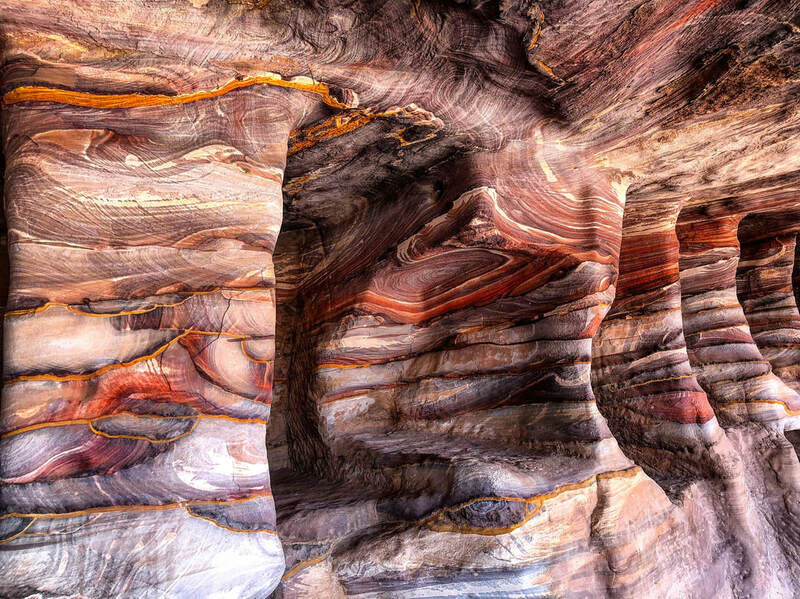 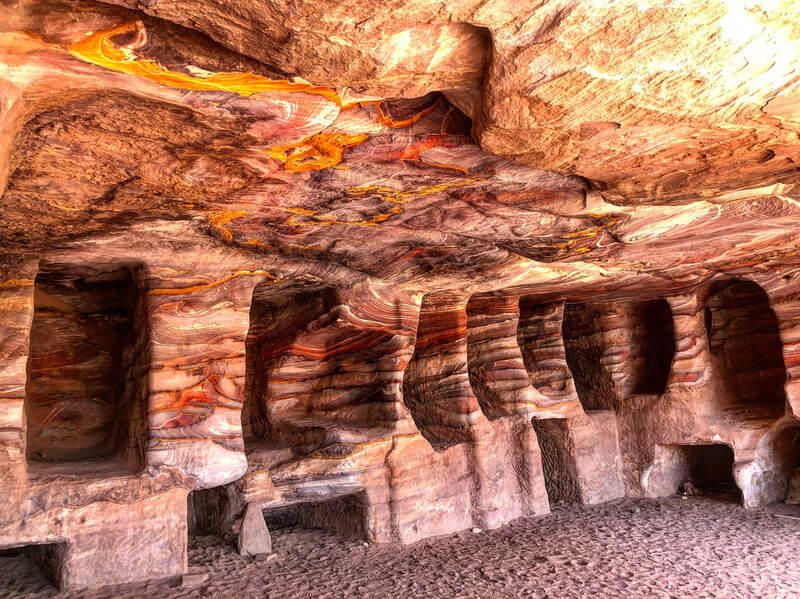 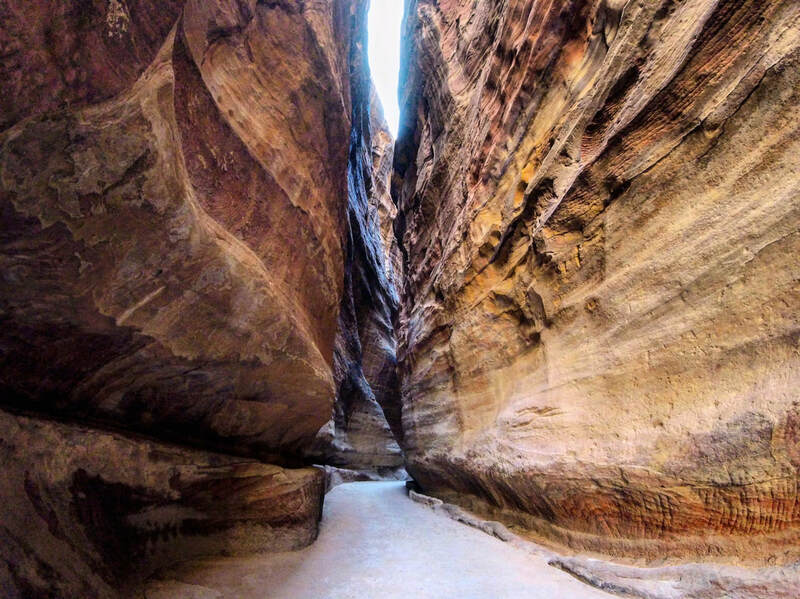 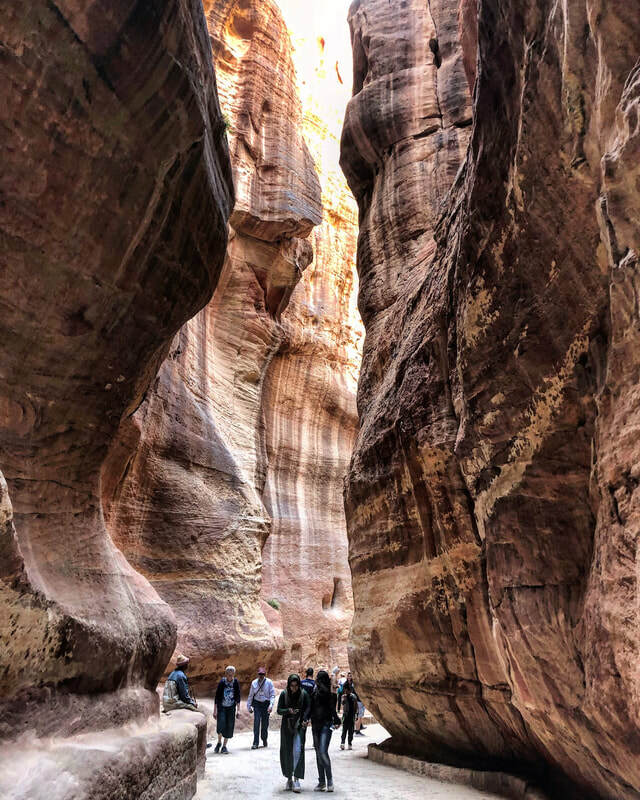 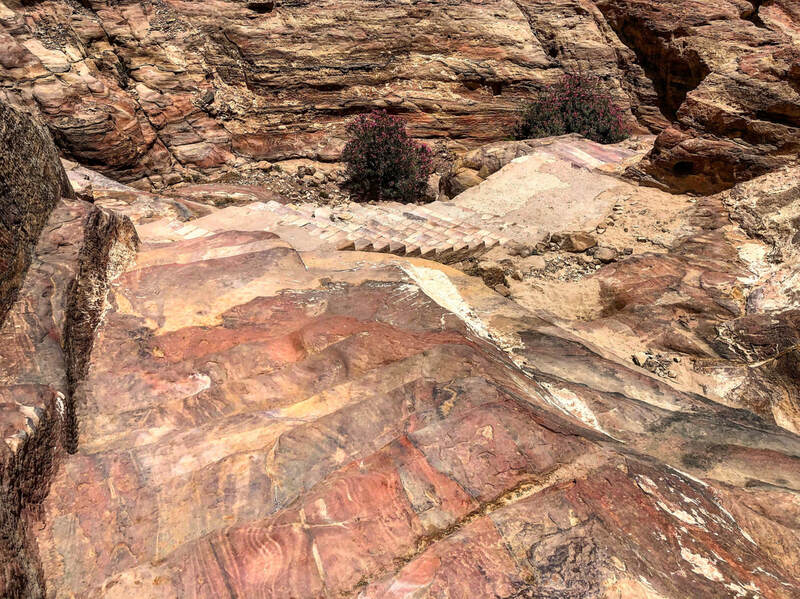 In some places of the Siq, the pathway is only about 10 feet (3 meters) wide and stands more than 300 feet (91 meters) tall. 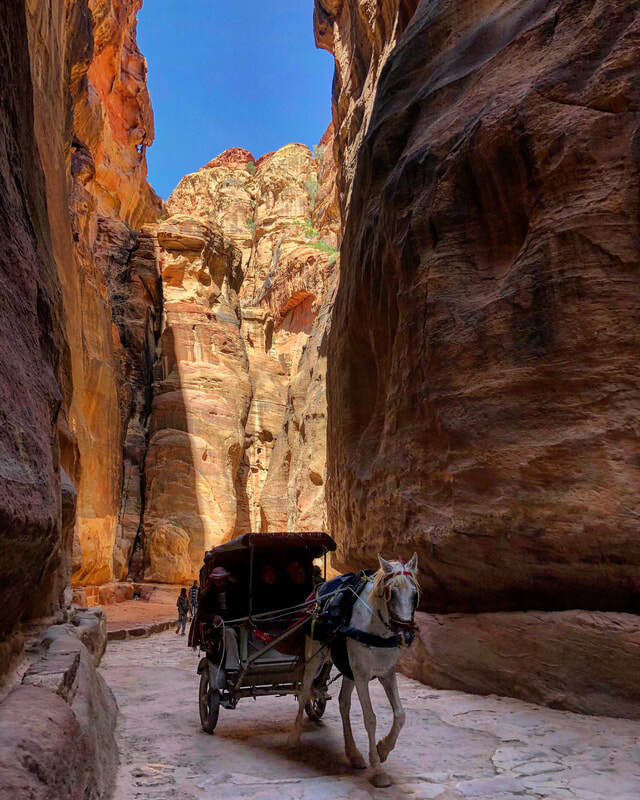 The Siq has the ability to make anything and anyone feel small, to include the horse and donkey carts moving up and down the roadway. As you walk through, you can see channels carved into the natural stone walls which are believed to be part of the aqueduct system where they brought water into the city using pipes. 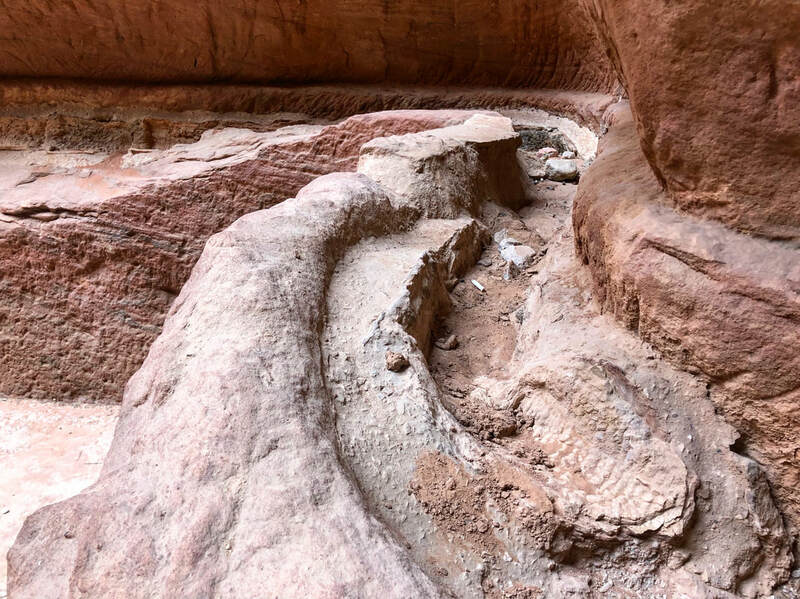 If you look closely in a few areas, you can see remnants of pottery embedded into the channels along with stone covers protecting it. 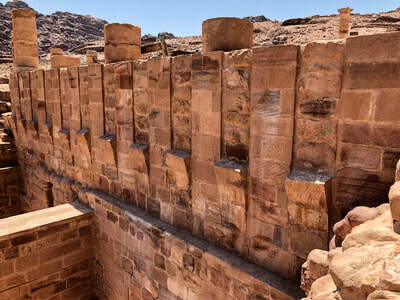 Continuing down you will occasionally see stone-block walls in key locations which are believed to be part of the dam system. Approaching the end, you will see sunlight start flooding into the Siq from a large opening in front of you. 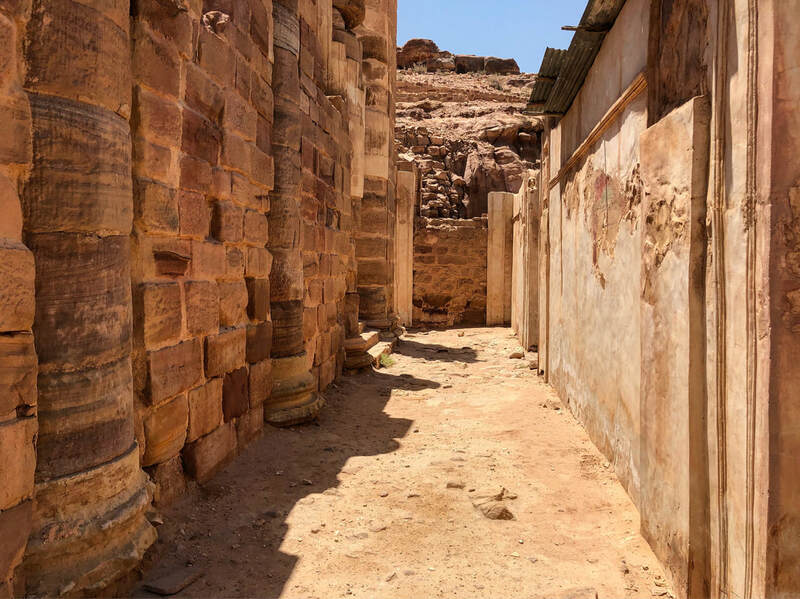 As you continue to walk forward, you will catch glimpses of a large building. 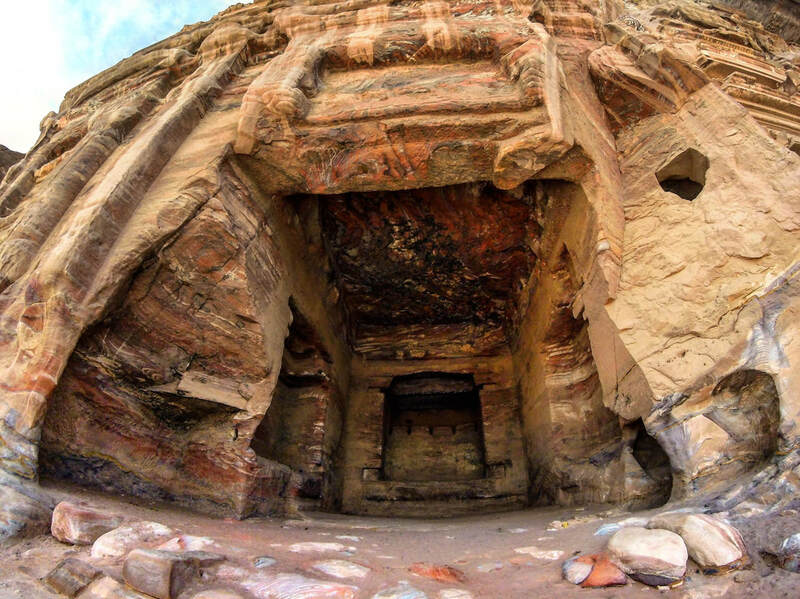 Once you emerge from the shadows within the Siq everything opens up and you are able to fully see The Treasury in all its glory. I wish someone told me what I am about to tell you. 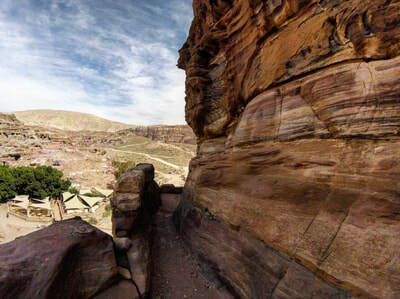 You only ever experience this unique view for the first time once, so enjoy the moment, take it all in, and don't rush it. 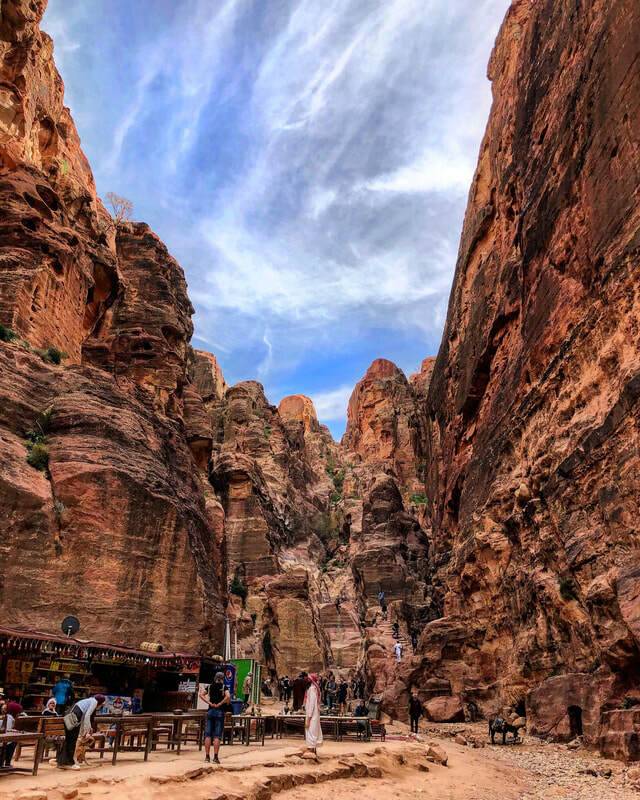 When you step out from the narrow void and experience the sites, sounds, culture, smells, and acoustics; it feels like you went back to another era and the Siq was your time machine. 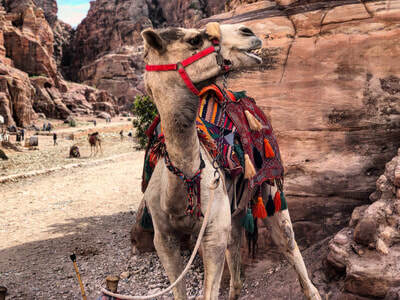 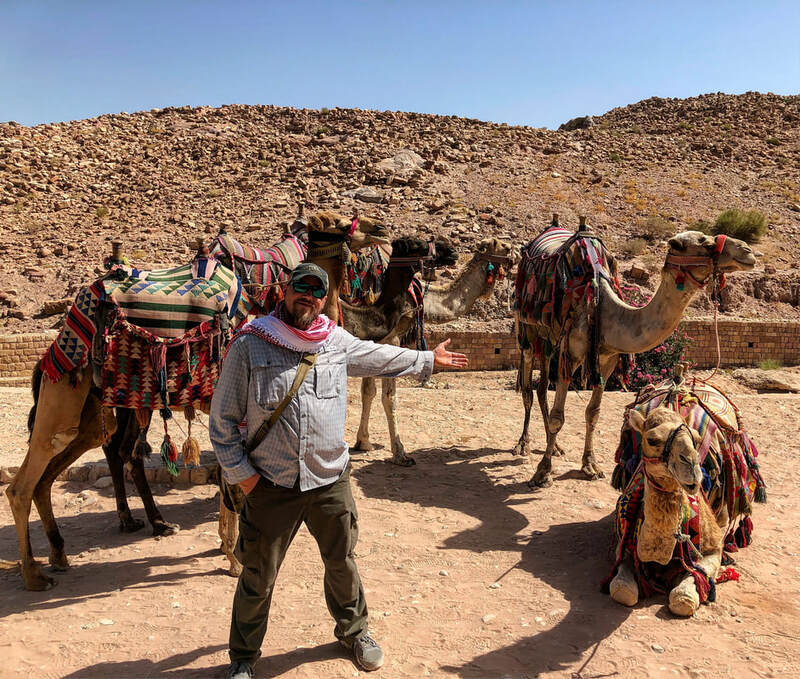 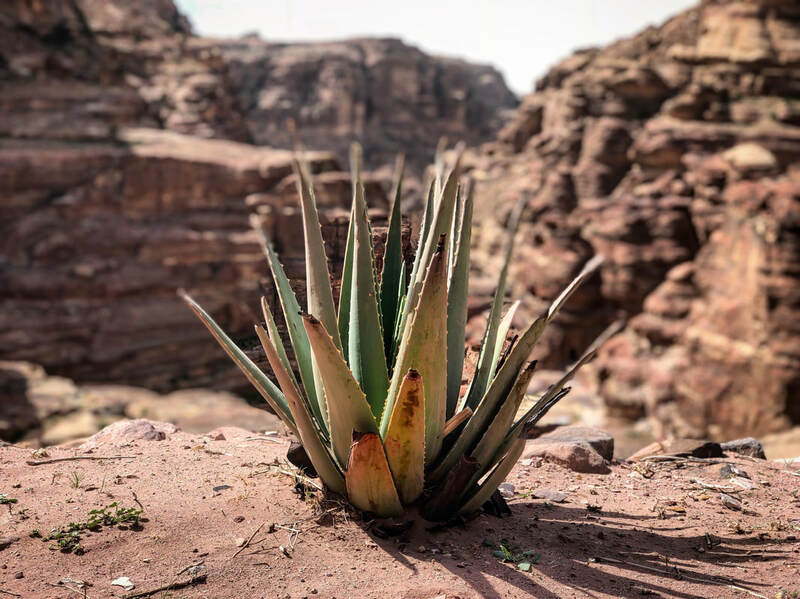 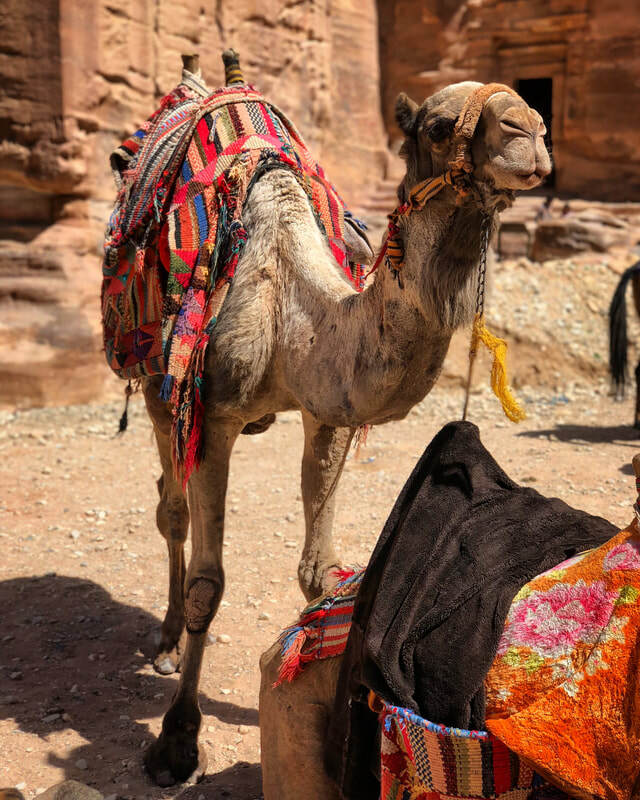 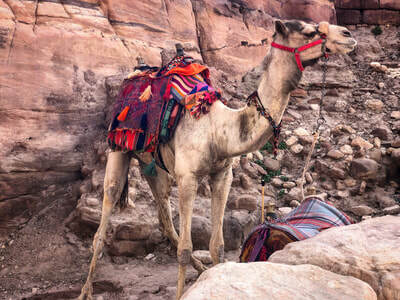 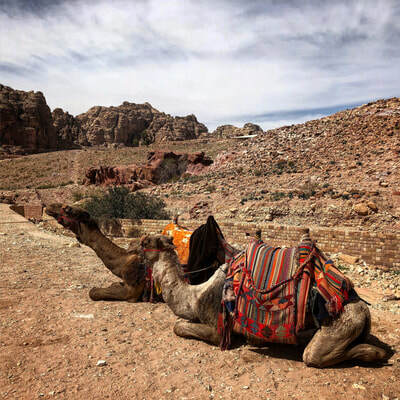 Although you may have encountered Bedouins or horse and carts already at this point, this is where the Petra experience really begins. 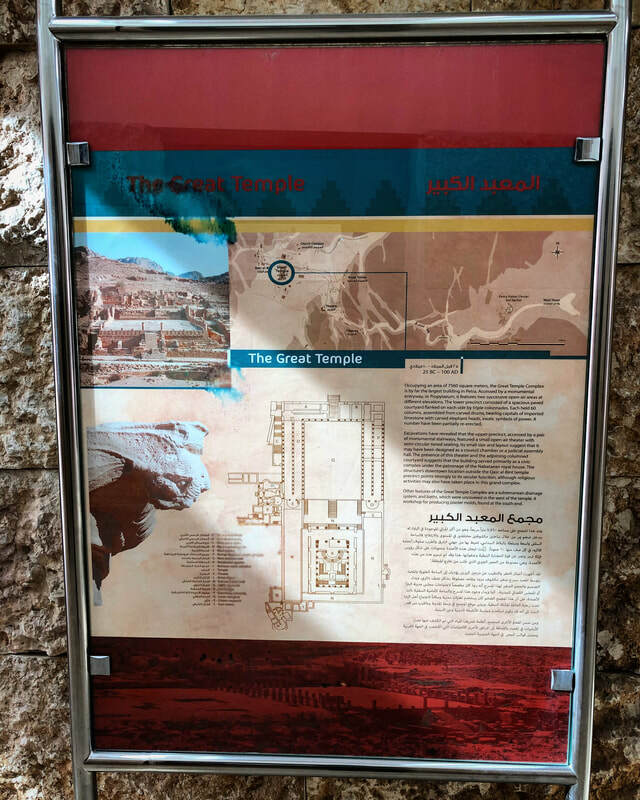 As you move towards The Treasury, you will have the opportunity to ride a camel, buy old coins, pick up some jewelry, or line up a tour guide. 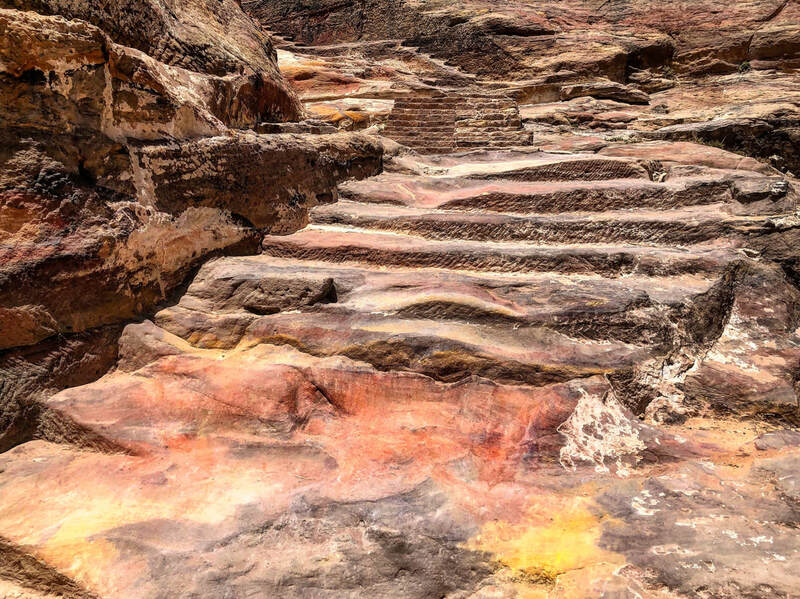 The opportunities to make these kinds of deals will continue throughout your journey, so no need committing to anything yet. 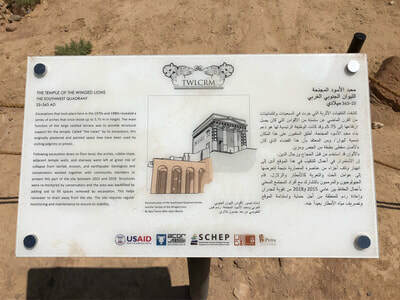 Al-Khazneh (The Treasury), which stands approximately 120 feet (37 meters) tall and 75 feet (23 meters) wide, is actually believed to be a temple or tomb. Although you have freedom of movement in and around most structures in the city, the Treasury is not one of them. 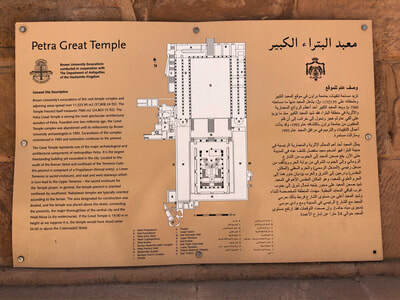 The main entrance is blocked off to the public. At one point in time, this building was thought to hold hidden treasures, hence the appropriate name. 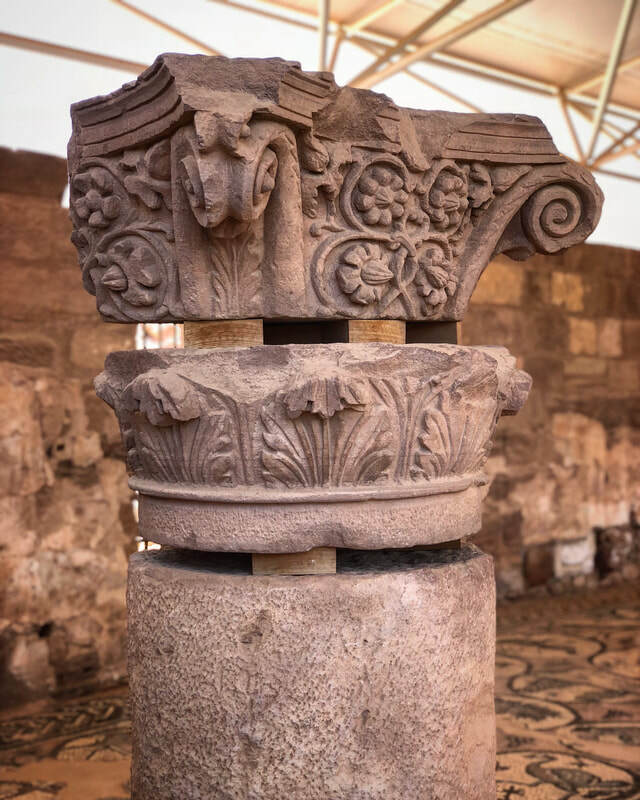 If you look close, you can see small round divots in the stone face starting near the bottom and working all the way up to where the urn is located atop the circular center carving. 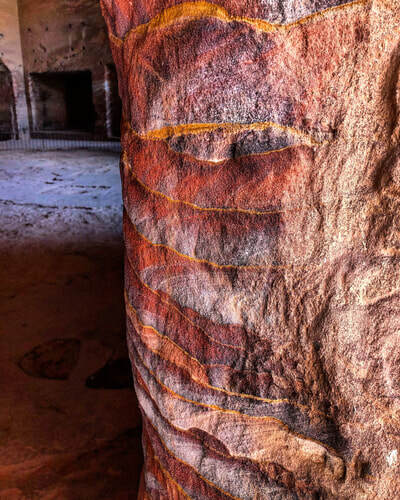 Those markings are bullet impacts from a few hundred years ago where locals attempted to shoot down the urn. They thought it might contain gold but soon learned it was not hollow. 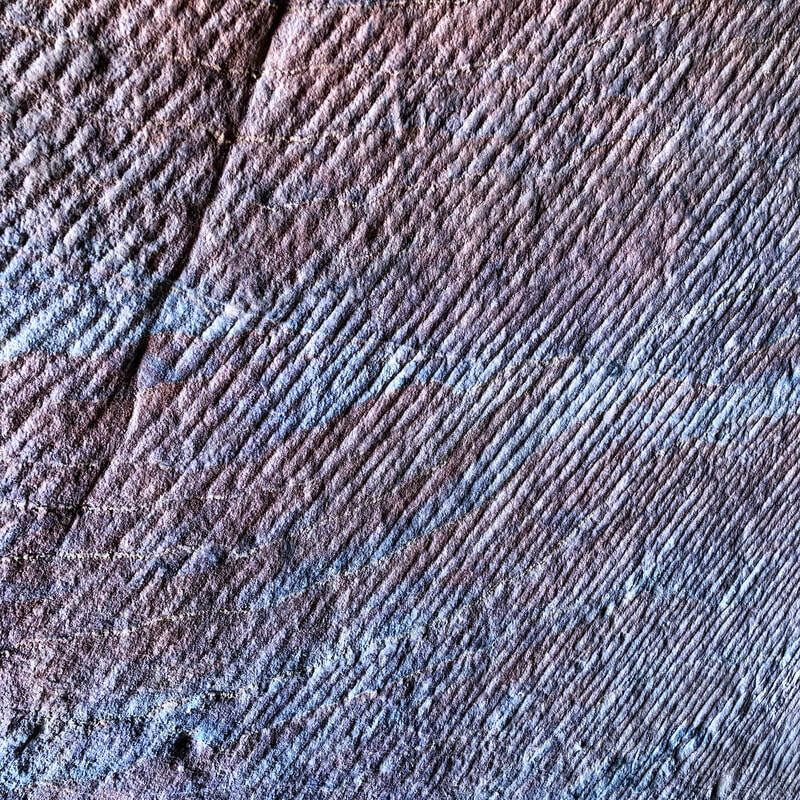 In fact, it is solid stone just like everything else. 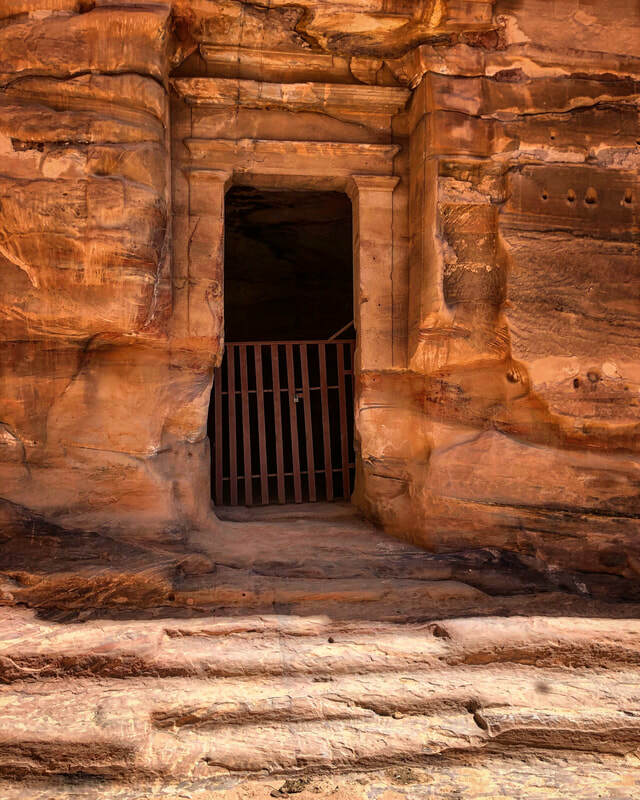 Standing directly in front of the Treasury and looking down through the metal grating in front of the doorway, you will notice a lower level. Looking closer around the area, you can spot additional entrances that are somewhat below the ground you stand on. Depending on who you talk to or what you read, it is believed the original road is buried below sediment (now ground level) deposited there from past floods. 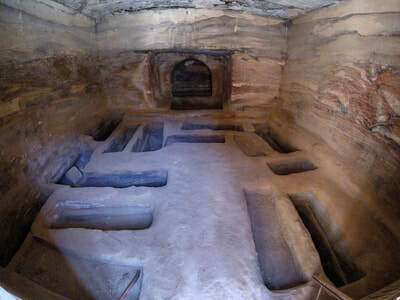 Judging by some of the markings and lower level entrances, one can understand how this is possible. 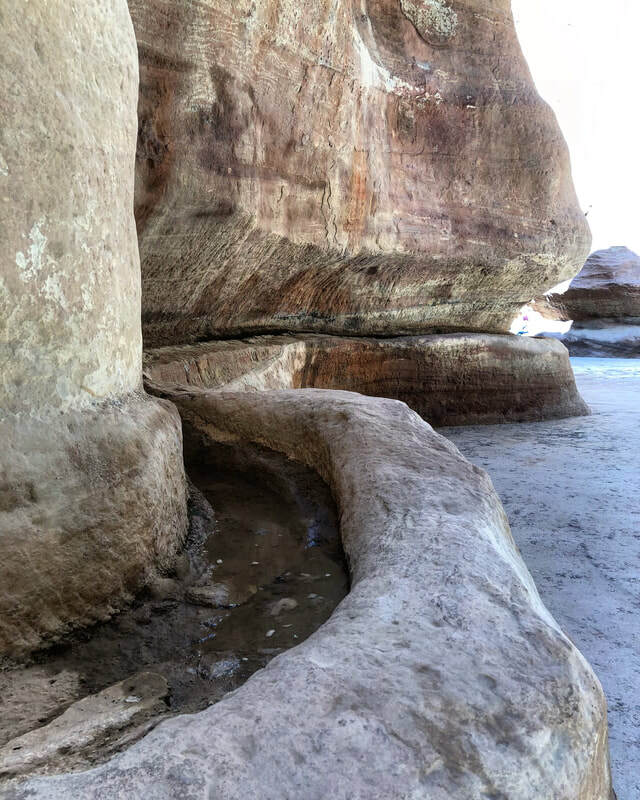 If you have the time or ability, I recommend hiking to the top (Siq side) and viewing The Treasury from that vantage point. Depending on the route you take, this could be a fairly physical climb, but well worth it once you get there. 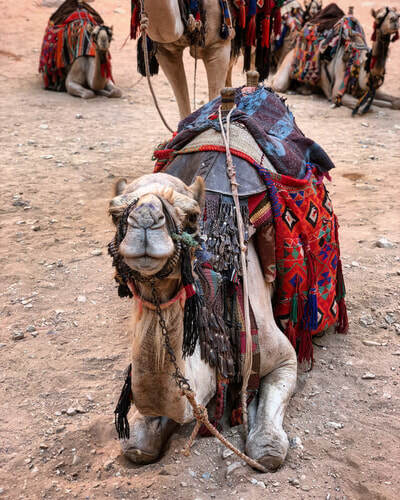 They might even have some warm tea waiting for you topside for just one dinar! 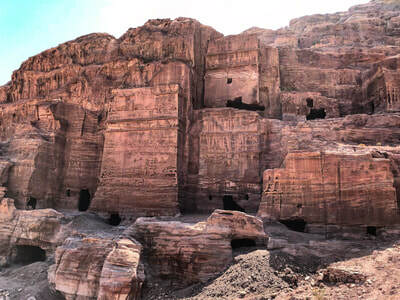 Following the main road deeper into the city you will come across an area known as The Street of Facades, which is an impressive collection of large buildings carved into the cliff and hillsides. From here the landscape opens up and structures are visible in all directions, high and low. 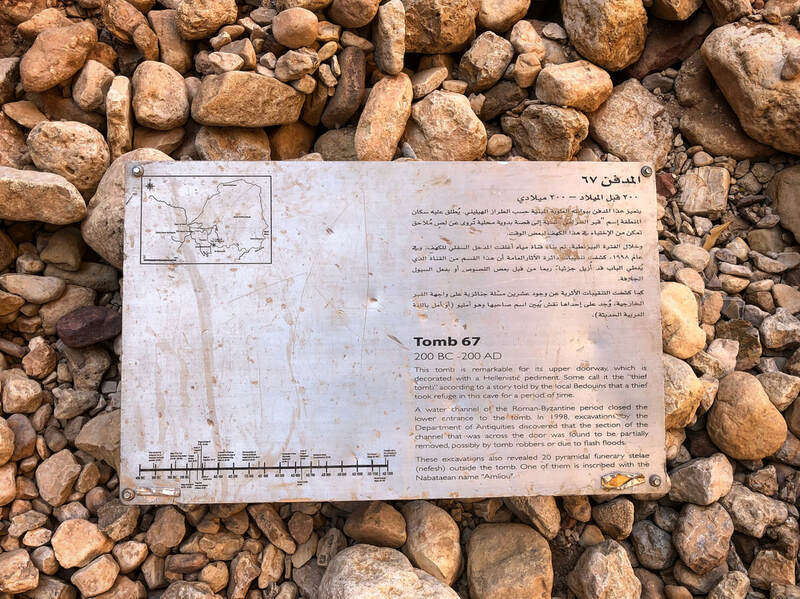 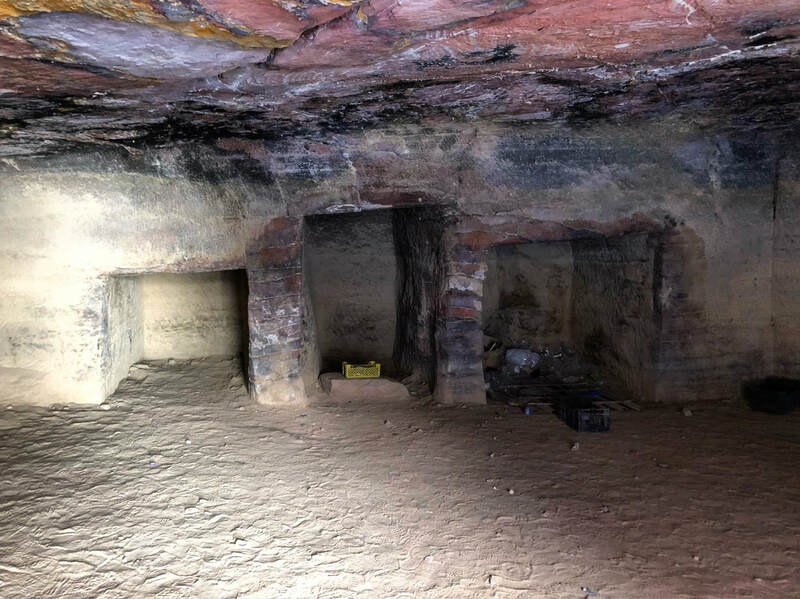 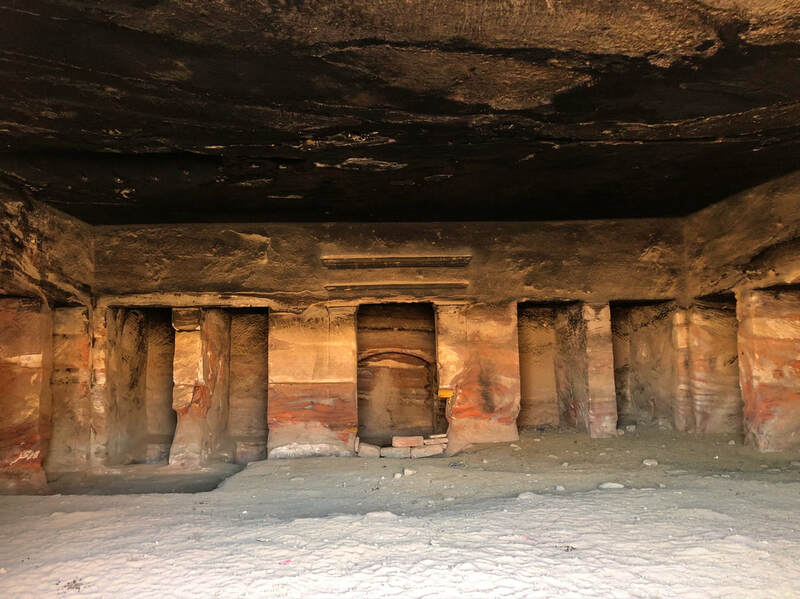 It is believed the majority of what you see in this area are tombs, which seems to be a common assumption across the world when talking about structures or areas whose history and relevance is not well known. 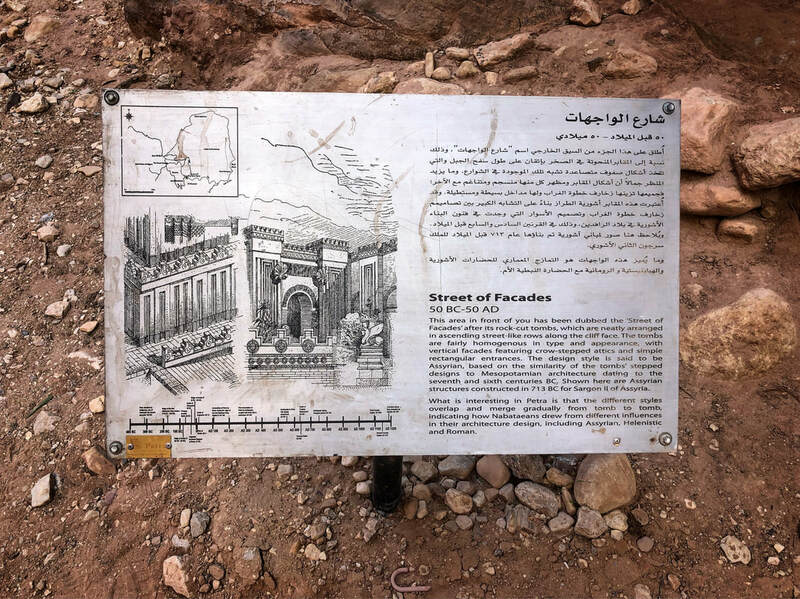 Again, depending on what you read or who you speak with, some people believed this particular area was a bustling part of the city filled mostly with dwellings and storefronts, not just tombs. 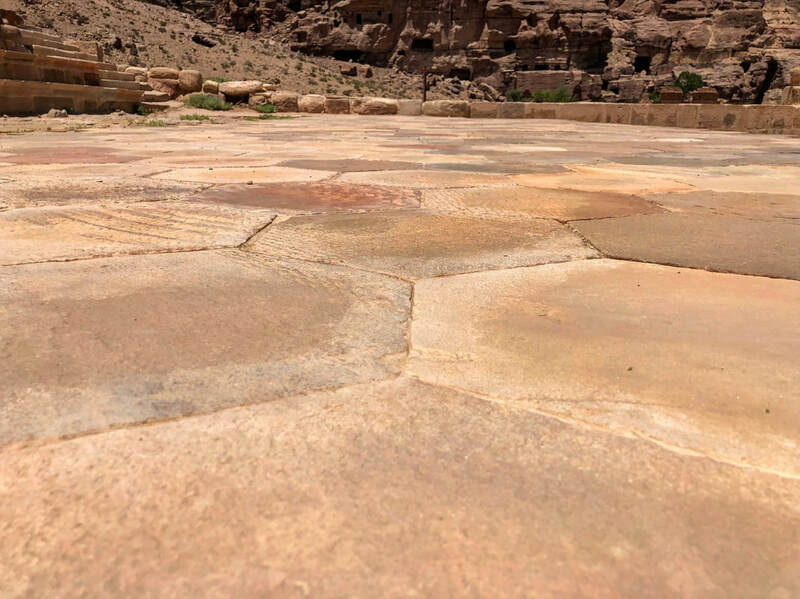 the stone floors, which on average, I would say are approximately 2 feet (less than a meter) deep. 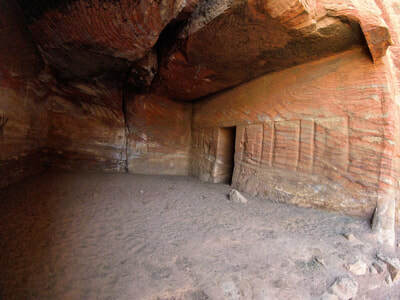 Some of them also have voids in the walls that have been carved out. It is possible these wall openings could have been used to hold a type of shrine to commemorate the dead. Looking at the tops of some of the structures, you can see visible erosion marks similar to melted wax on a candle. 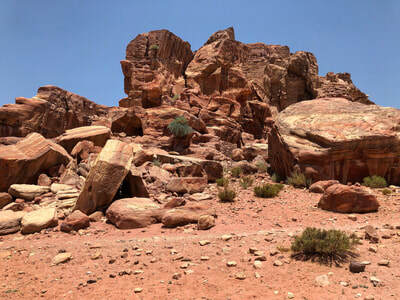 This is noticeable in several areas, but more so here. 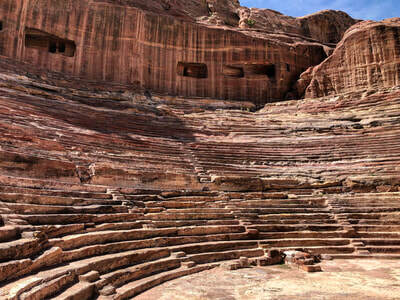 In the same general area, you will come across a massive theater on the left, which is beautifully carved into the stone. 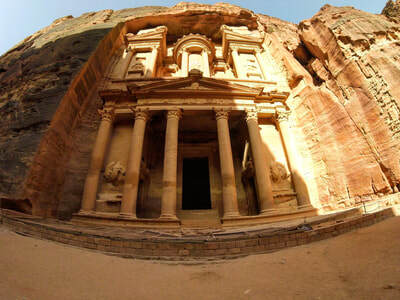 Just like many of the sites located within Petra, it has fallen victim to time and as such, it is severely deteriorated. 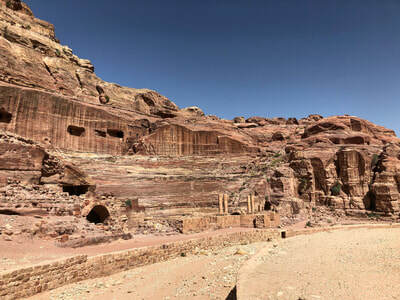 Although the damage is noticeable, it is still easy to imagine what it might have looked like thousands of years ago. 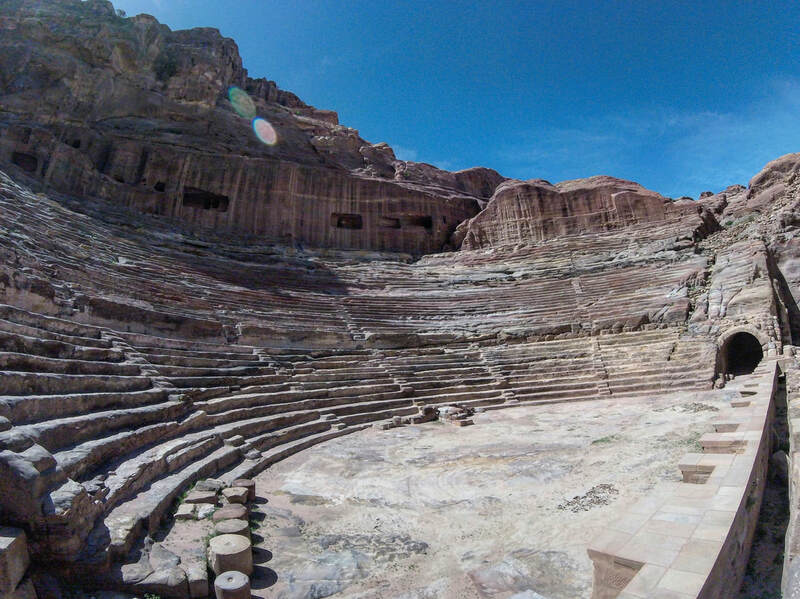 There is some discussion as to who the builders of the theater were. 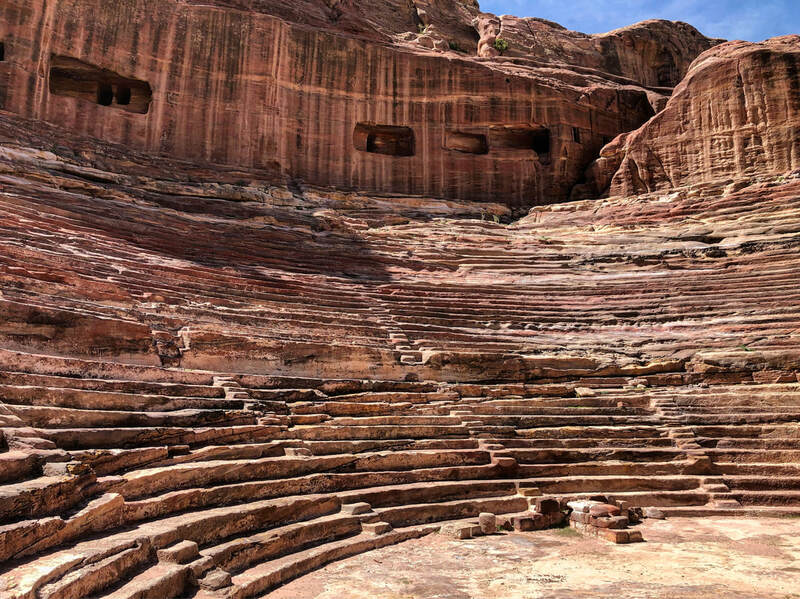 Some say the Romans, some say the Nabataeans. Either way, whoever the original builders were, they had a grand vision and carried it out with detailed precision and engineering on a massive scale. 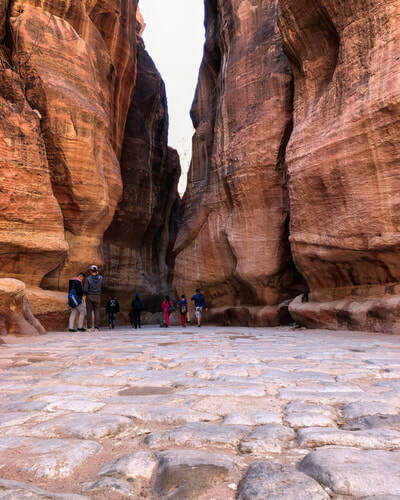 This is one of a few restricted areas within Petra where access into the interior is not allowed. There are gates which physically prevent you from going in, but they still allow you to get close and look inside. ​Ground level views are great, but the truly spectacular views come from high above on the opposite side or even the same side looking directly in. 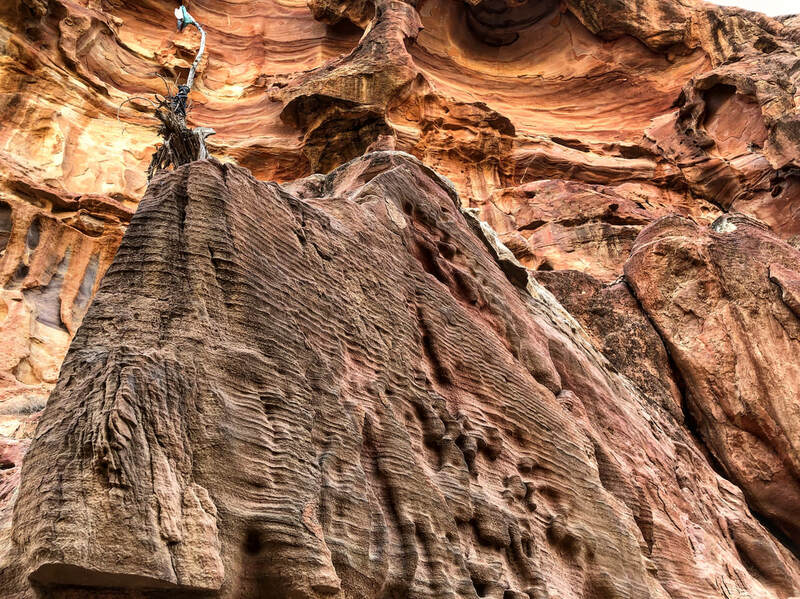 Although there is no charge for the higher views, they definitely do not come free, you earn those through climbing. 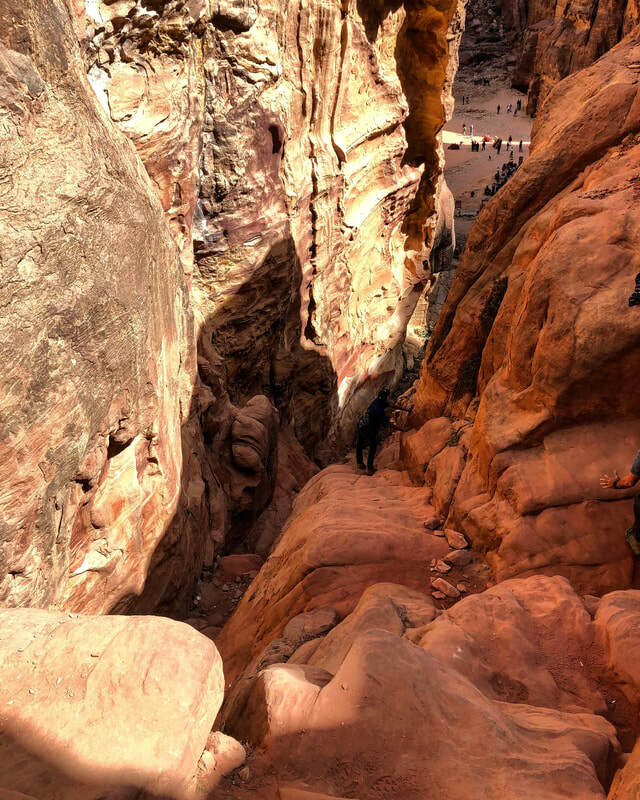 requires you to hike around (to the right as you face the theater), then up and back towards the theater. Depending on which route you take, as you get closer, it can be a little tricky and slightly dangerous due to the ledges and how slick the rocks can become. 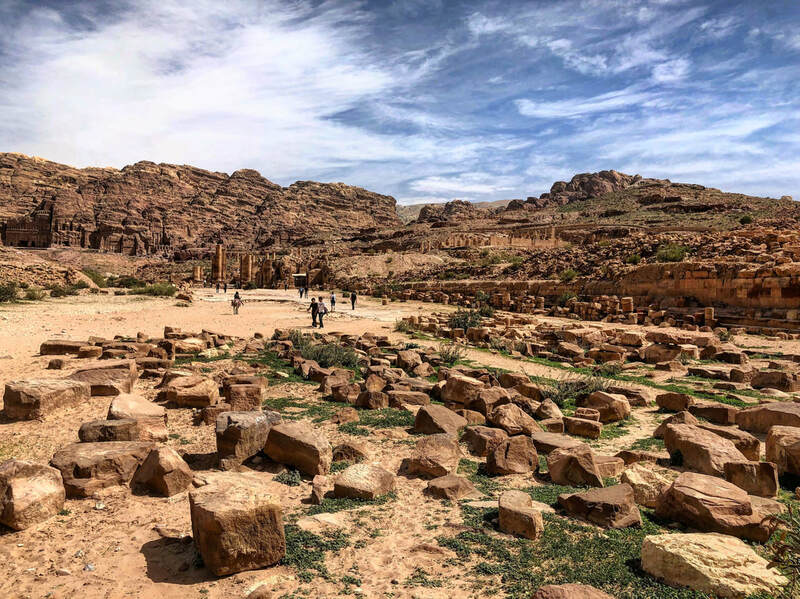 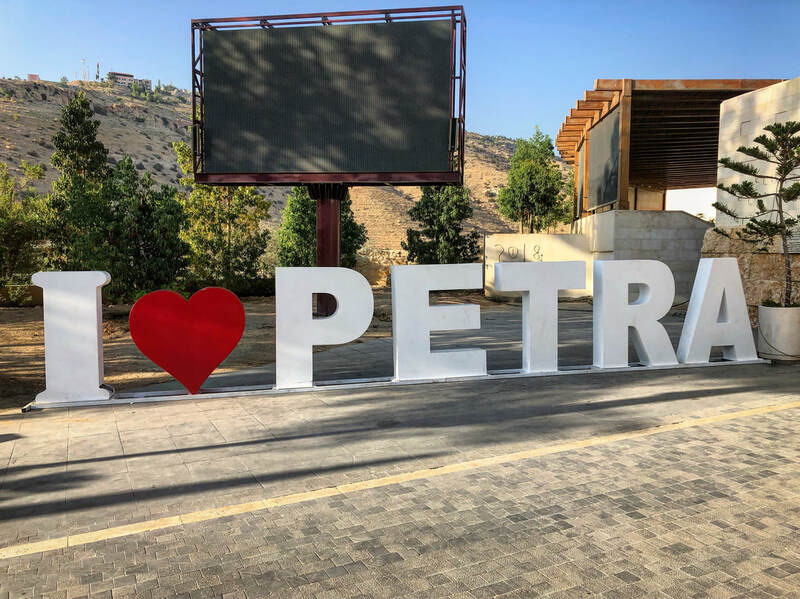 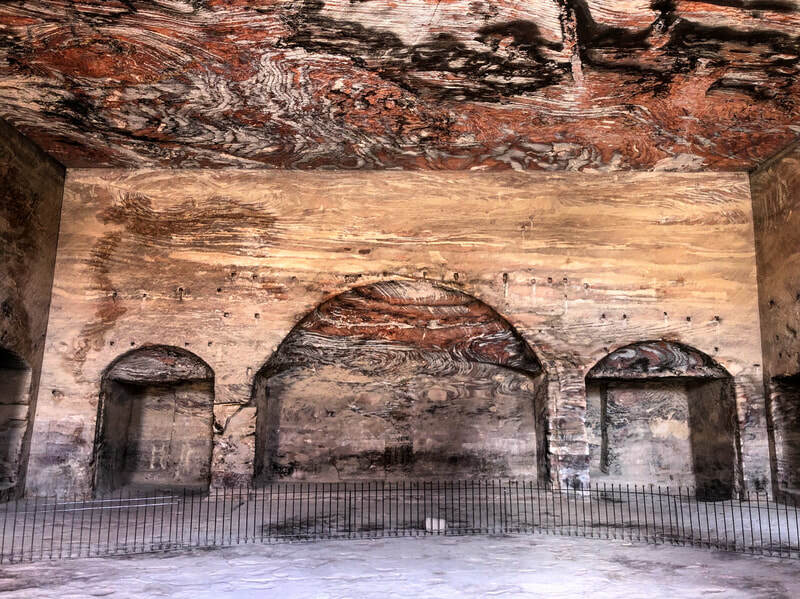 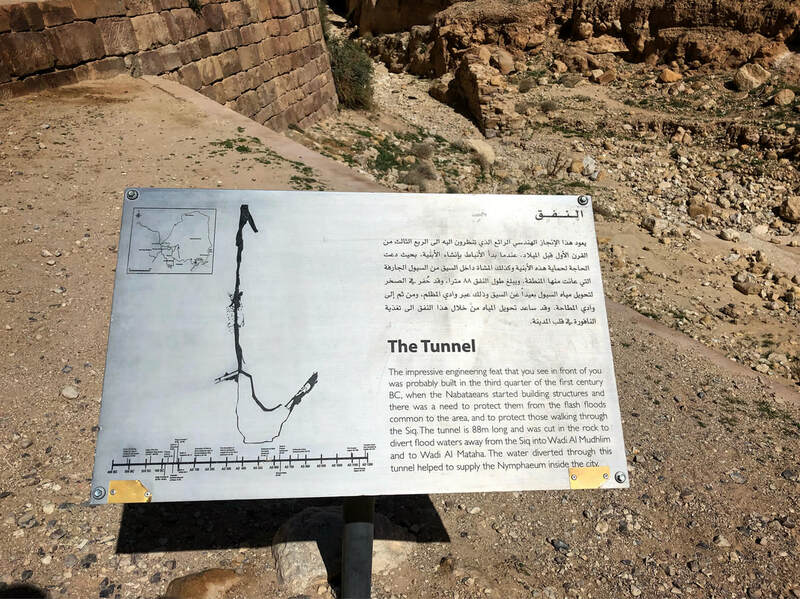 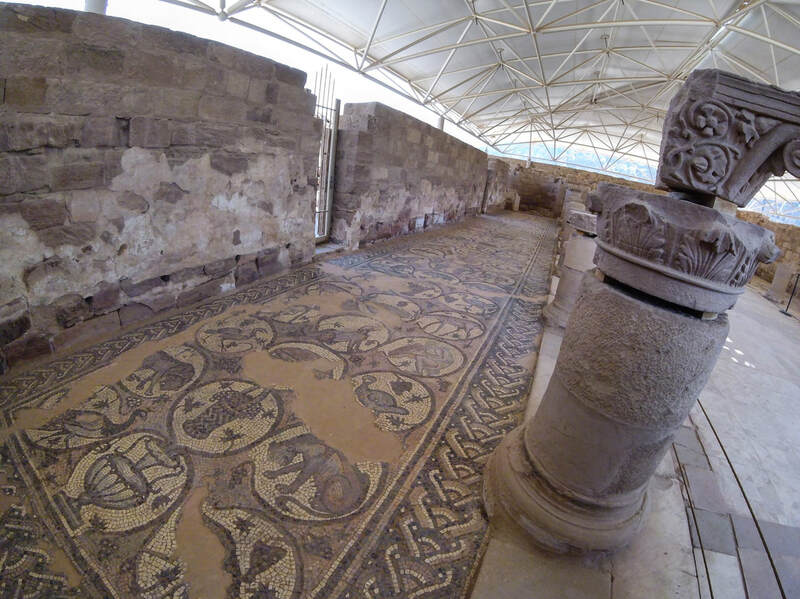 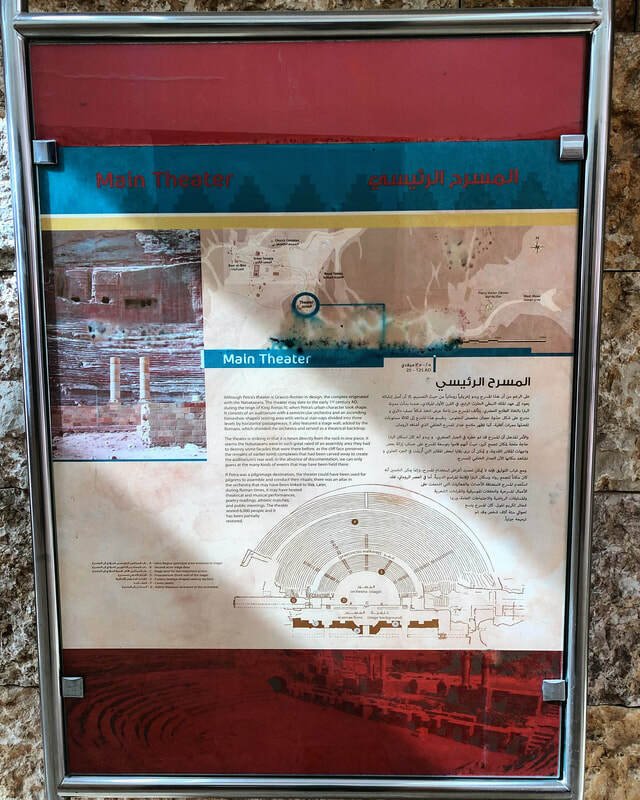 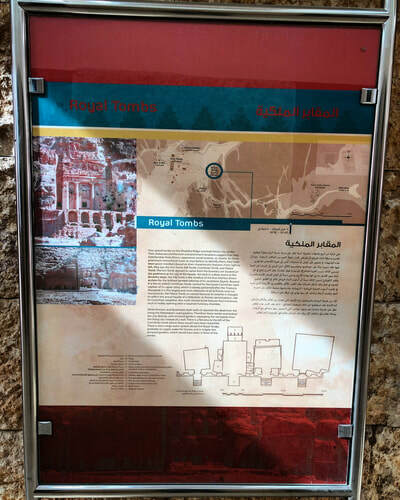 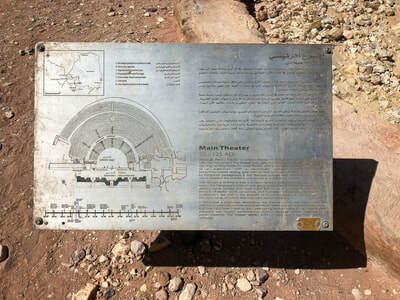 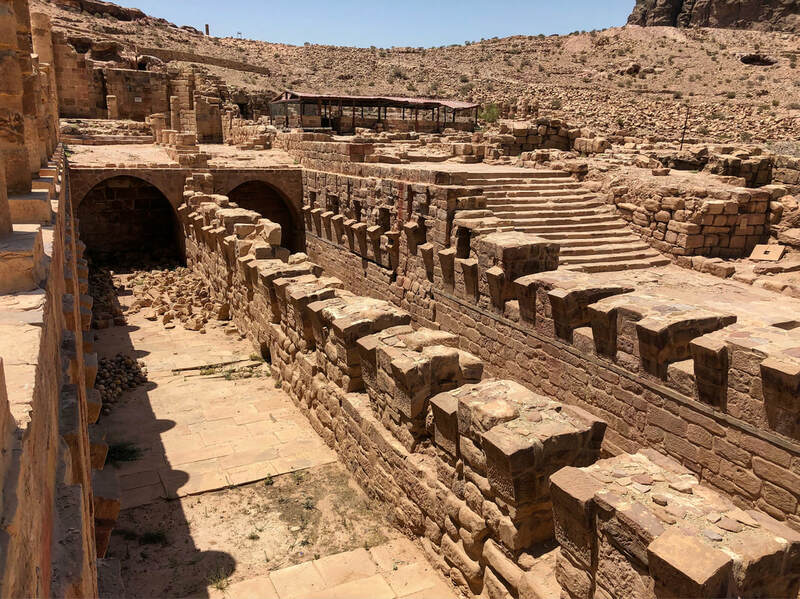 If you want to journey back in time and let your imagination run wild while sitting in the stone carved seats of a theater, I would recommend visiting the Amphitheater in Amman (click here) or the others located in the city of Jerash (click here). 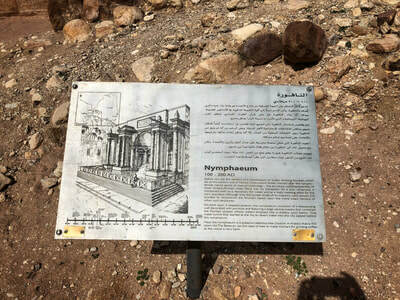 Continuing down the main road you will come across an area on the right, tucked into the hillside which is known as The Royal Tombs. 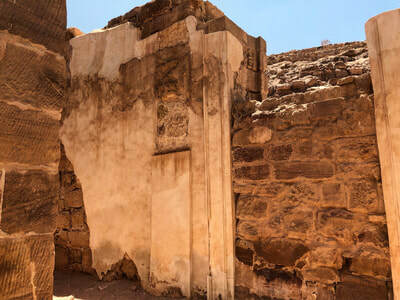 It is believed these particular set of buildings were constructed for the elites or royals within the city and used as their final resting place. 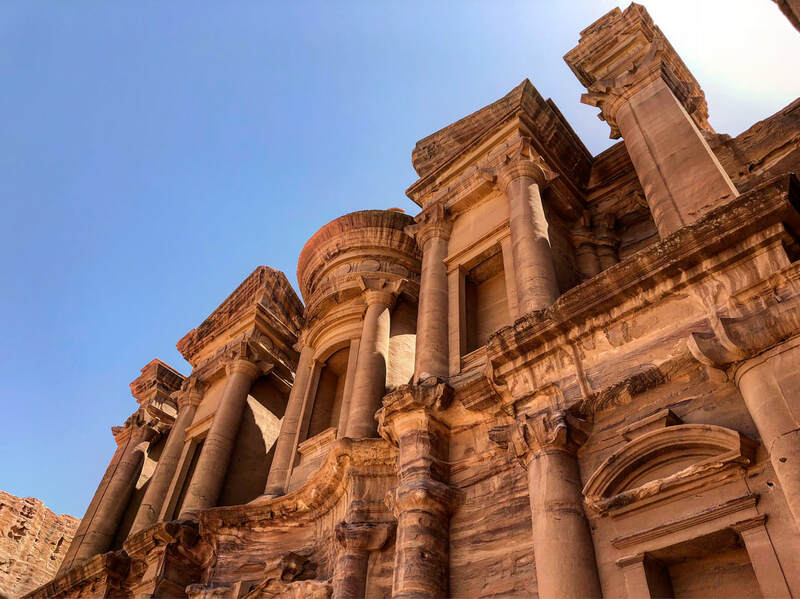 The view from afar is impressive, but to really appreciate the detail and size of these magnificent structures you need to get up close, which you can do as they are all open to explore. 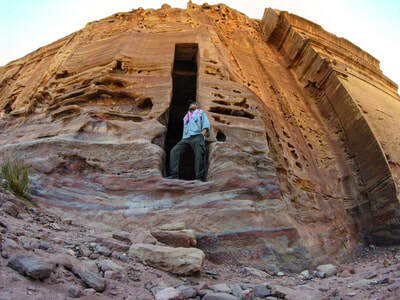 For the size, you would think there are multiple rooms inside, but that is not the case. This "one room deep" theme is consistent with almost all the structures within Petra, which I find interesting and odd. 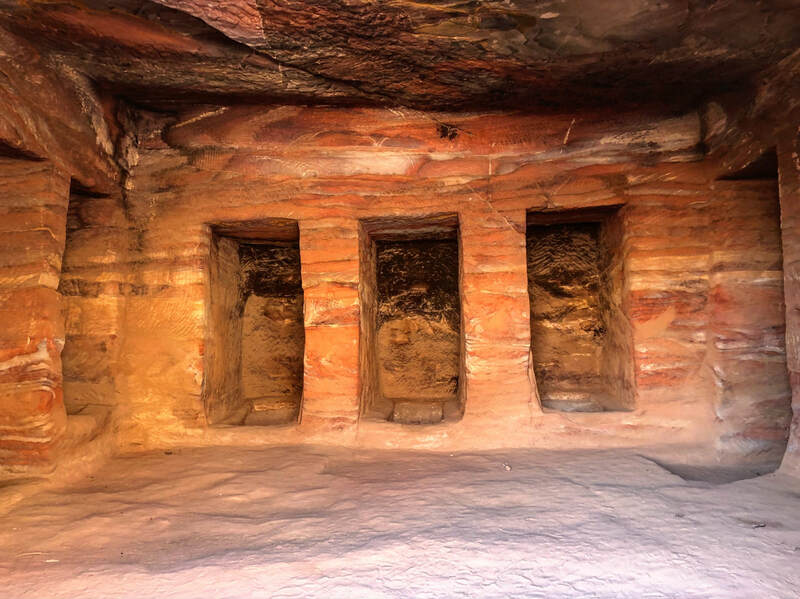 Looking at The Royal Tombs, the one on the right is known as The Urn Tomb and in my opinion, is the most interesting of the four. 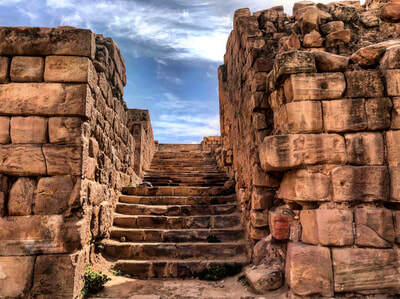 There is a series of stairs leading up to the main room. 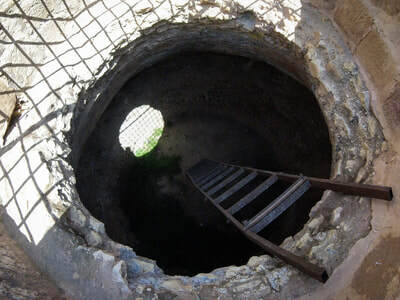 As you climb to the top, you will encounter openings on your left which you can investigate. 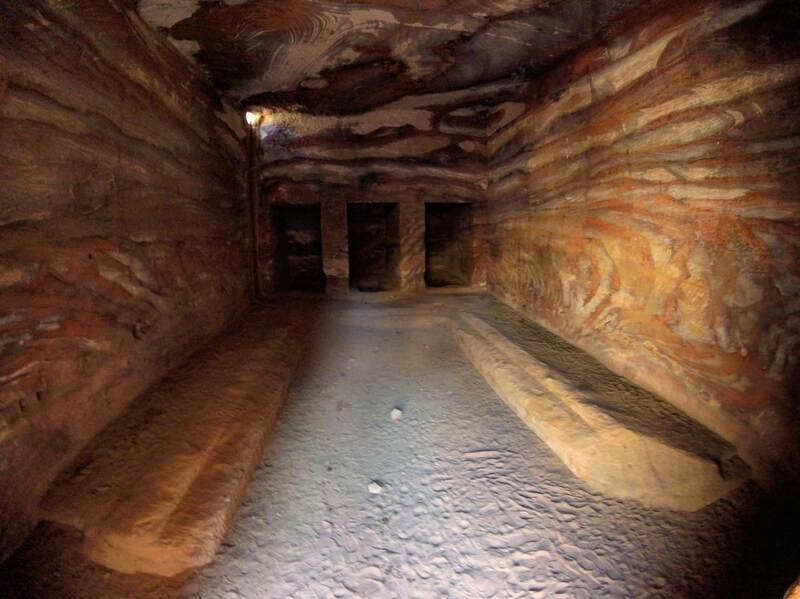 Upon reaching the tomb platform topside, you will see the large door leading into the main room. 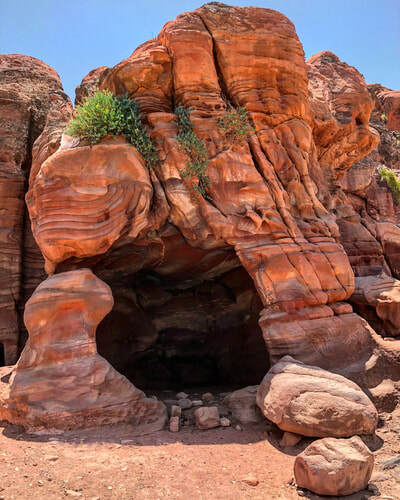 Once you walk in, be sure to look up. 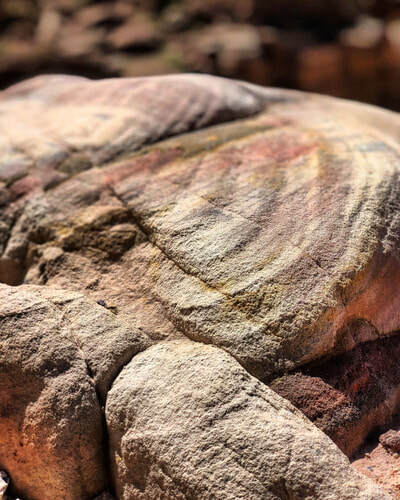 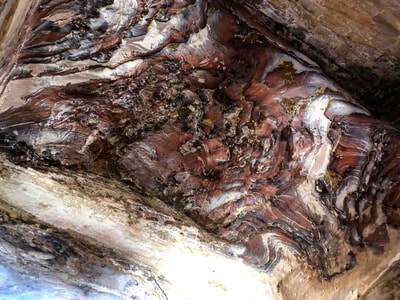 The natural colors and swirl design of the stone are amazing. 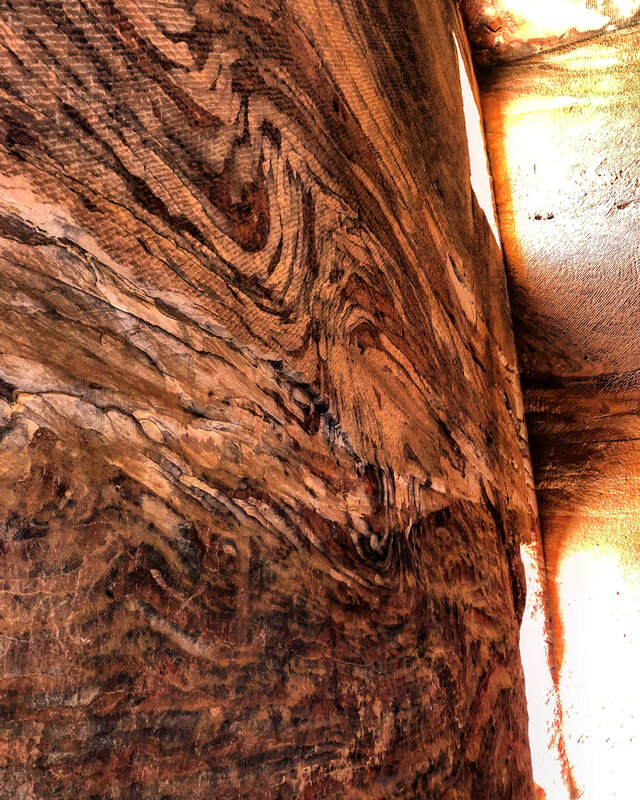 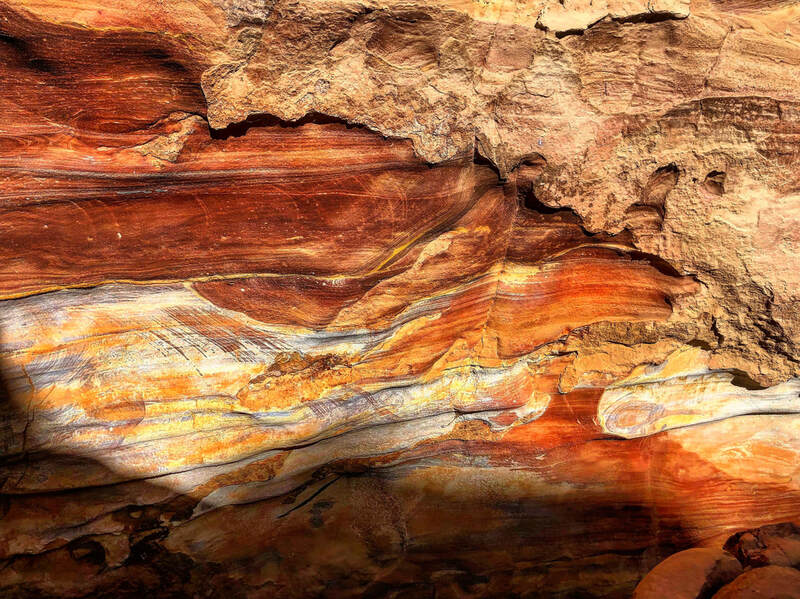 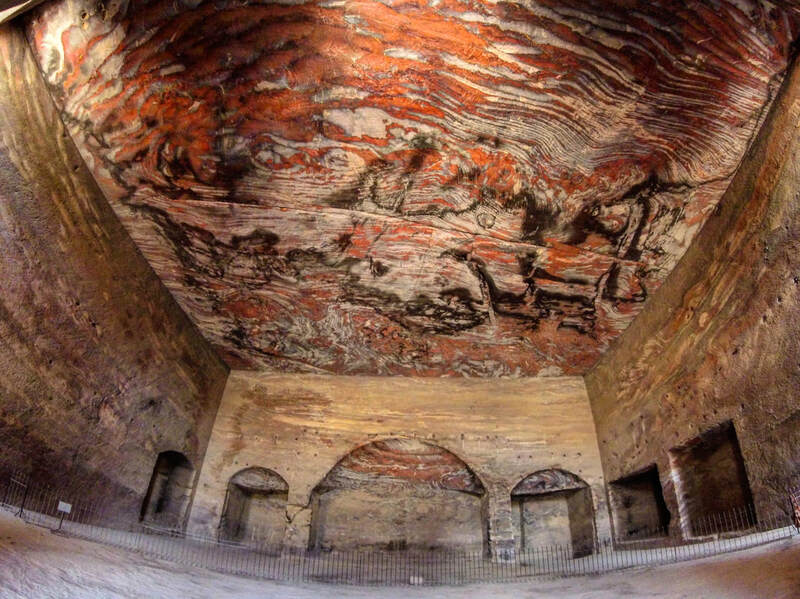 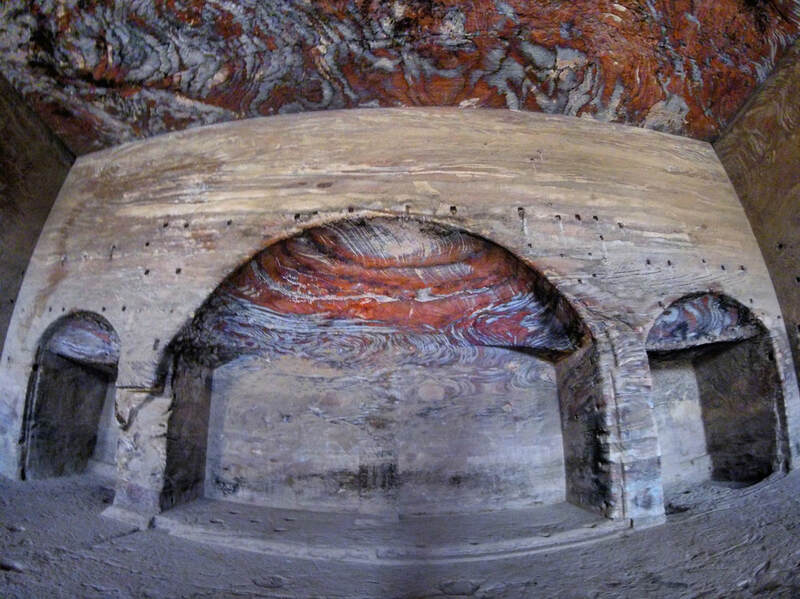 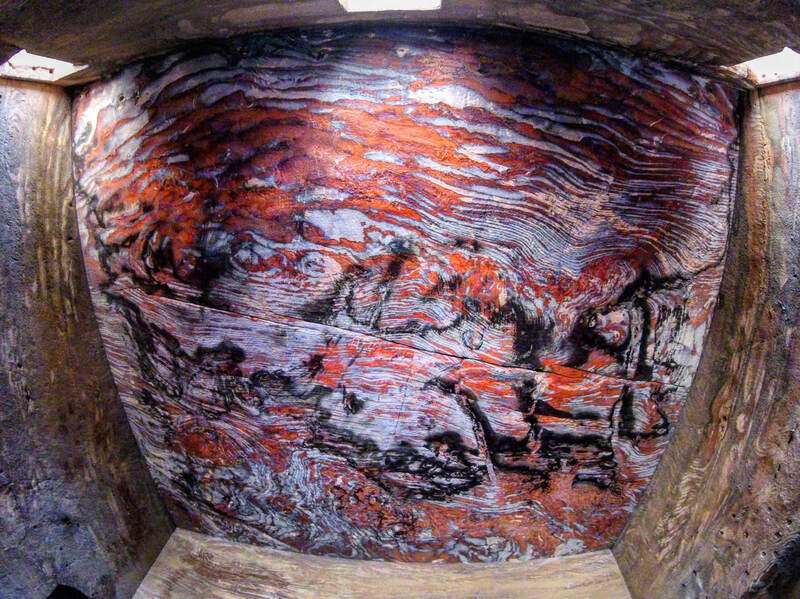 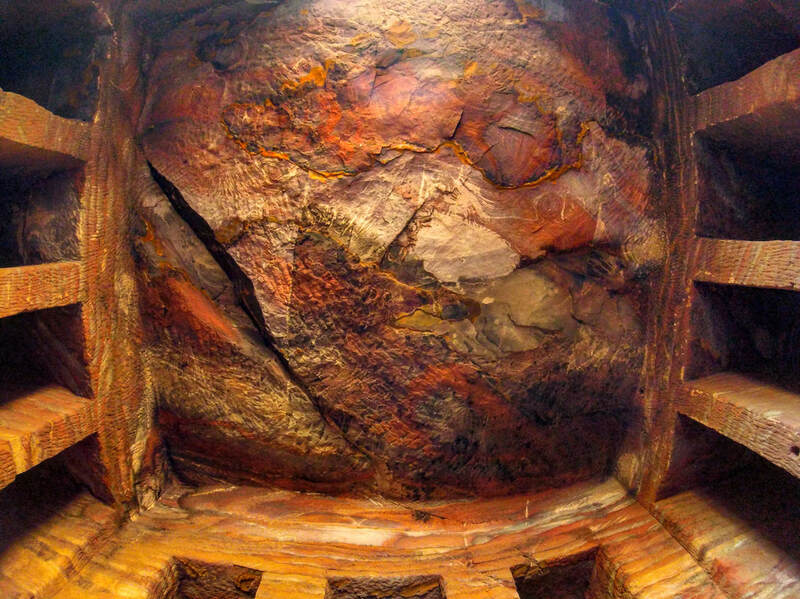 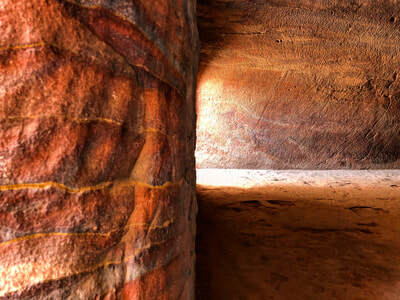 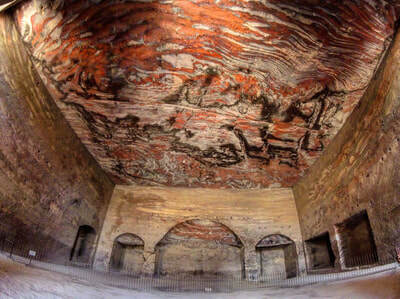 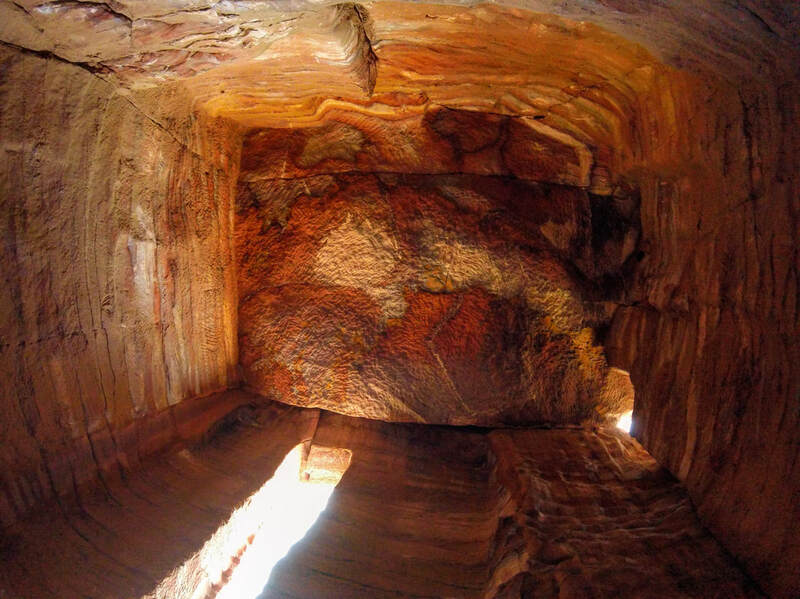 This continues down the walls, but the vividness of the colors within the sandstone is more profound on the ceiling. 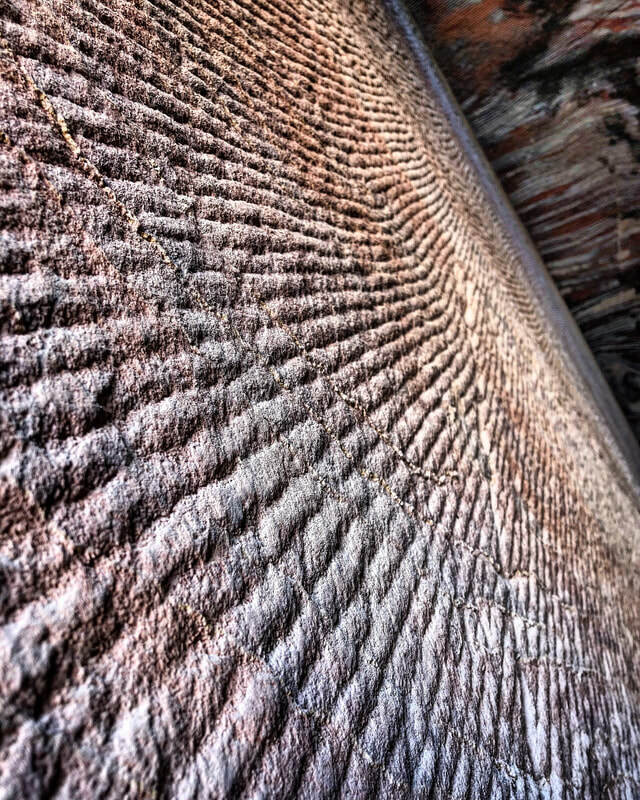 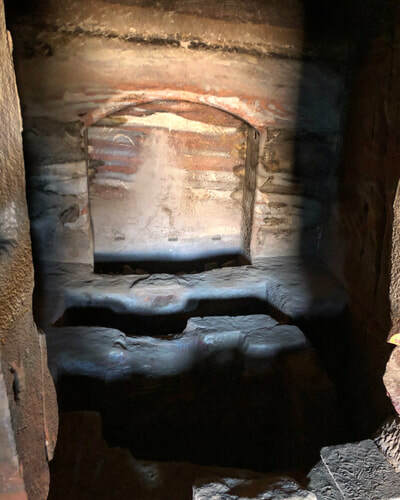 The exact methods and techniques used for construction are not known, but looking at the walls within the room and other areas, you can see semi-vertical grooves running from floor to ceiling which is carved into the stone. 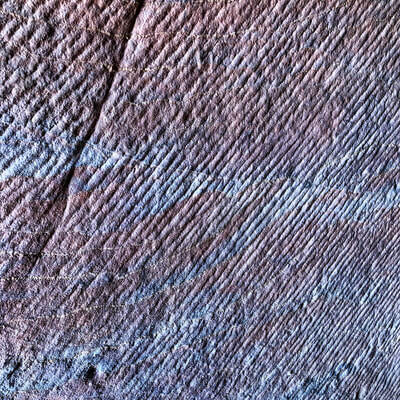 My assumption is, these marks are from tools, but it is entirely possible they are design elements or something else. 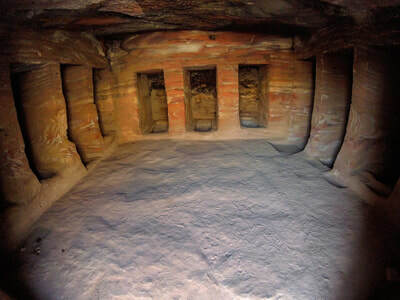 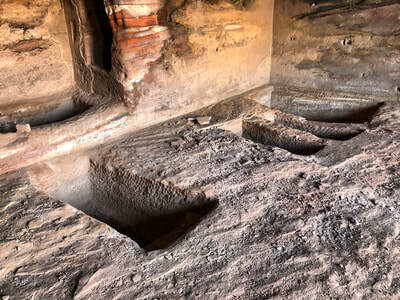 ​Working right to left of The Urn Tomb you will see three more large structures, each having a different design. 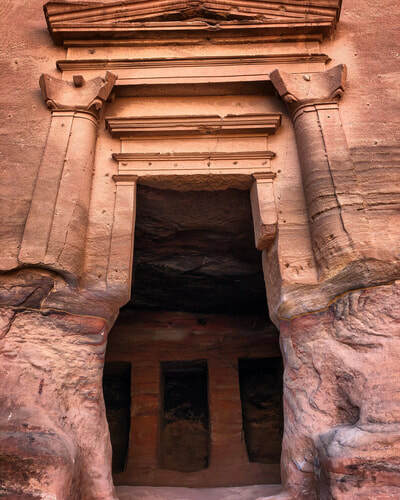 They are referred to as The Silk Tomb, The Corinthian Tomb, and The Palace Tomb. 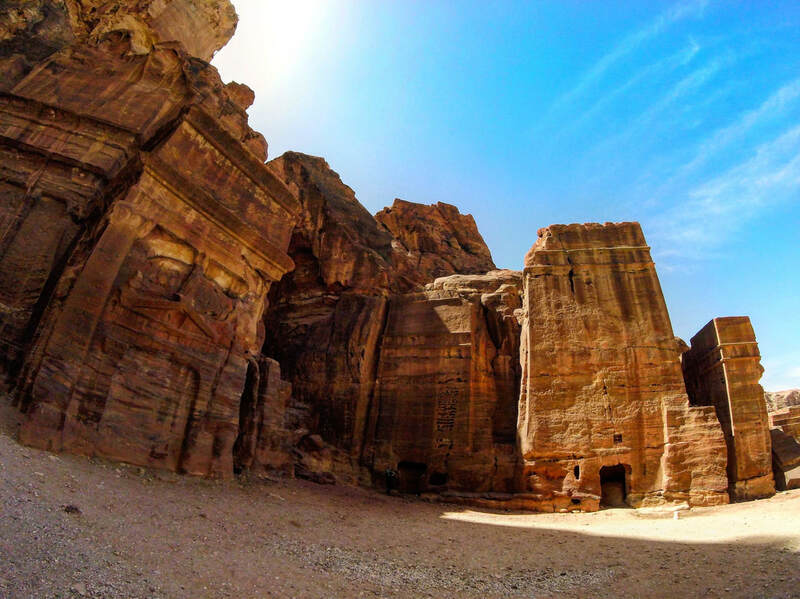 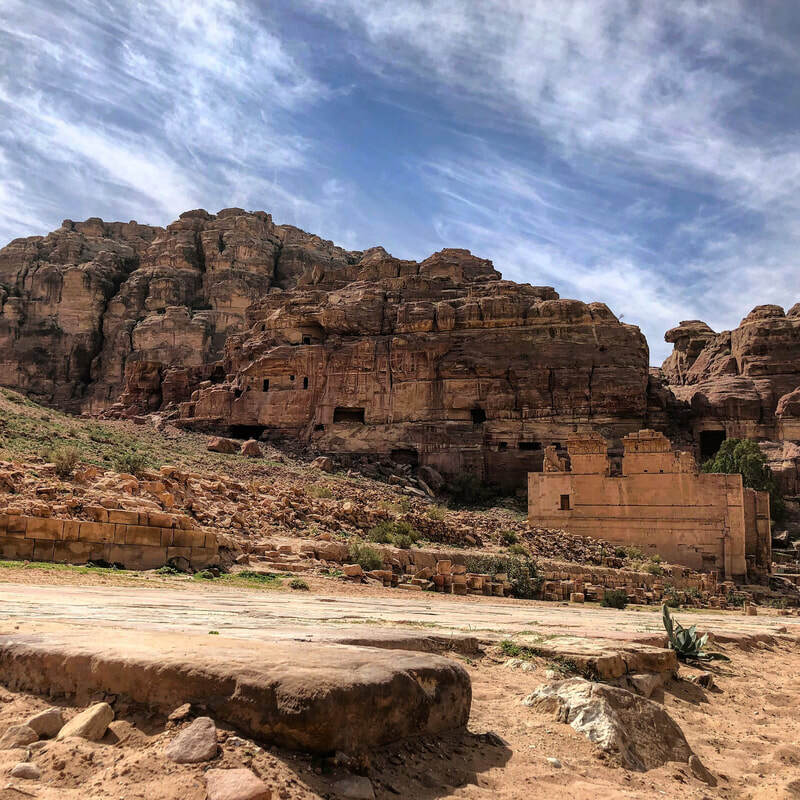 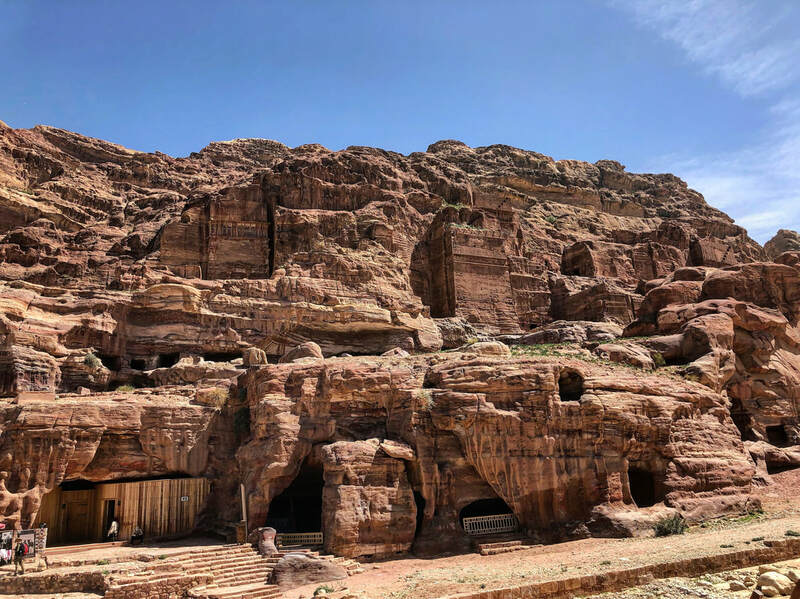 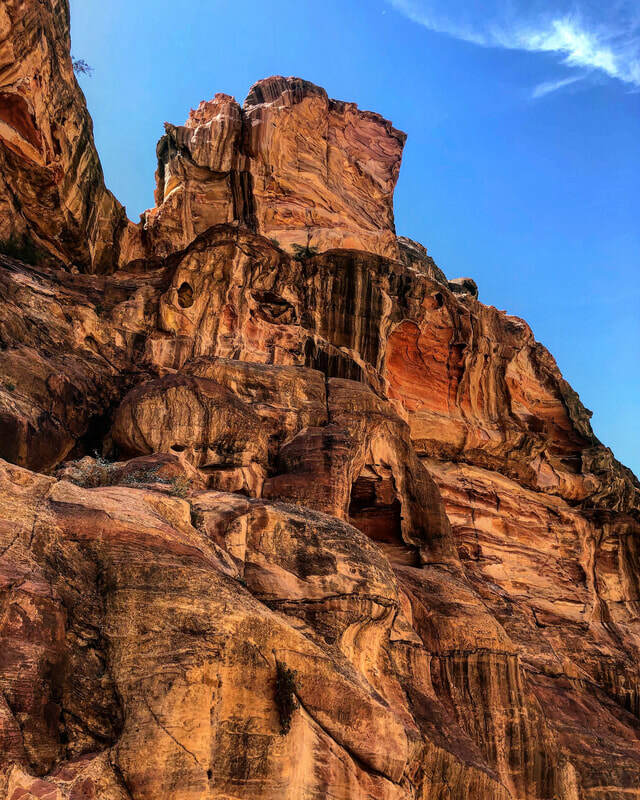 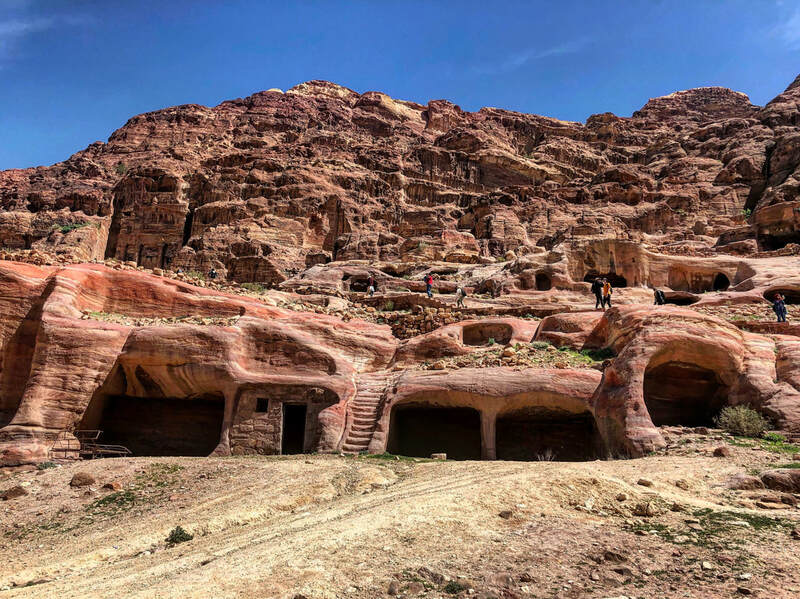 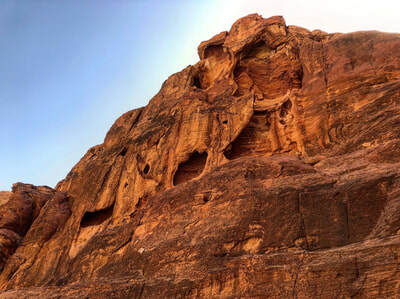 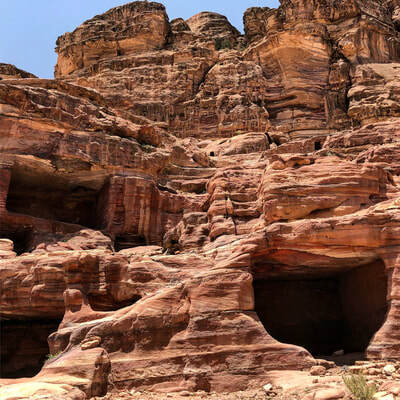 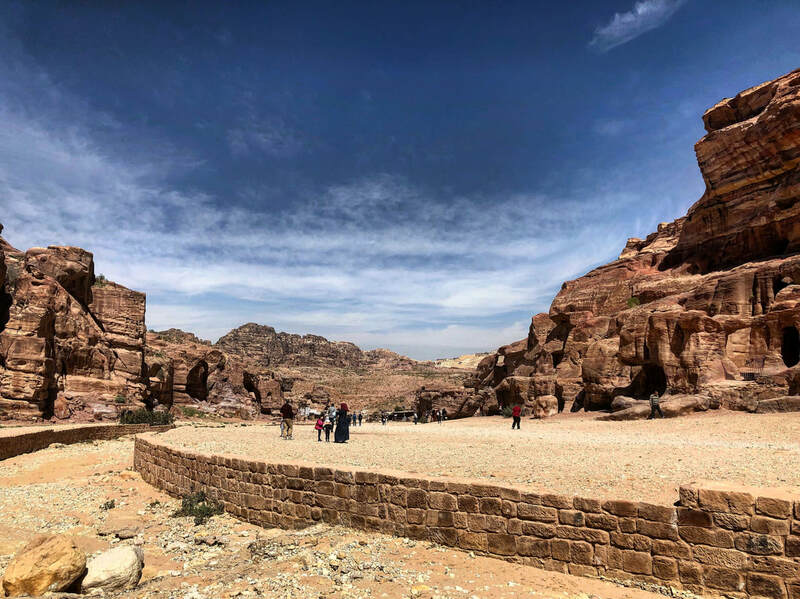 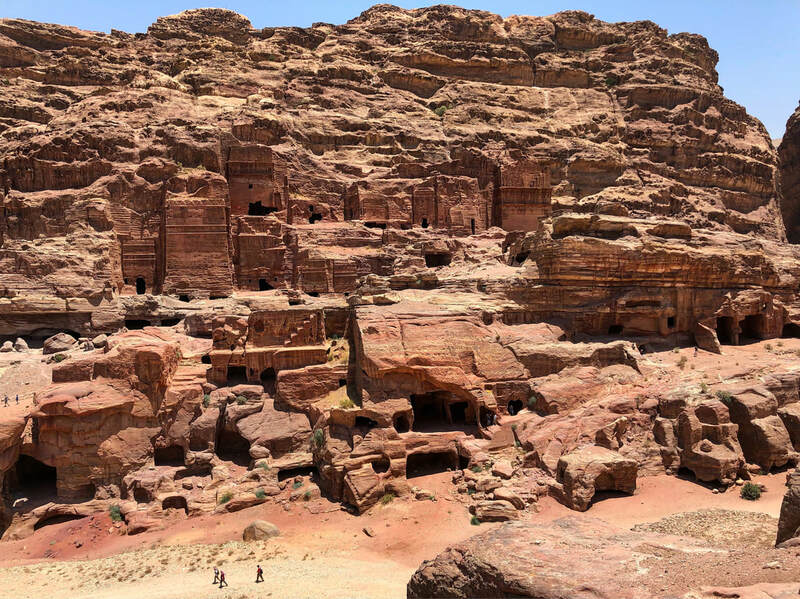 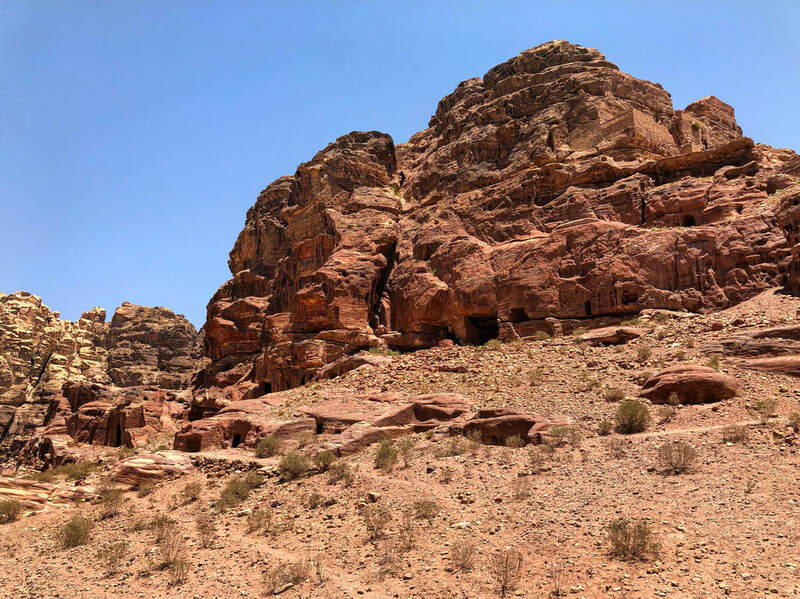 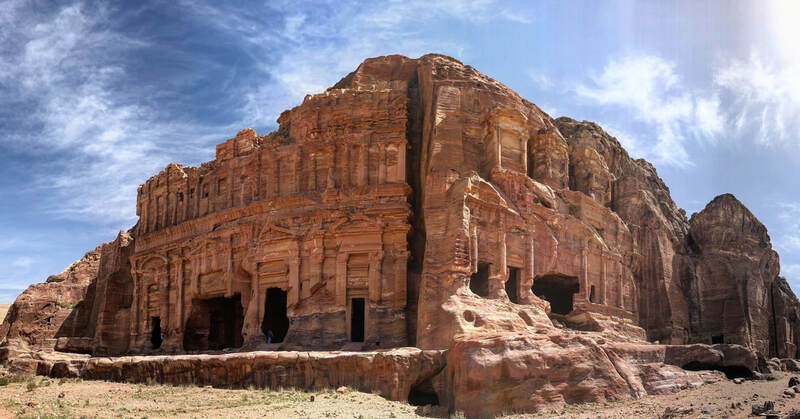 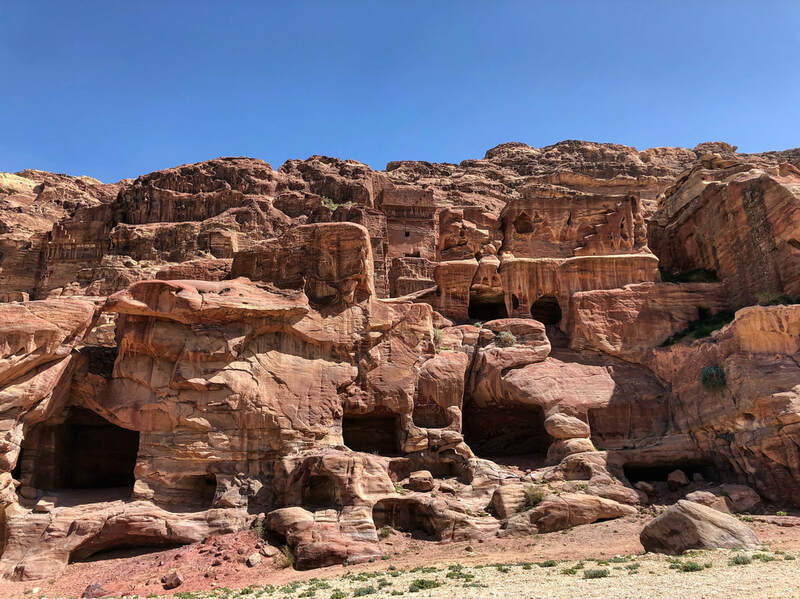 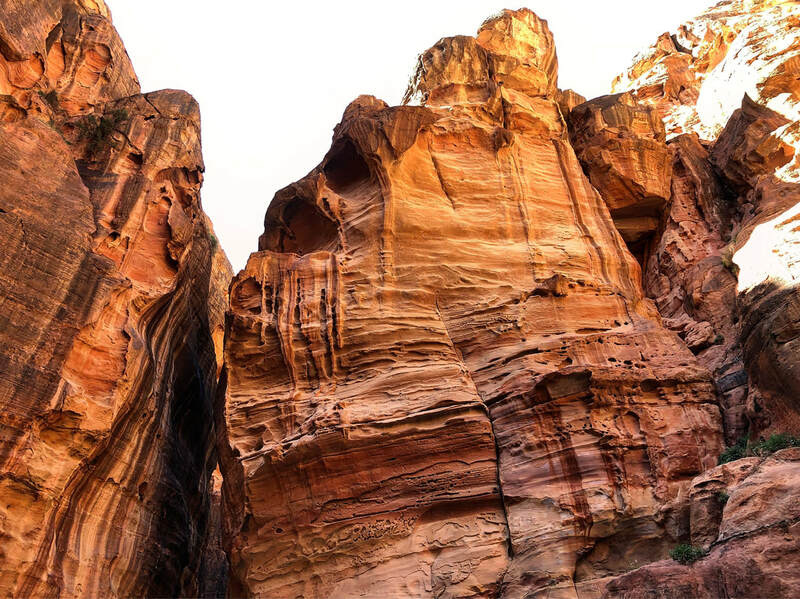 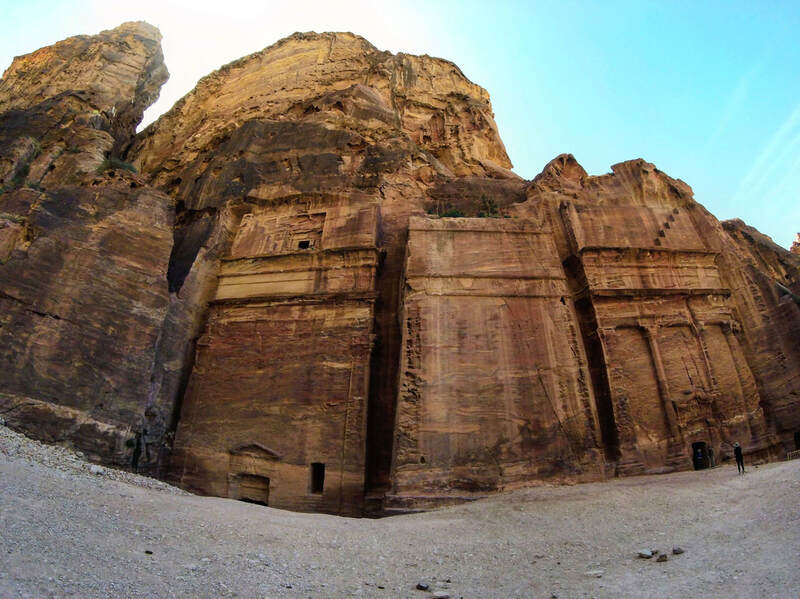 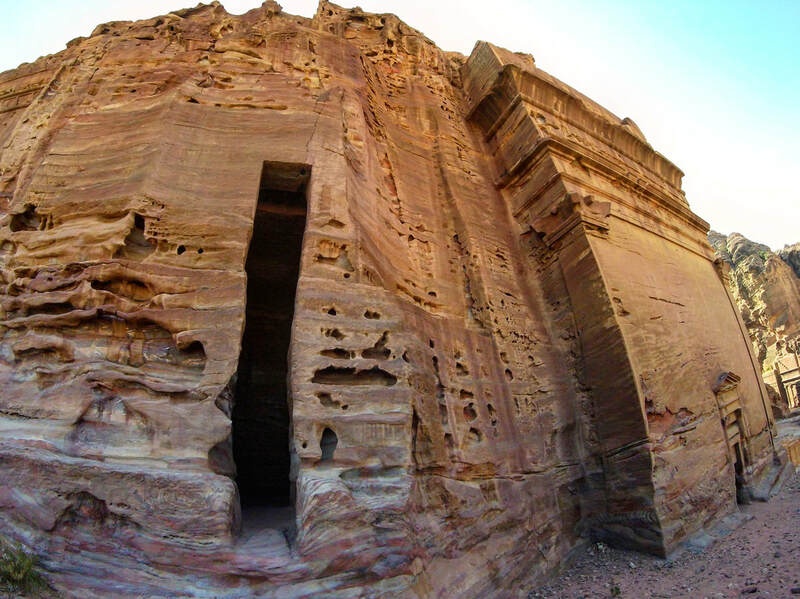 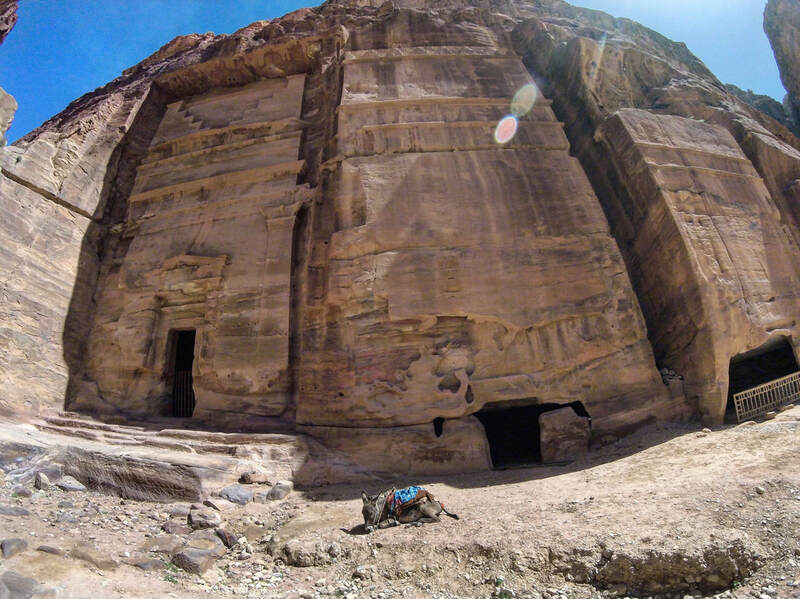 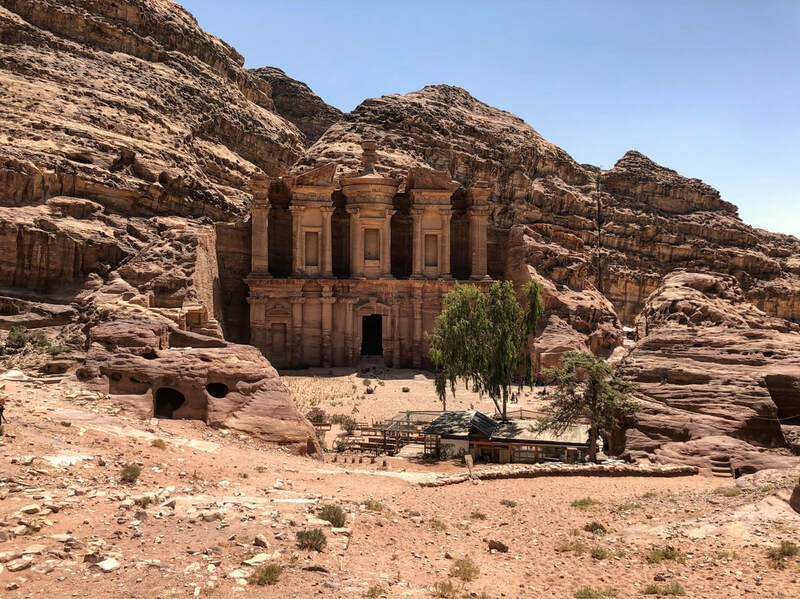 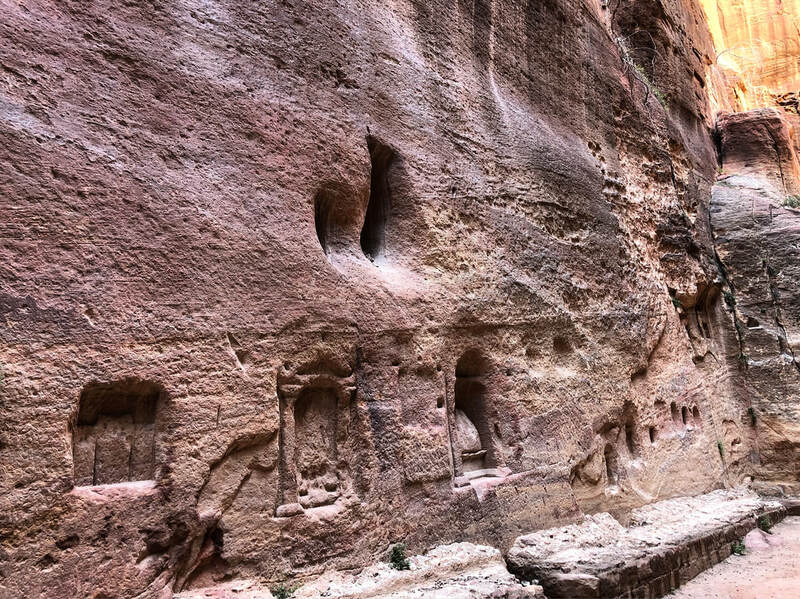 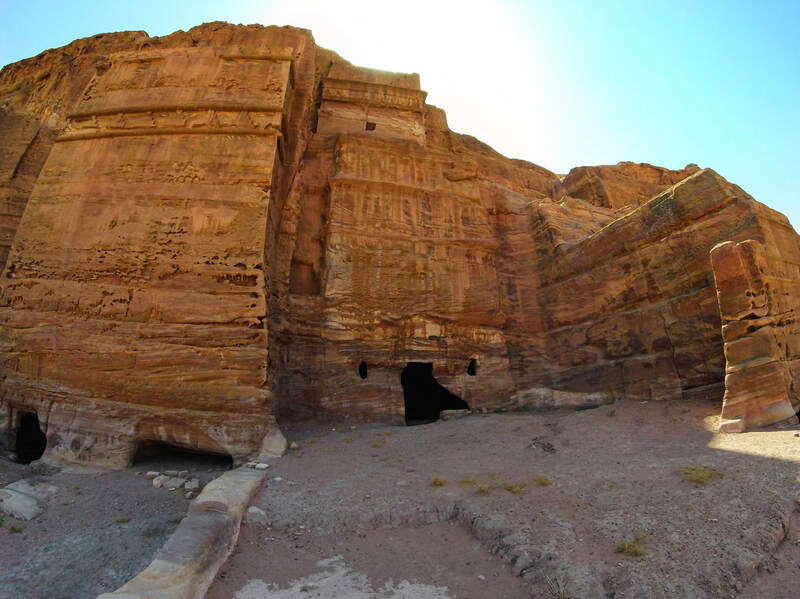 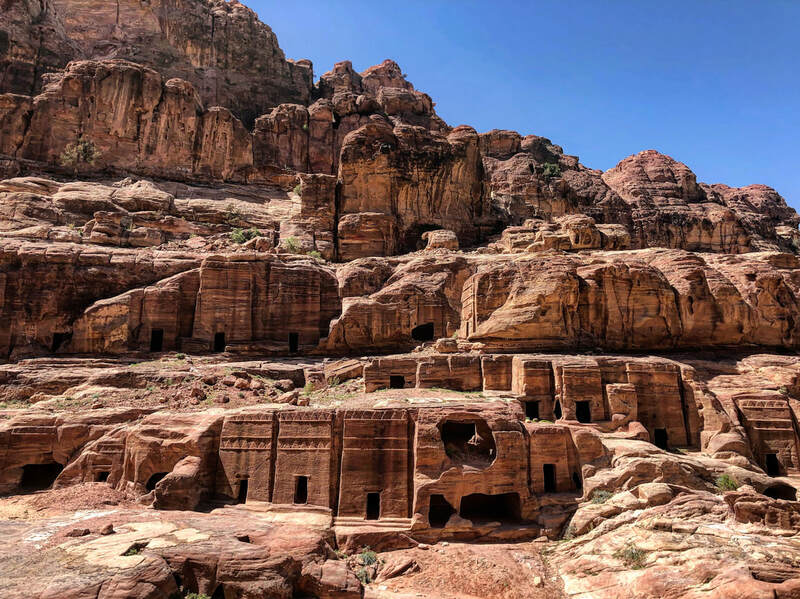 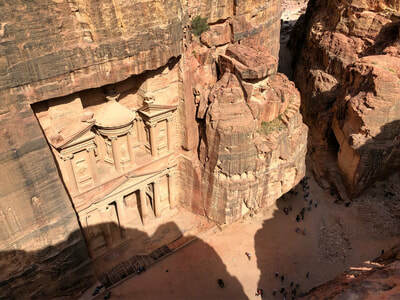 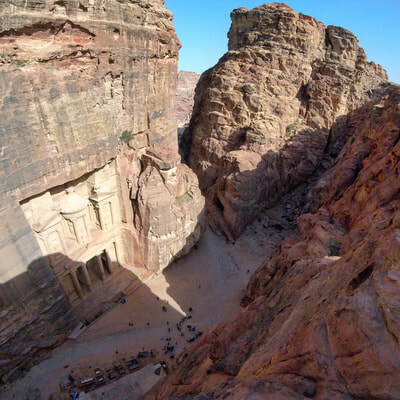 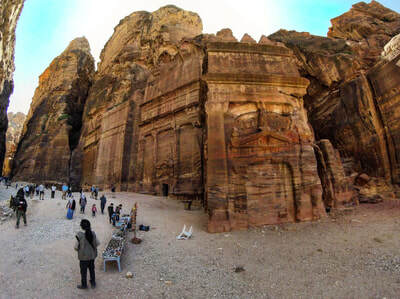 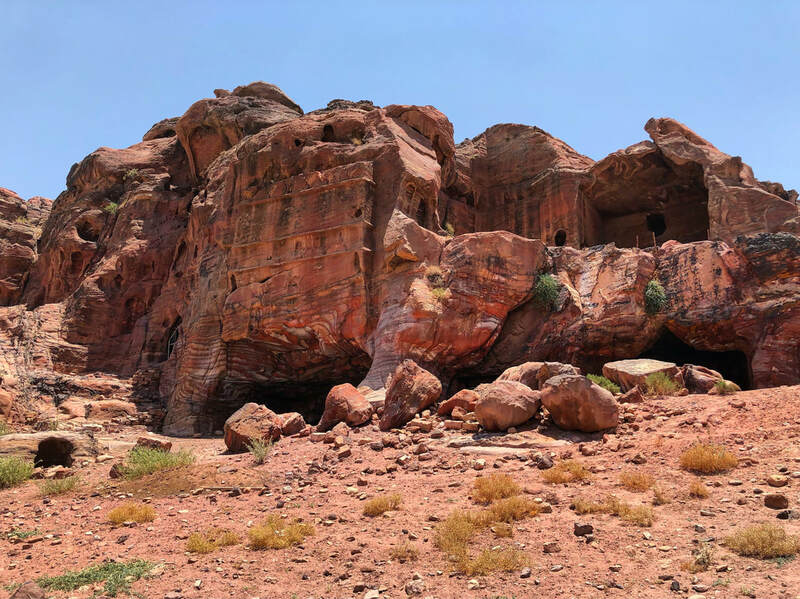 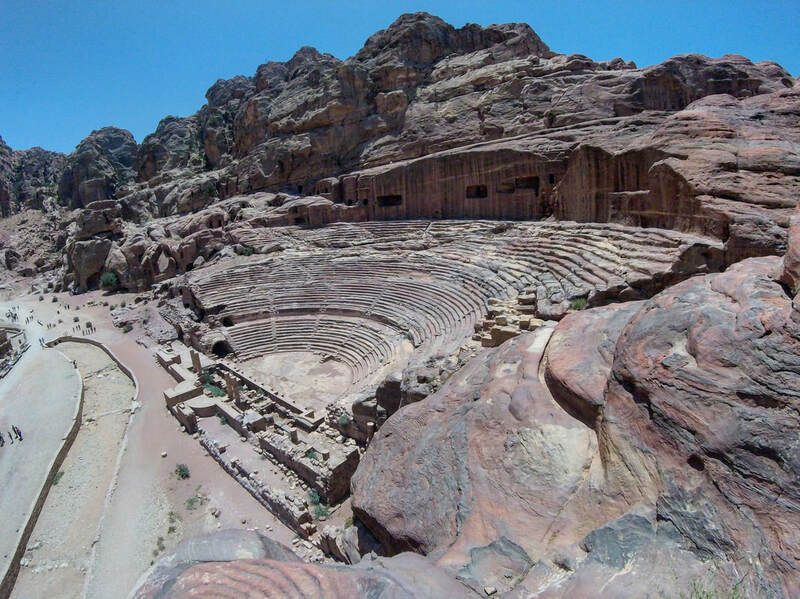 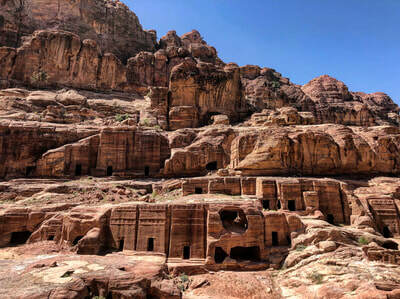 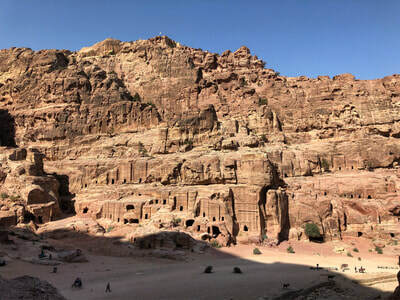 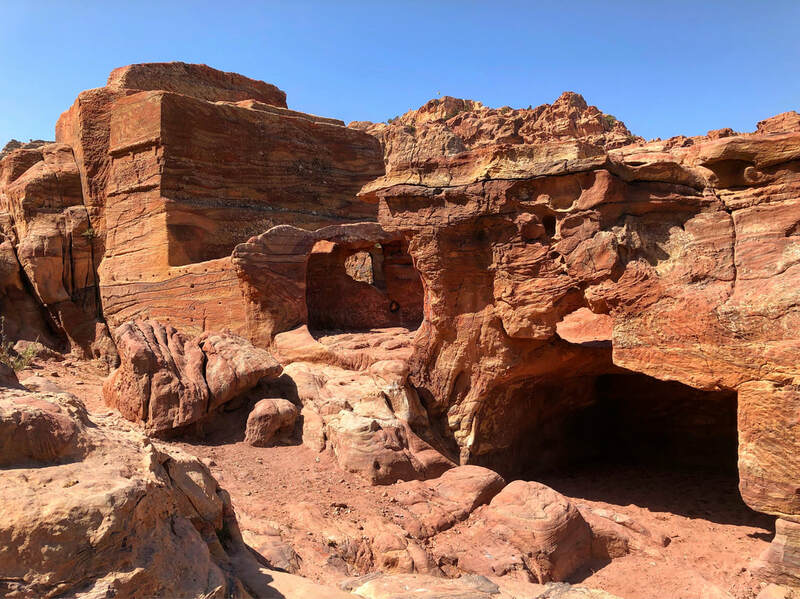 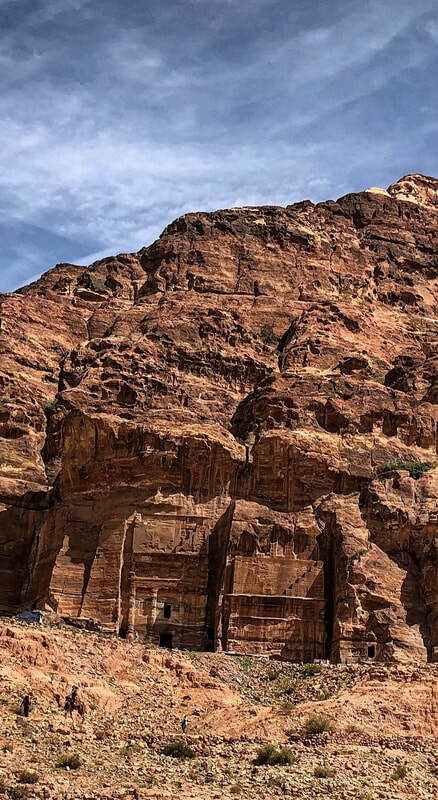 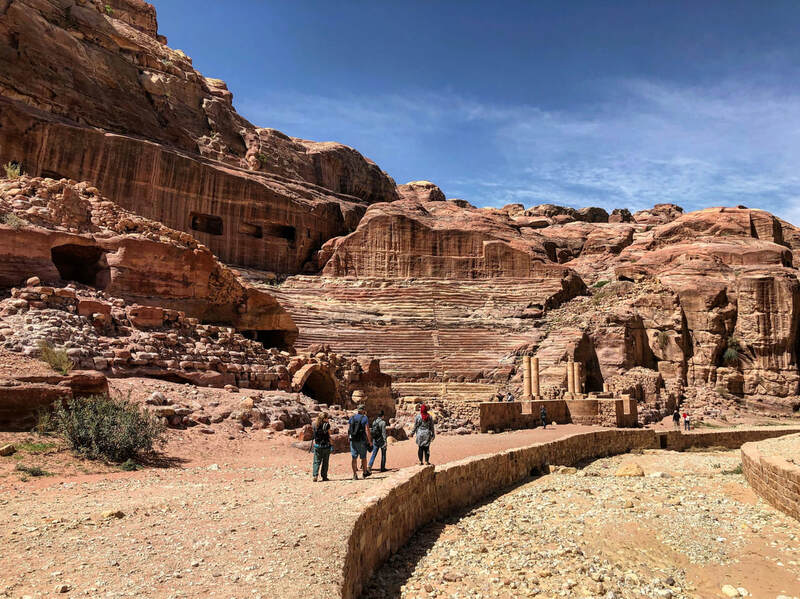 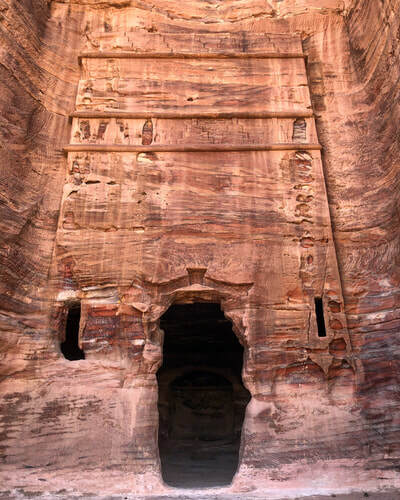 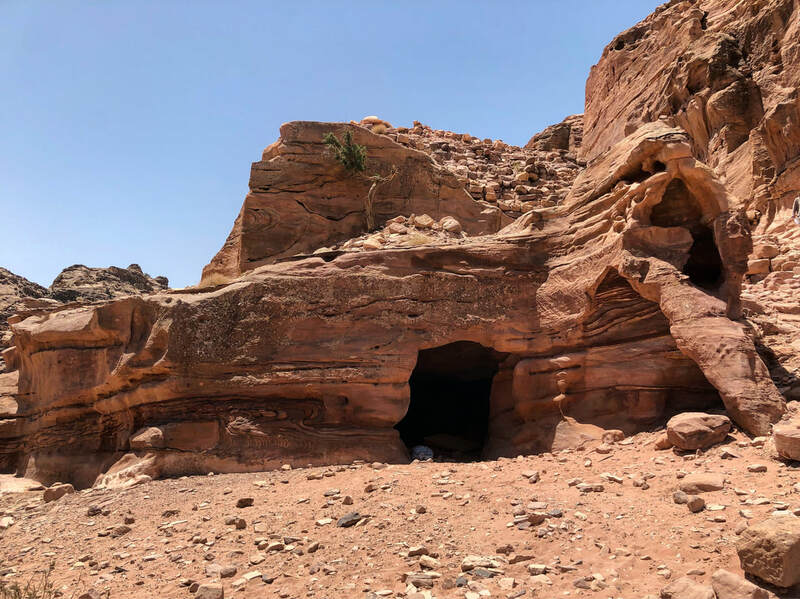 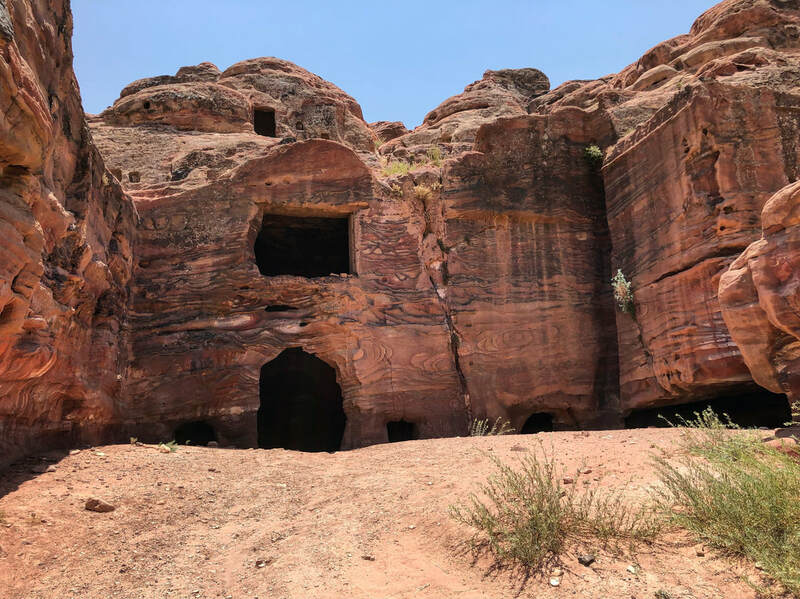 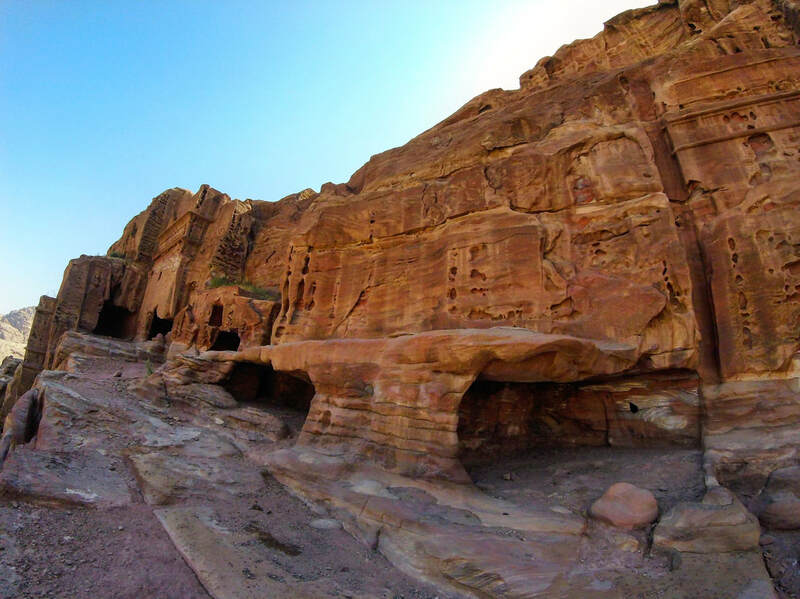 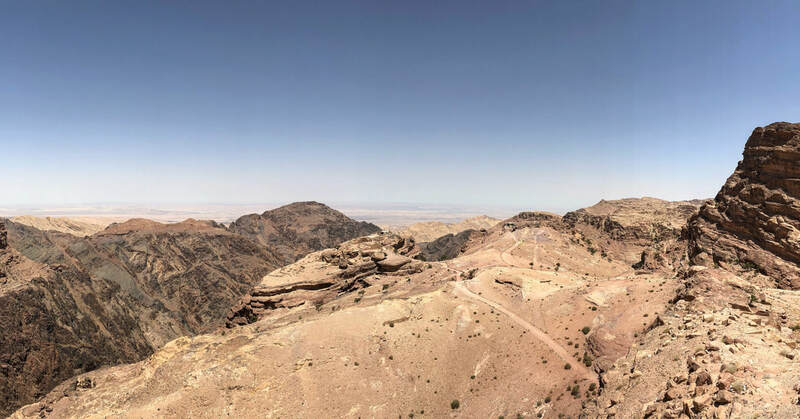 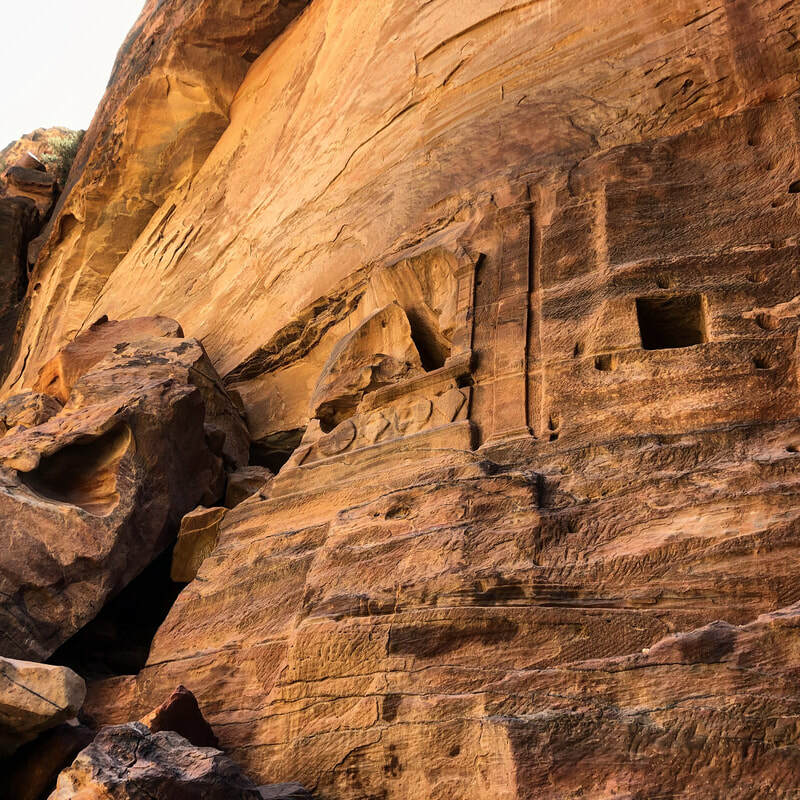 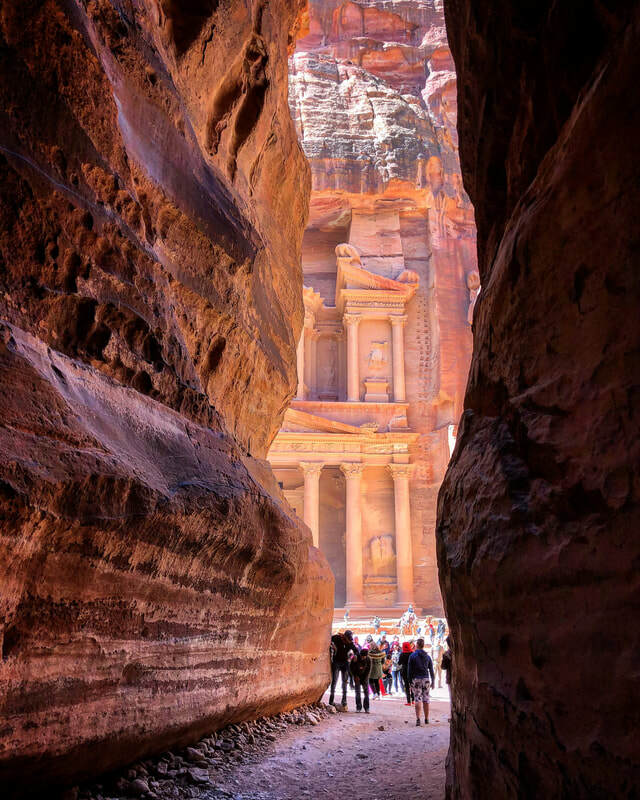 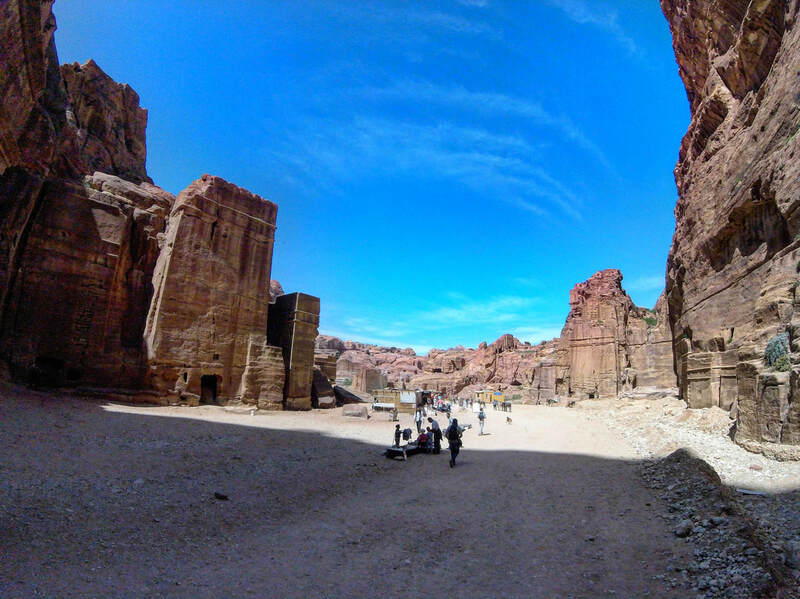 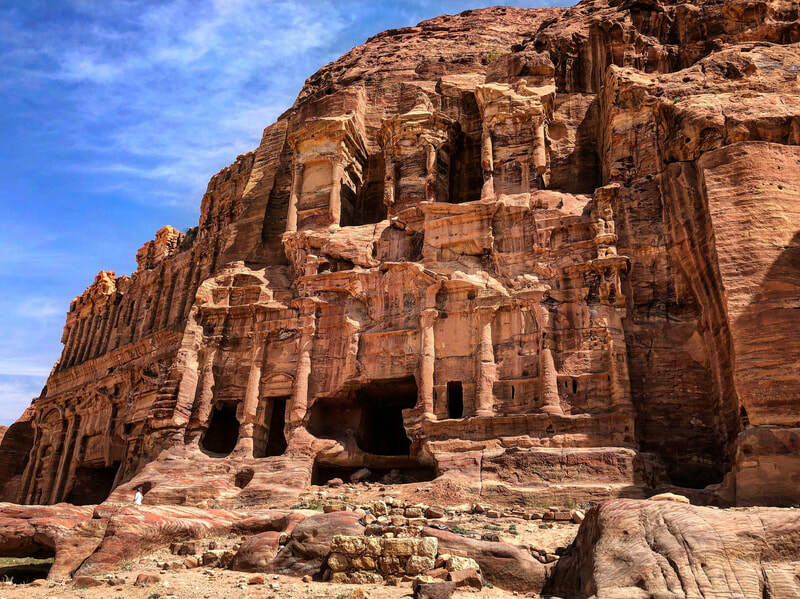 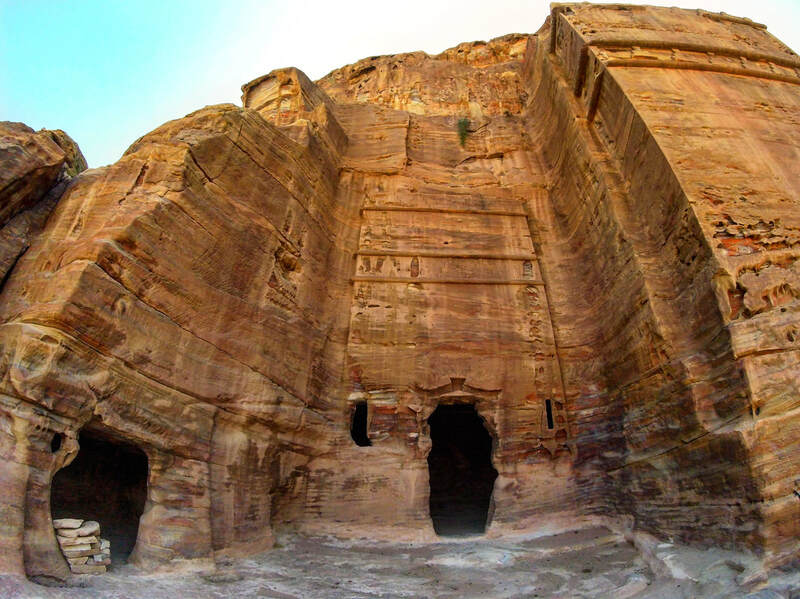 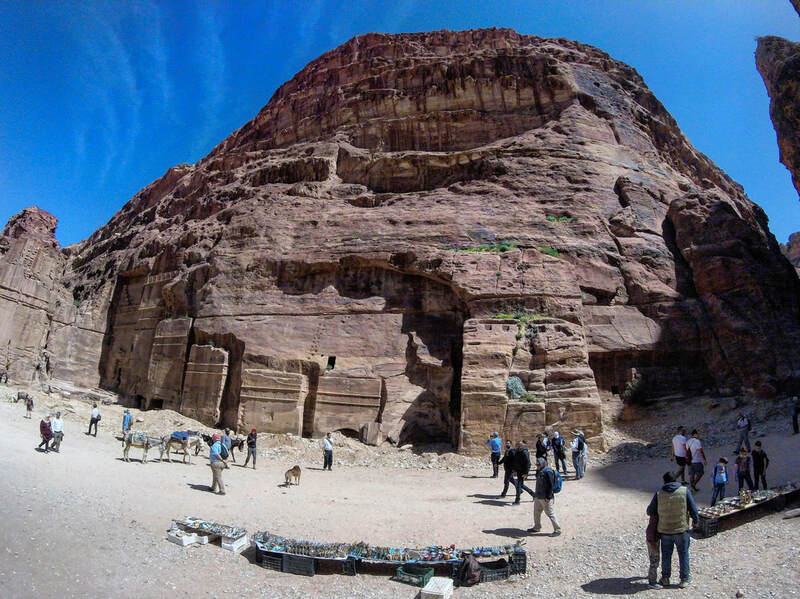 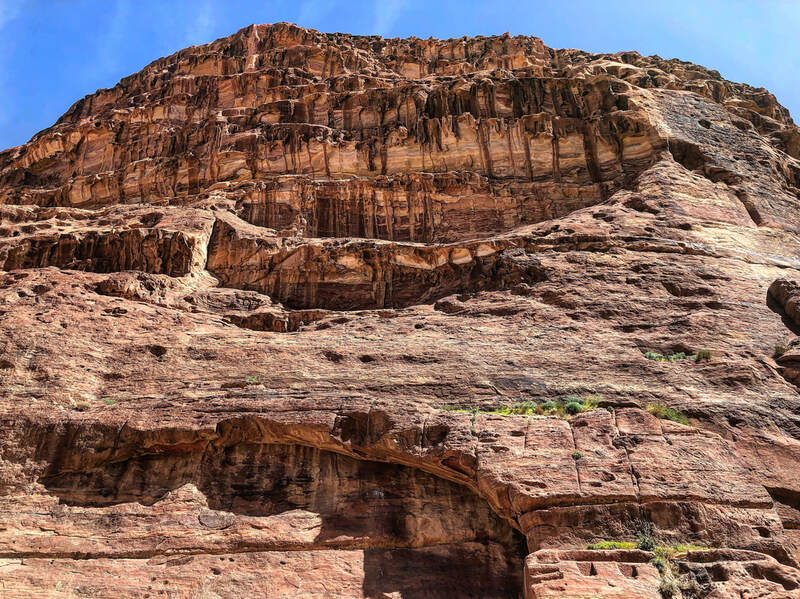 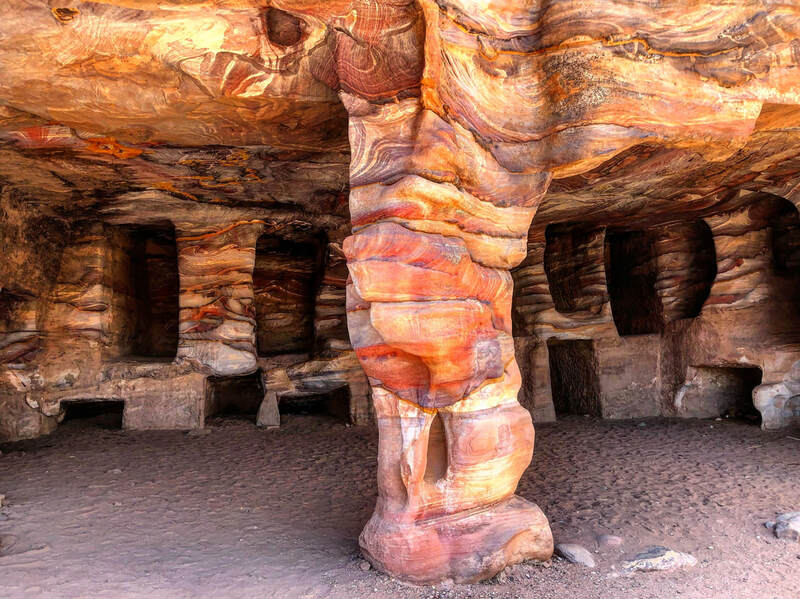 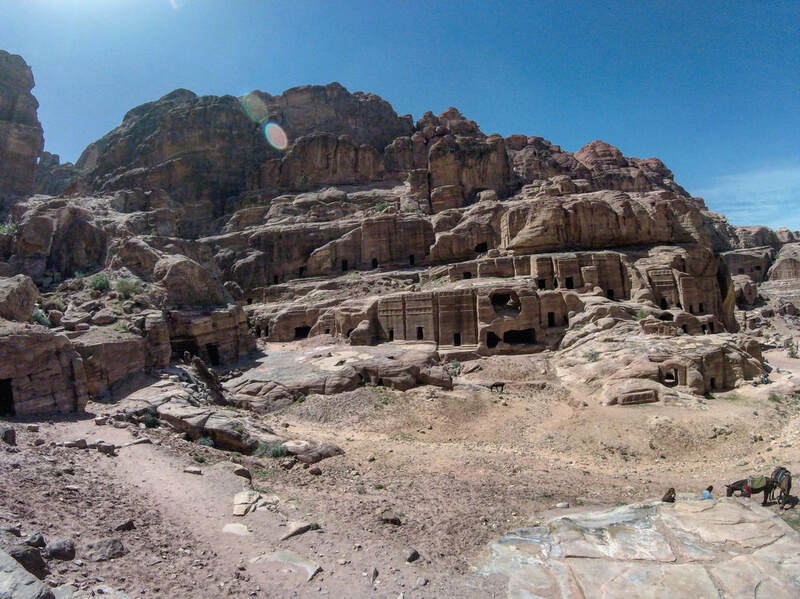 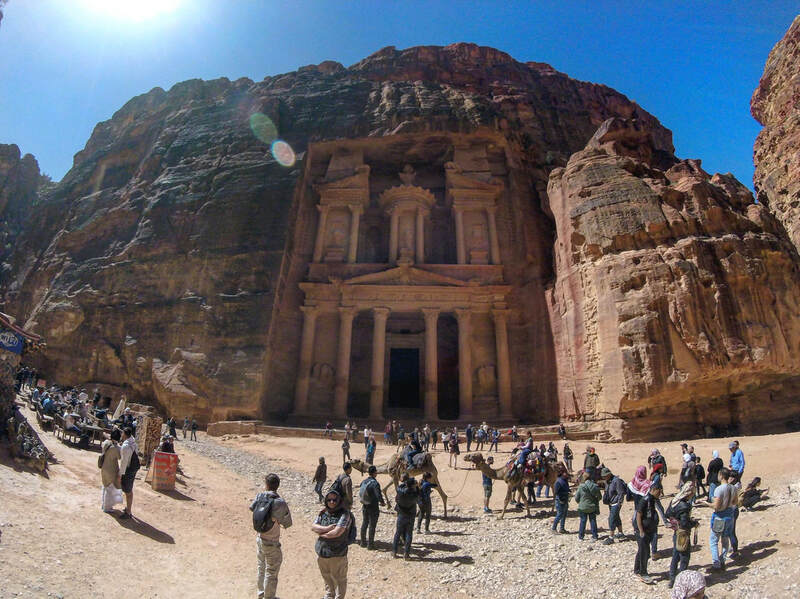 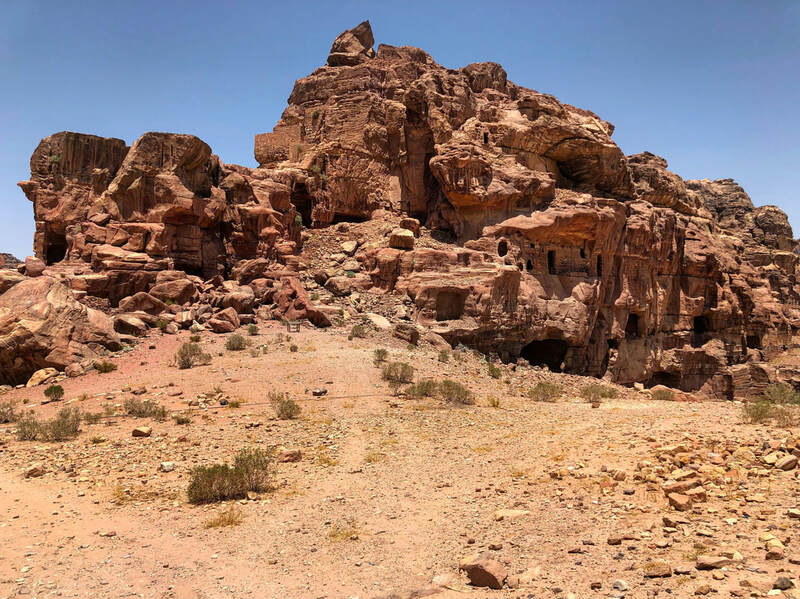 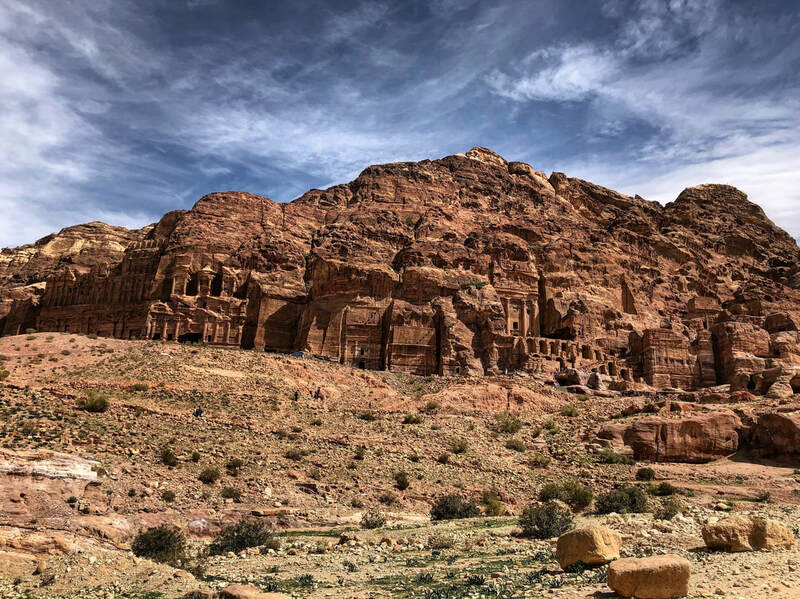 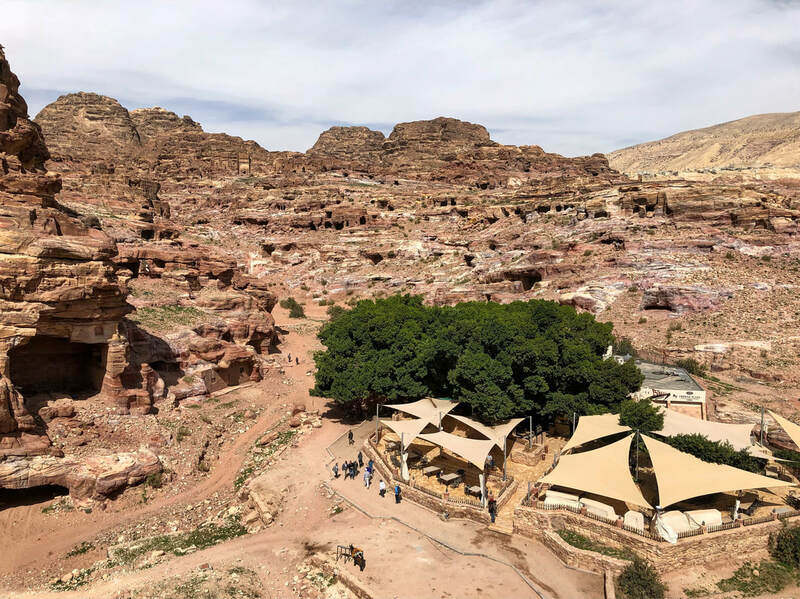 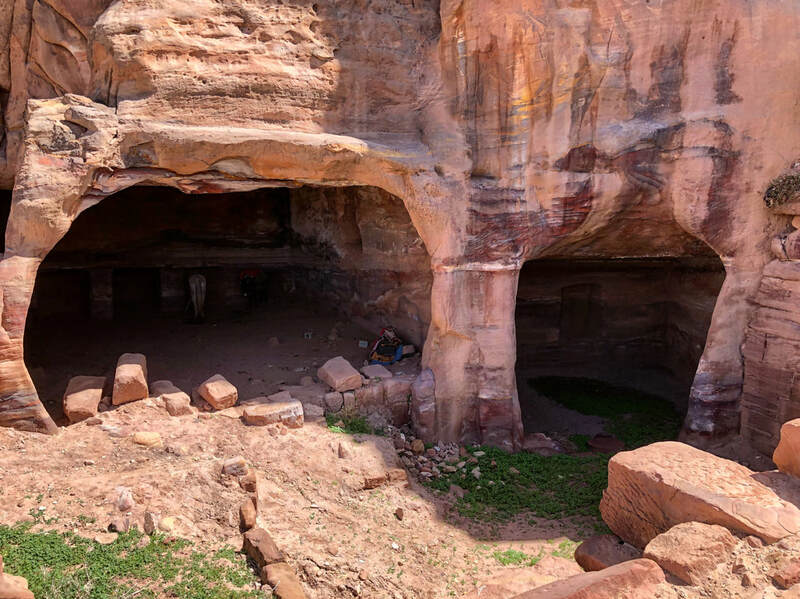 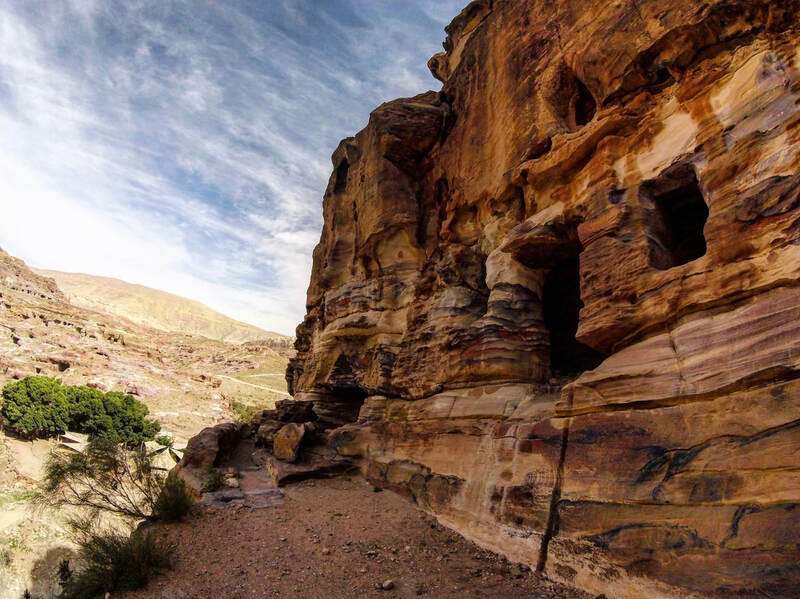 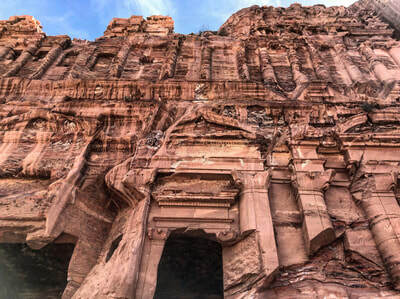 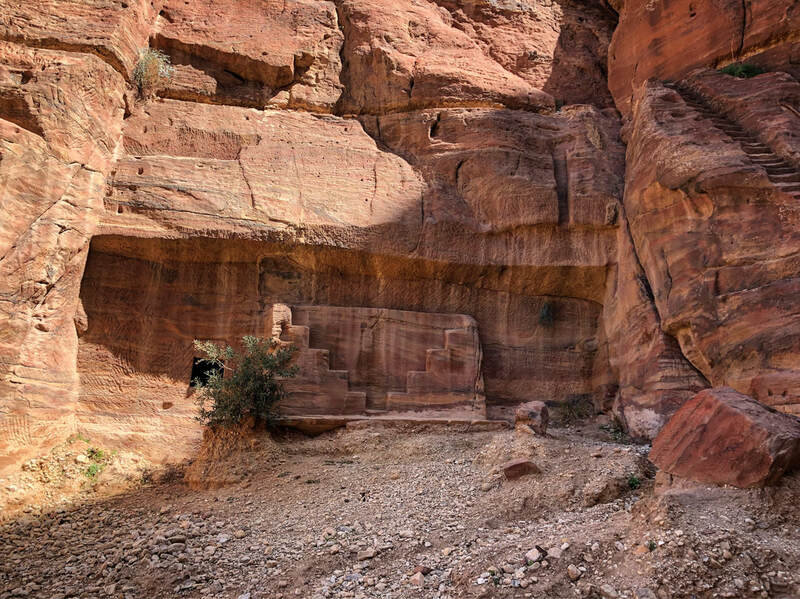 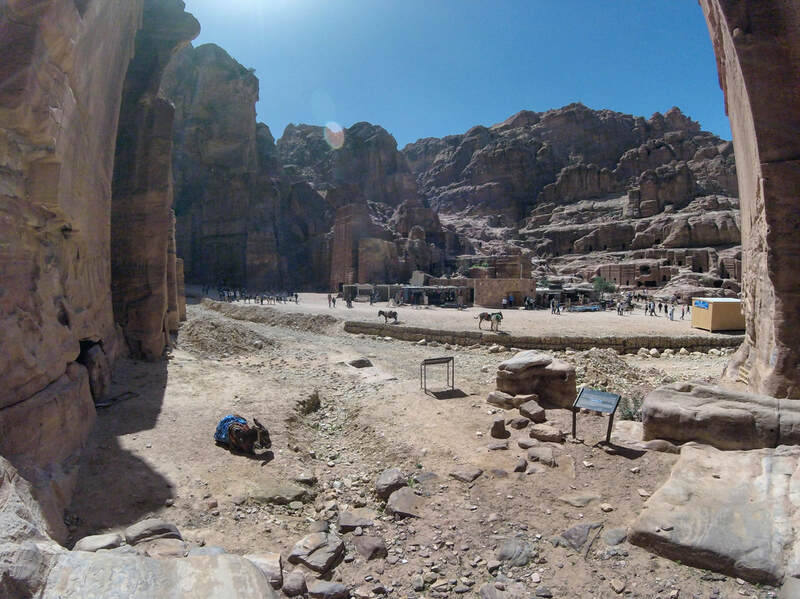 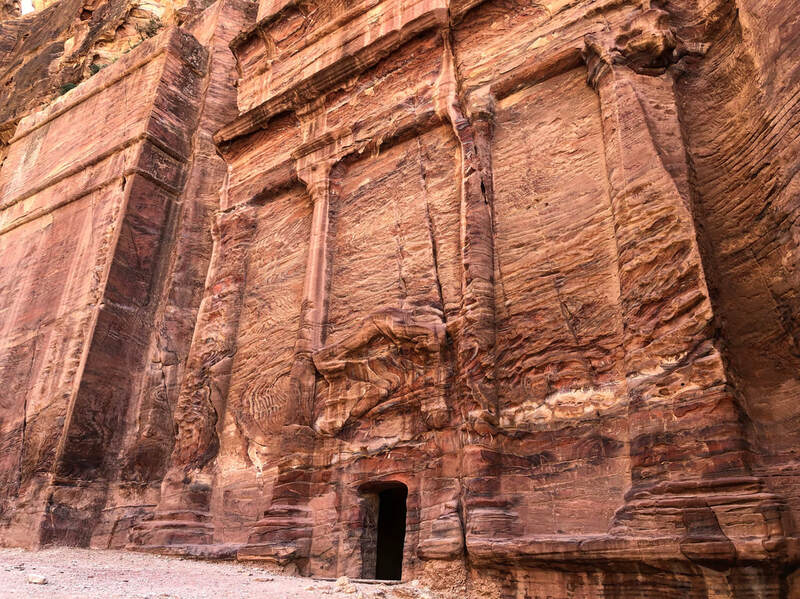 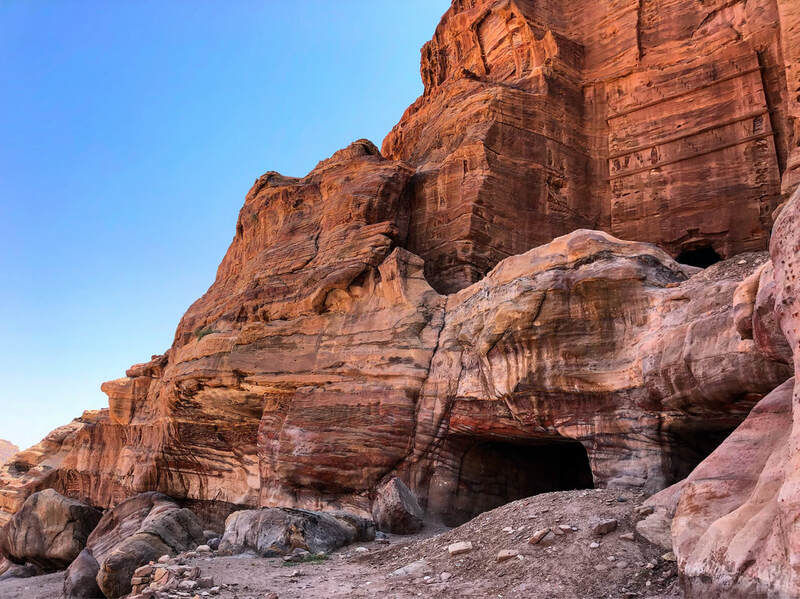 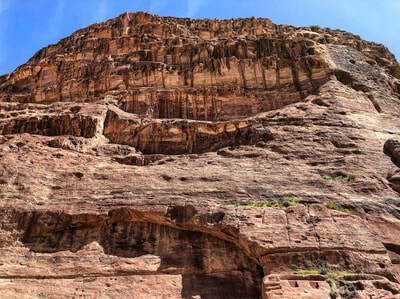 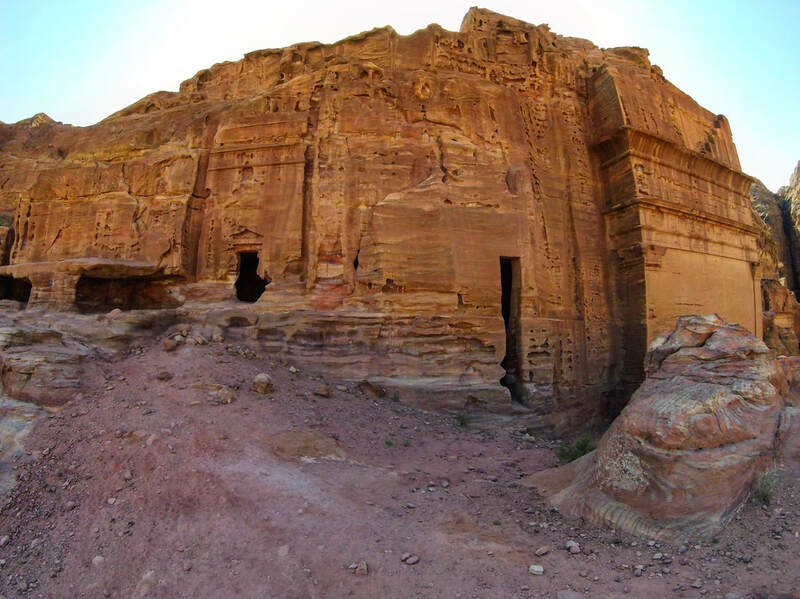 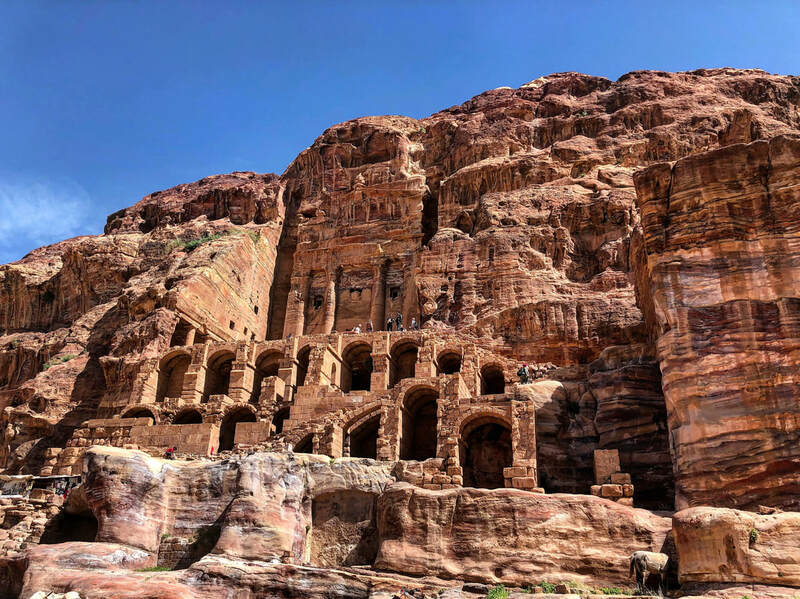 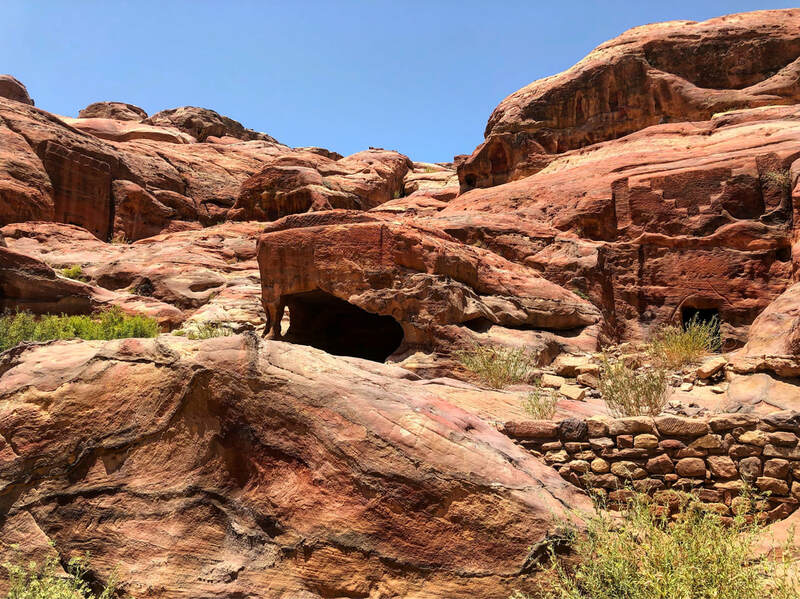 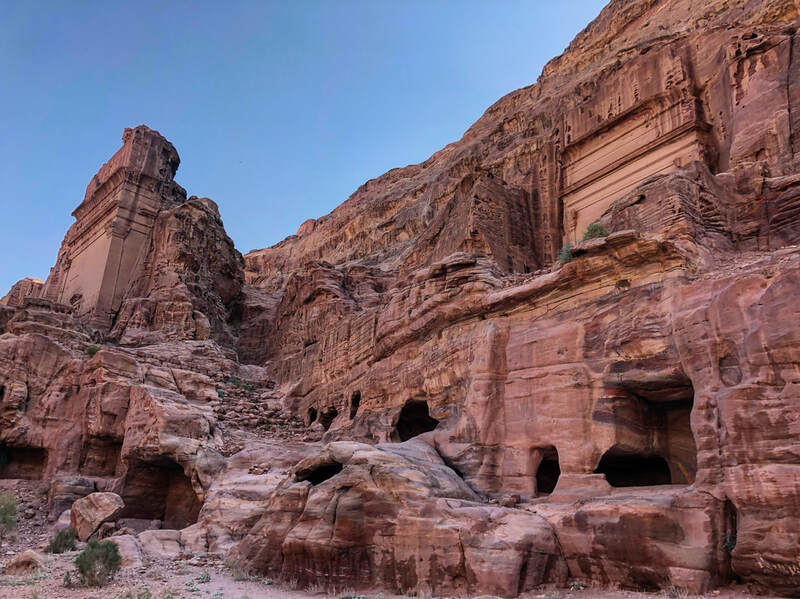 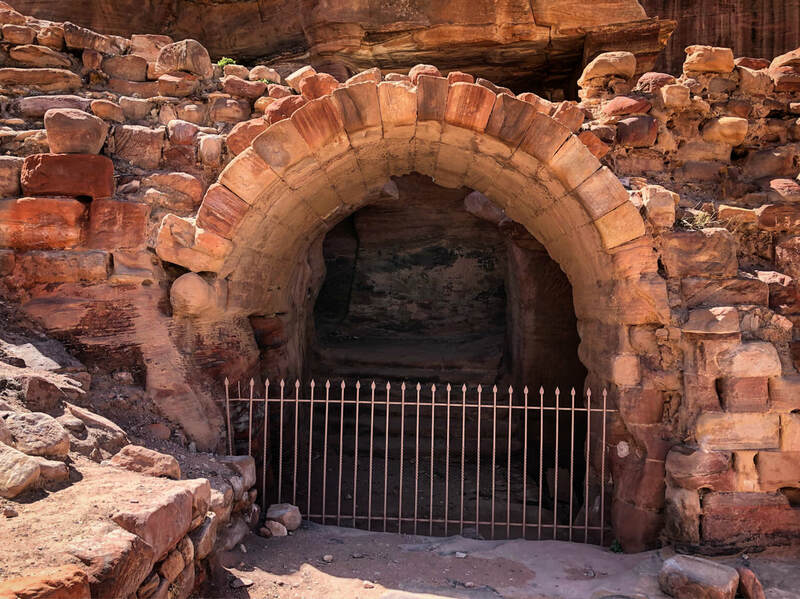 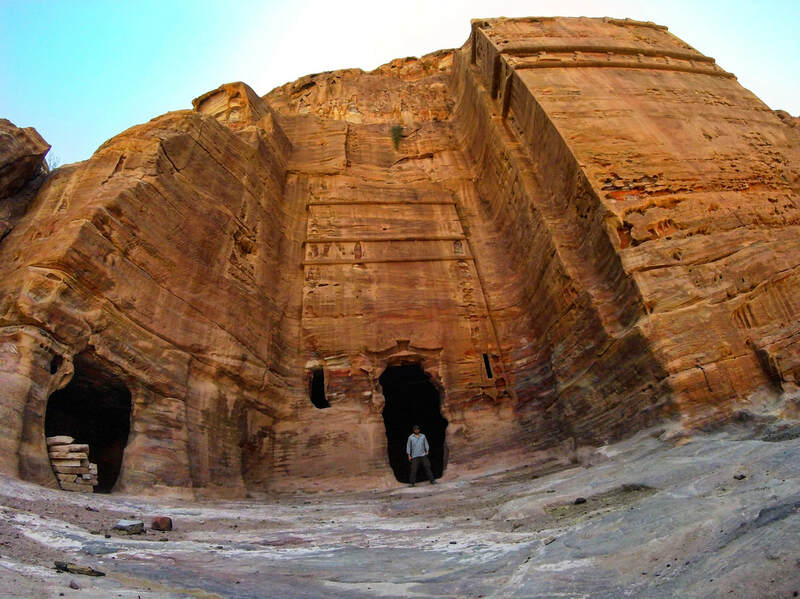 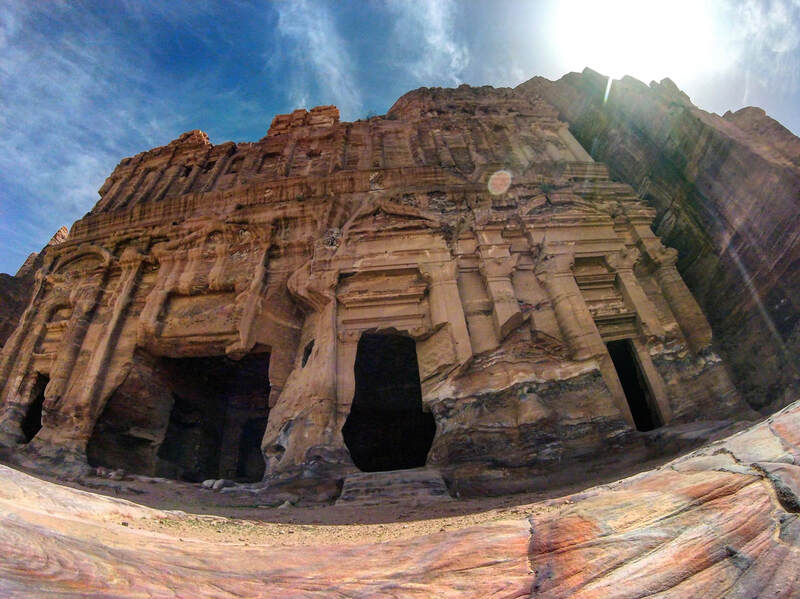 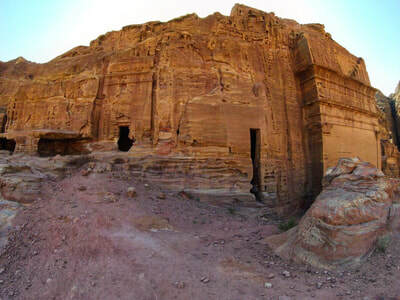 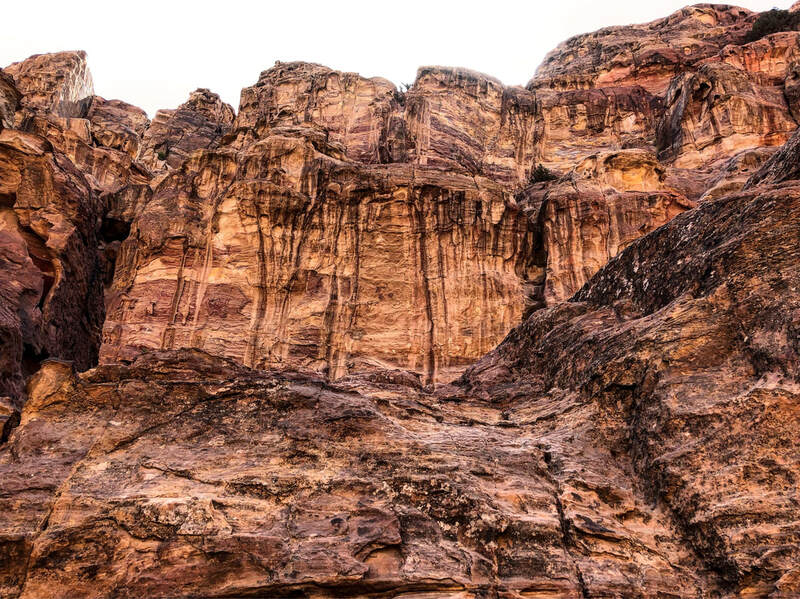 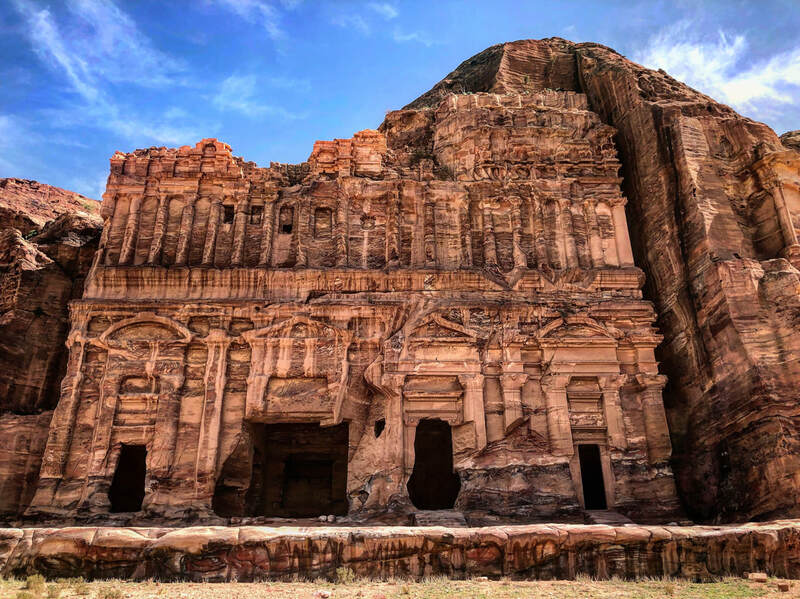 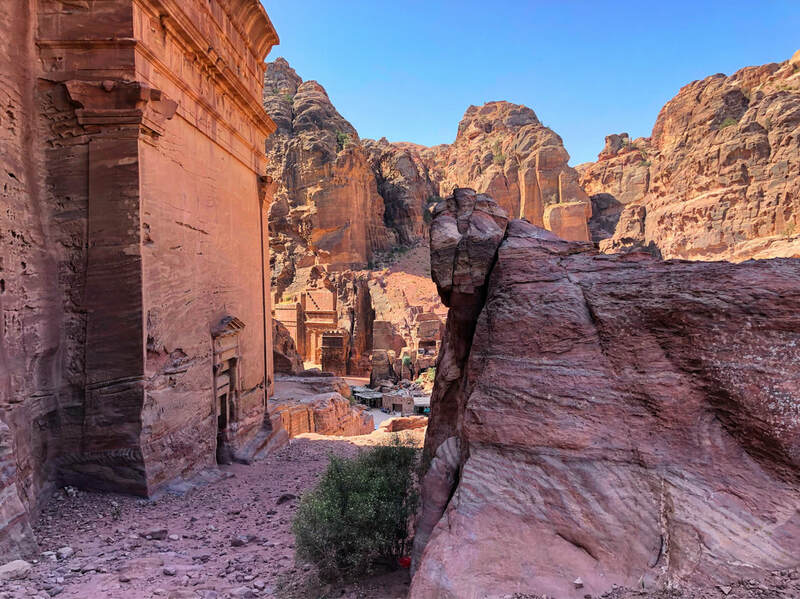 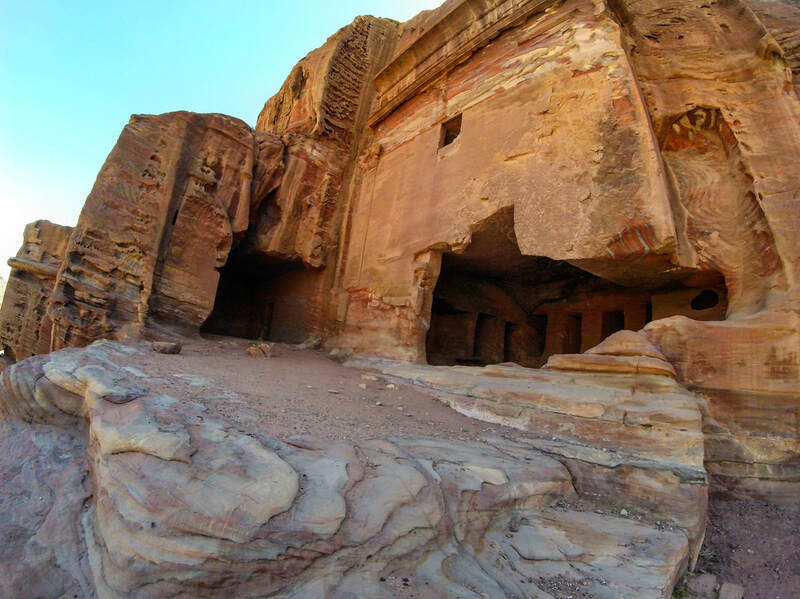 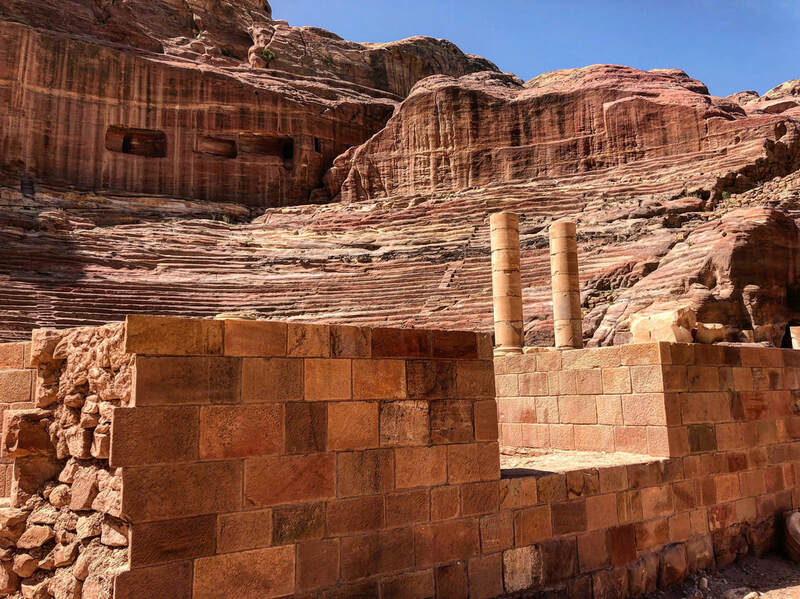 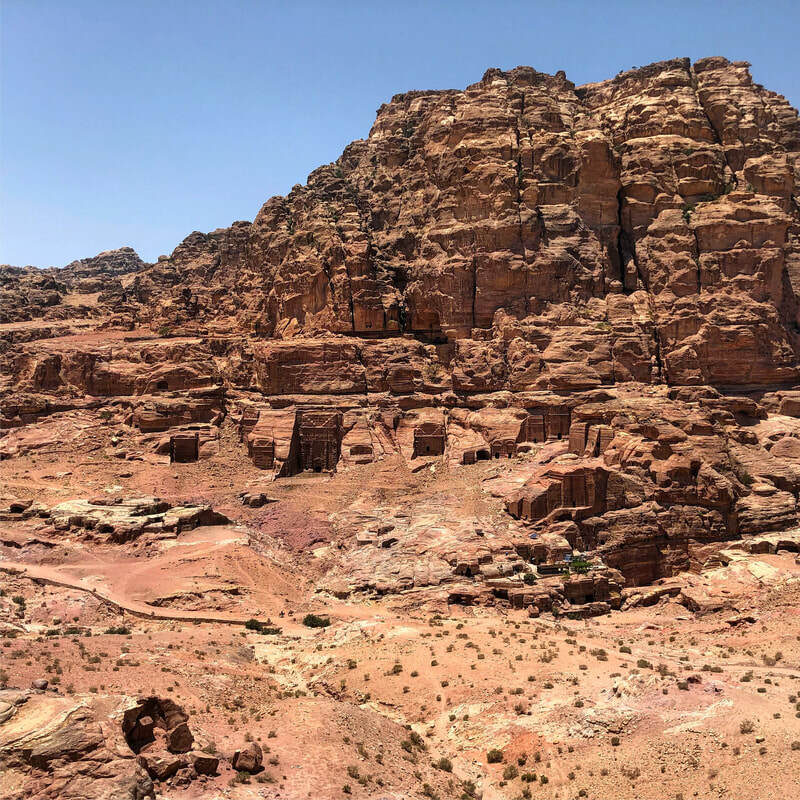 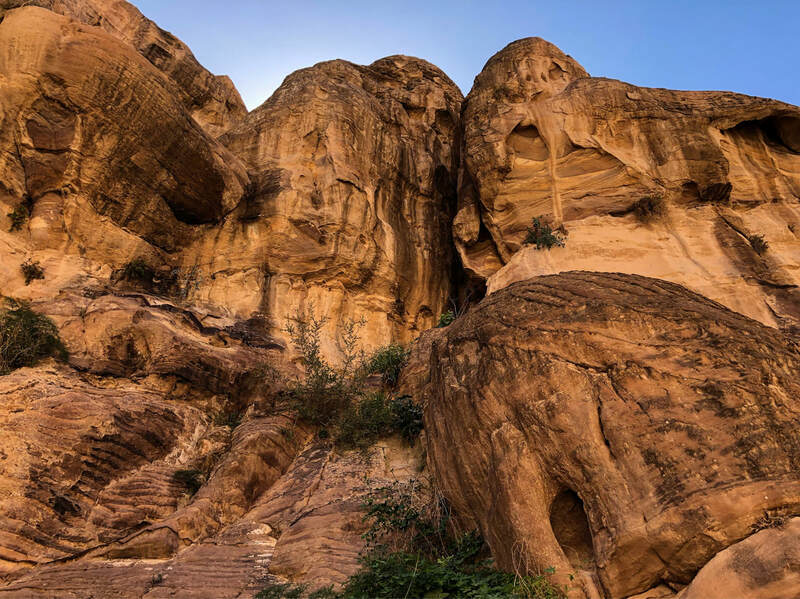 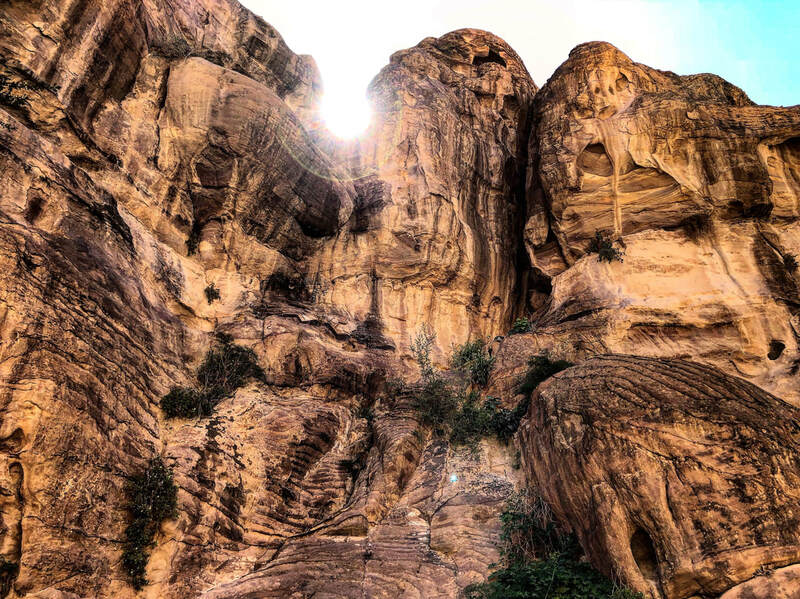 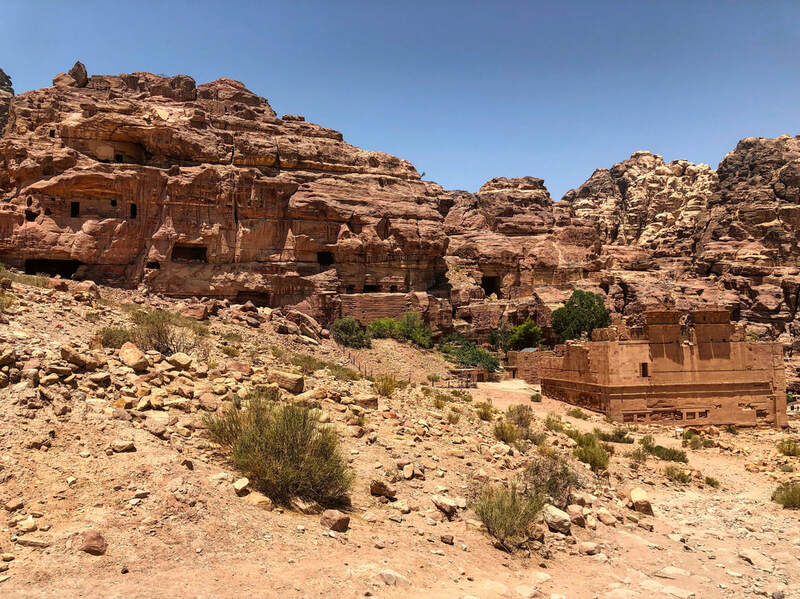 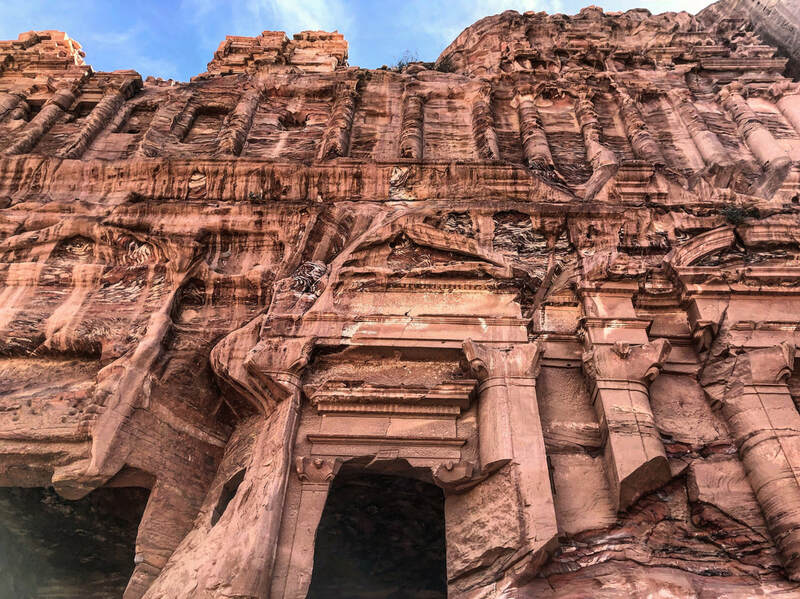 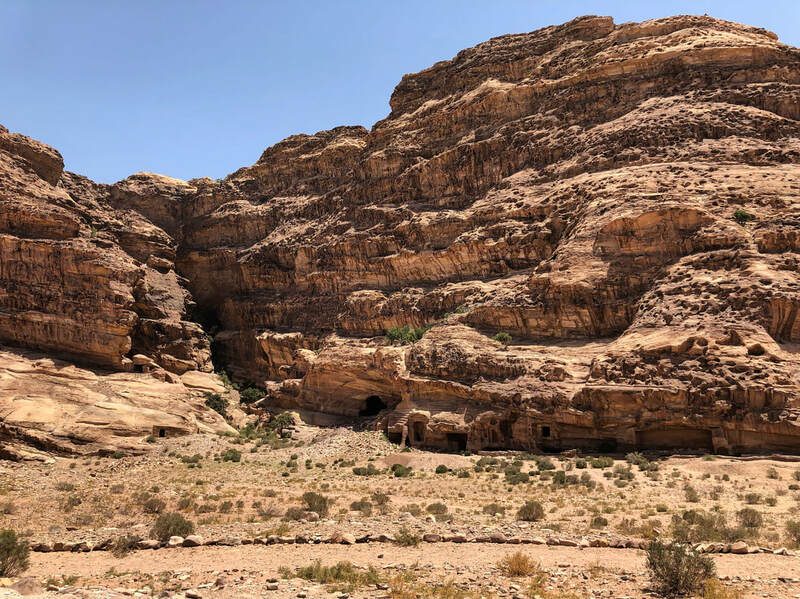 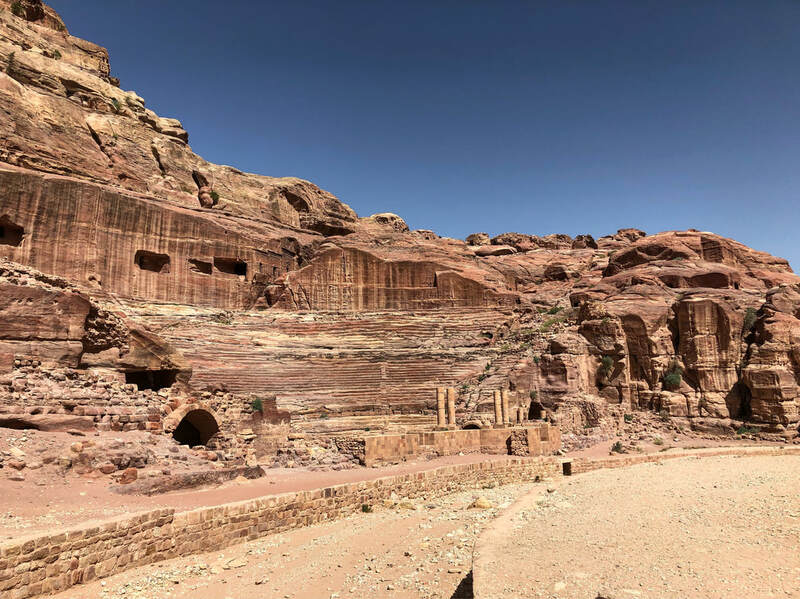 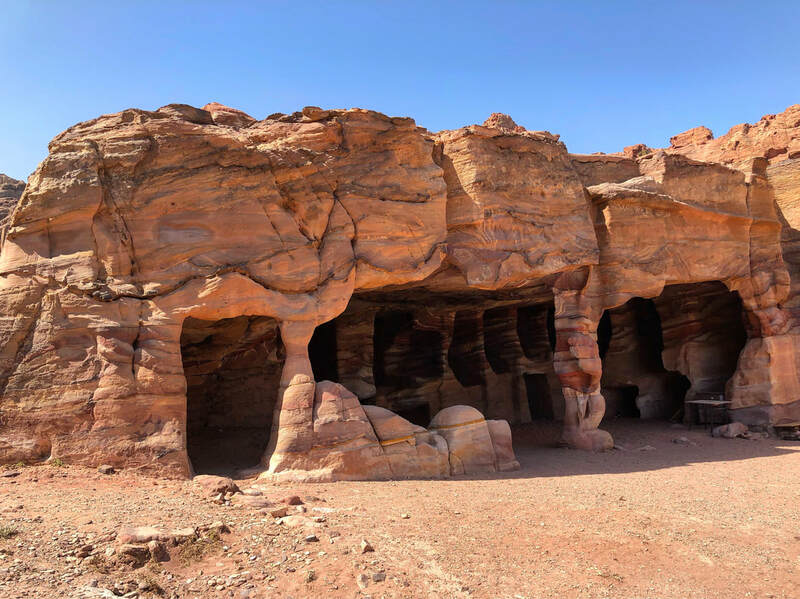 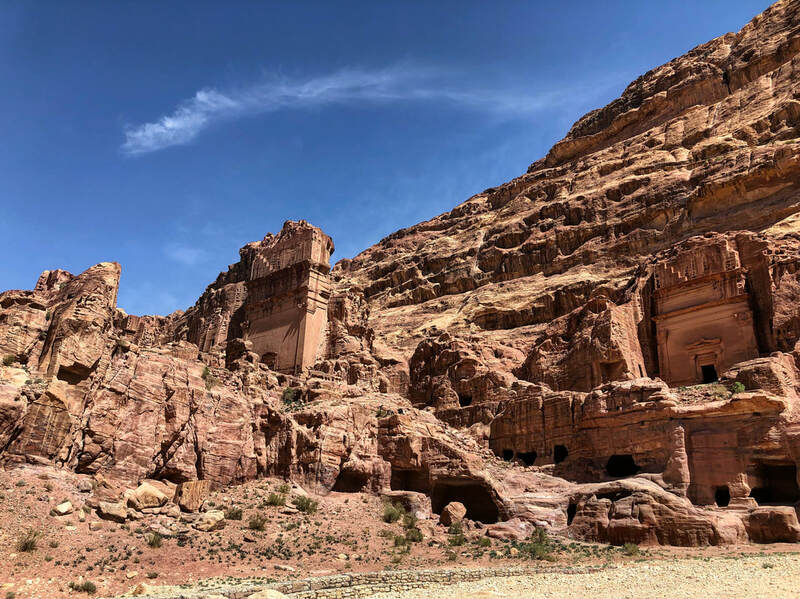 ​Although there are thousands of buildings carved into the rock within Petra, The Royal Tombs might be the most impressive collection of larger structures still intact within close proximity of each other. 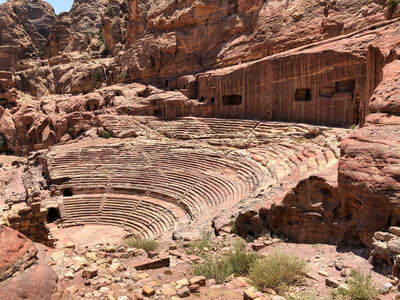 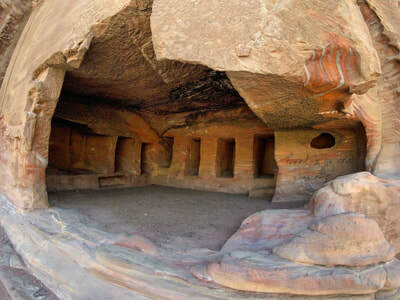 You will notice the architecture of these buildings is similar to others located within Petra. 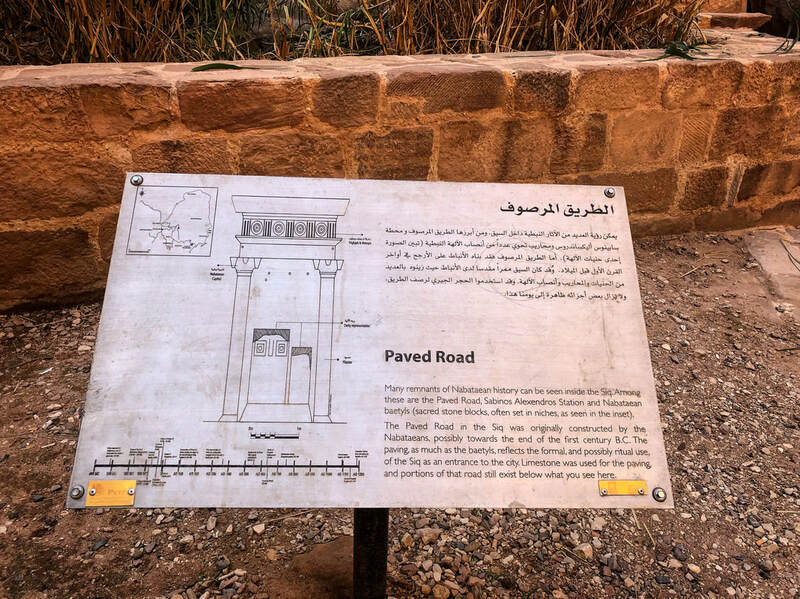 As you continue your adventure from The Royal Tombs to The Monastery, you will find yourself walking down an ancient road known as The Colonnade Street. 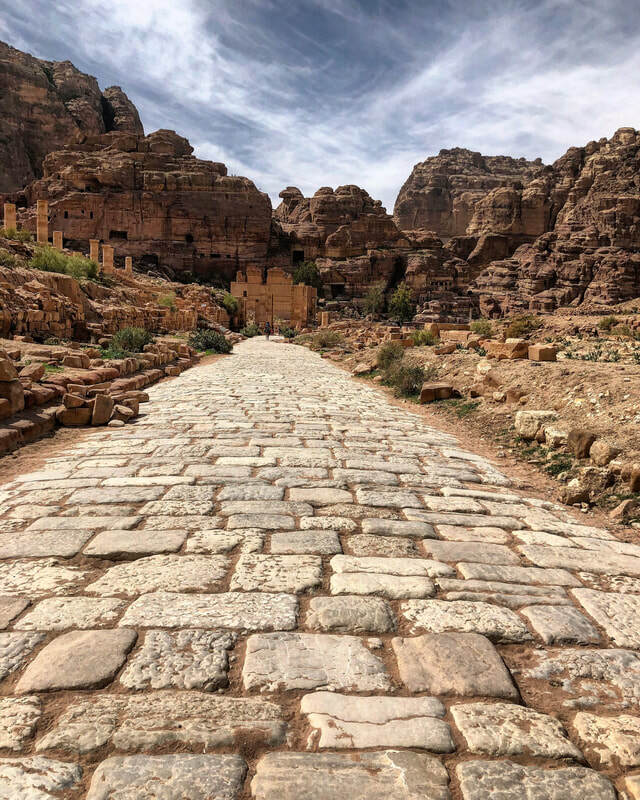 This whole area, to include the road, is badly damaged from centuries of natural disasters, but it is still possible to imagine how impressive this street would have been during its prime. 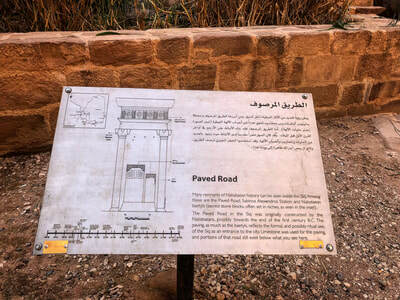 encounter larger sections of the original road along with remnants of pillars that once towered high above the street. 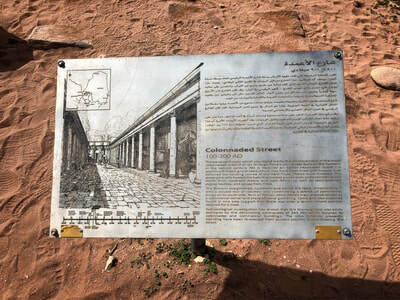 It is believed that this area housed many storefronts and other merchant ​shops. 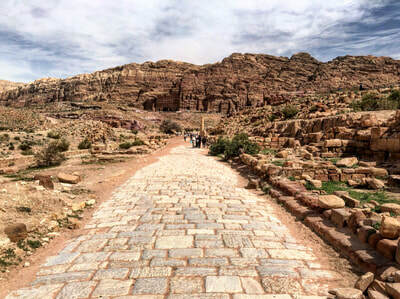 This was also the main path used to access some of the ancient holy places. Large titles on the floor, which in some places are still level and smooth. Colored plaster covering on some of the standing walls within the interior, believed to have been part of the original construction. 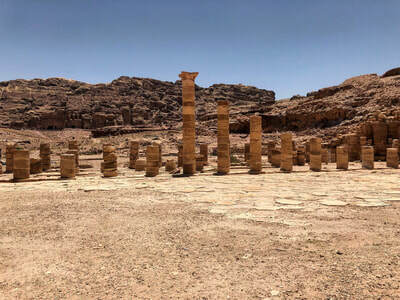 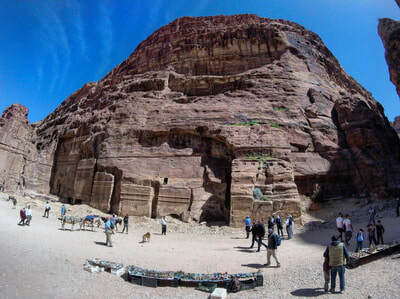 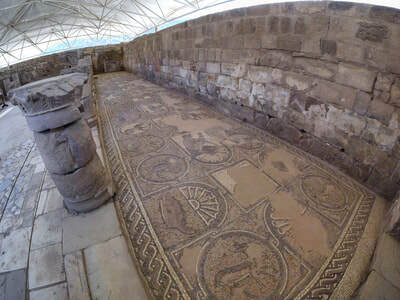 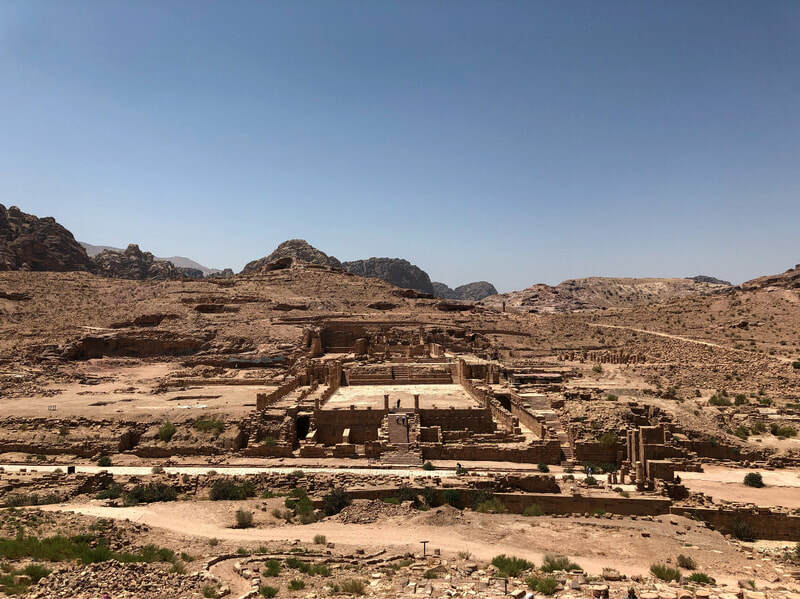 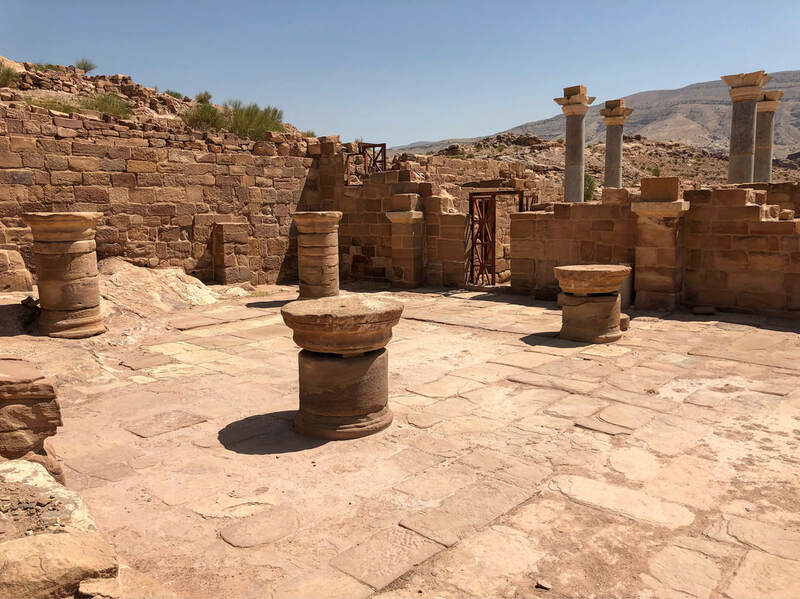 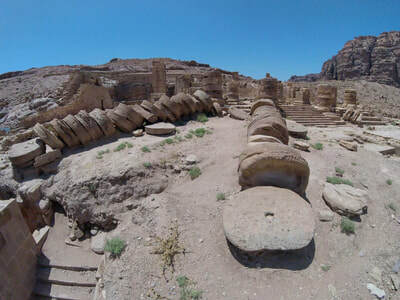 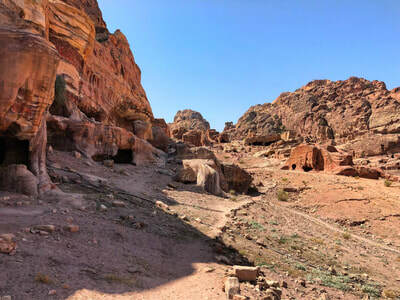 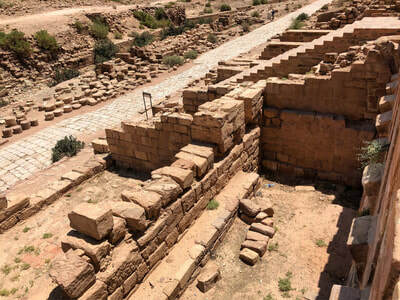 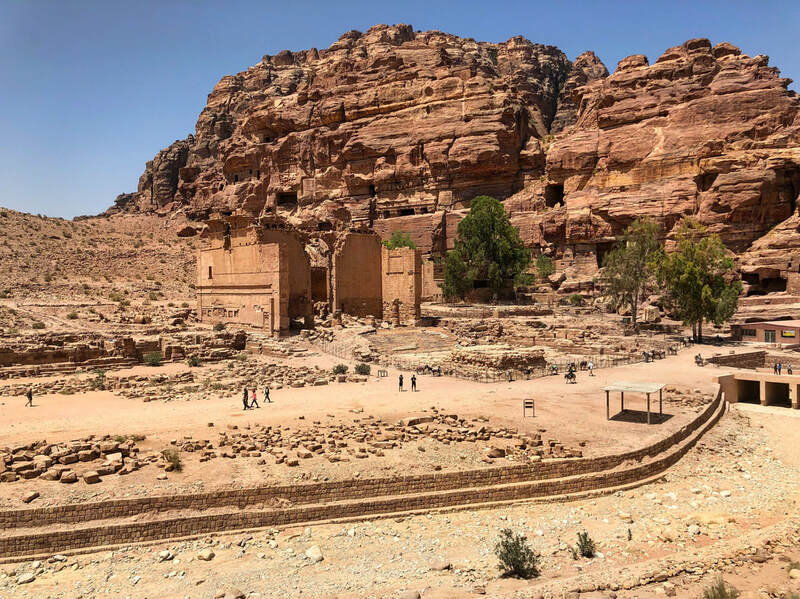 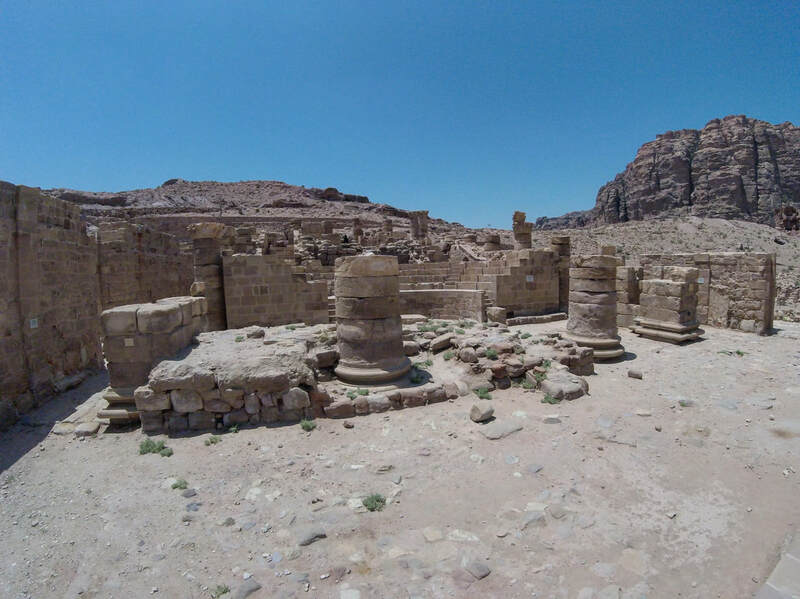 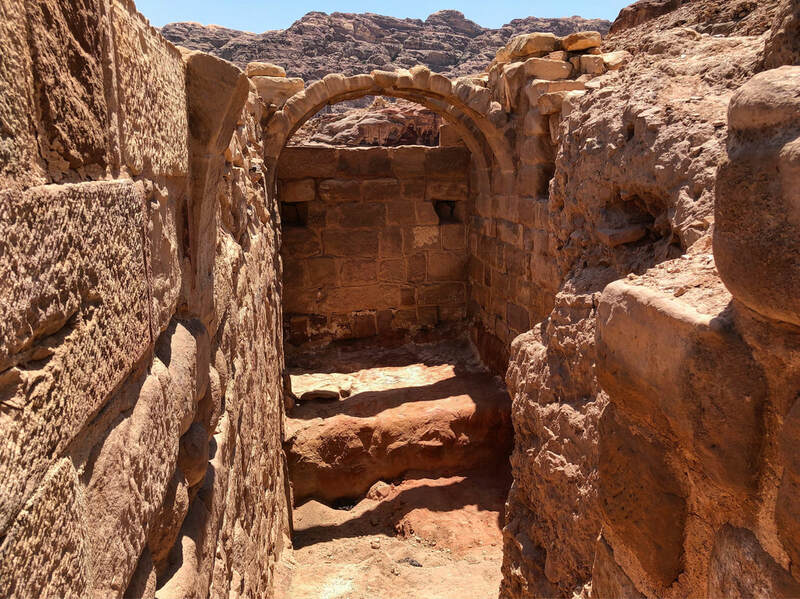 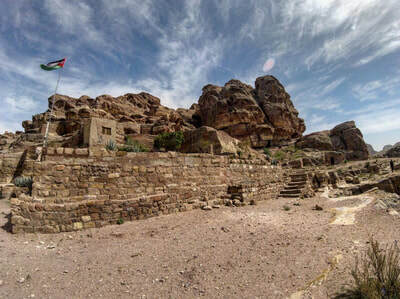 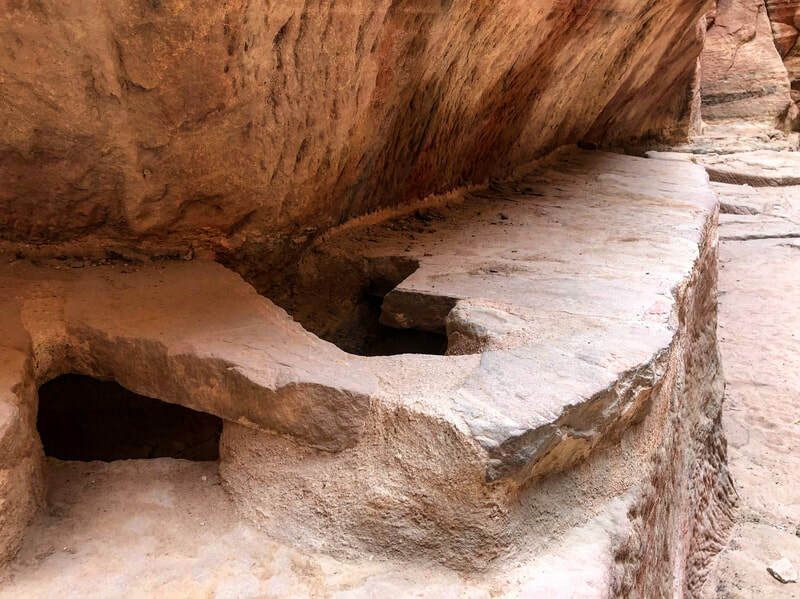 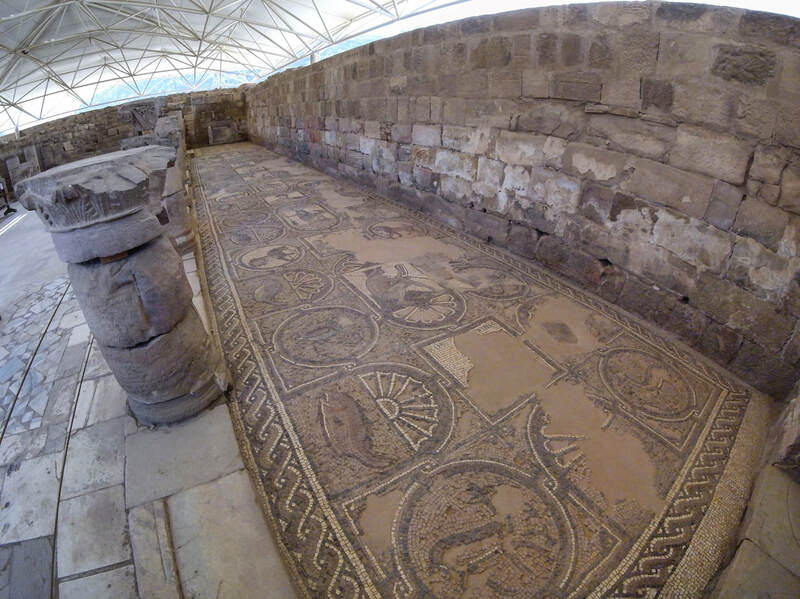 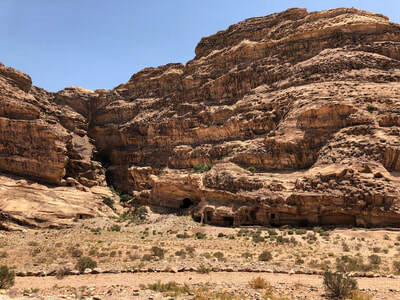 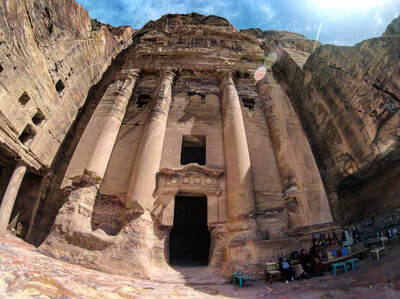 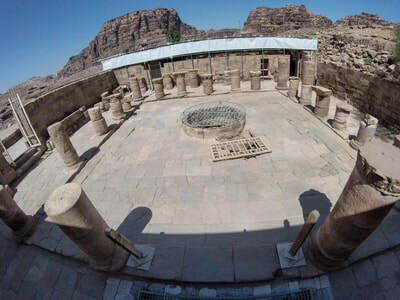 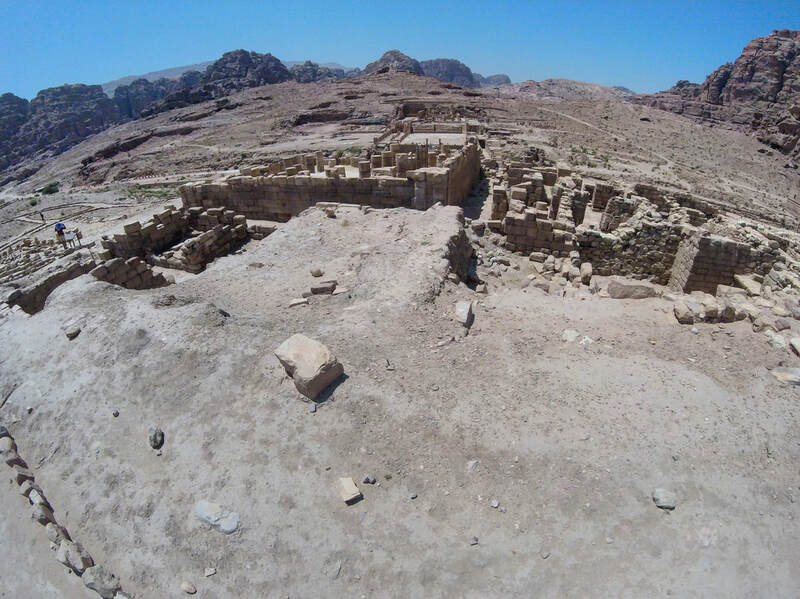 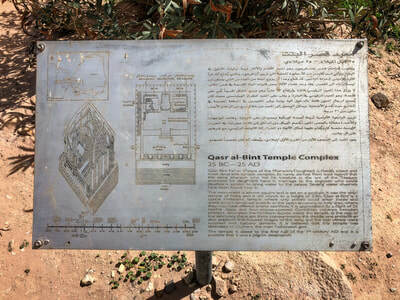 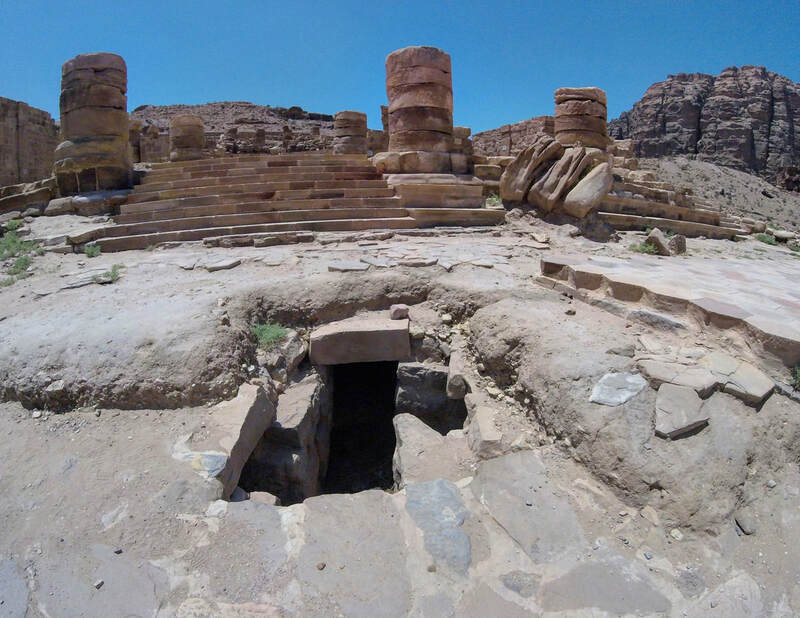 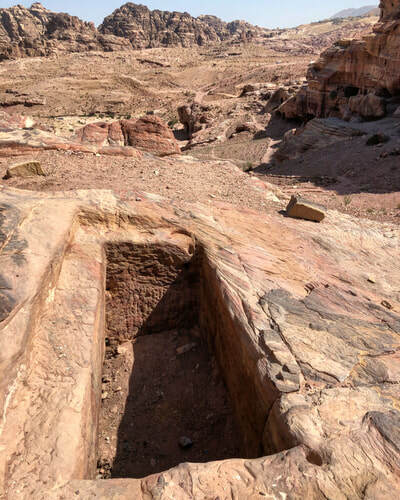 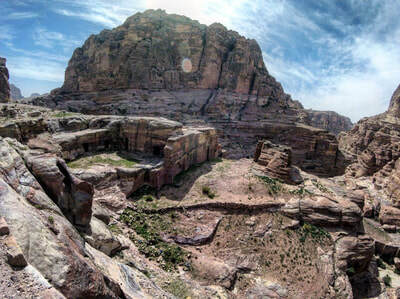 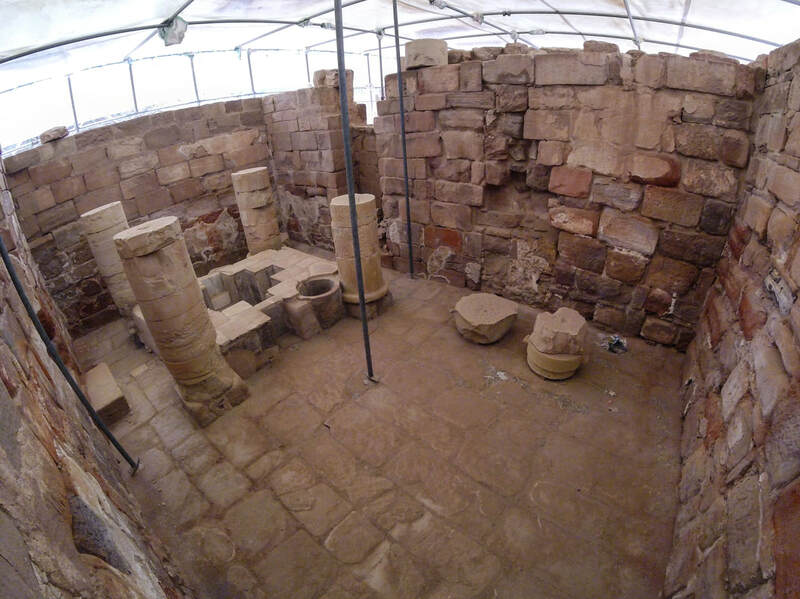 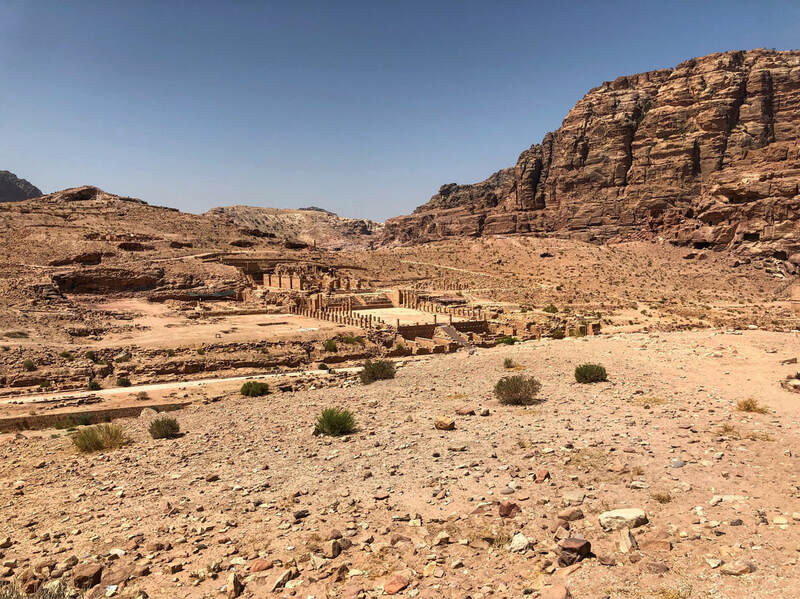 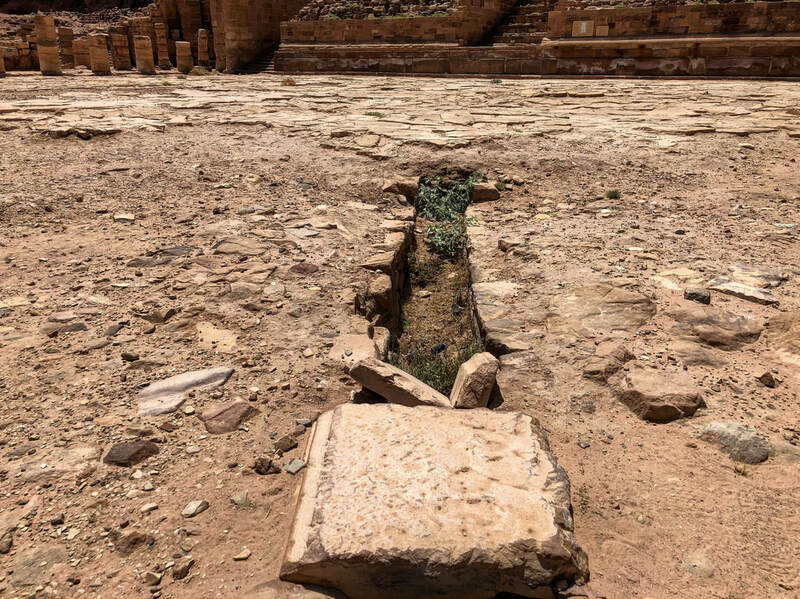 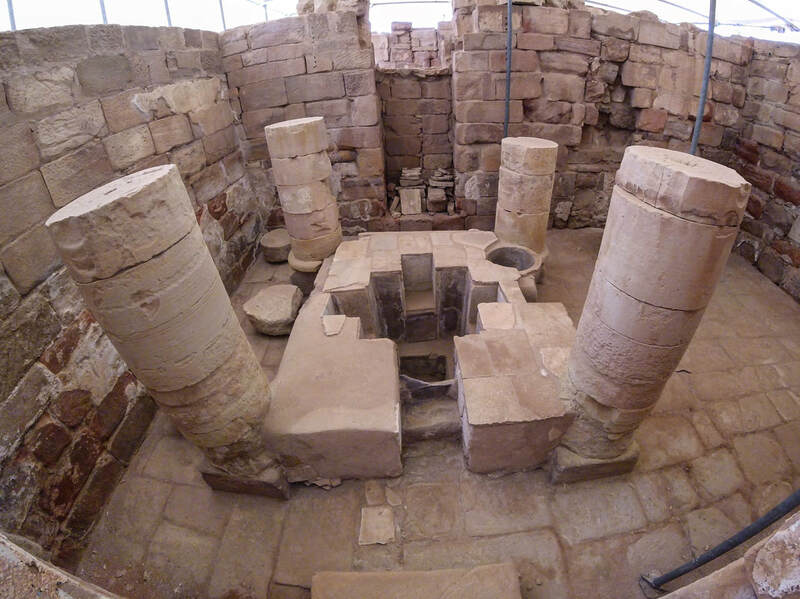 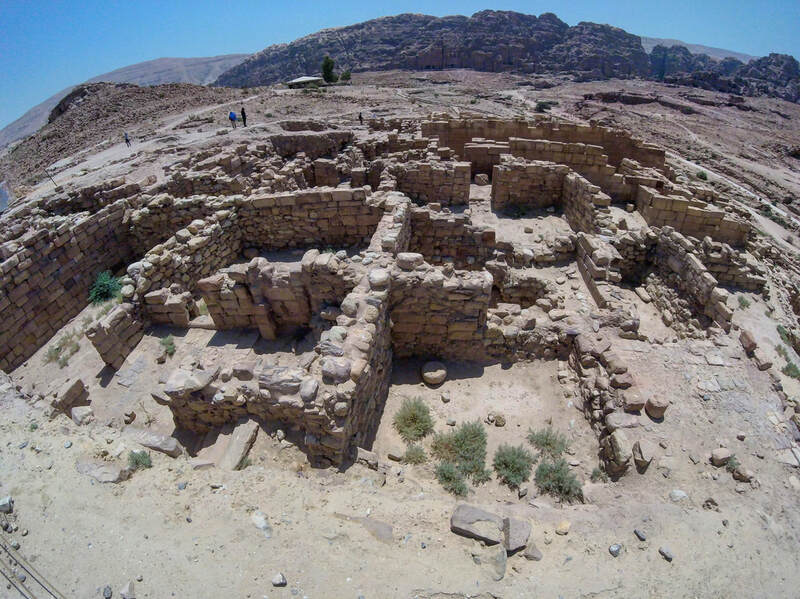 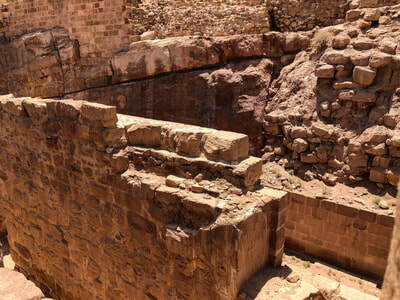 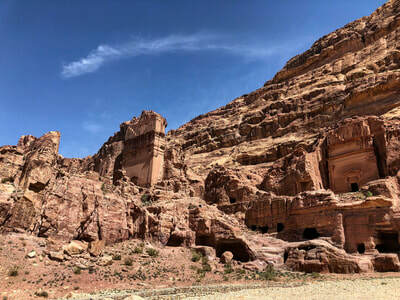 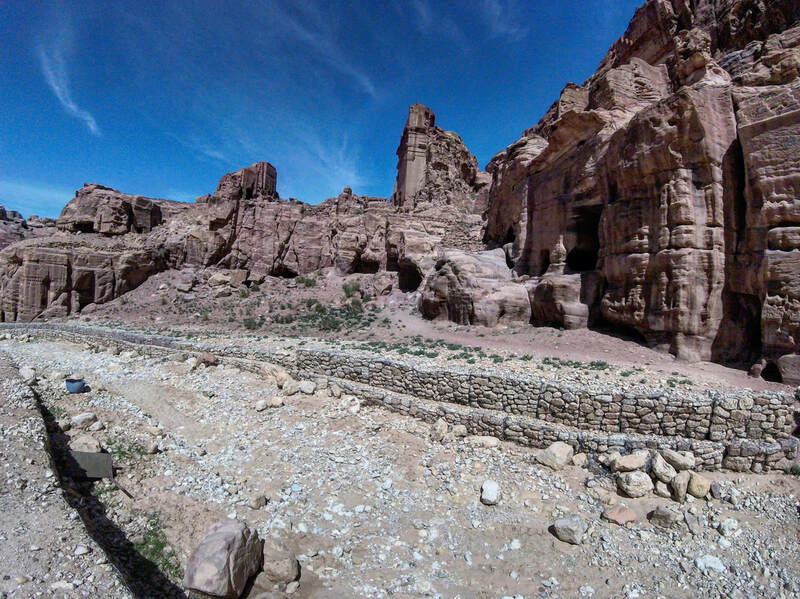 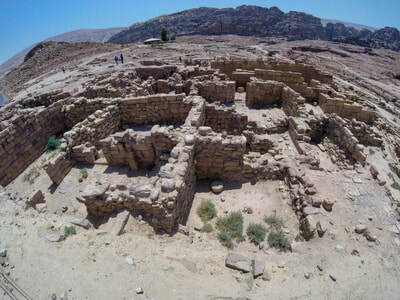 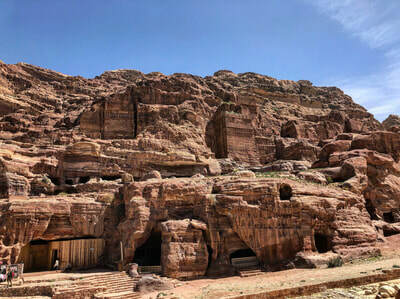 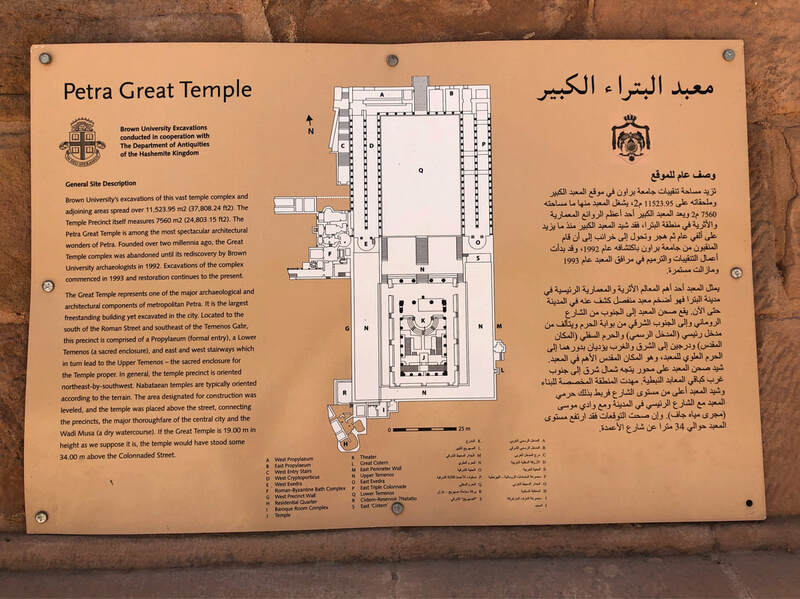 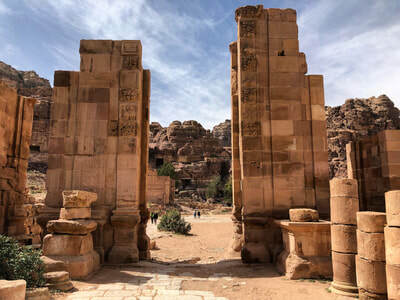 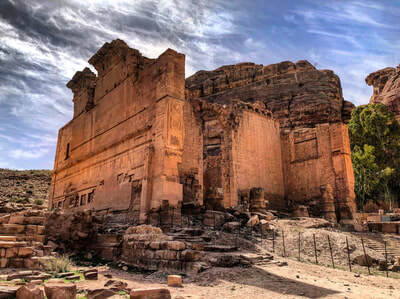 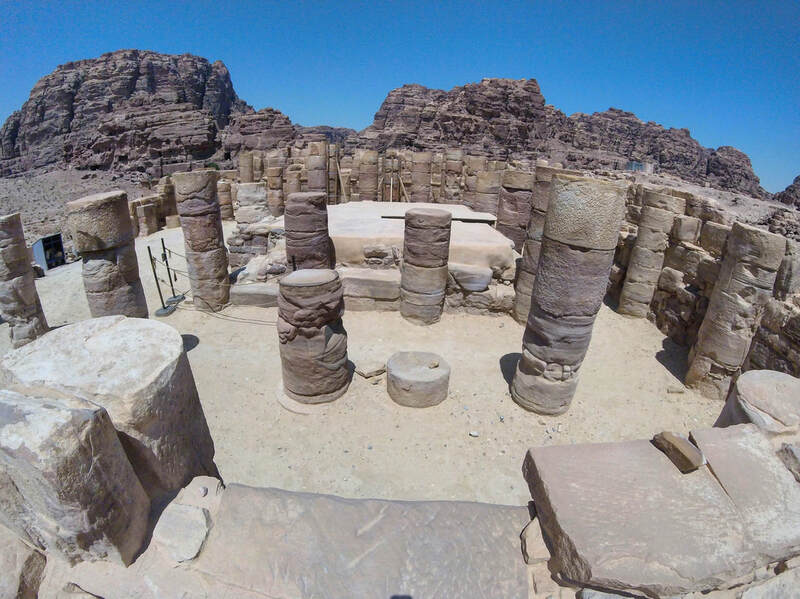 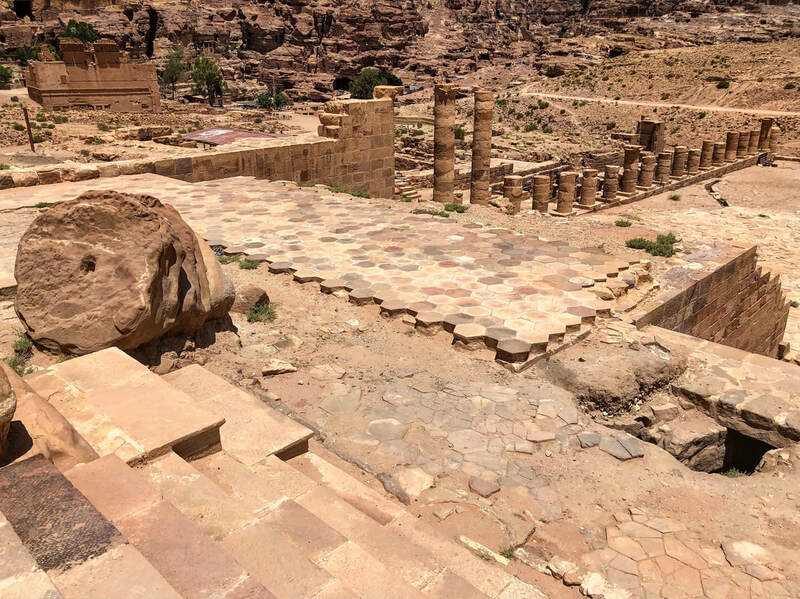 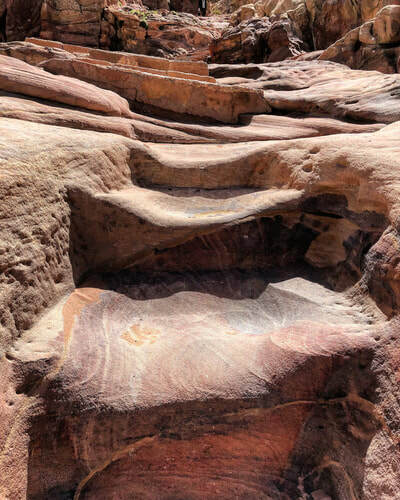 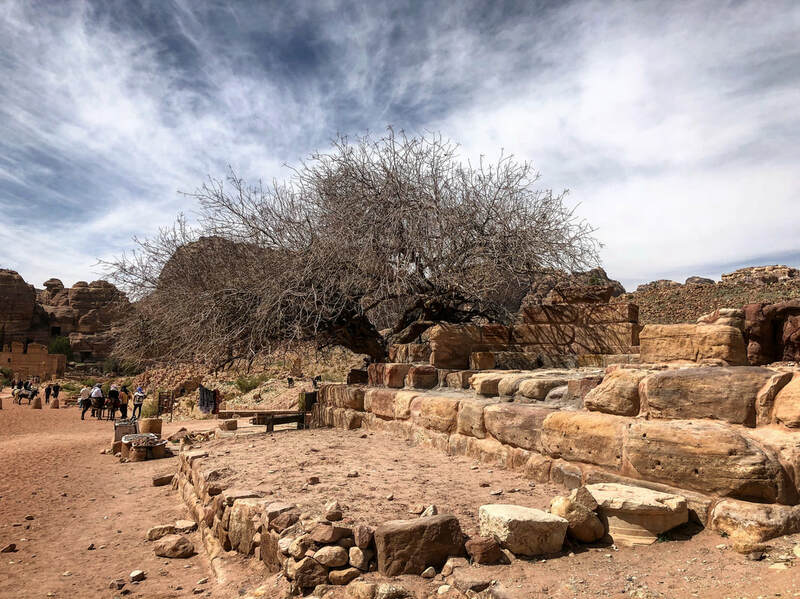 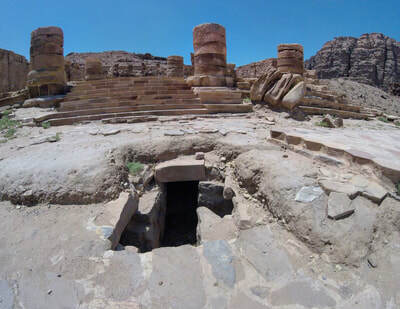 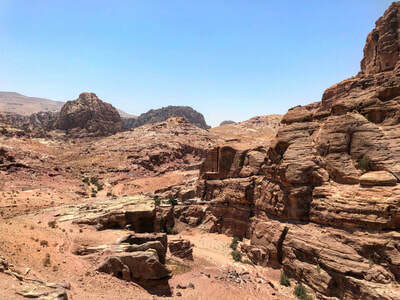 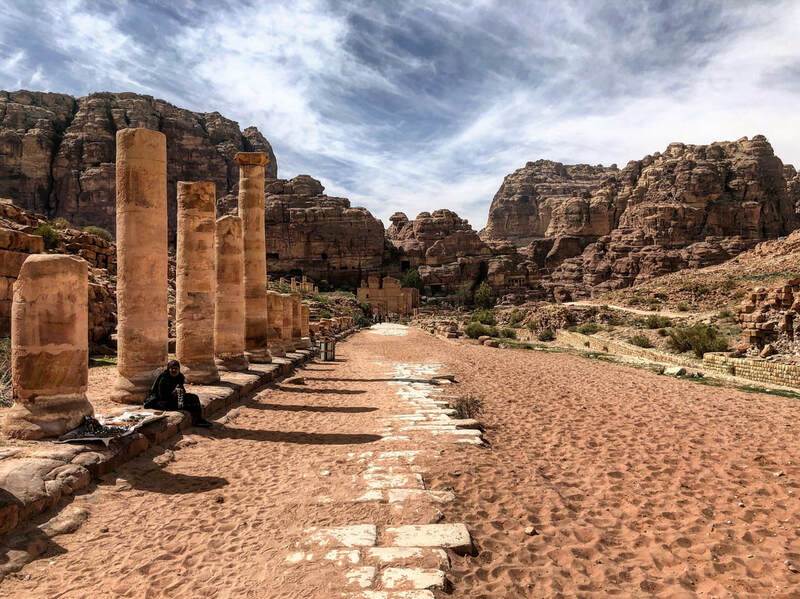 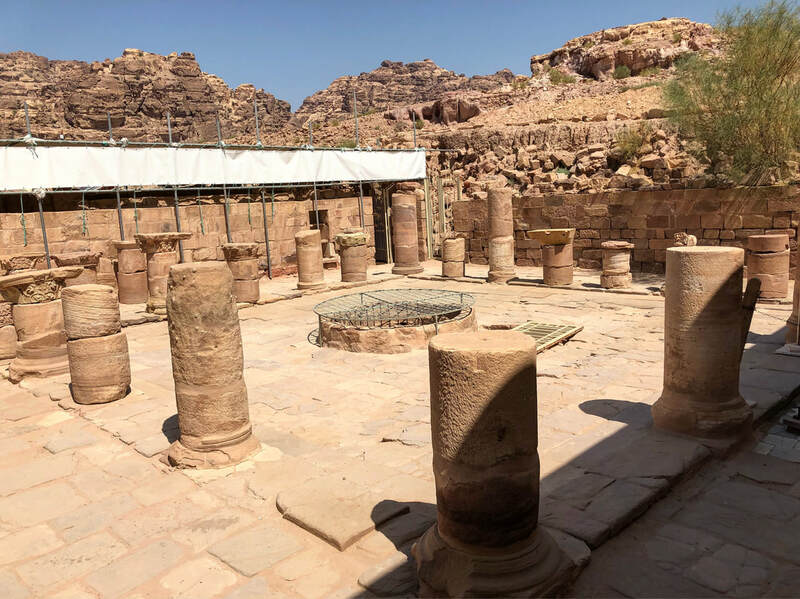 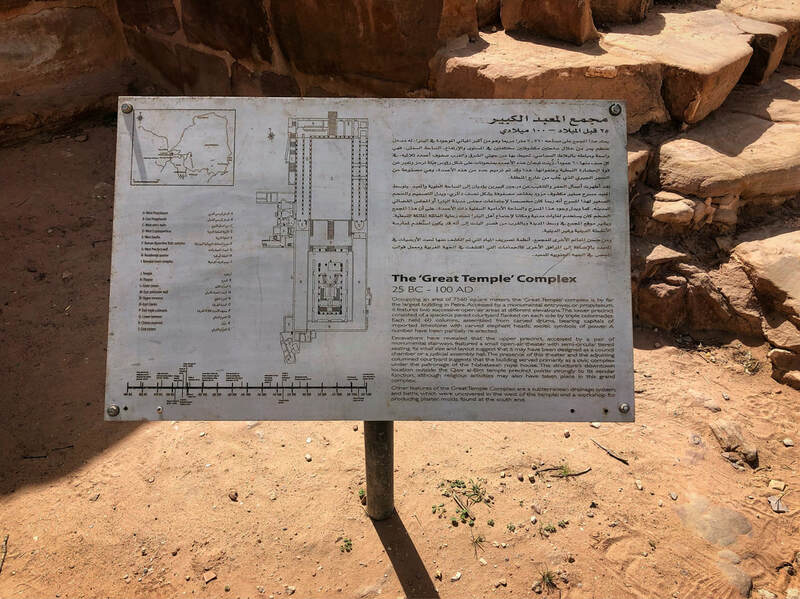 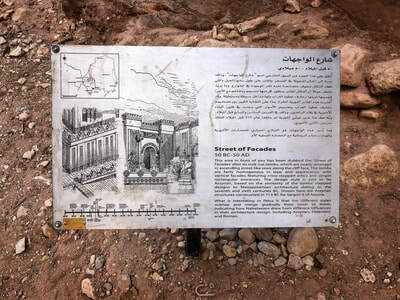 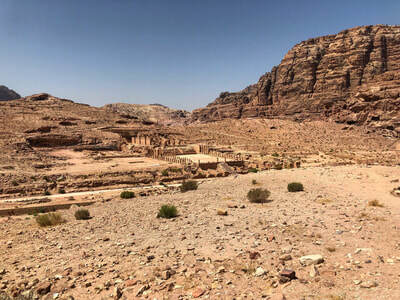 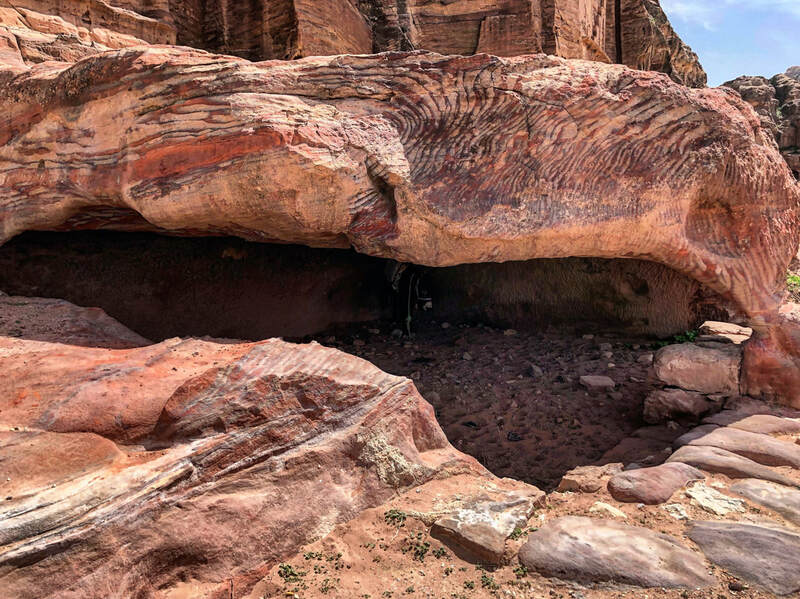 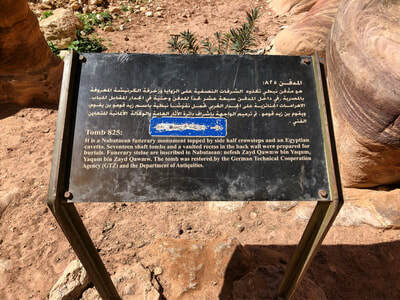 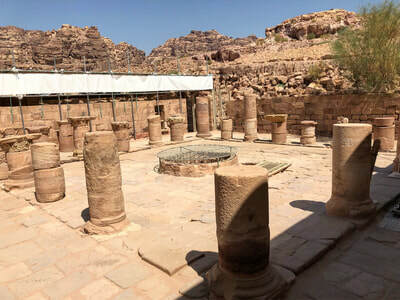 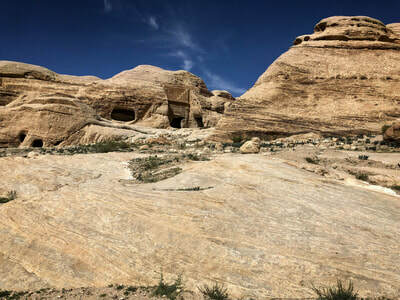 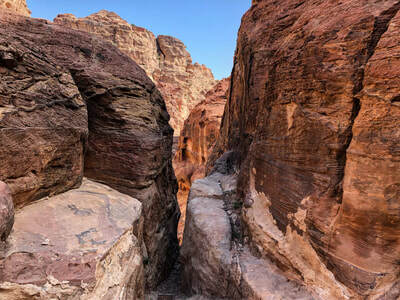 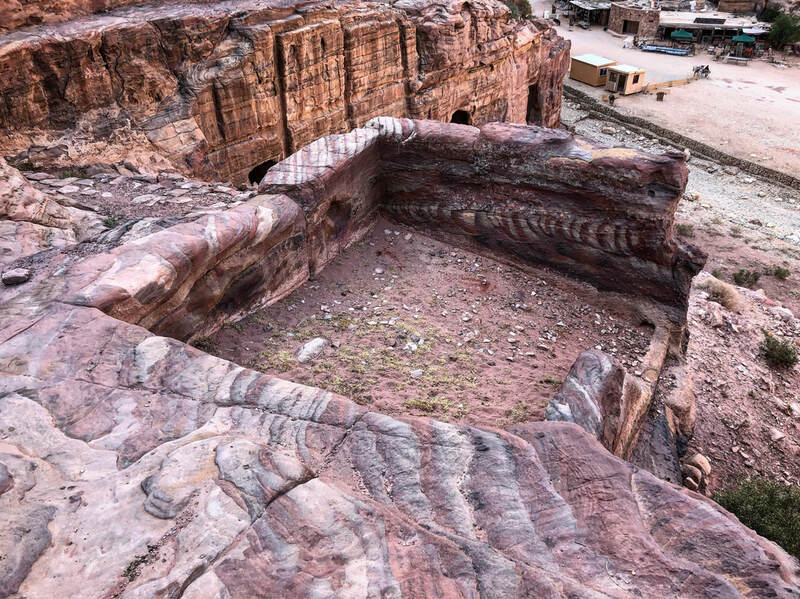 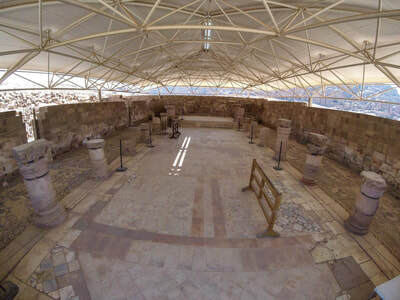 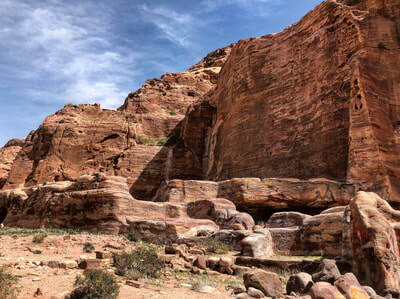 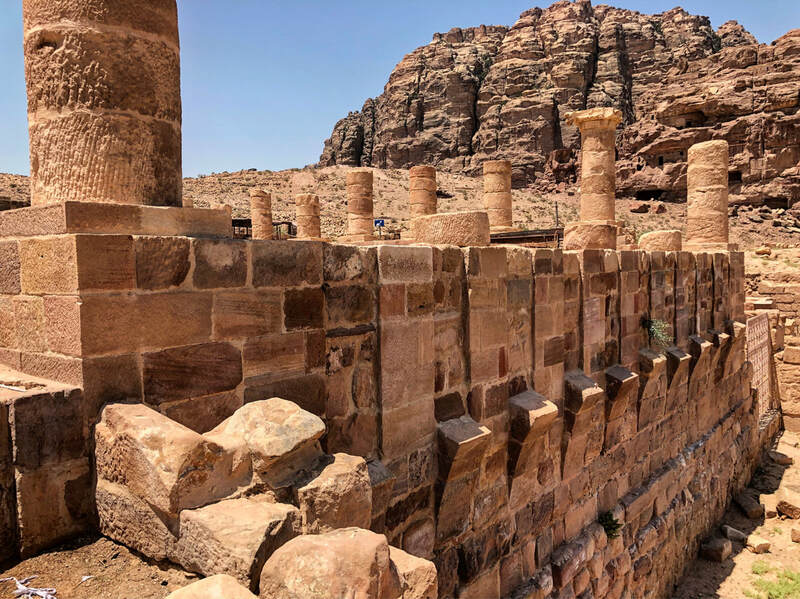 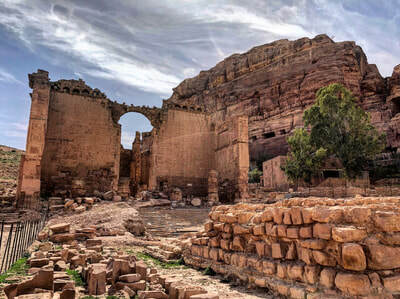 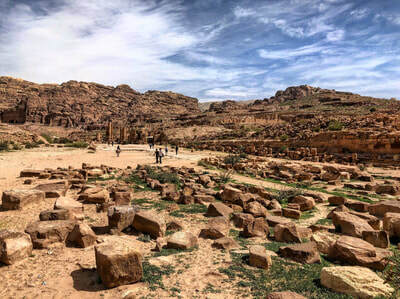 It is speculated that there were gardens and pools located near or around The Great Temple, along with other public gathering places within Petra. Using different tools, to include Ground Penetrating Radar (GPR), archeologists have discovered what could be remnants of these still barred beneath the earth. 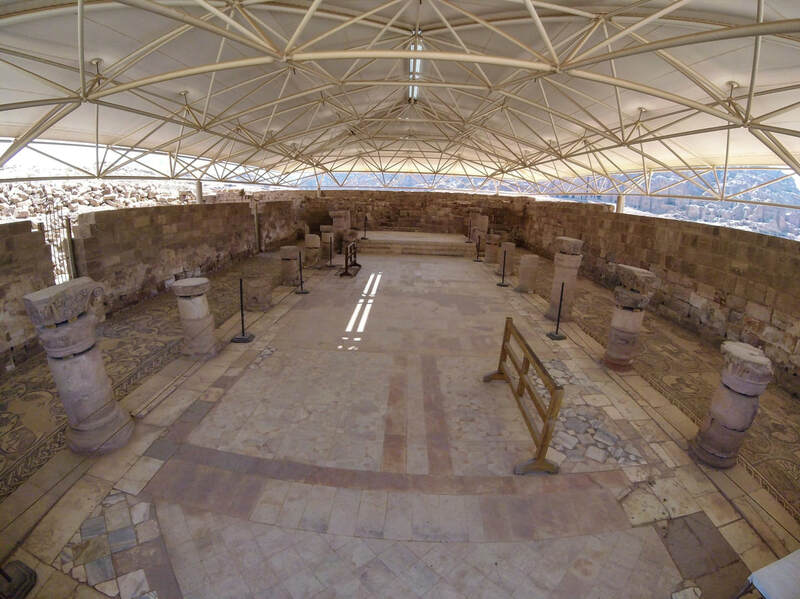 One of the final structures you will encounter is known as The Temple of Dushares. This solitary building is located on the left directly off of The Colonnade Street before making the turn towards The Monastery. 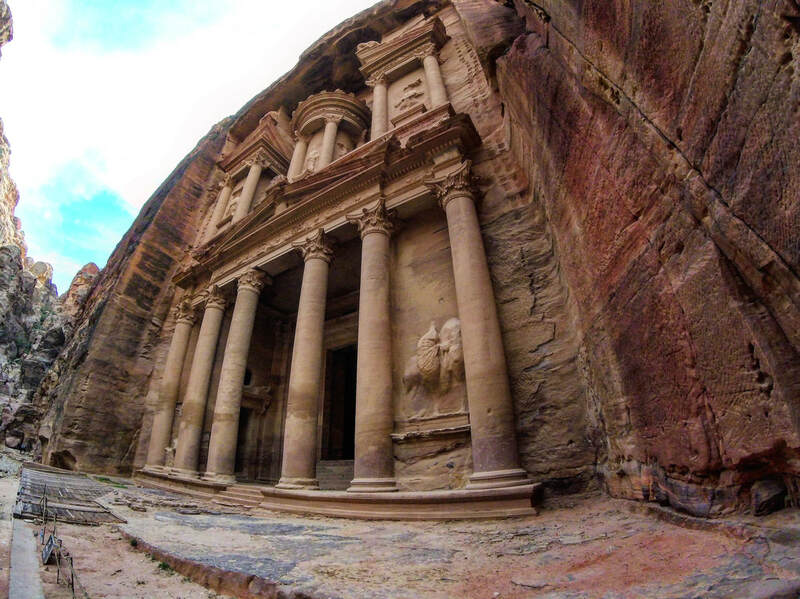 Pictures do not do this building justice. 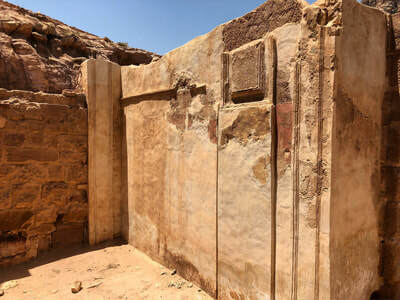 Most of the exterior walls are still in place but are badly damaged. This is another restricted area that is fenced off to the public. 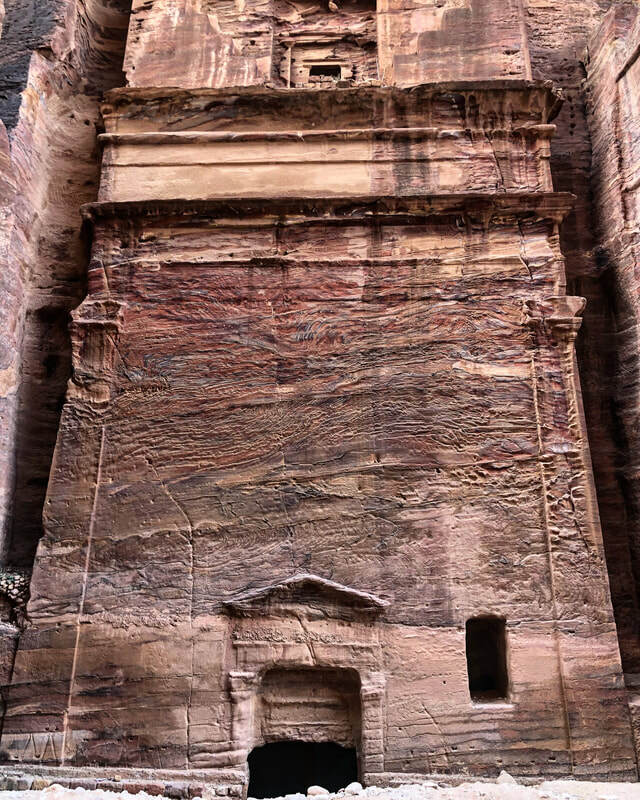 I would imagine this is in part due to restoration efforts and the potential for falling debris. 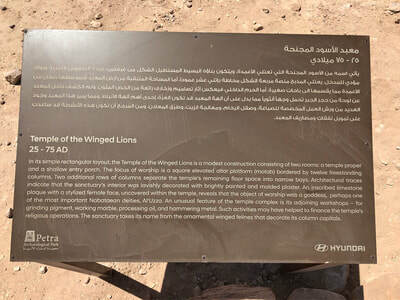 Our next scheduled stop for this article is also our last. 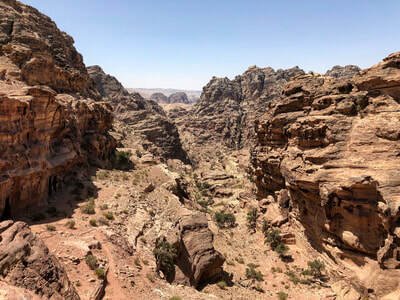 This next trek is not for the faint of heart, but the visual reward is well worth the struggle. 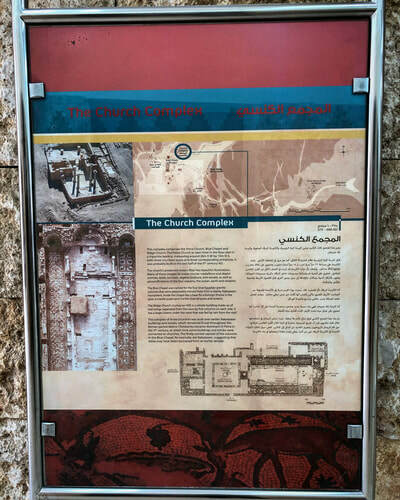 Here we will visit what is known as Al-Deir (The Monastery), but not before overcoming some obstacles. 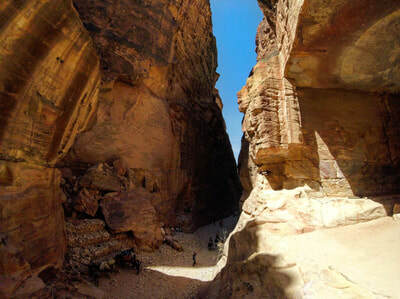 As you leave the built-up areas, the trail begins to meander and slightly narrow. Towards the end, you will notice a set of stairs leading up which eventually disappears into the hills. 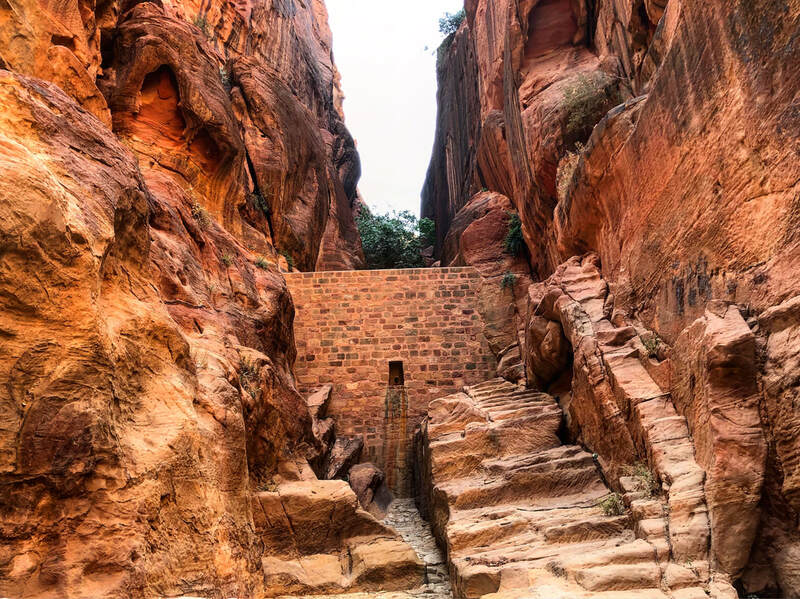 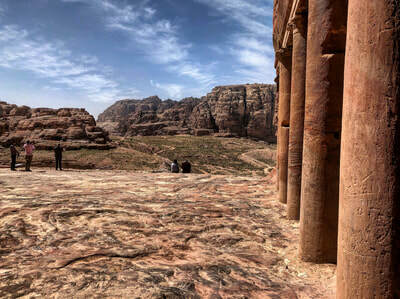 This is the beginning of the climb to The Monastery, one of the largest structures in Petra. The hike up is made possible due to approximately 850 stairs which have been cut and carved into the stone. 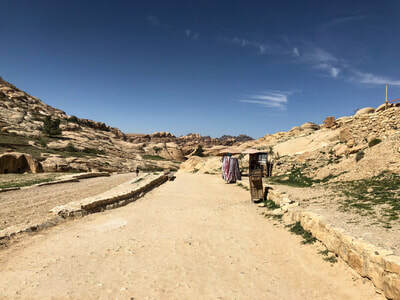 As you navigate up you will encounter rest areas, Bedouin shops (good source for bottled water), and donkeys moving people up and down the pathway. 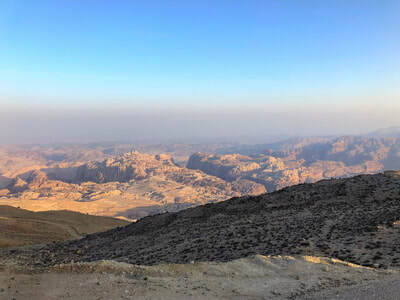 If it is a clear day, take advantage of the change in elevations every so often as the views looking back towards the city are breathtaking. 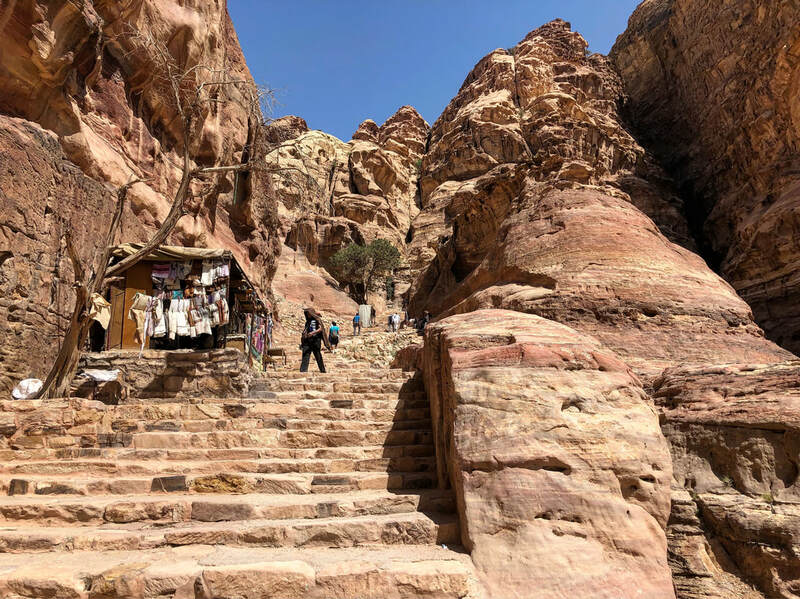 About halfway up you might start questioning your commitment to seeing The Monastery, but trust me, don't capitulate just yet. With legs burning and muscles sore, the stairs fade away and flat ground is finally in sight. Hidden to the right is the monument not everyone sees in person. 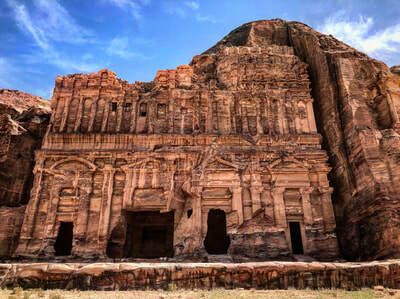 The Monastery, which stands approximately 148 feet (45 meters) tall and 160 feet (49 meters) wide, is beyond words. 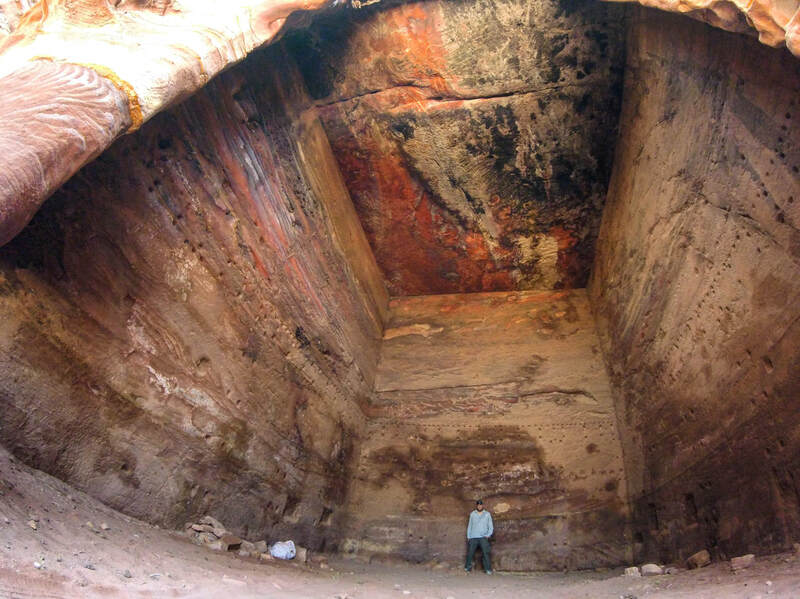 To help give you some perspective of just how large it is, below is a picture for scale. 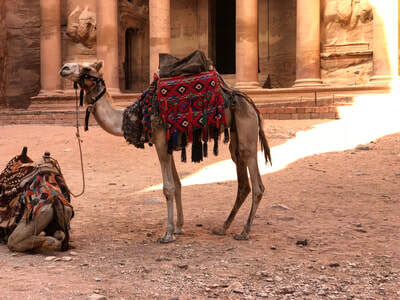 You will notice people sitting next to a camel which is standing to the left of the doorway. Just like so many structures here, pictures do not do it justice, especially with scale. 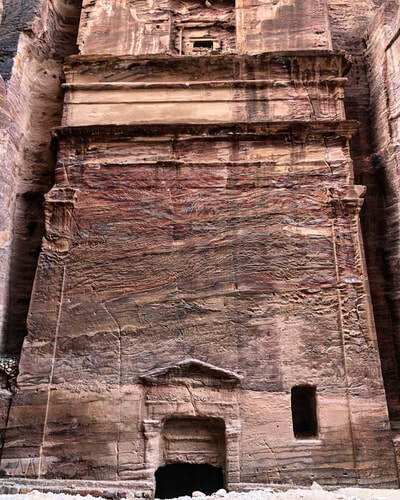 Doorways are very misleading when attempting to judge the size of a structure in Petra through a photograph. For instance, The Monastery door is approximately 26 feet (8 meters) tall. 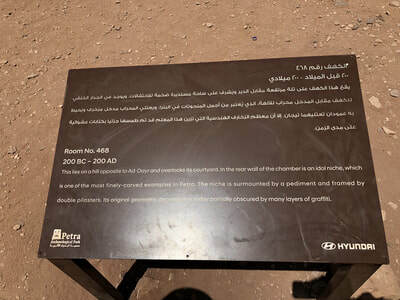 Keep that in mind when viewing the gallery below. 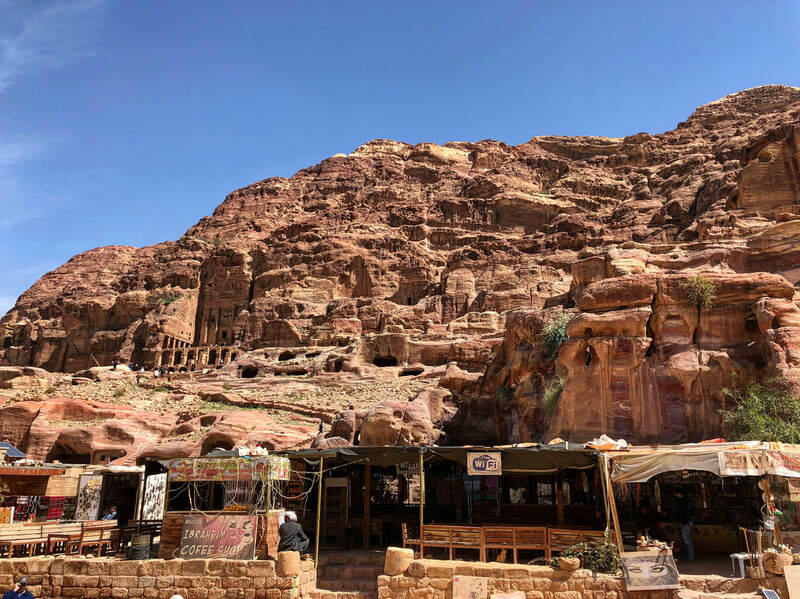 If you are ready for a break, there is a little eatery near The Monastery which sells snacks and cold beverages (not adult). 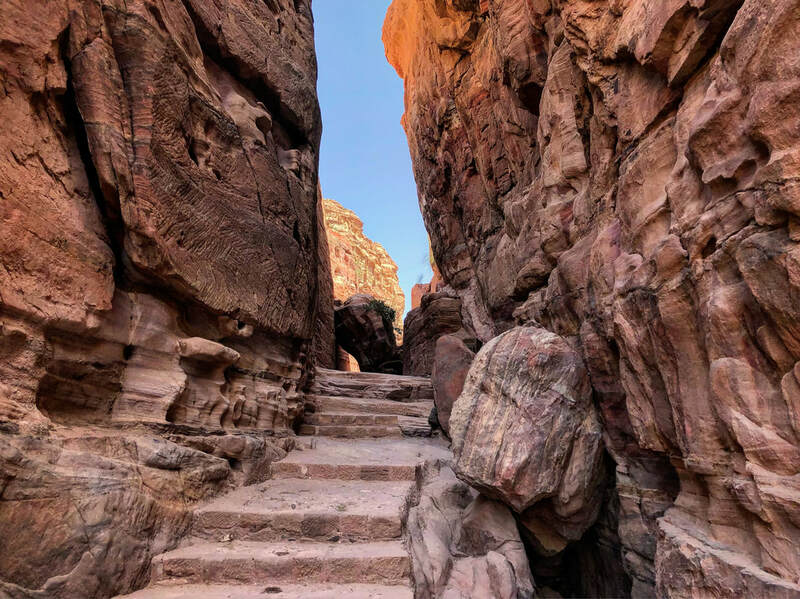 Even though you have reached the furthest most structure in Petra from the entry gates, it does not mean there is nothing left to see in this area. Looking above the shop you will see signs directing you deeper into the hills opposite The Monastery. 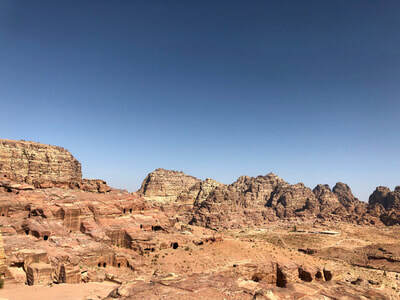 Here you will have amazing views from an area known as "End of the World" or also "View of the End of the World". 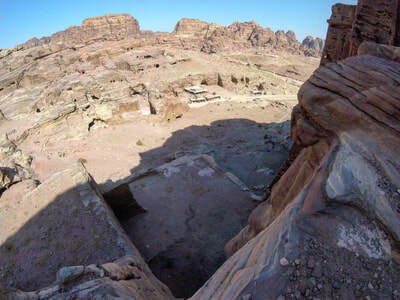 This also provides an elevated view of The Monastery. 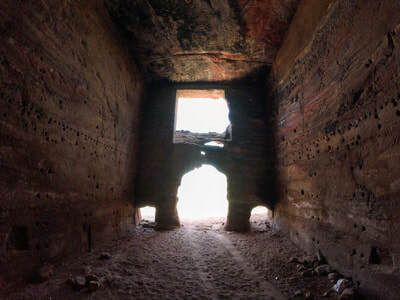 Below one of the viewpoints, is a set of ruins which has a large visible room exposed. 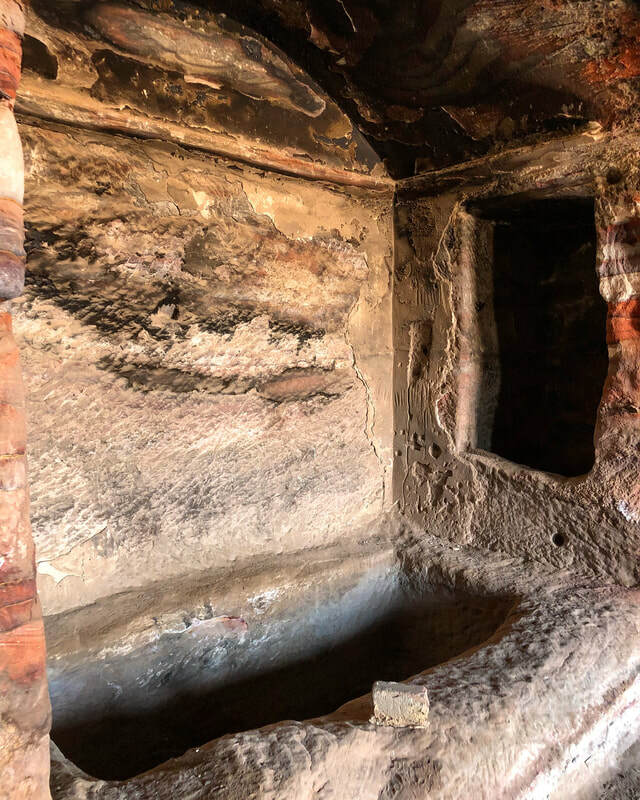 This is known as Room 468 and located inside is one of the most well preserved (in terms of erosion, not vandalism) carvings within Petra. The room itself is not all that impressive (compared to other sites here), but the detail within this niche is amazing. 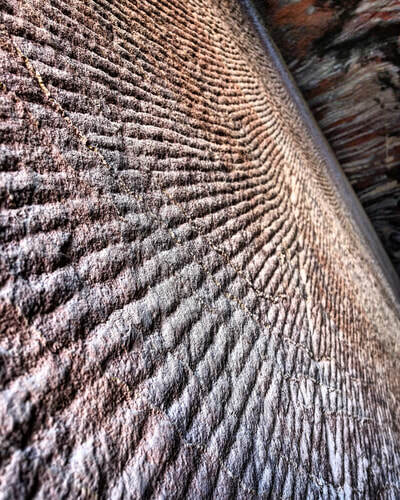 The cuts into the stone are very precise. 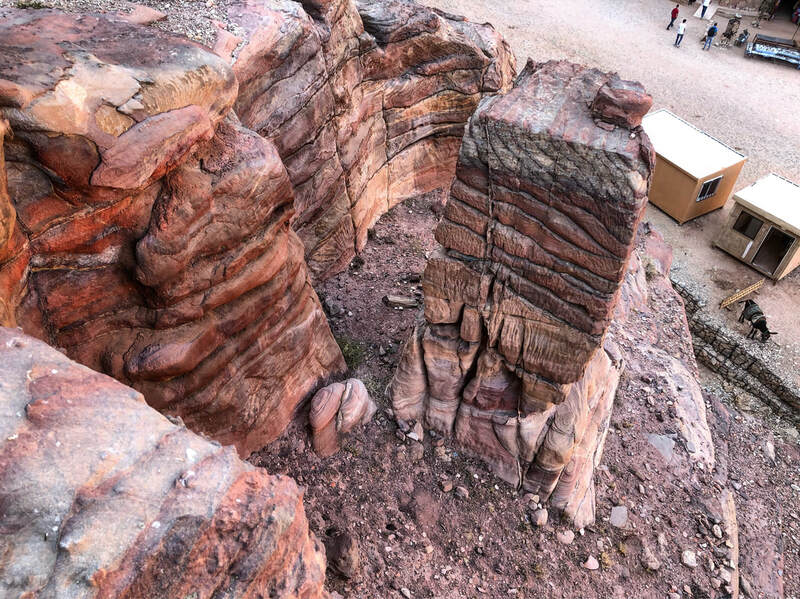 Let's rewind for a minute. You may remember me briefly mentioning donkeys on the stairs. 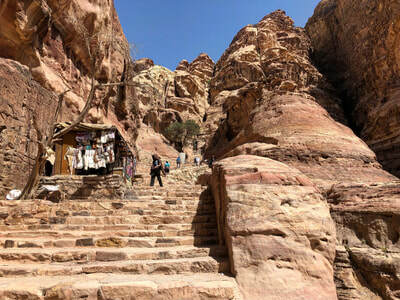 They are used to carry people all around Petra, to include, the steps leading up to The Monastery. 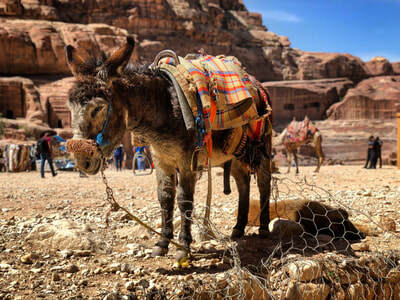 Typically the donkeys are escorted by a handler who has made the trip hundreds of times. 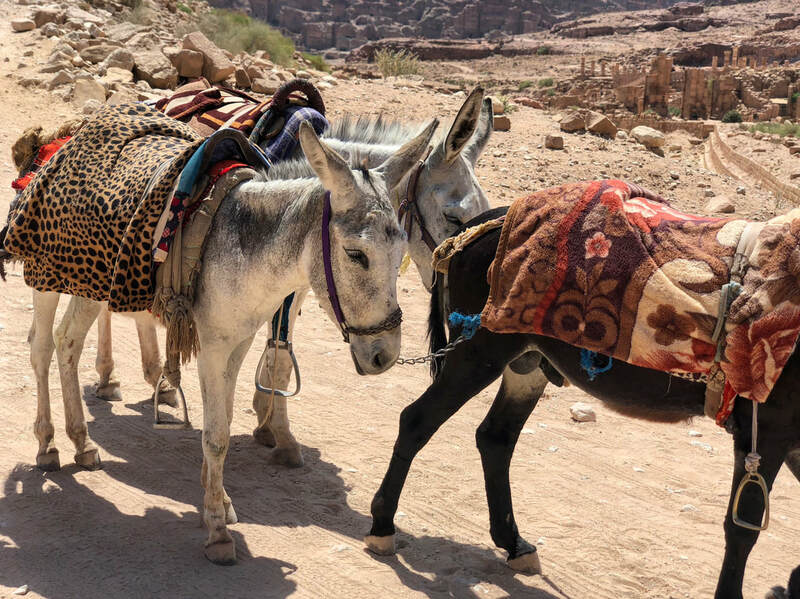 If you have medical problems or other issues that might prevent you from making the hike up, the donkeys are a good alternative. Most people who take them to the top usually walk down on their own, but donkeys are available for the return trip too. Just know, riding the donkey up narrow steps, with steep ledges could lead to wide eyes and a foul mouth. 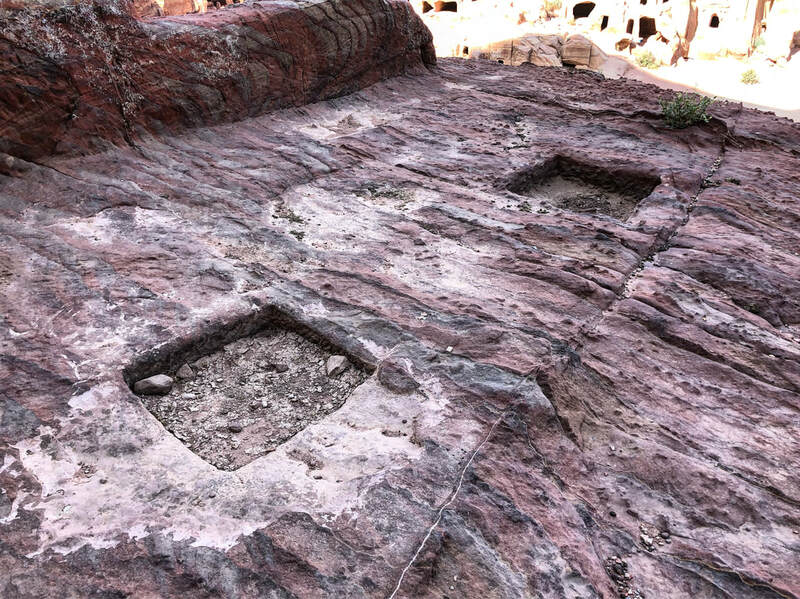 Having said that, if you are walking up and down the steps (and other areas too), watch out for little donkey mounds. 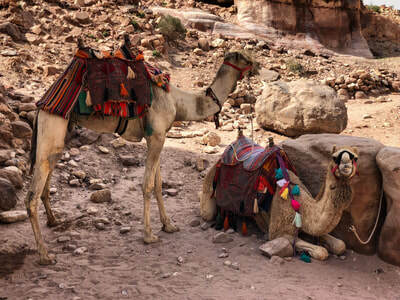 They do not have the best manners and tend to take care of business wherever nature influences them. 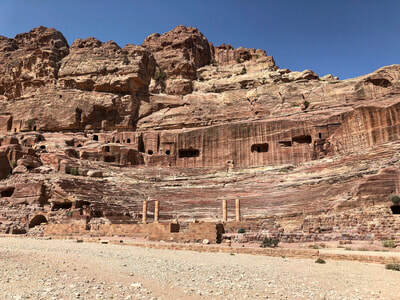 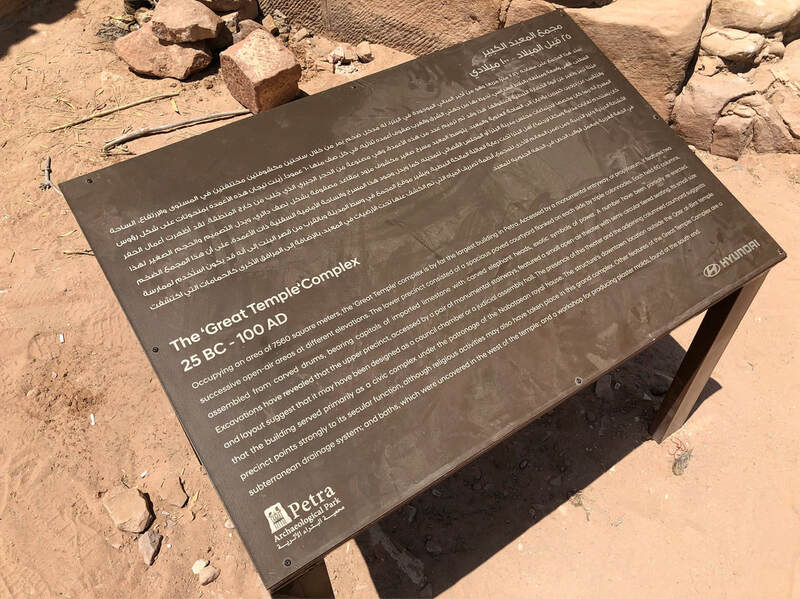 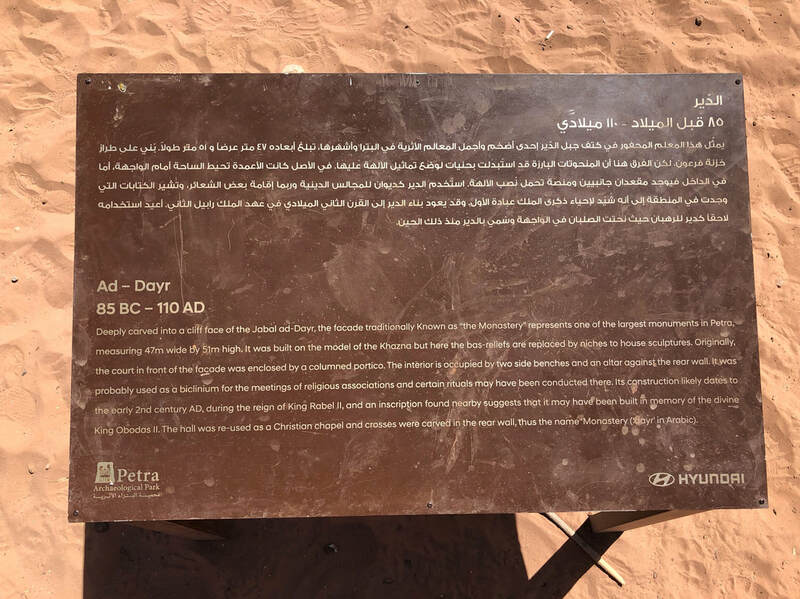 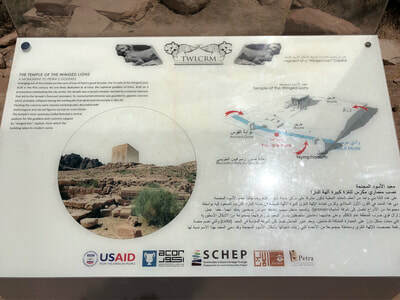 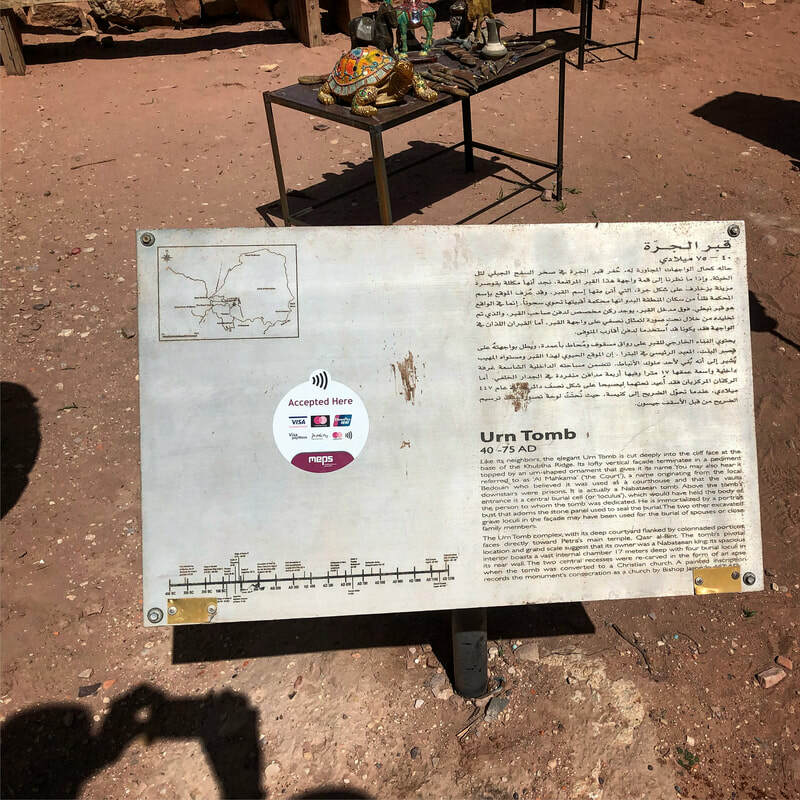 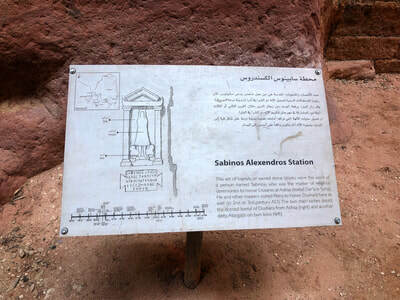 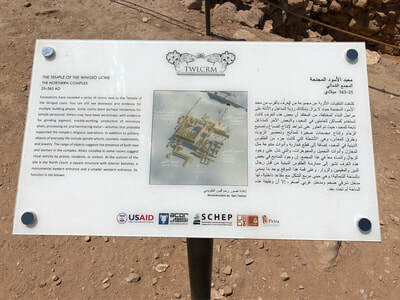 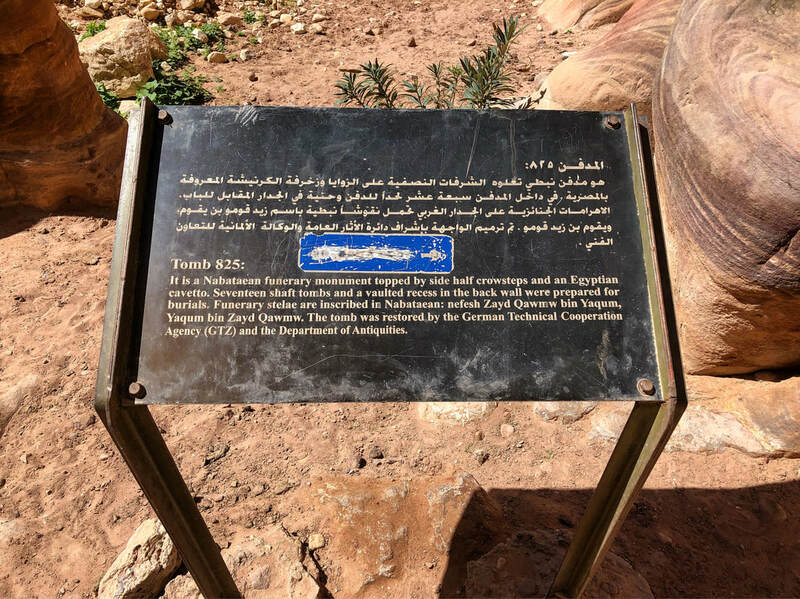 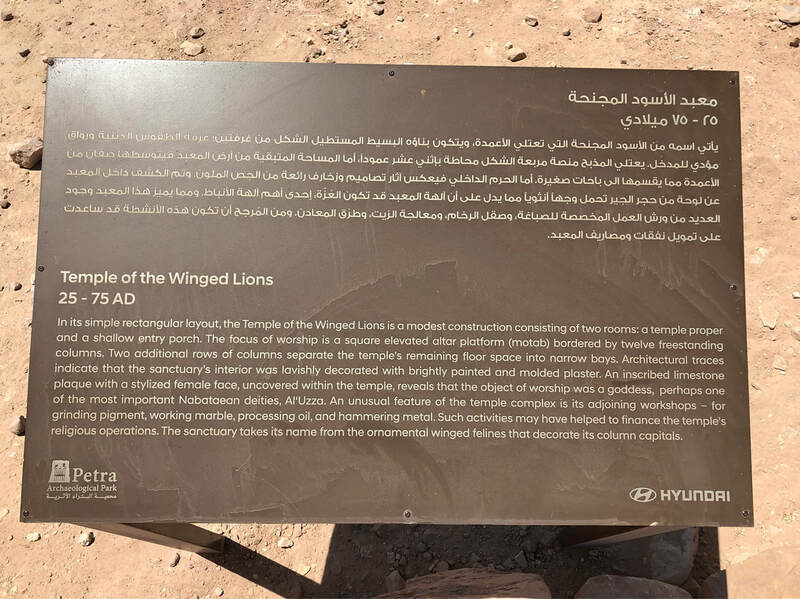 I am not an archeologist, scientist, or even a historian, but my personal opinion after physically visiting this area is that Petra is older than some people suggest and that is was built by a society or group of people who were technologically advanced, more so than they are given credit for. Given the precision and even location, I do not believe these structures were originally created using only brass chisels, stone hammers, or other crude instruments. 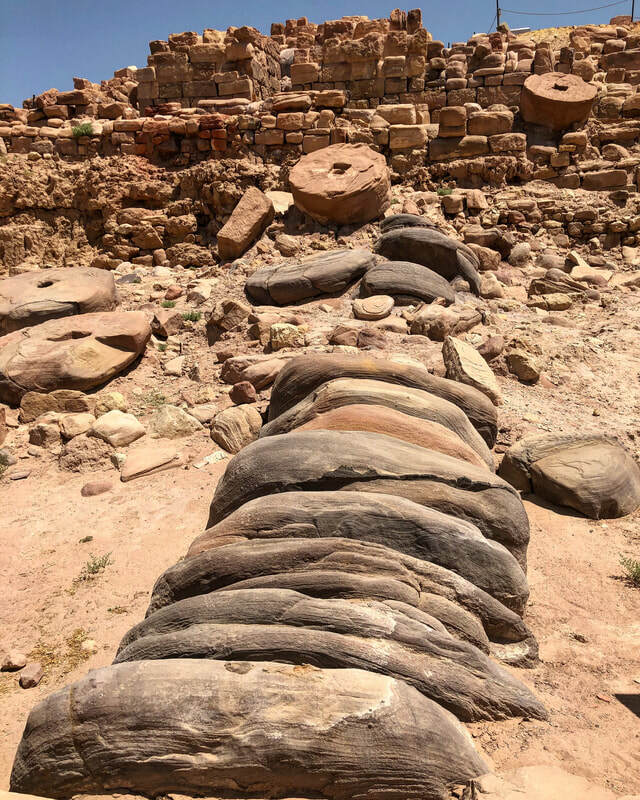 I think their tools and techniques were much more advanced and that working with stone was very simple for the original builders, much like steel and other building materials are for us today. 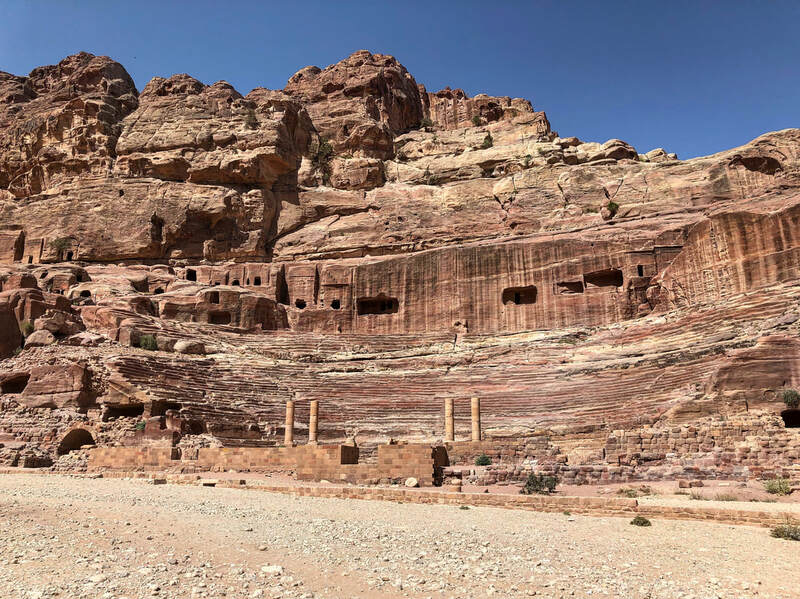 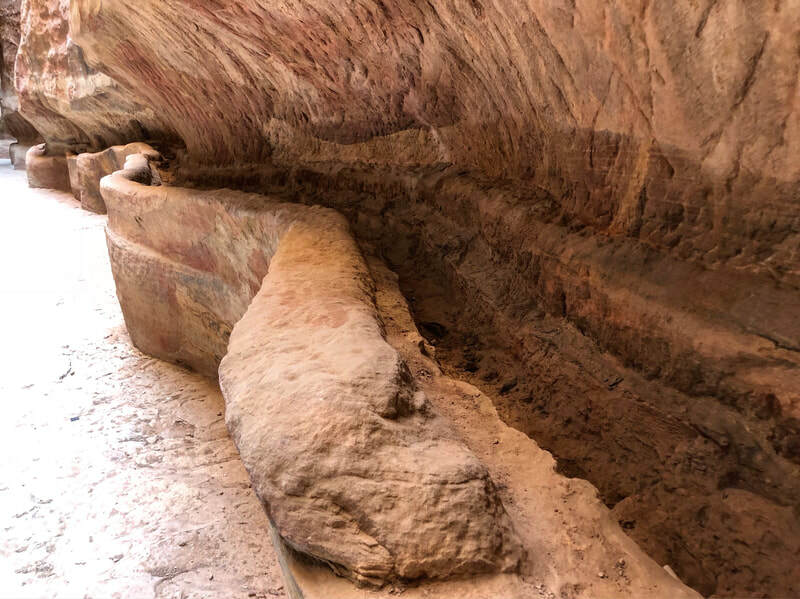 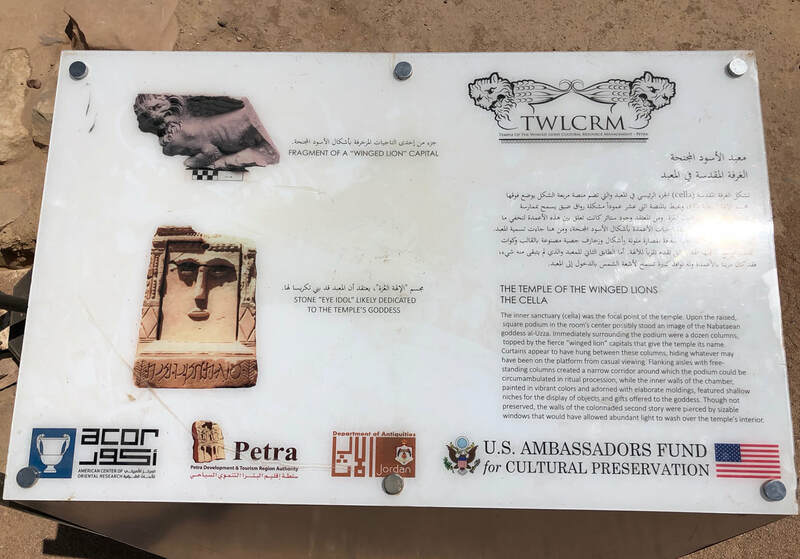 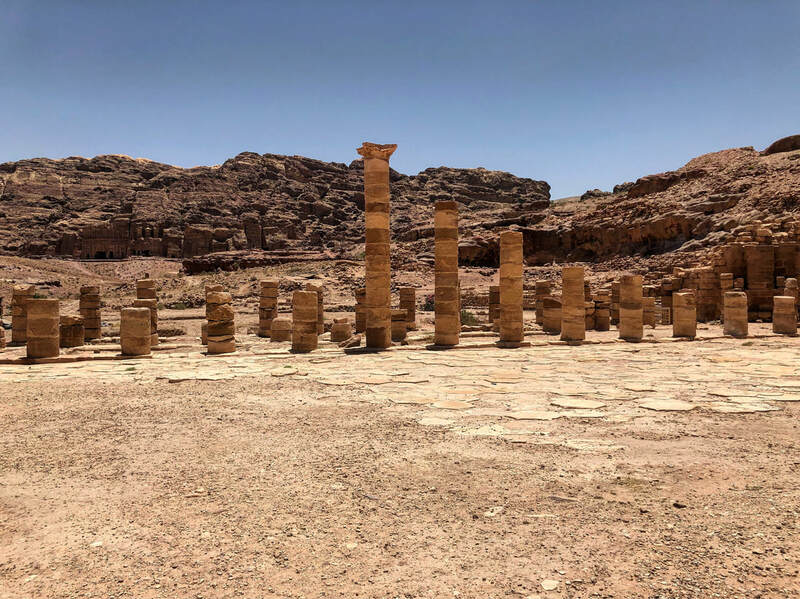 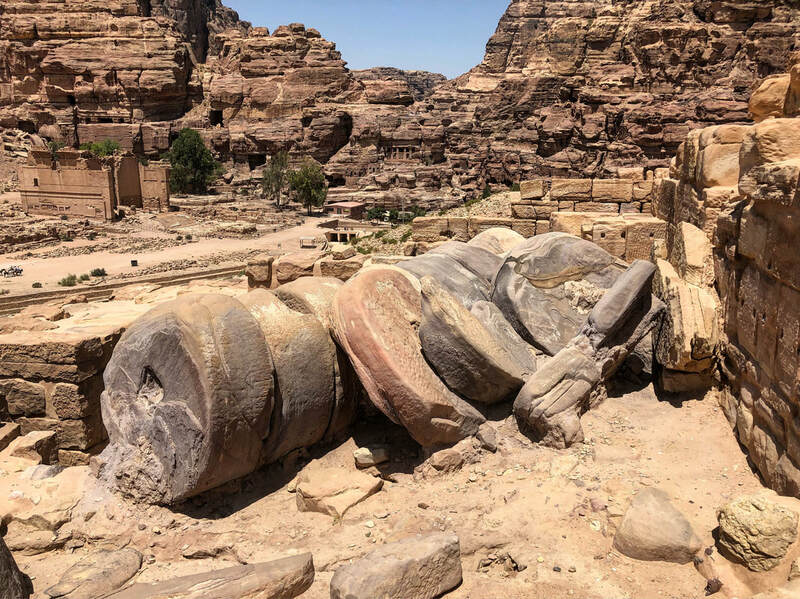 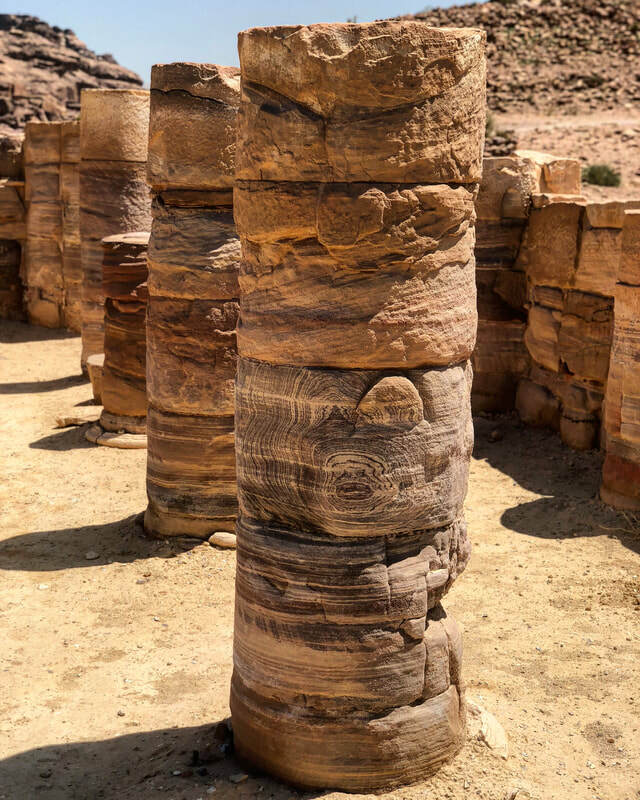 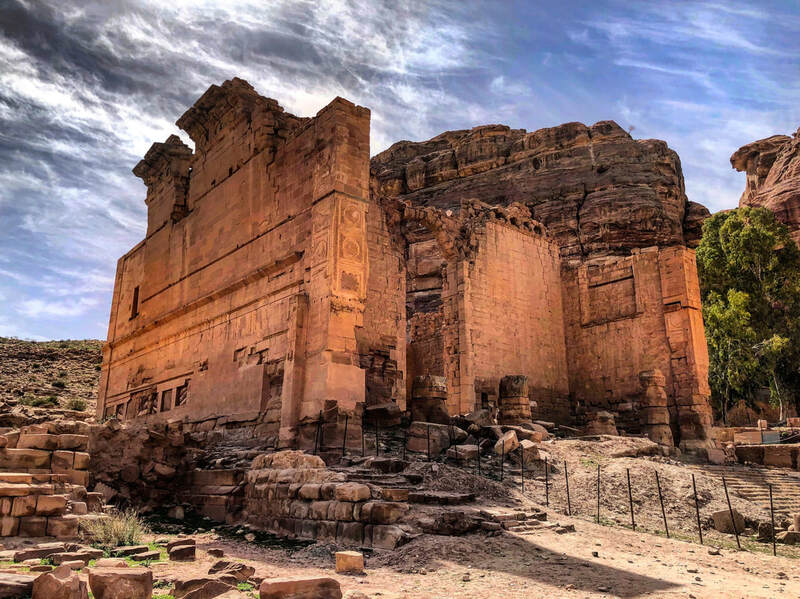 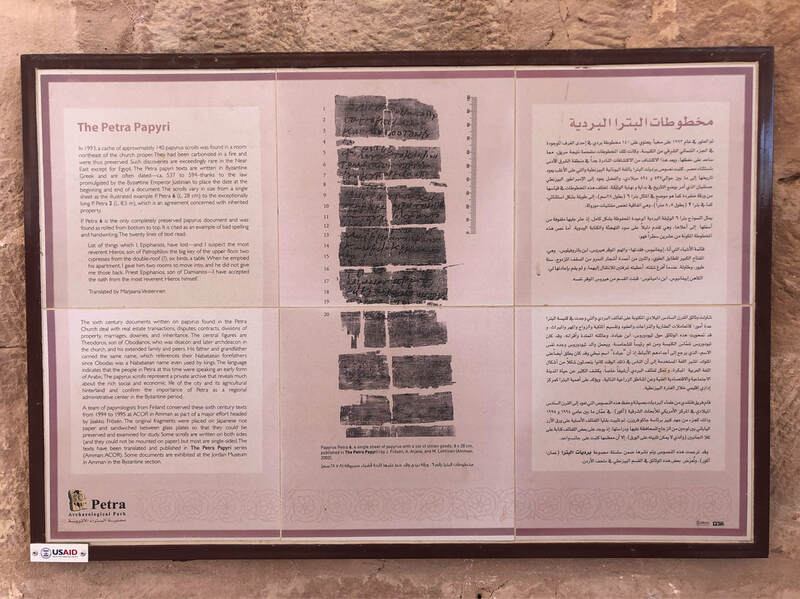 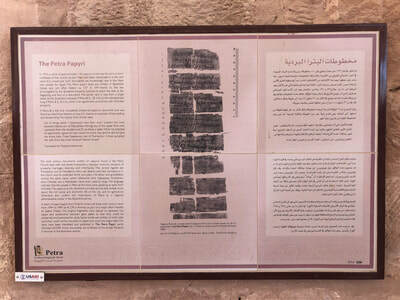 A lot of the "history" or the true purpose of certain structures in Petra is more speculation or inference rather than fact as we do not always have their written history or cannot accurately decipher their meaning of recovered text or drawings. When visiting ancient sites such as this, I can not help but wonder what kind of people walked these same areas throughout its existence. 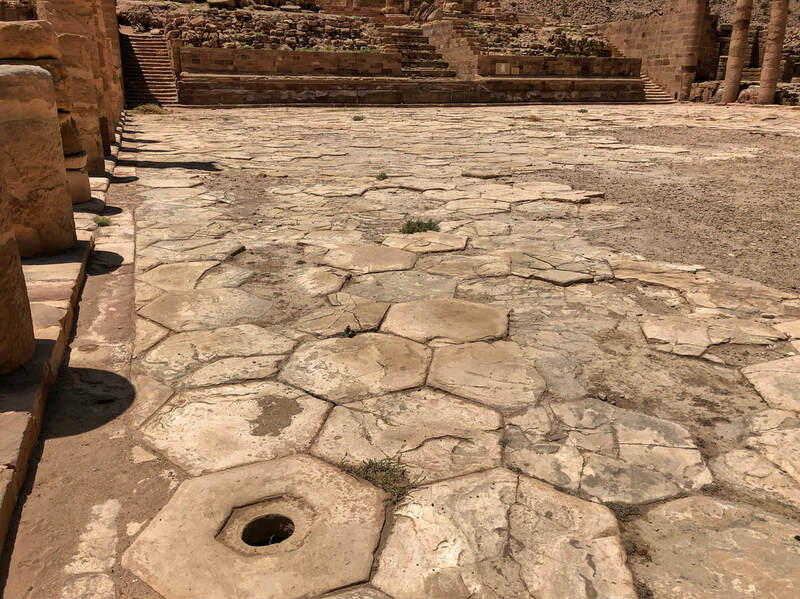 Unfortunately, that information has been lost to time, but one thing is for certain, my footsteps (and hopefully, someday yours) will be part of its history and will be included in the thoughts of future man. 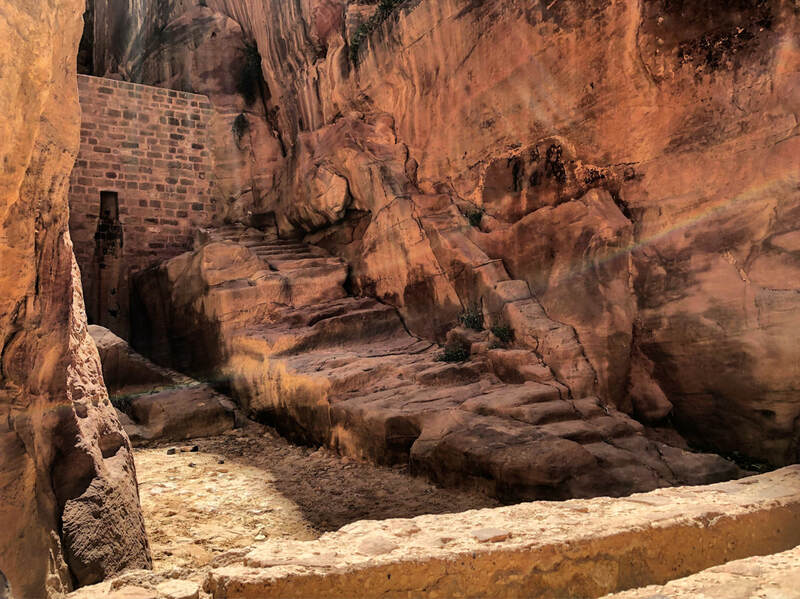 Just because the story is finished, does not mean the adventure is. 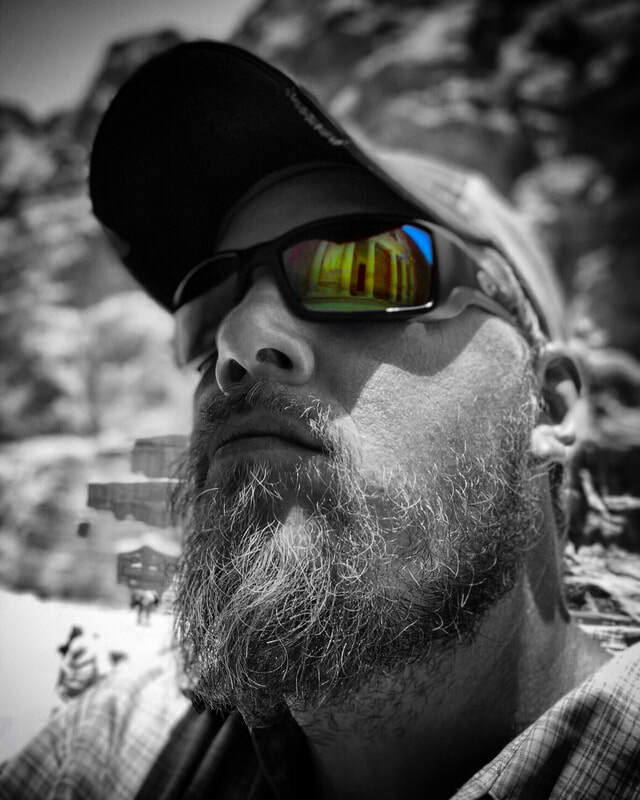 We have additional content down below, along with an interactive comment section at the bottom of the page. 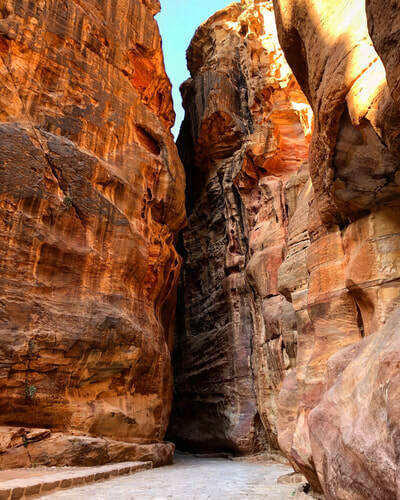 Feel free to stay with us a little longer and continue your journey through Petra. 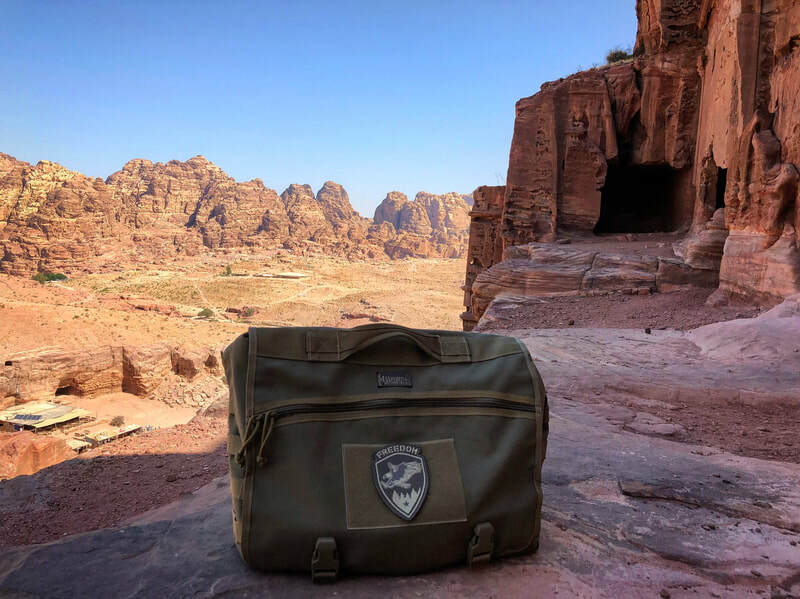 Every adventure has a story, and one of the best ways to show it is with Bourn Adventure Gear. 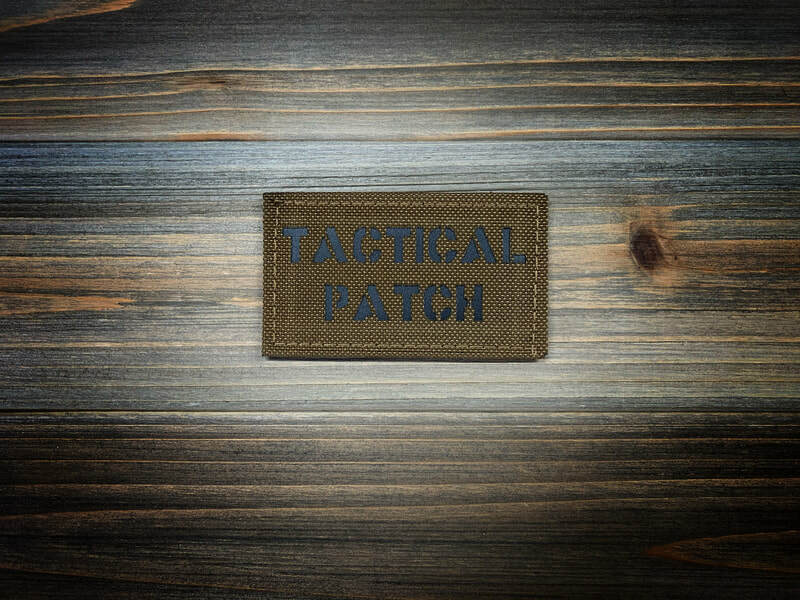 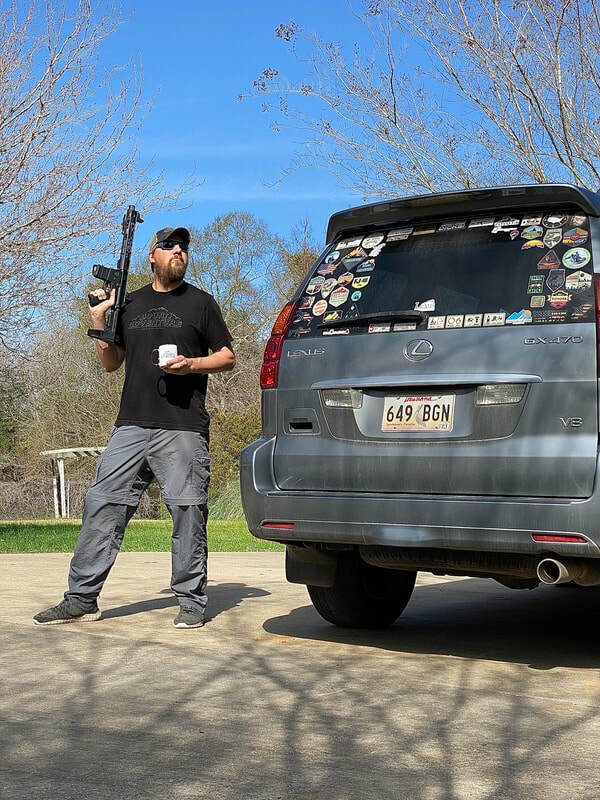 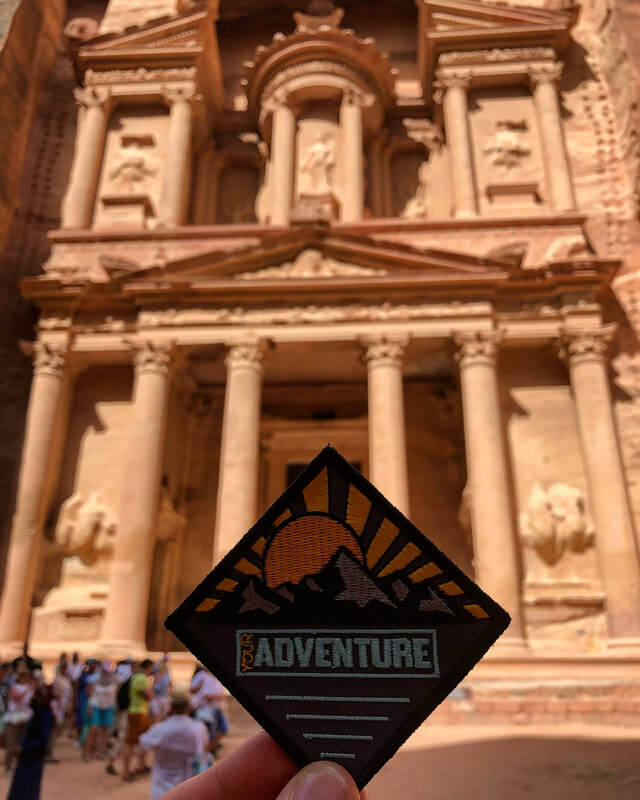 Whether it is a sticker, patch, hat, or t-shirt; every day one of our products are used around the world on someone's adventure. 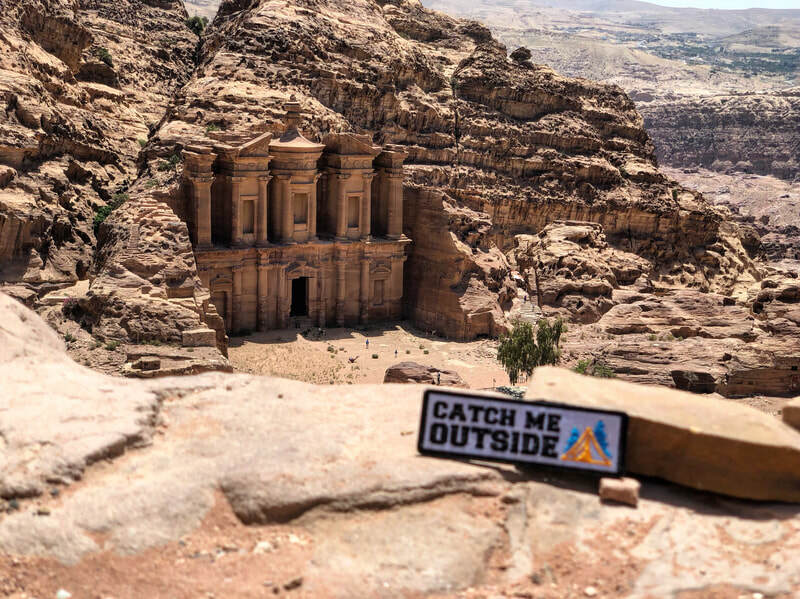 While exploring Petra we brought the Catch Me Outside, Your Adventure, and the Freedom patches with us. 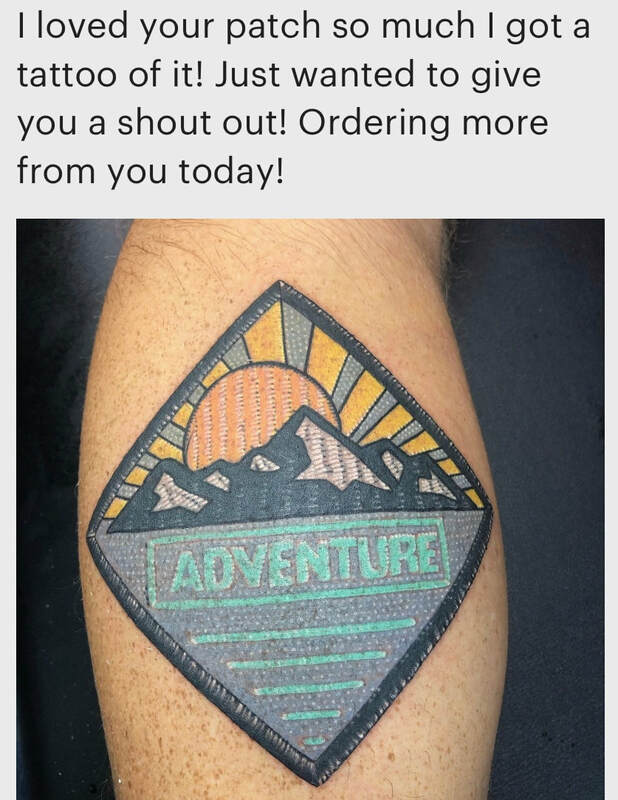 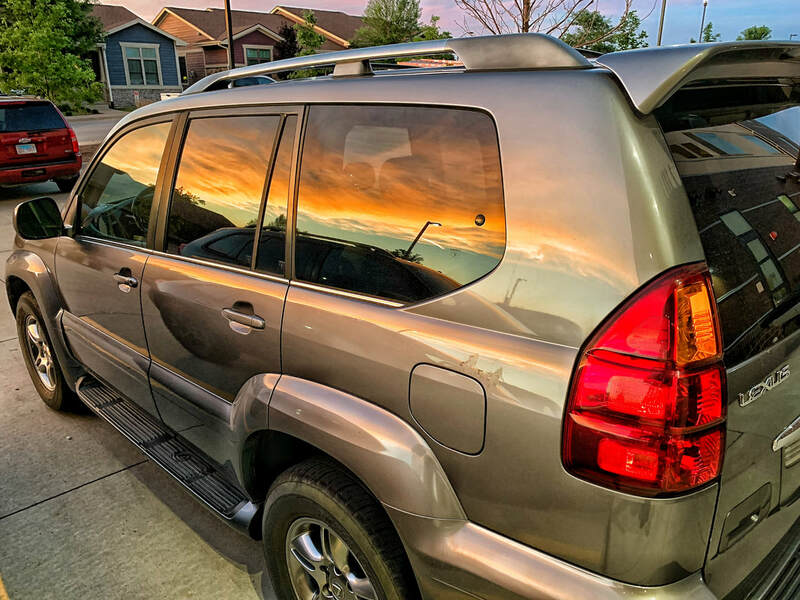 Get yours before your next adventure!